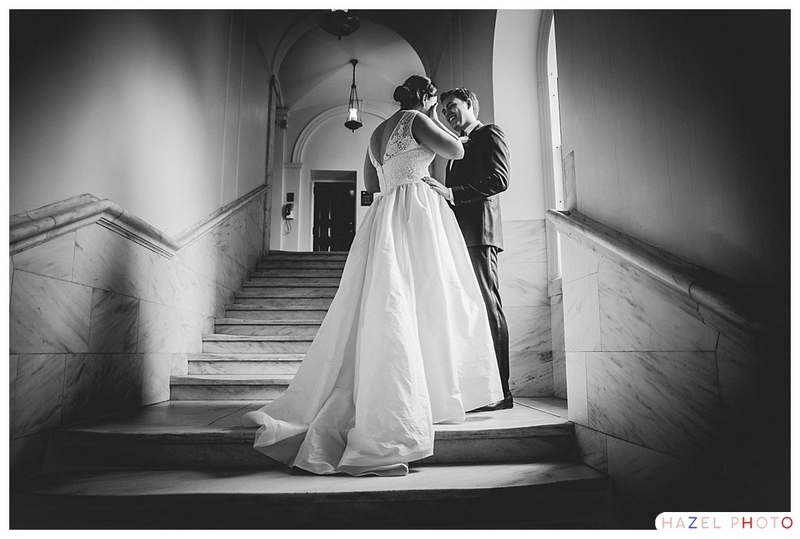 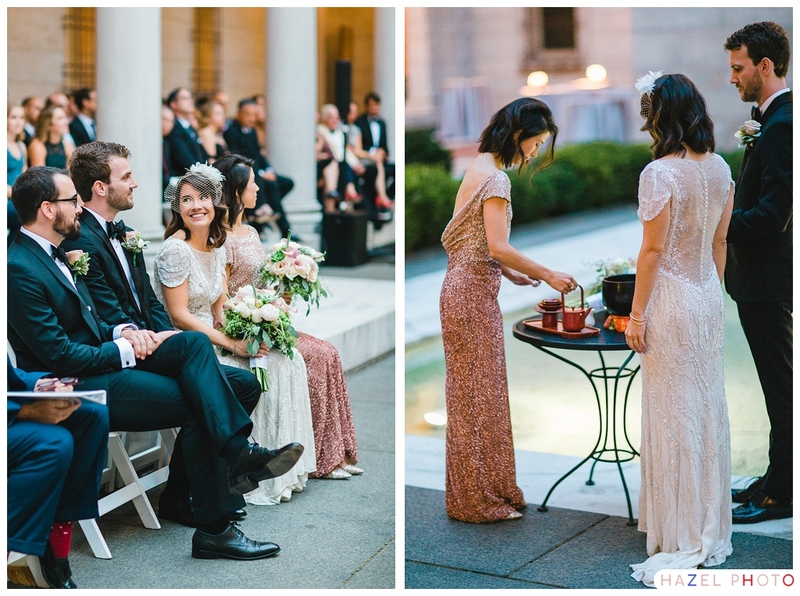 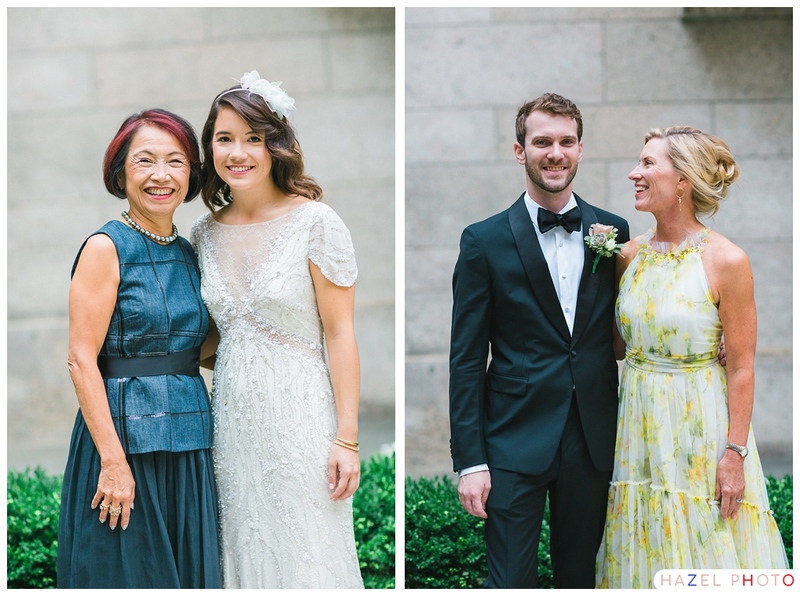 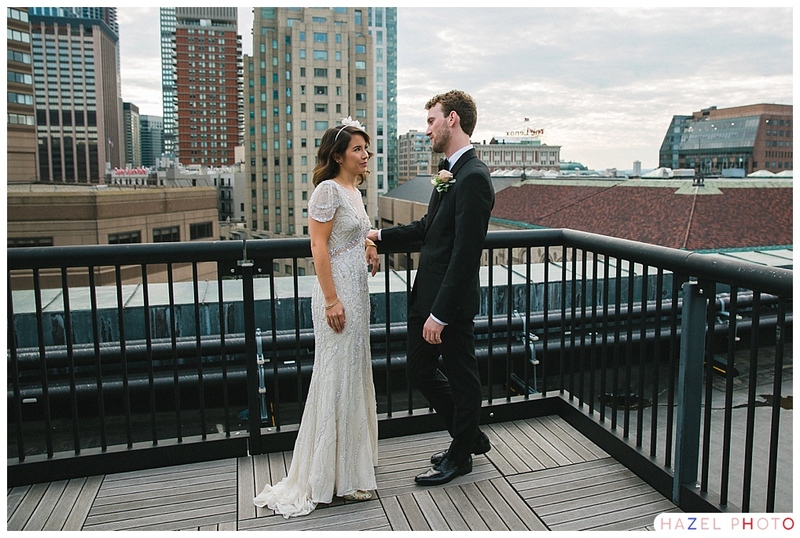 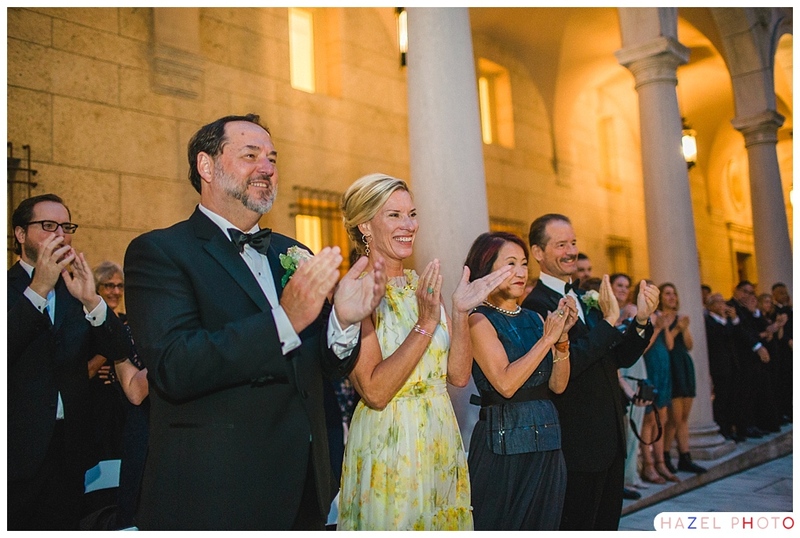 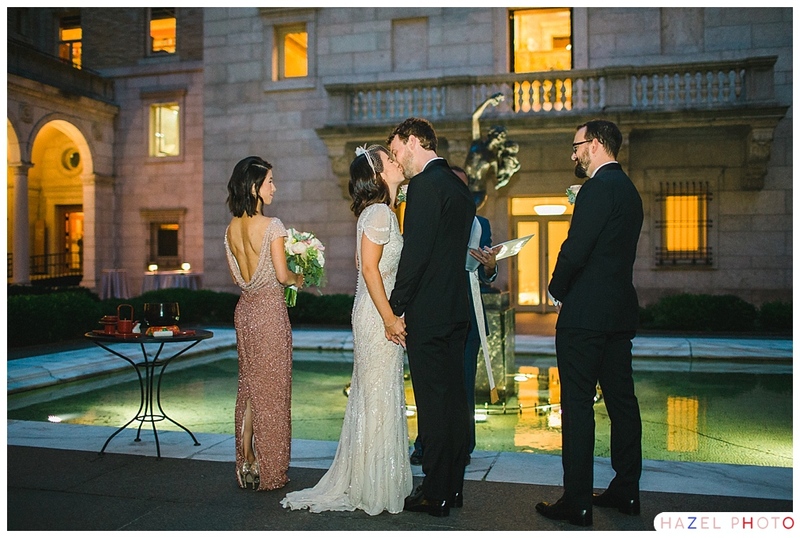 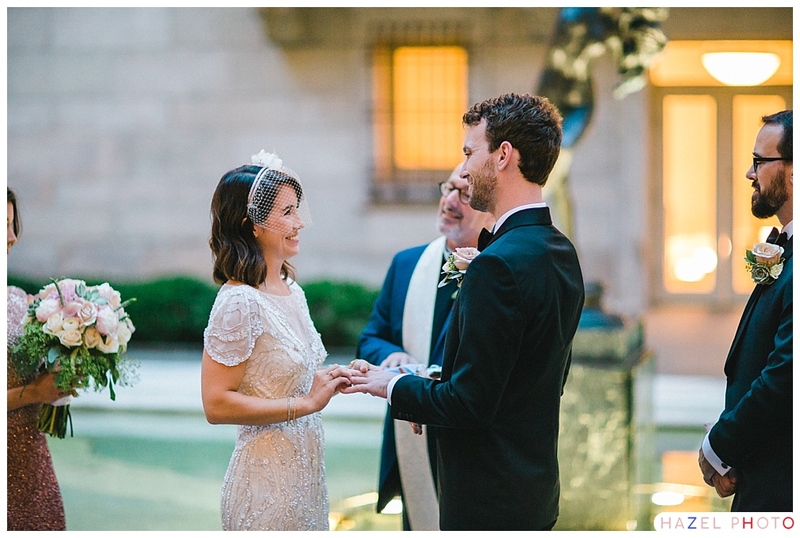 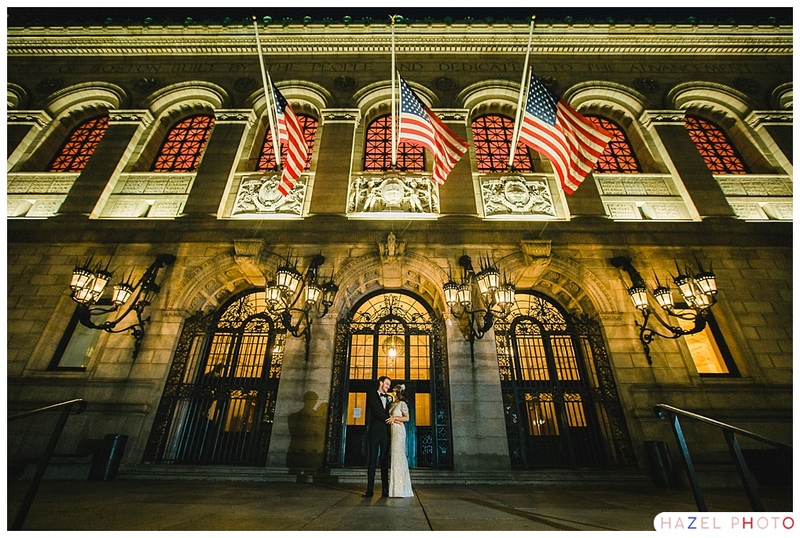 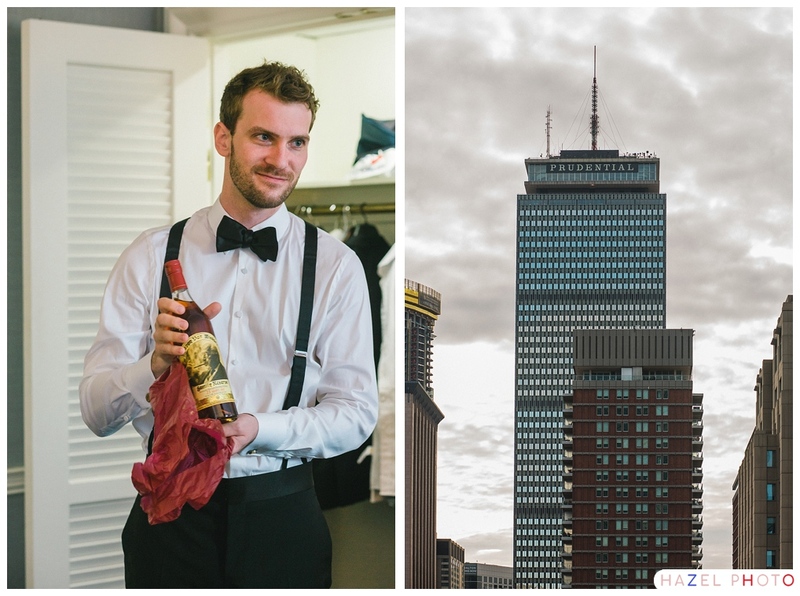 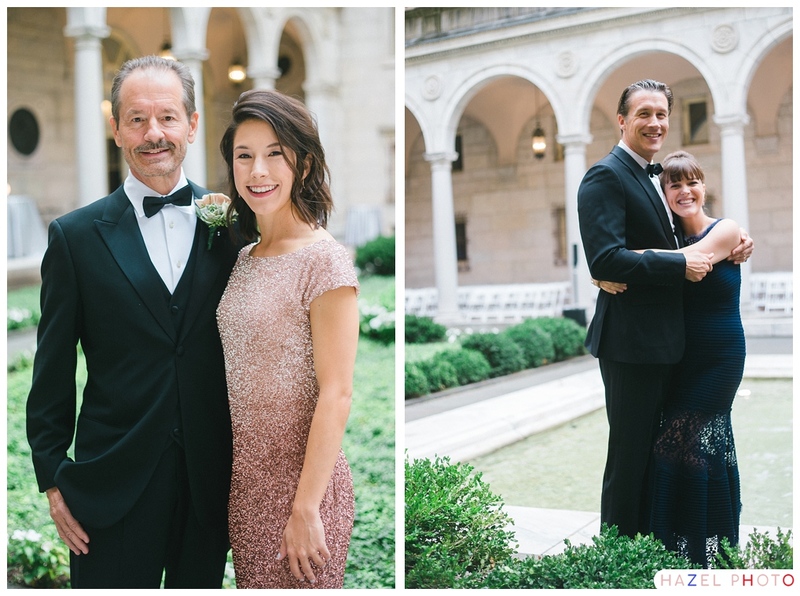 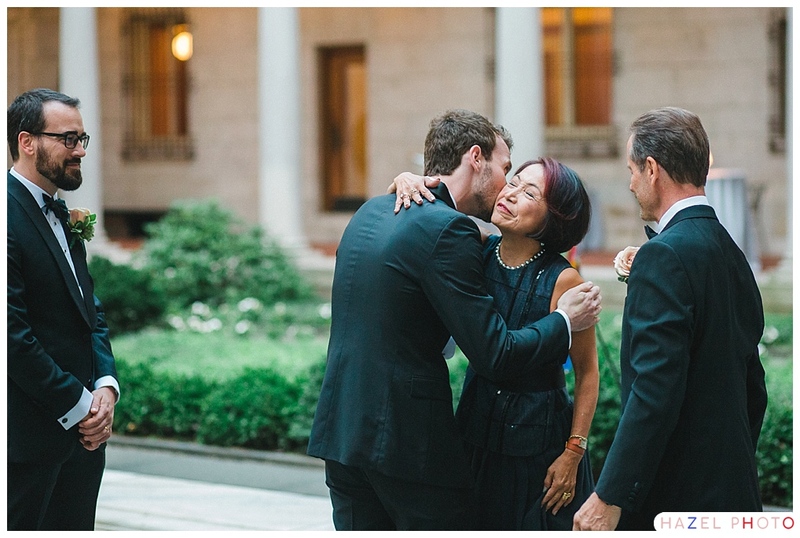 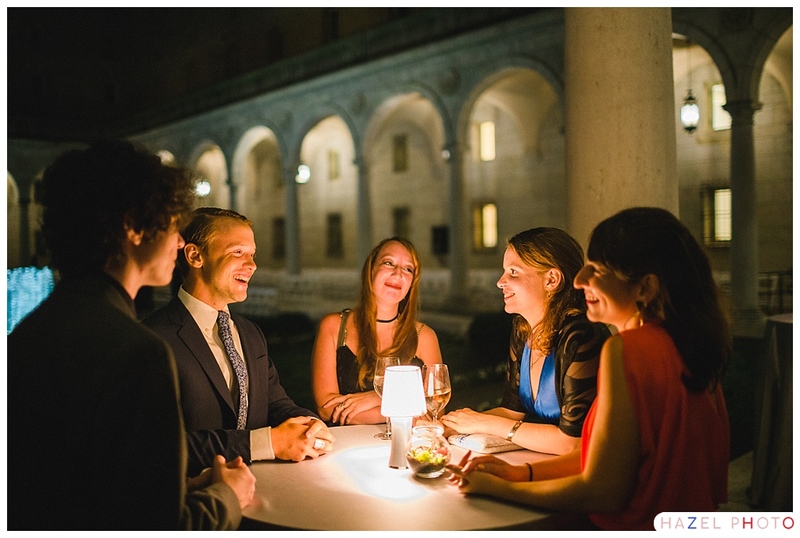 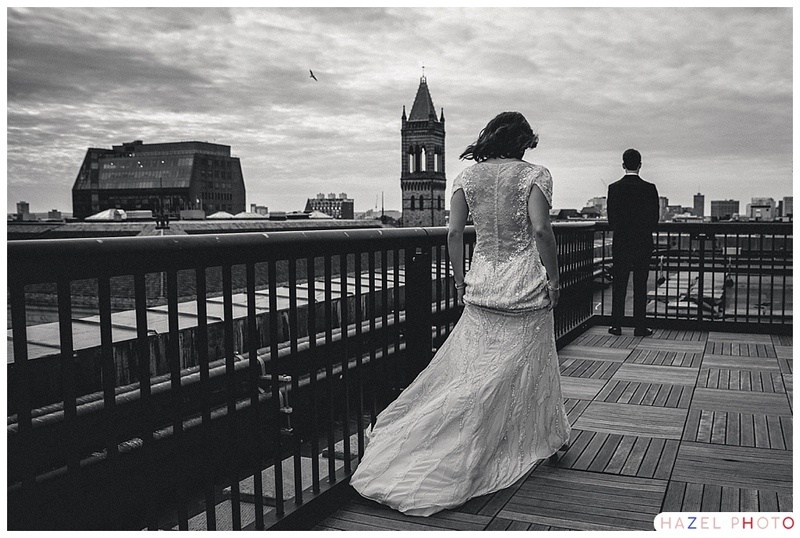 Alexandra & Eric were married in the courtyard at the Boston Public Library on a lovely September evening. 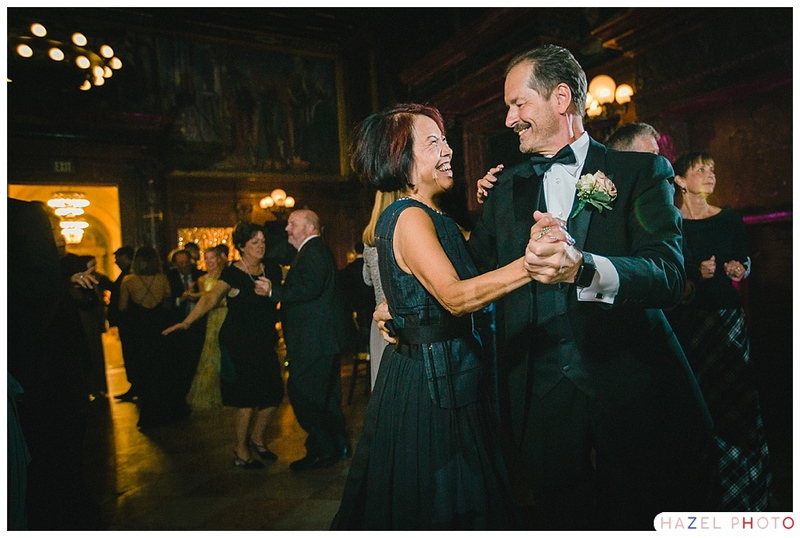 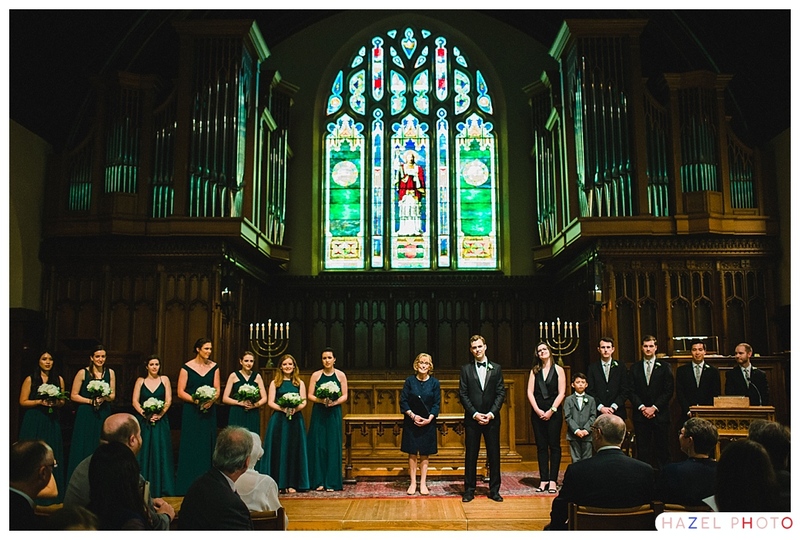 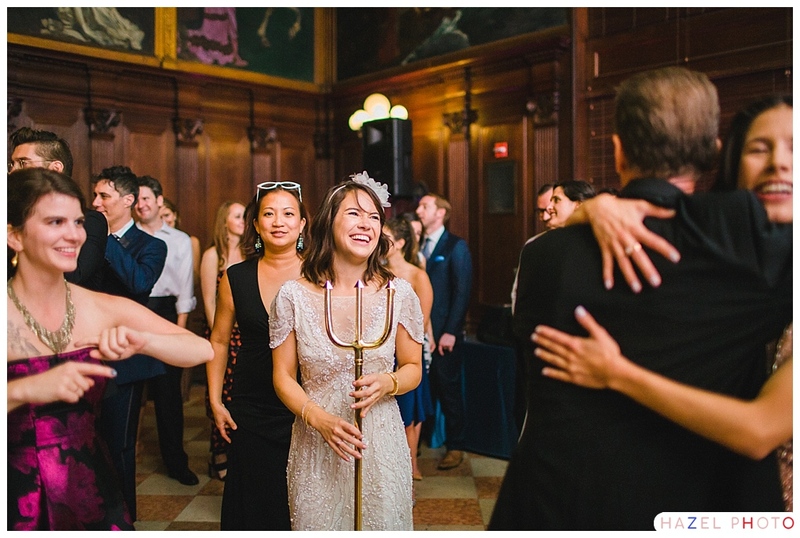 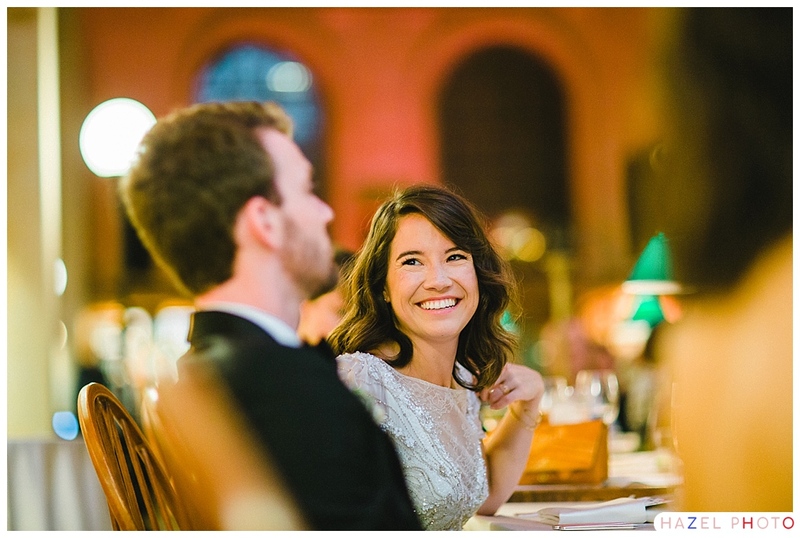 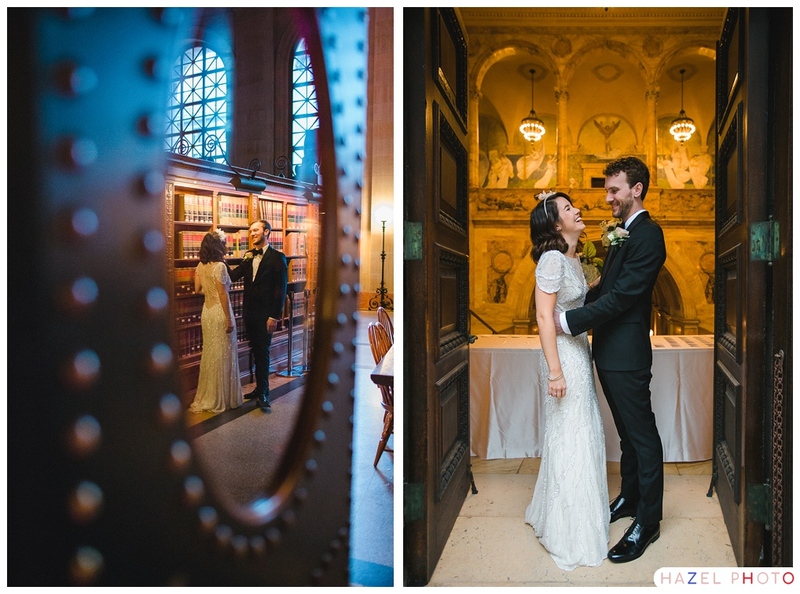 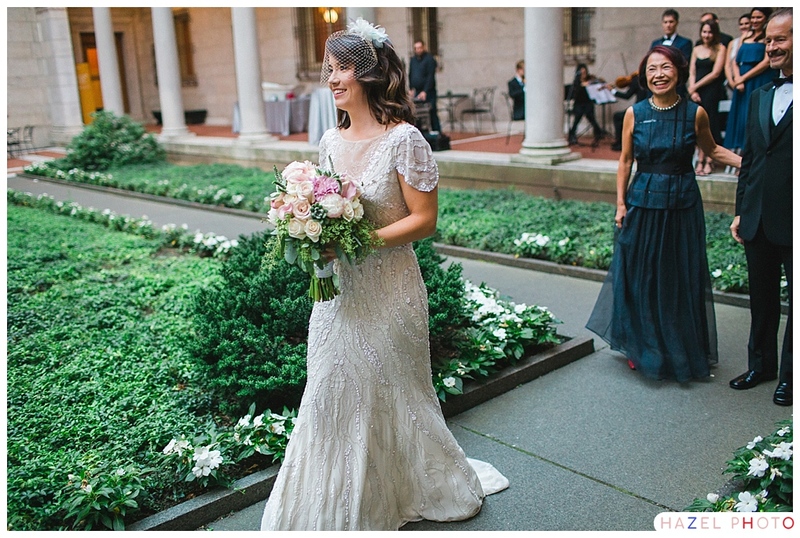 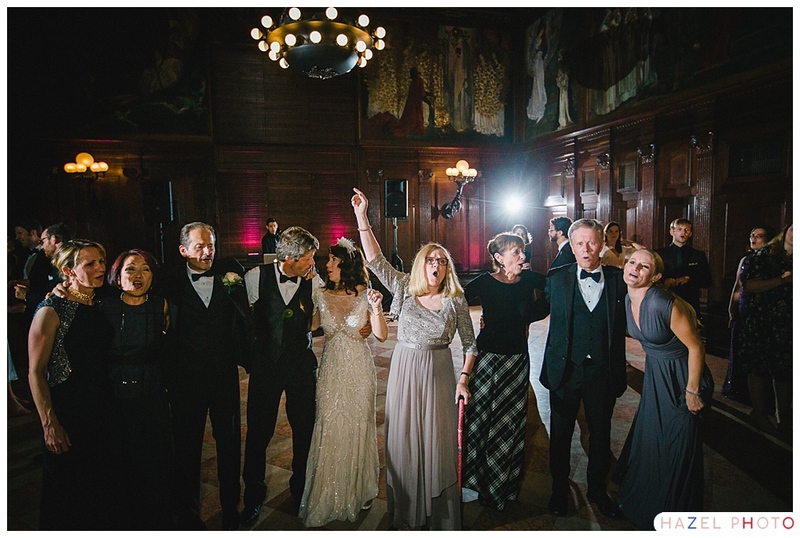 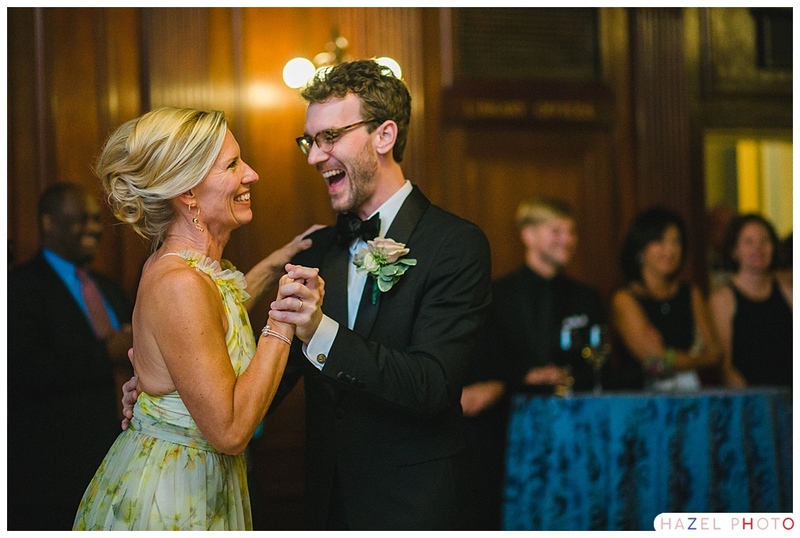 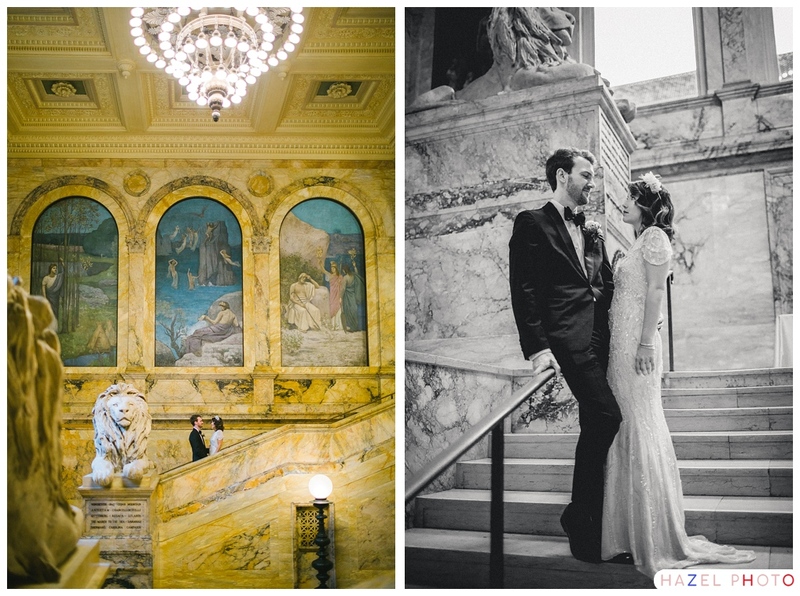 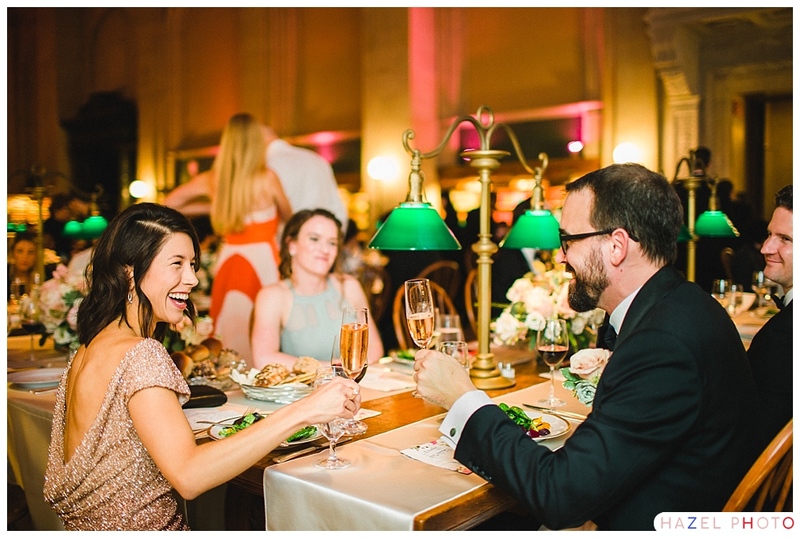 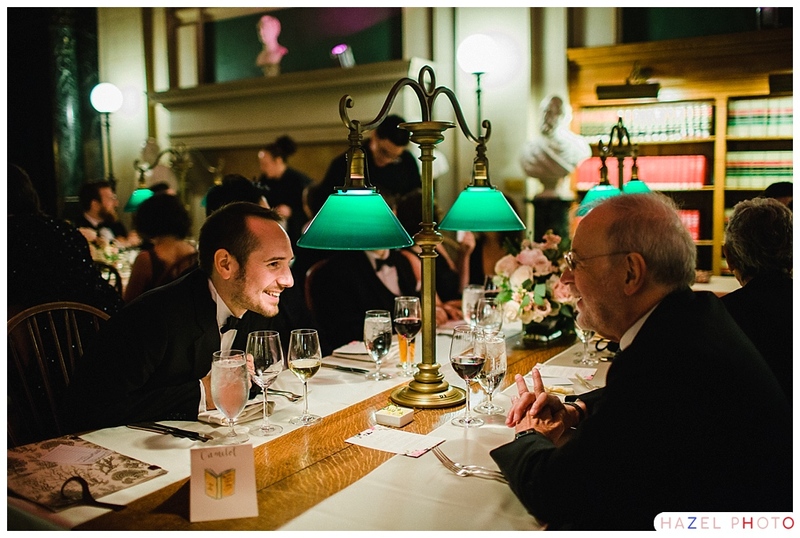 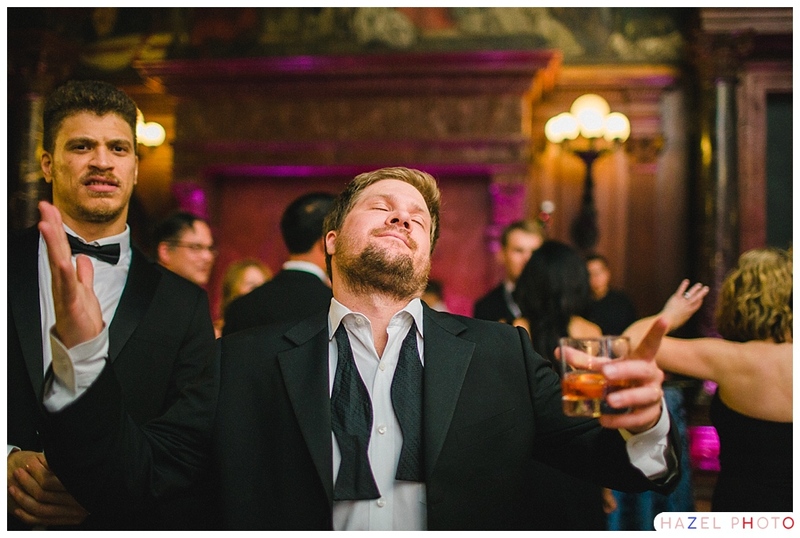 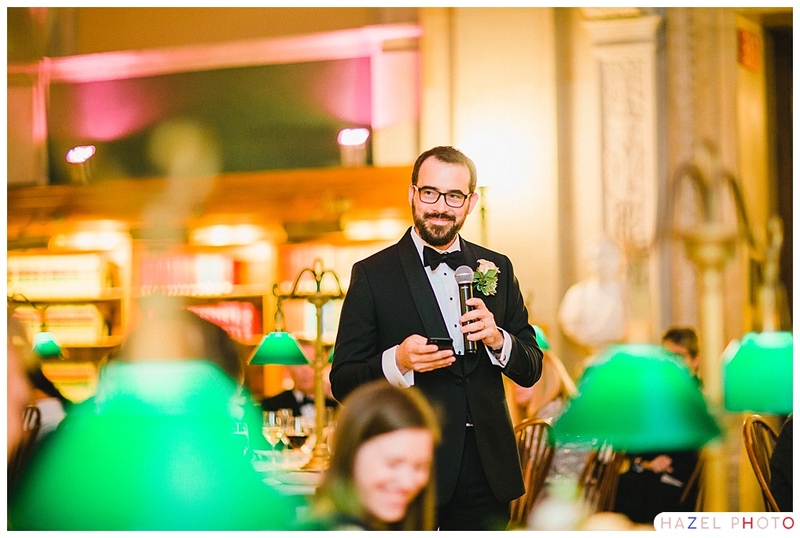 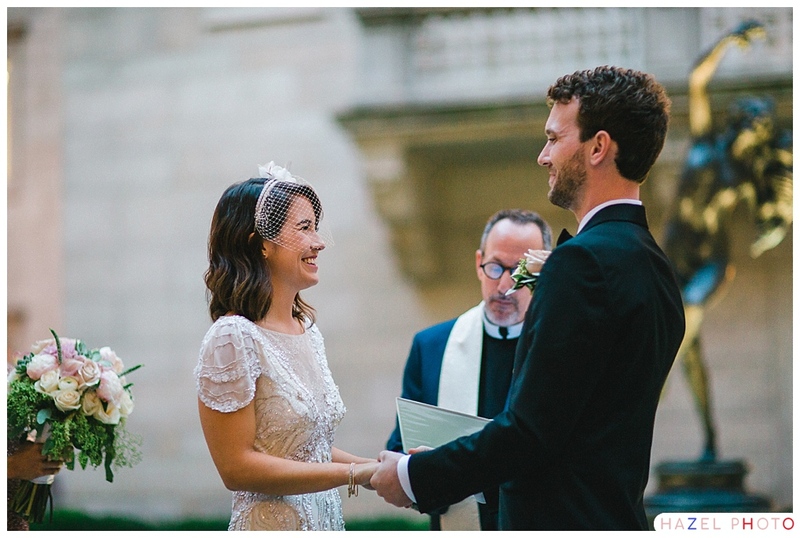 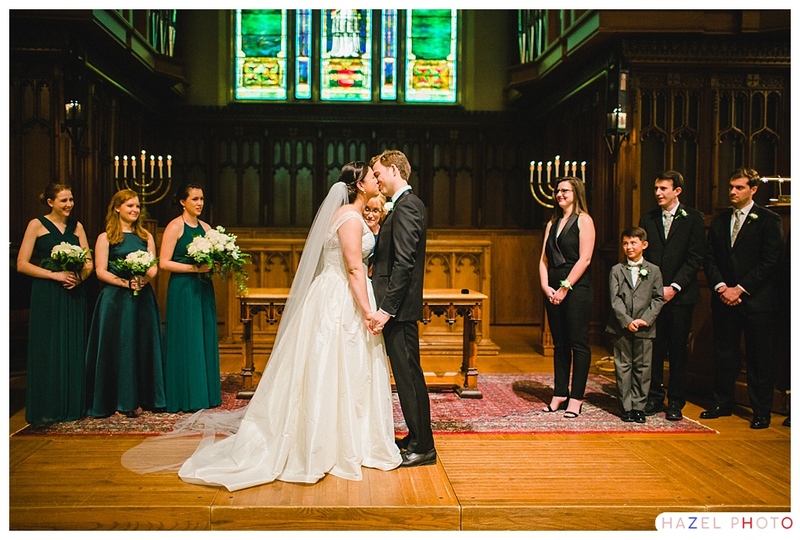 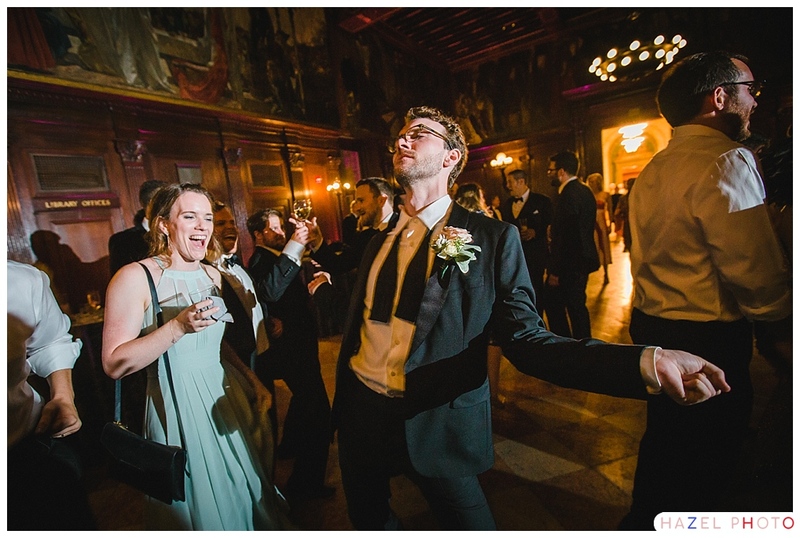 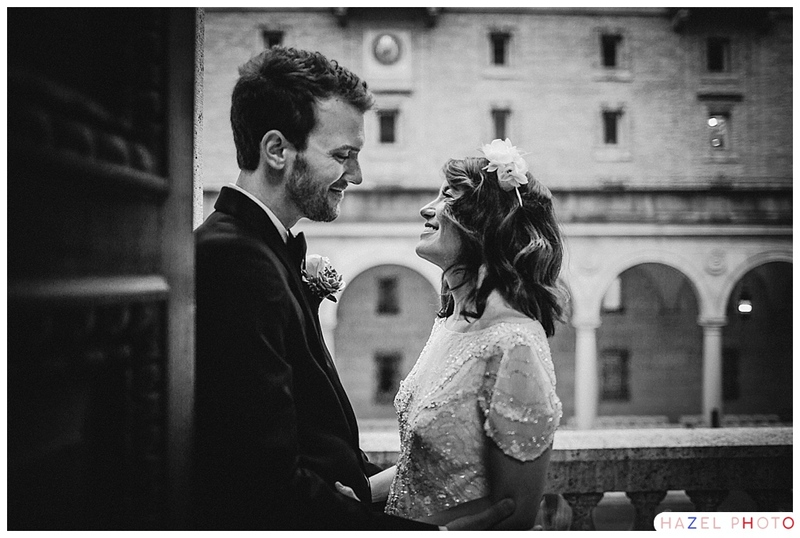 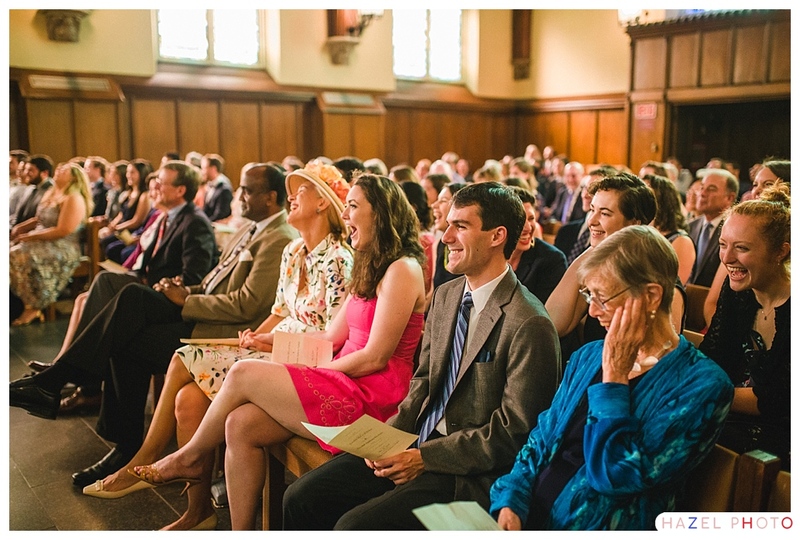 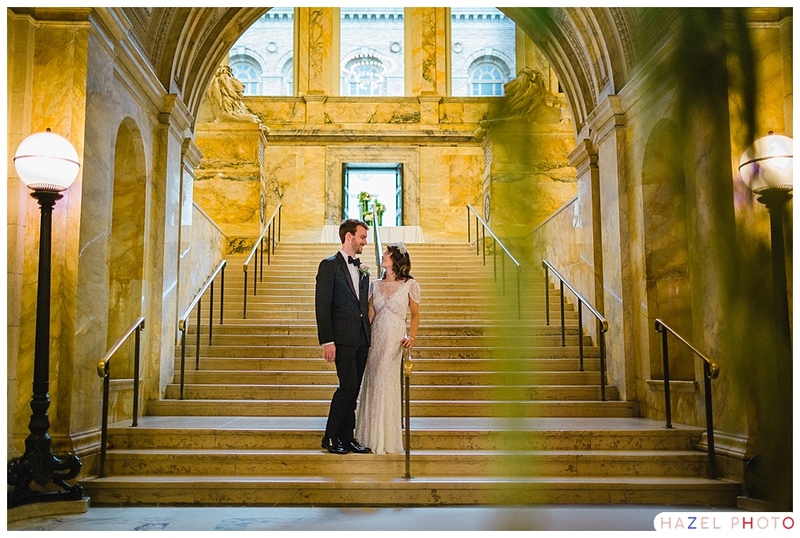 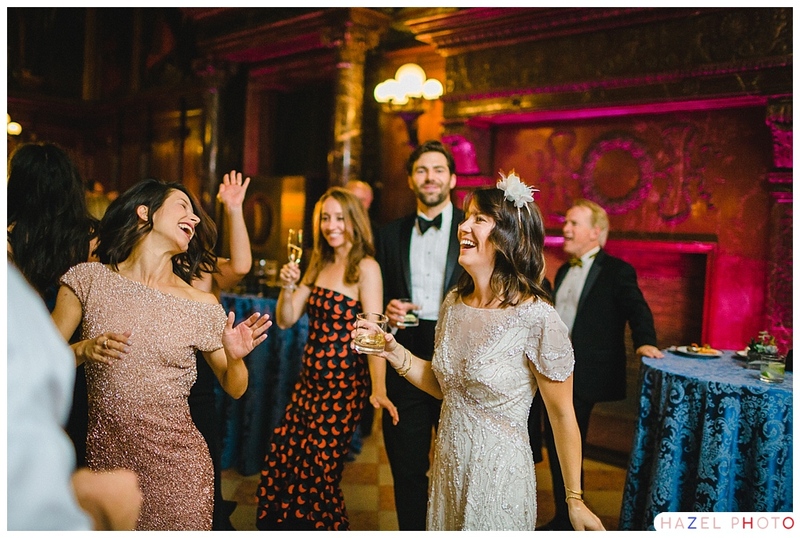 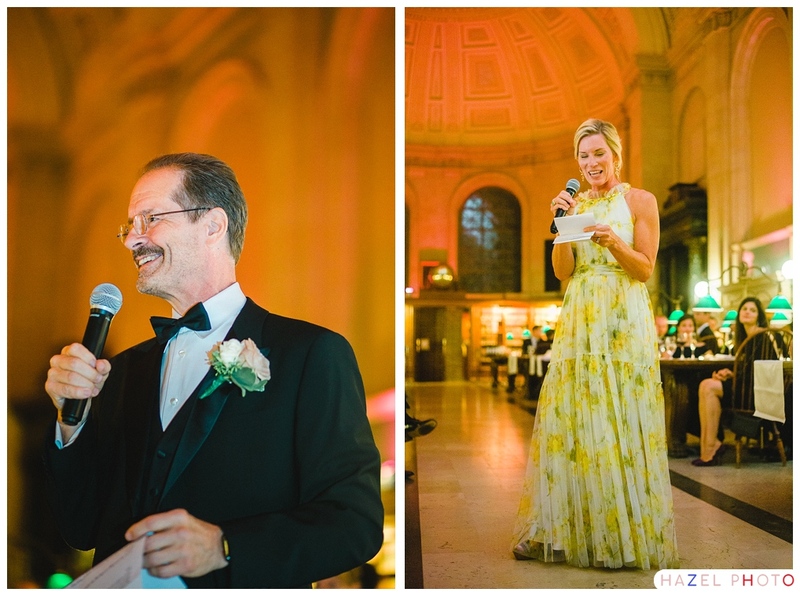 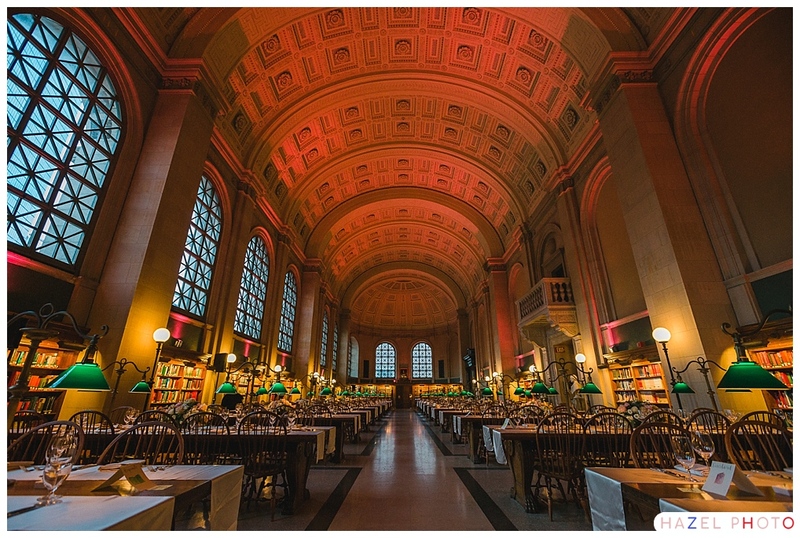 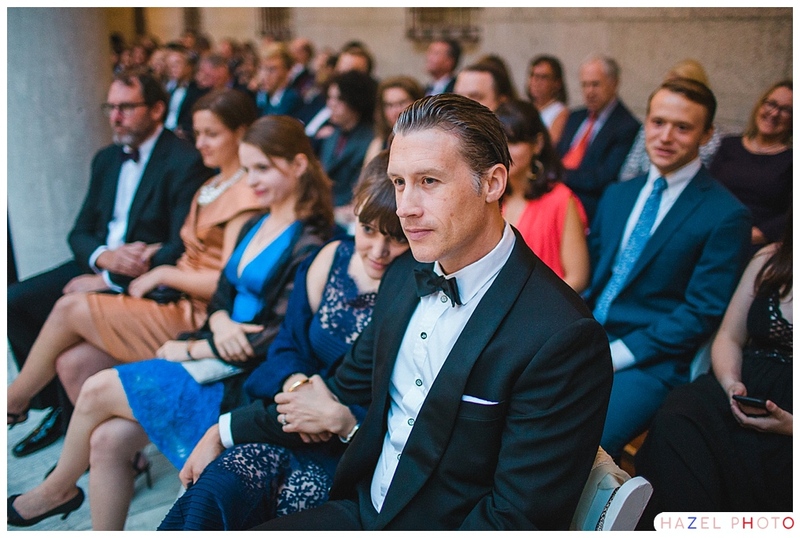 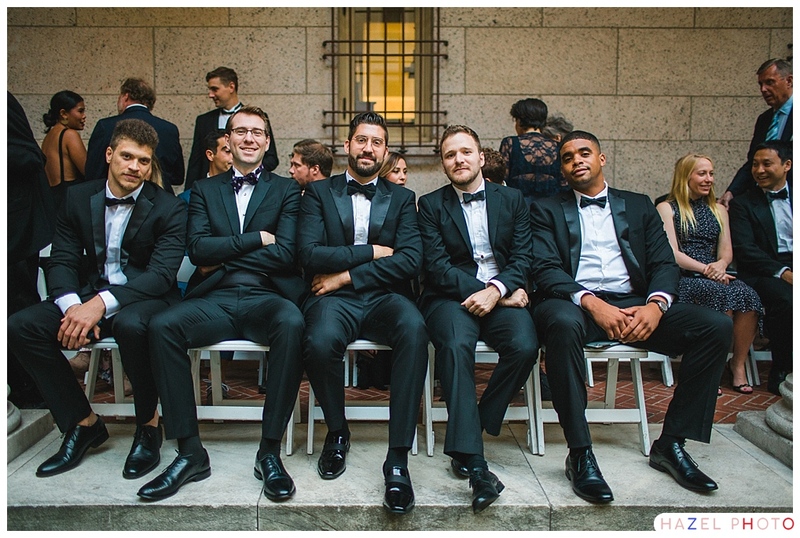 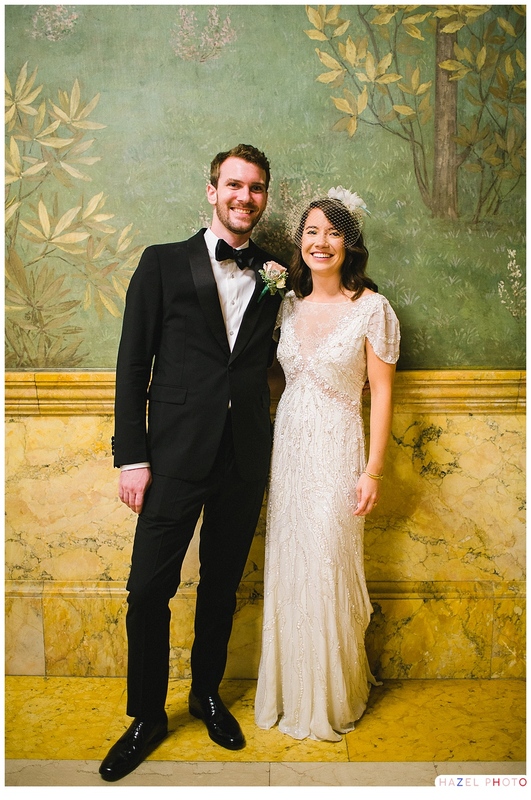 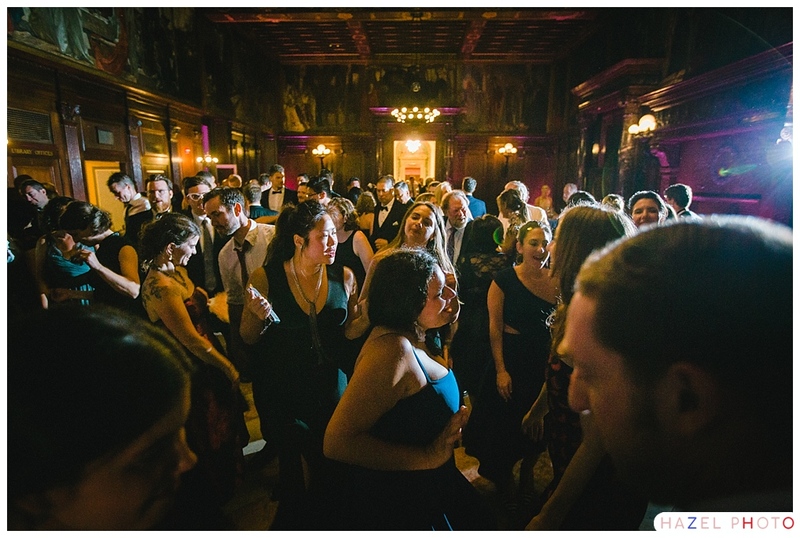 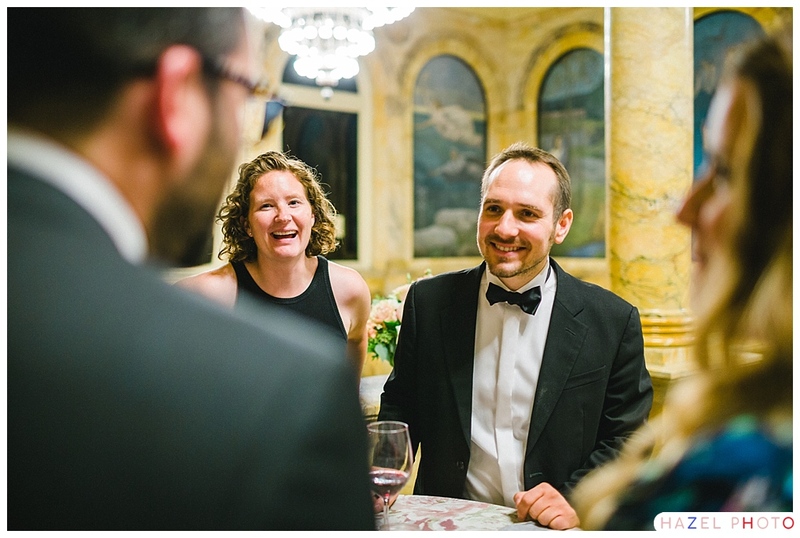 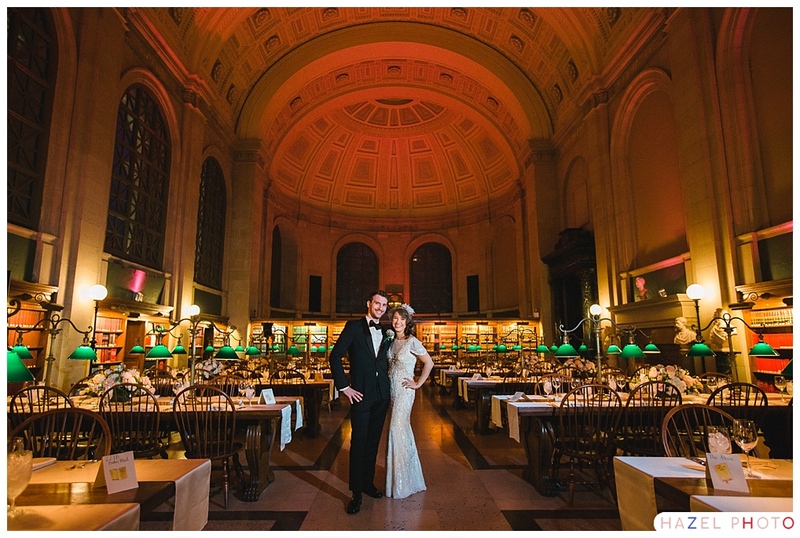 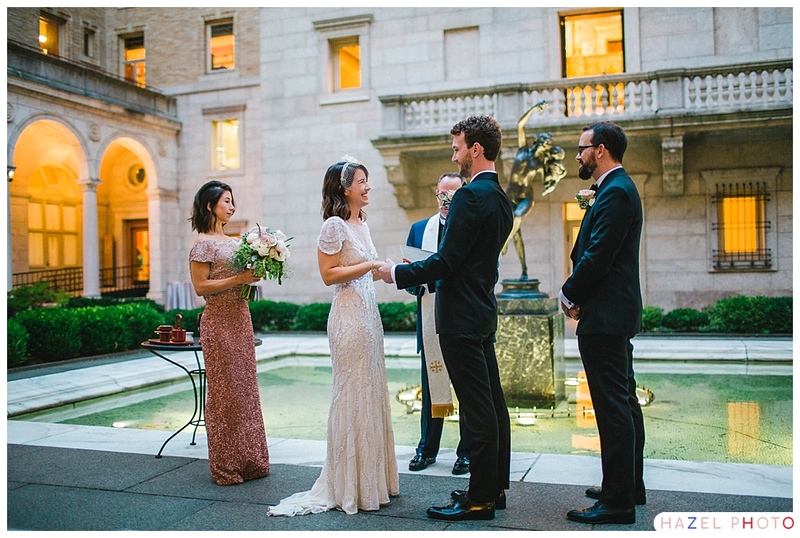 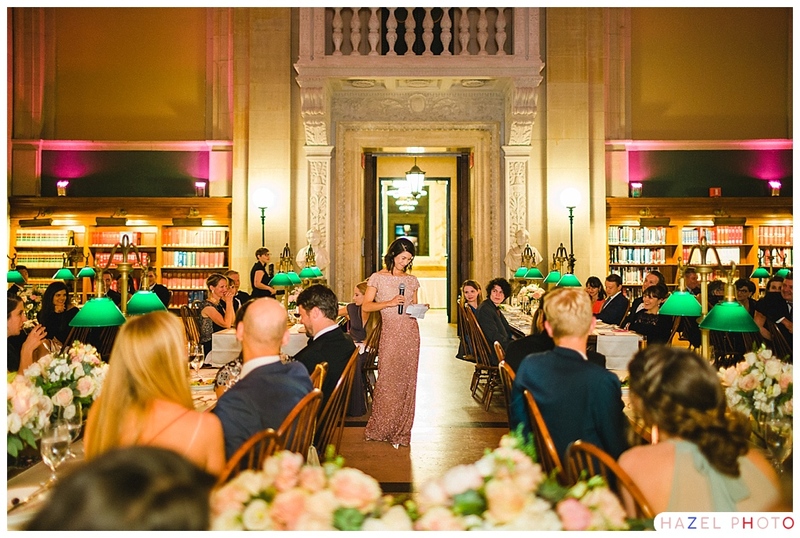 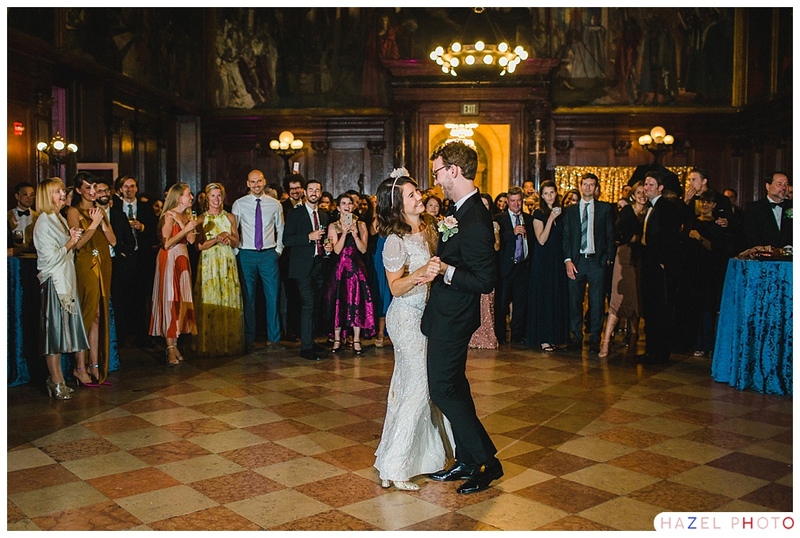 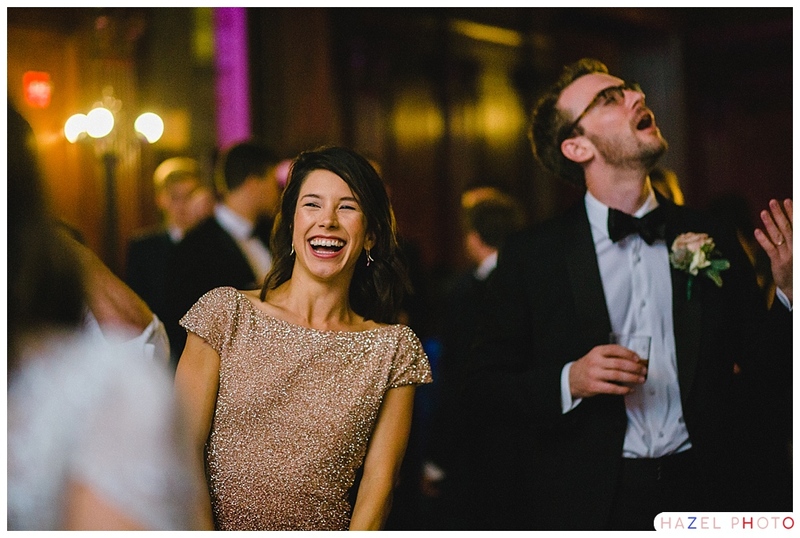 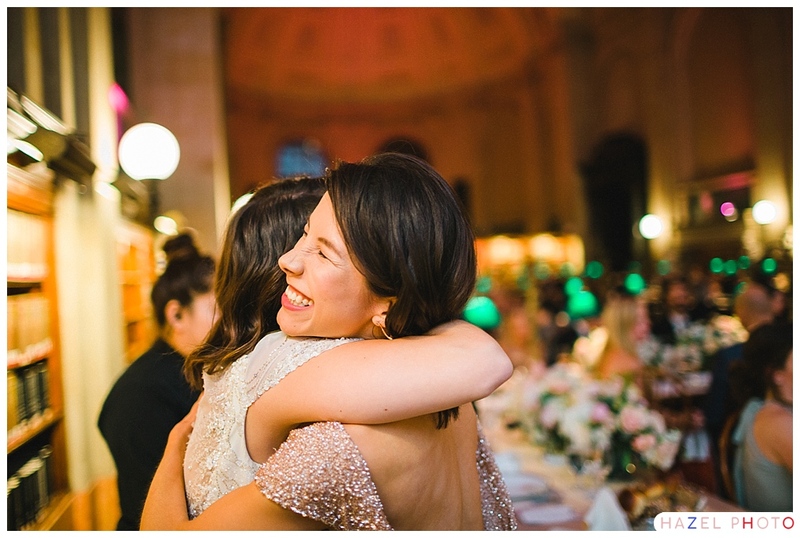 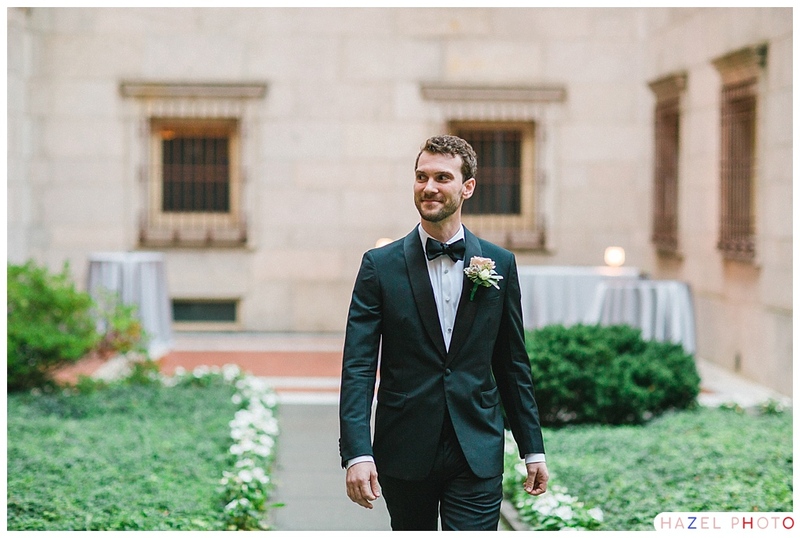 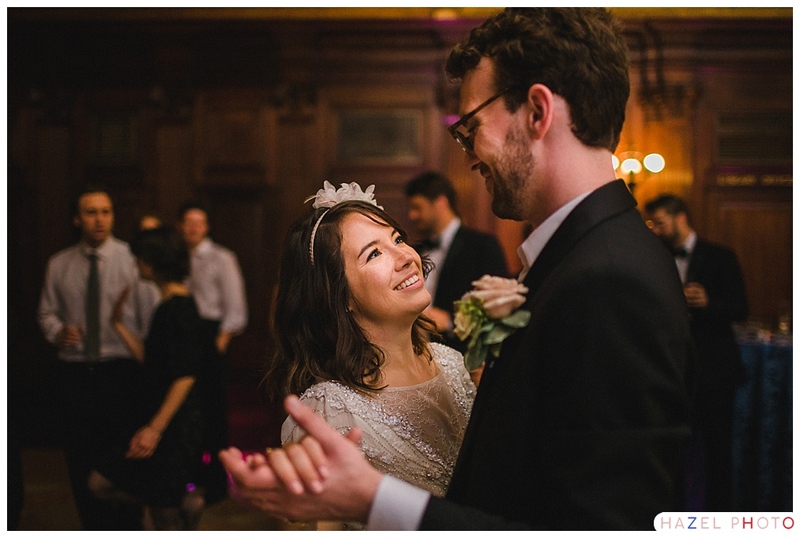 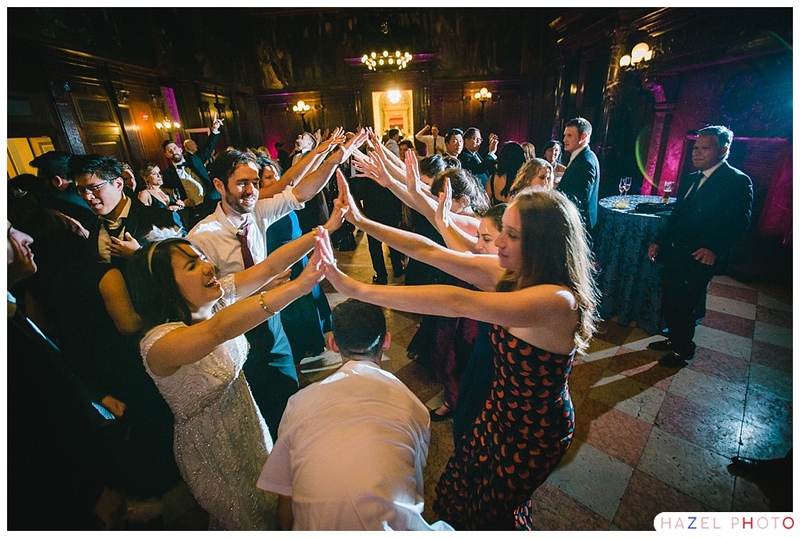 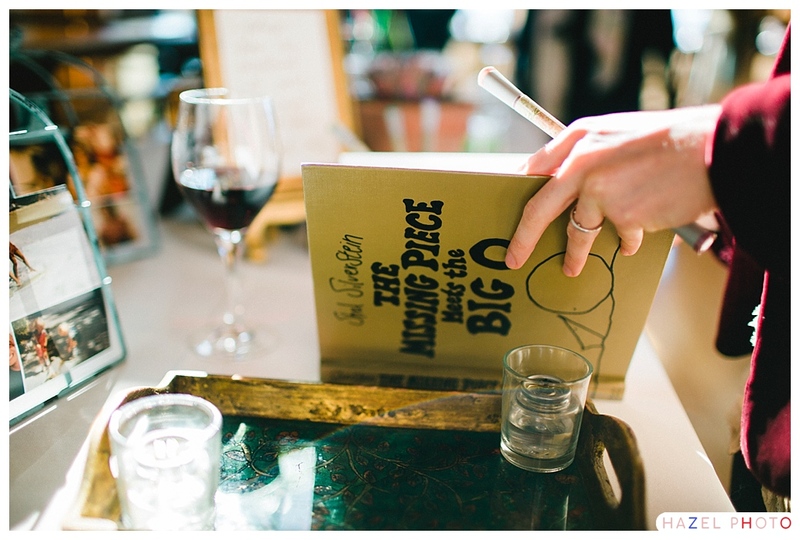 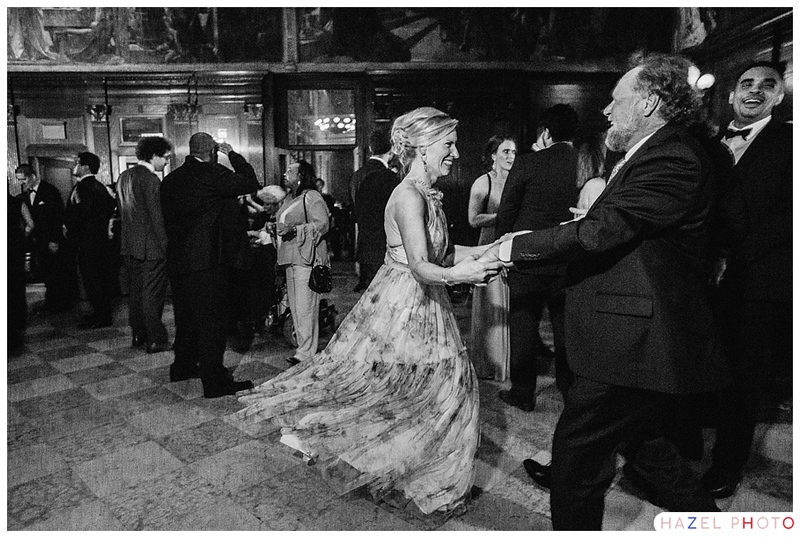 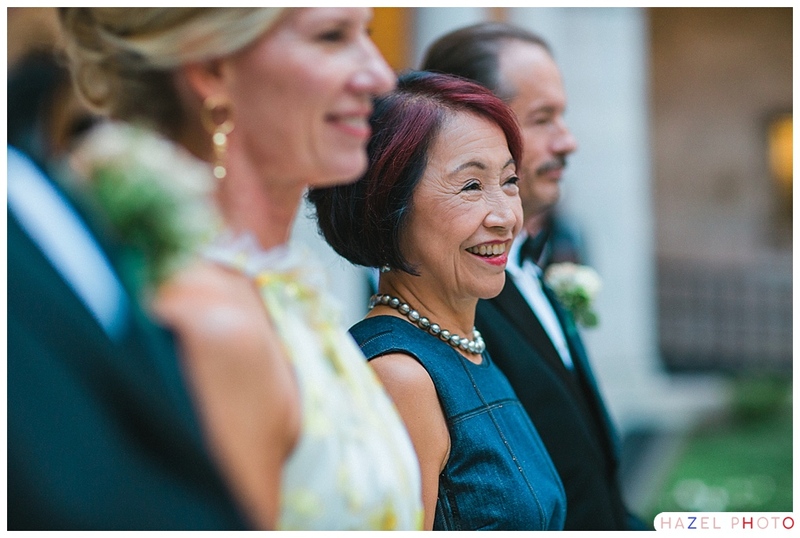 The McKim building at the Boston Public Library is the classiest library I have ever set foot in, and I’m a notorious book lover, so this wedding was kind of a dream. 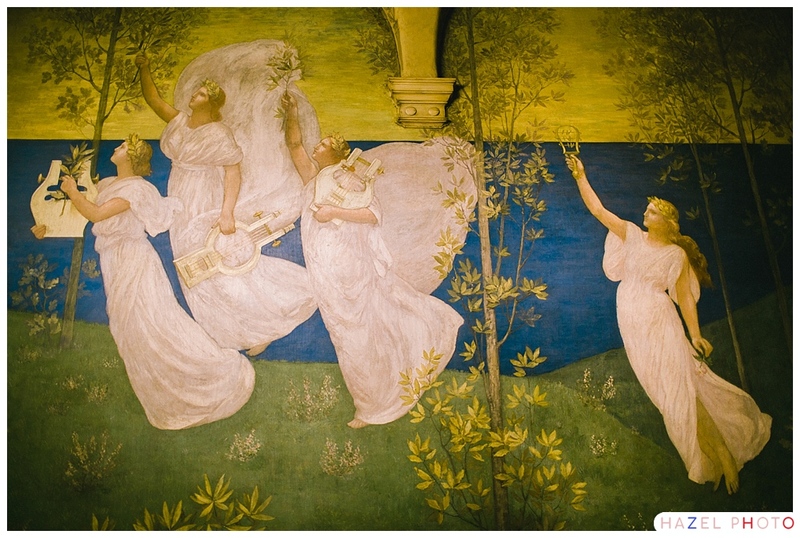 Murals by Puvis de Chavannes, Abbey, and Sargent adorn the library walls. 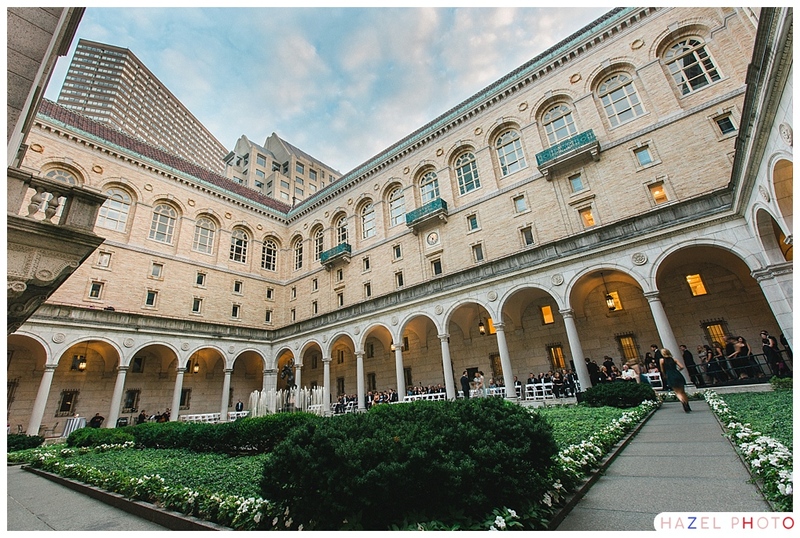 The whole grand building and courtyard make quite the backdrop for a wedding. 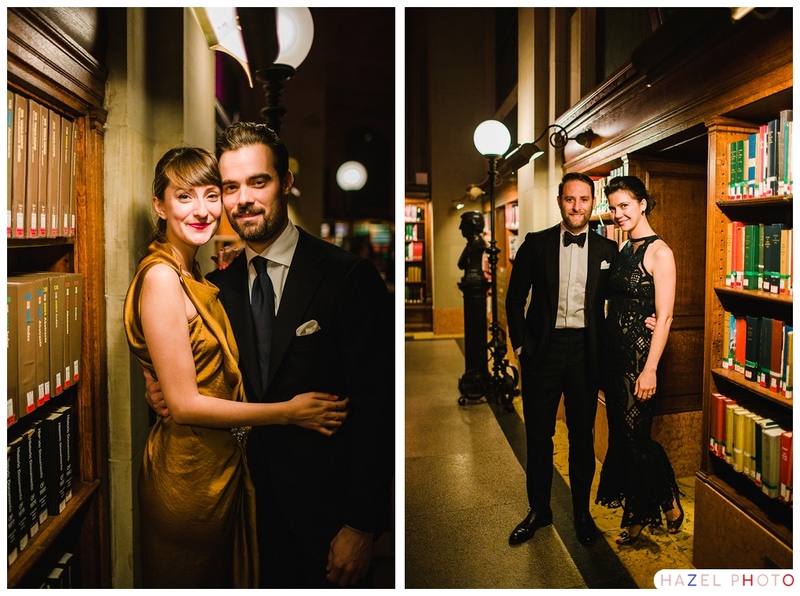 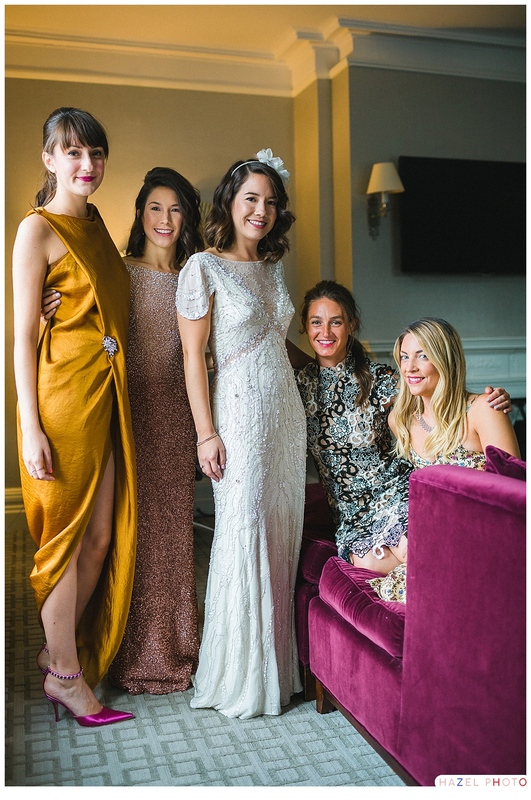 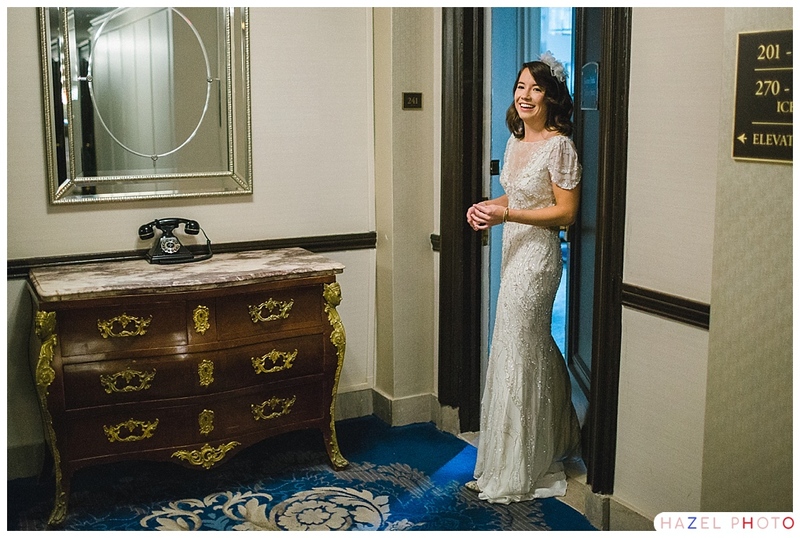 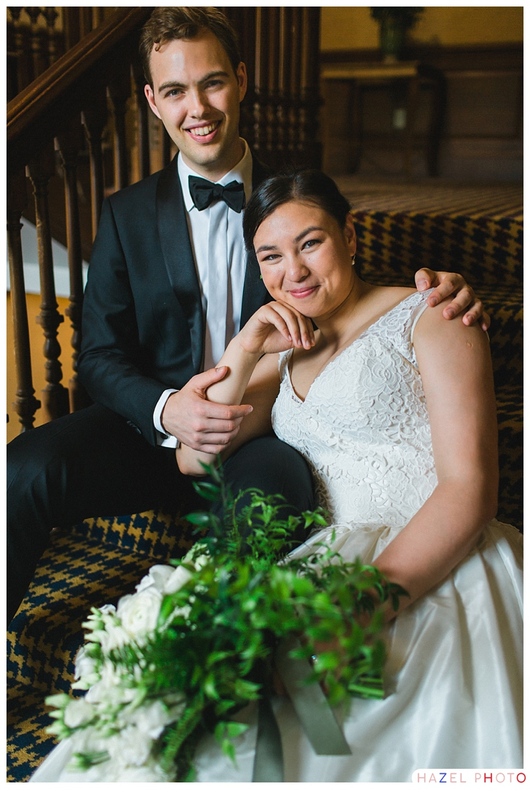 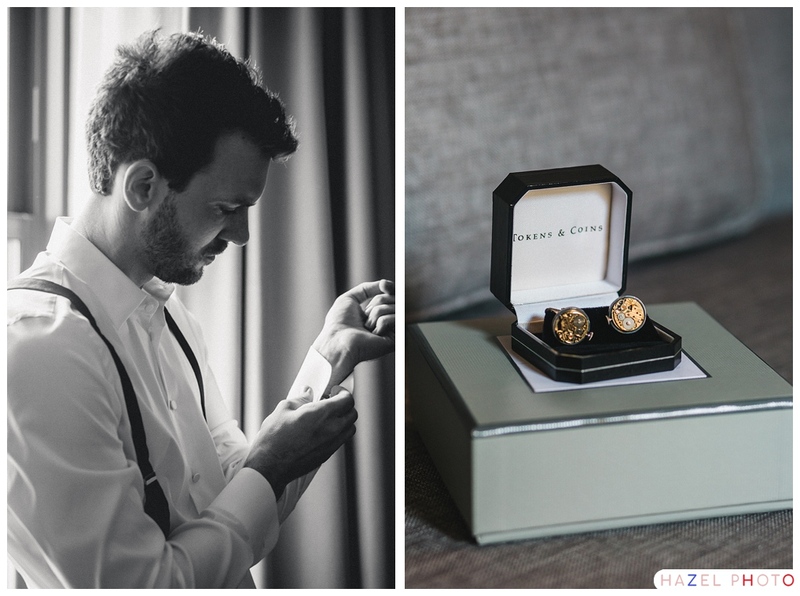 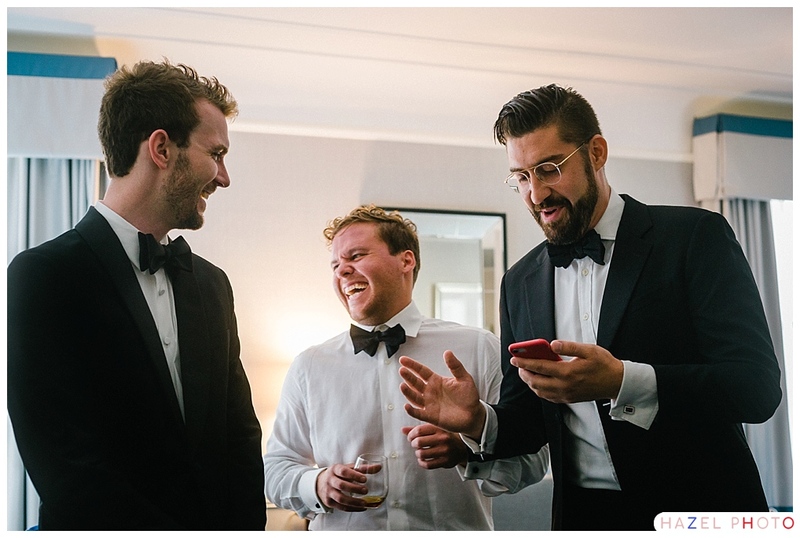 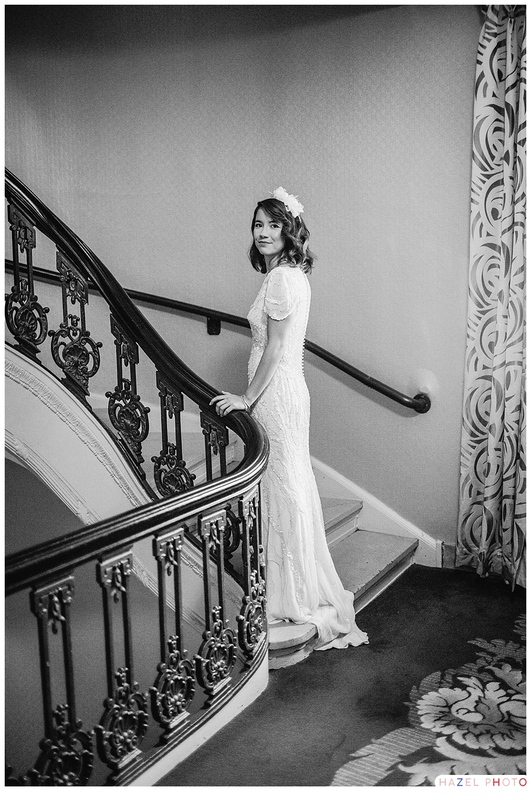 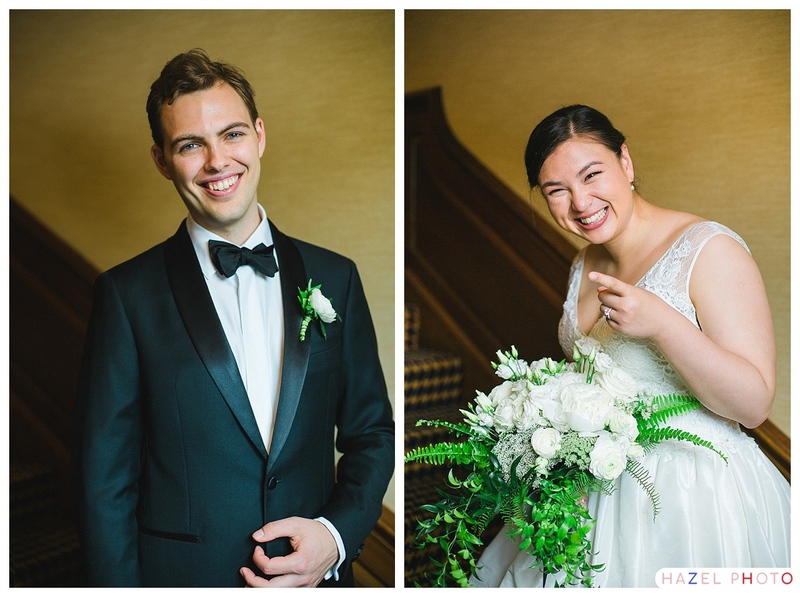 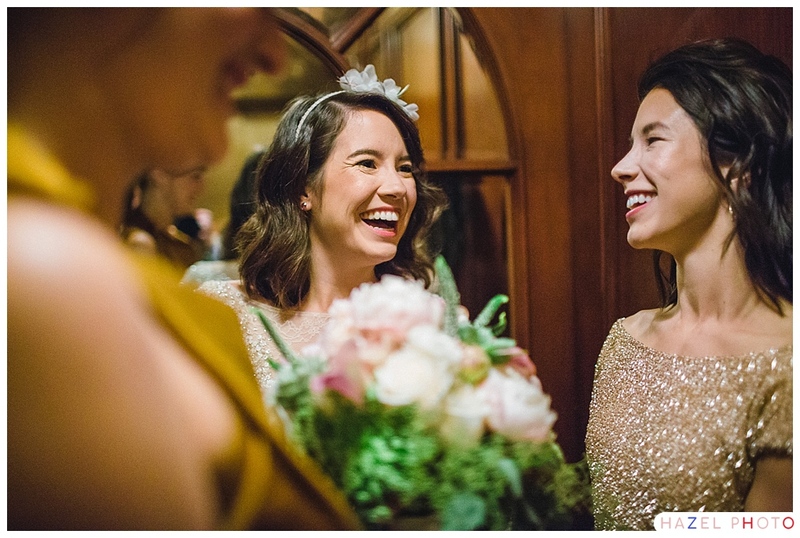 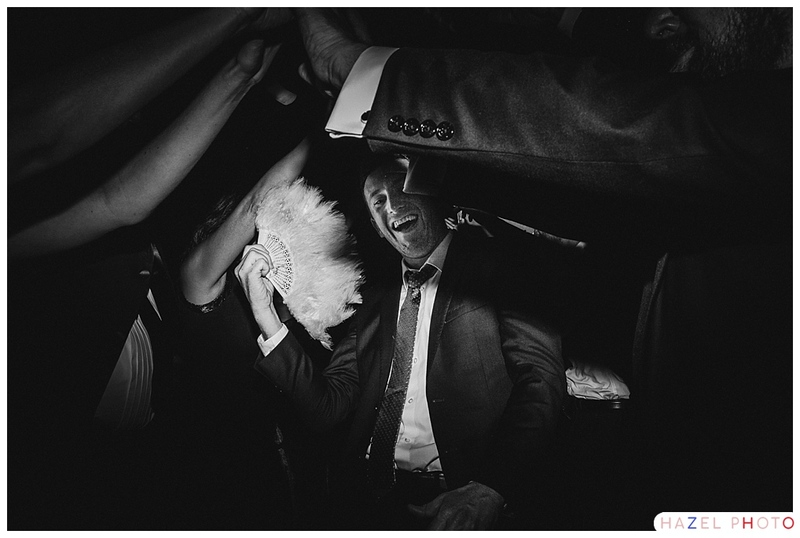 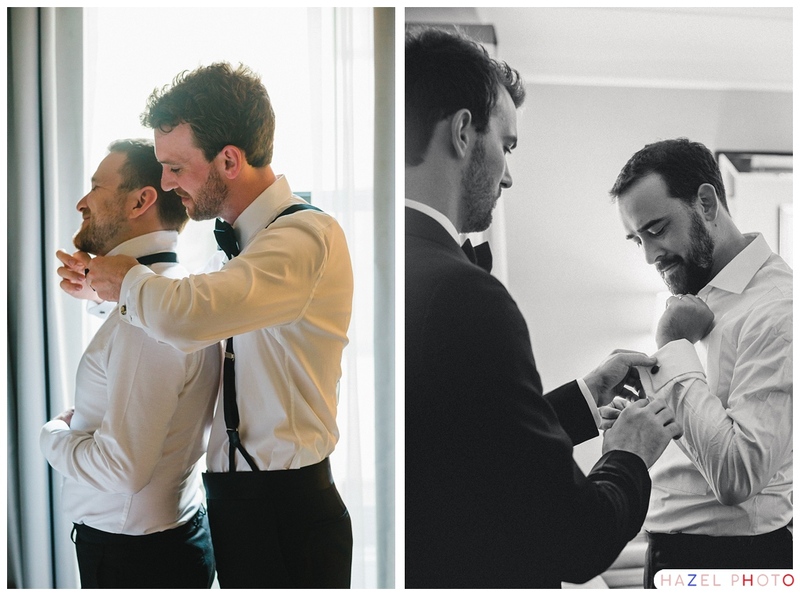 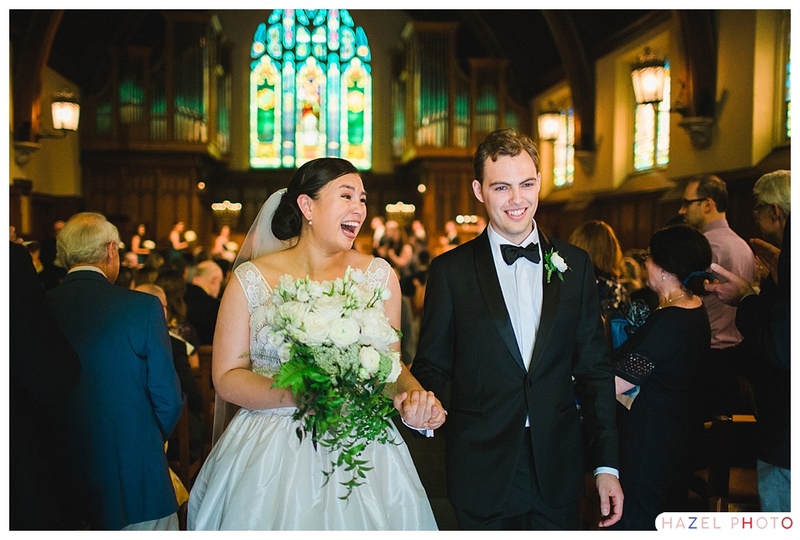 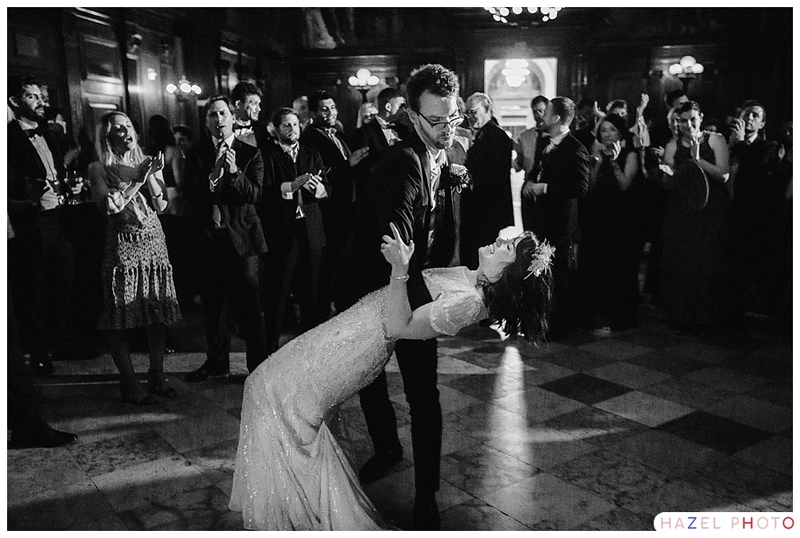 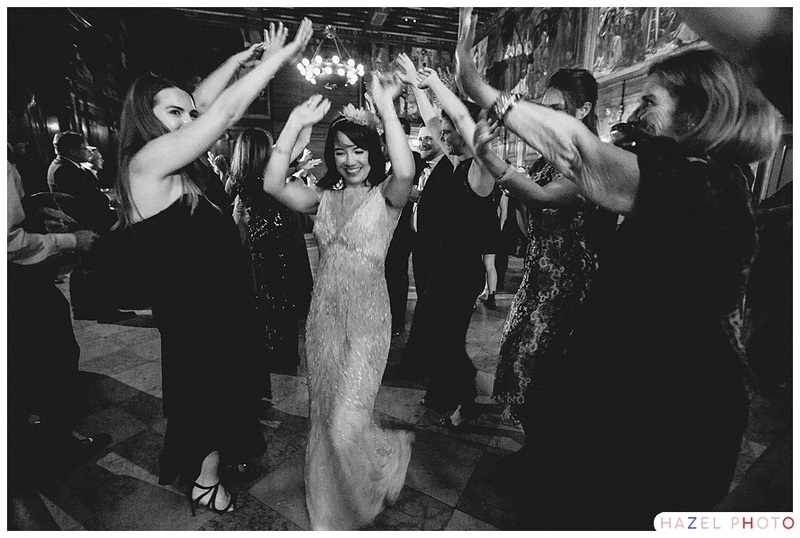 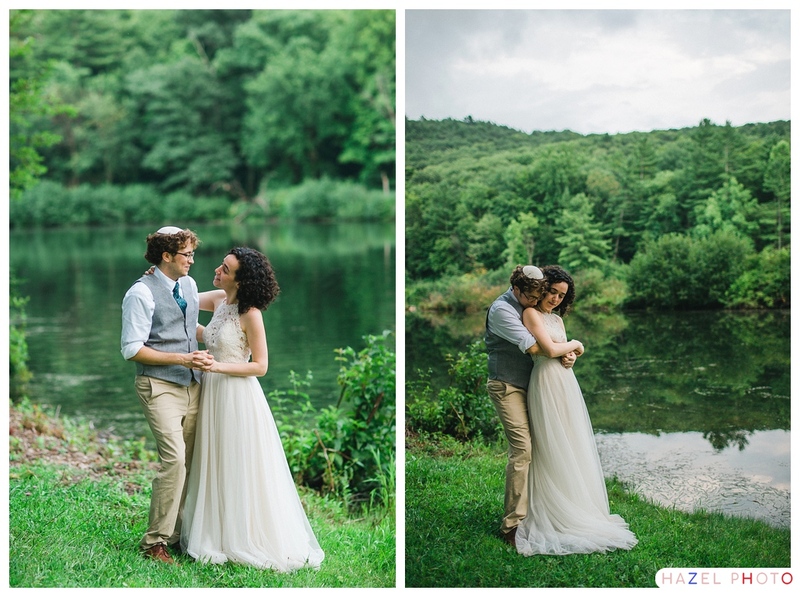 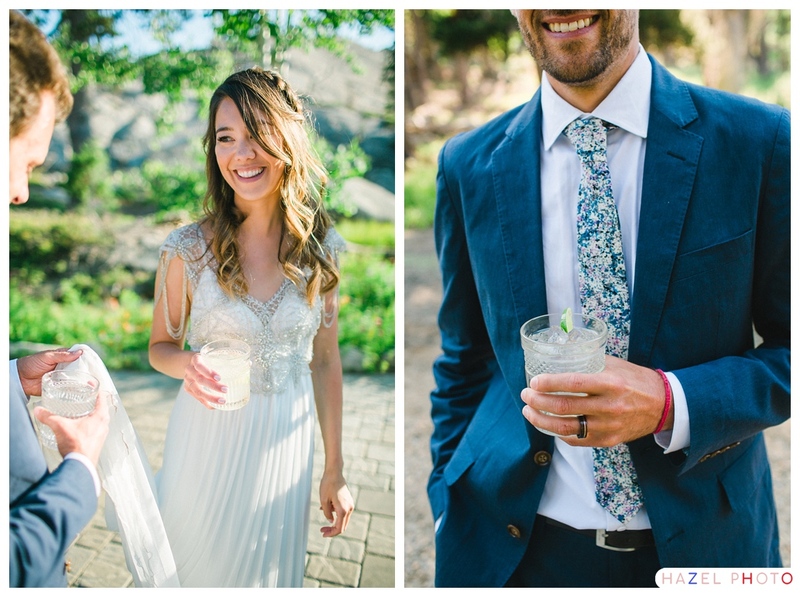 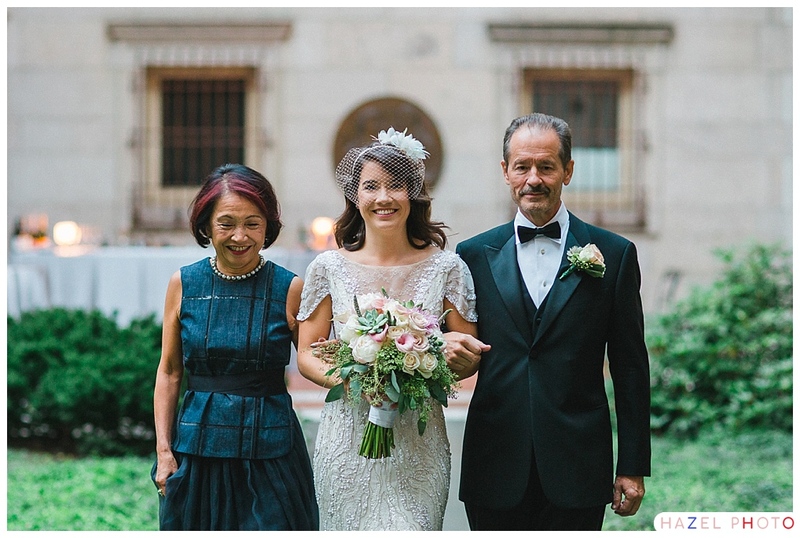 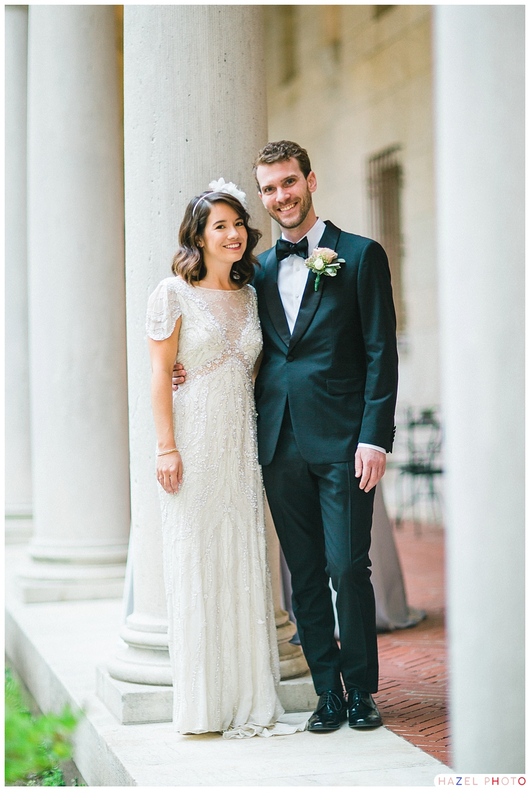 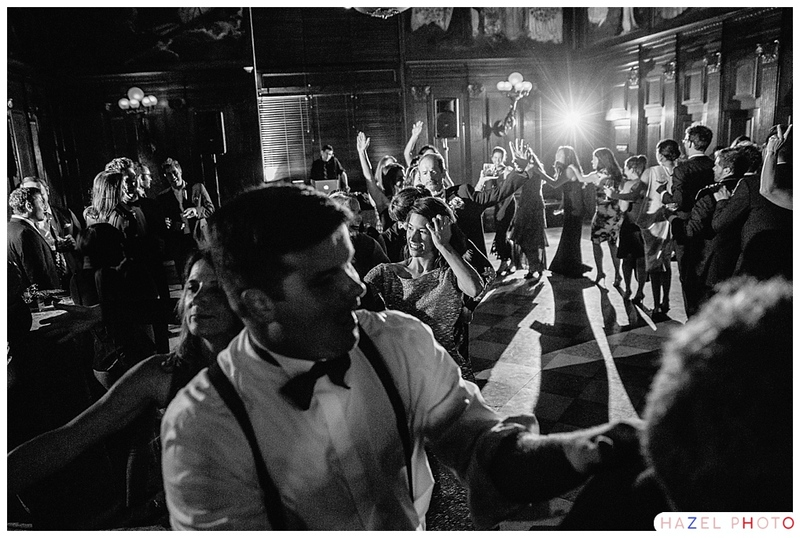 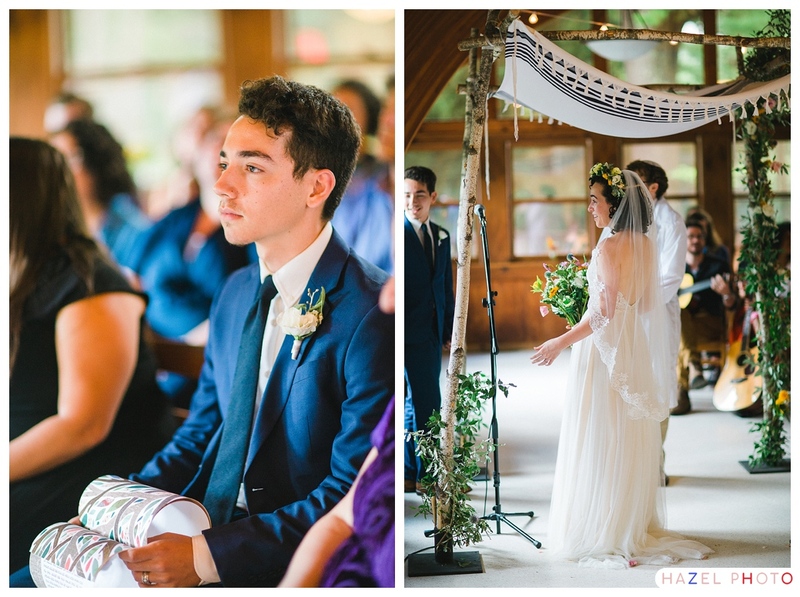 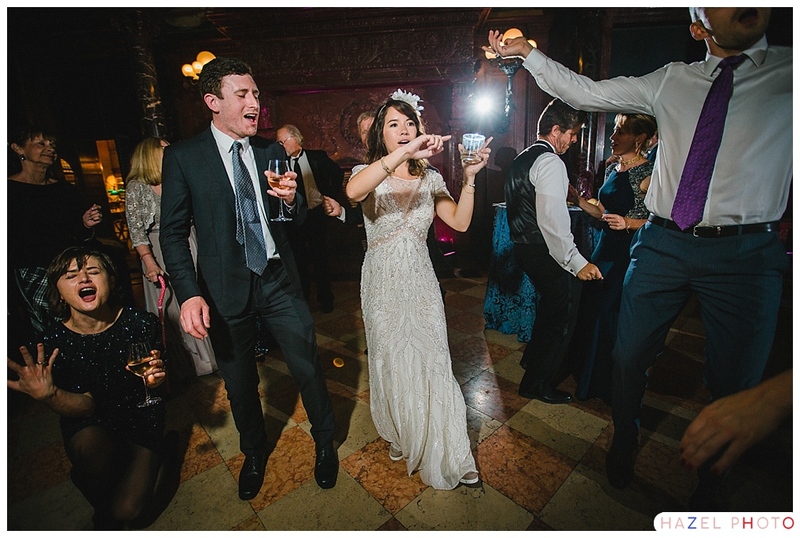 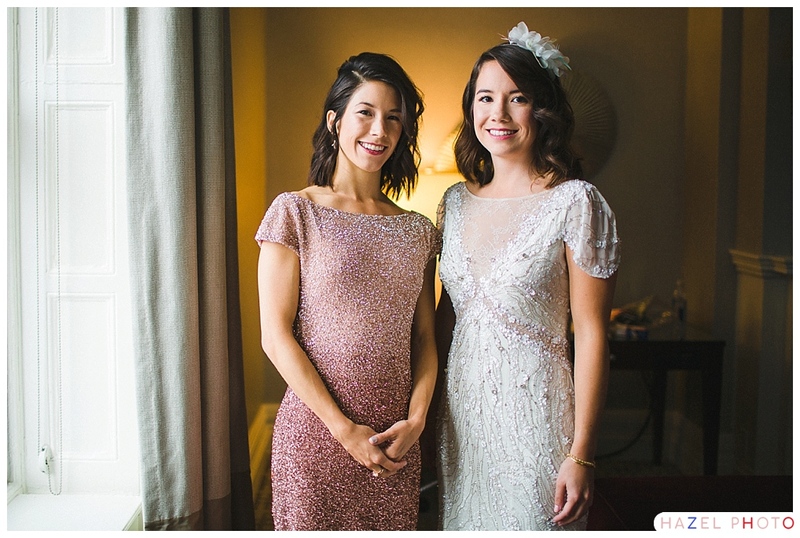 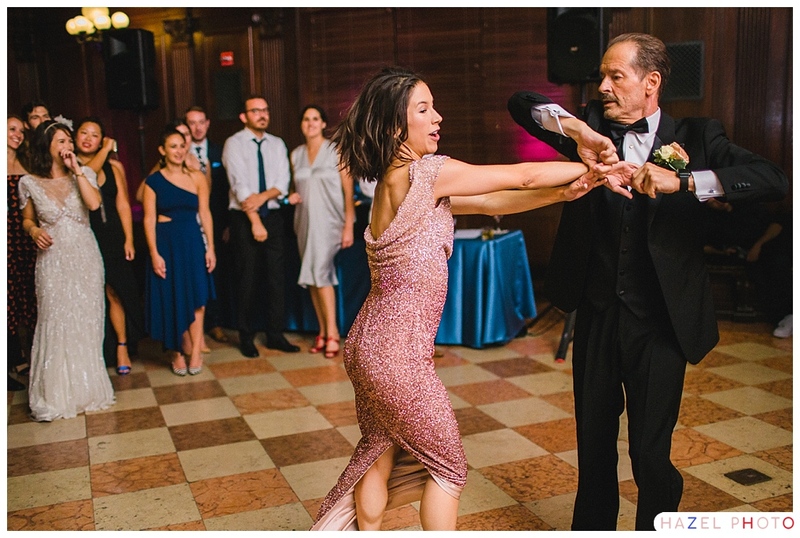 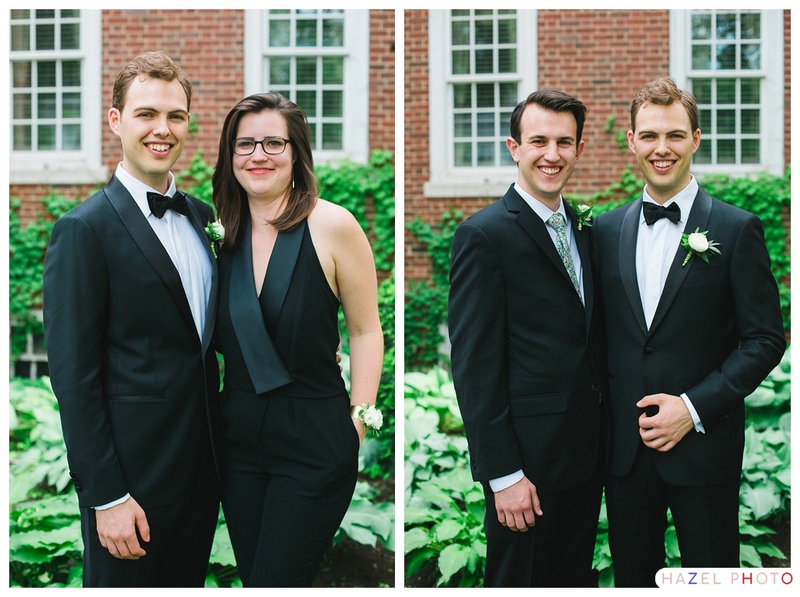 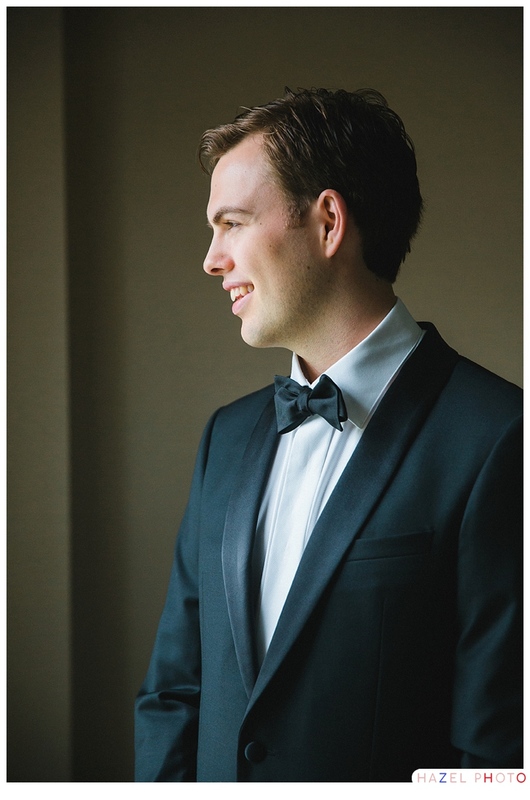 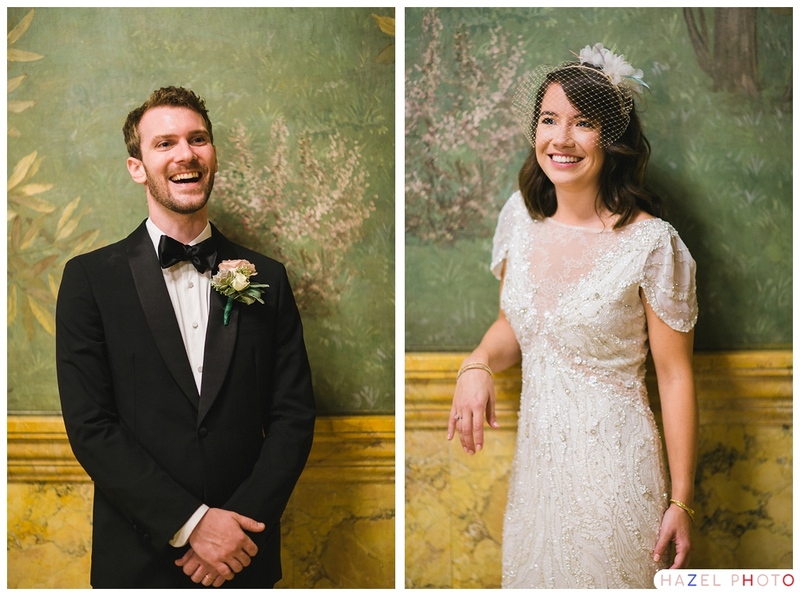 Eric wore a striking black tuxedo with a succulent boutonniere, and Alexandra wore a gorgeous intricately beaded gown that brought to mind the glamour of the roaring twenties. 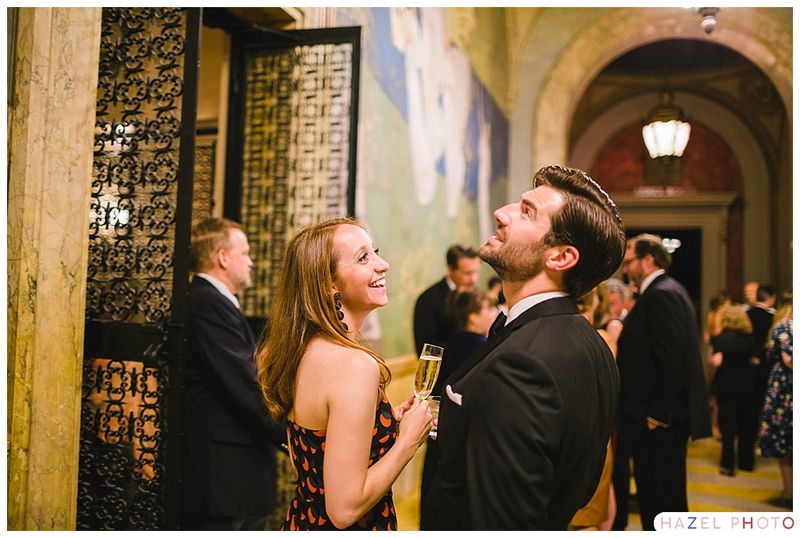 This vibe is particularly strong in the portraits we made on the marble grand staircase, and with the Puvis de Chavannes murals. 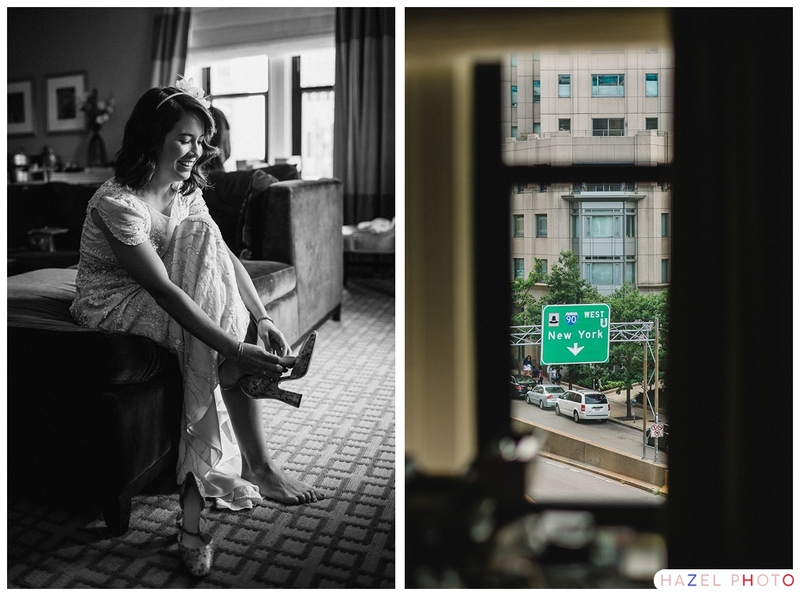 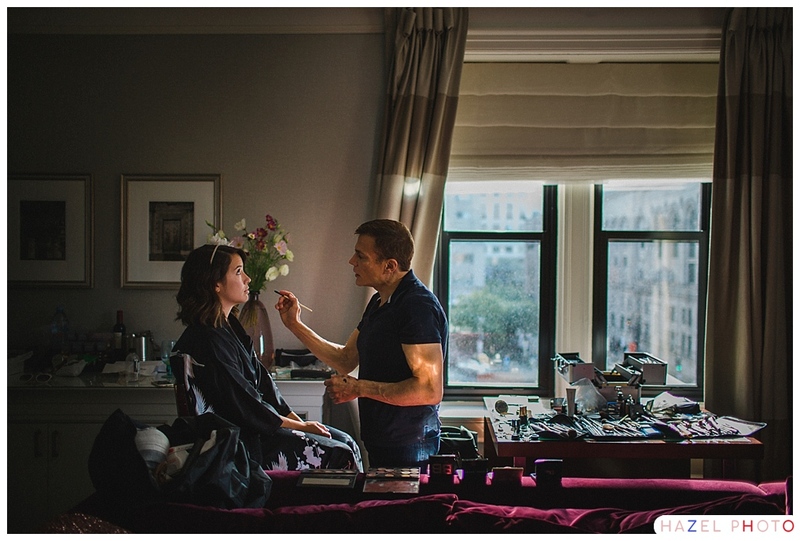 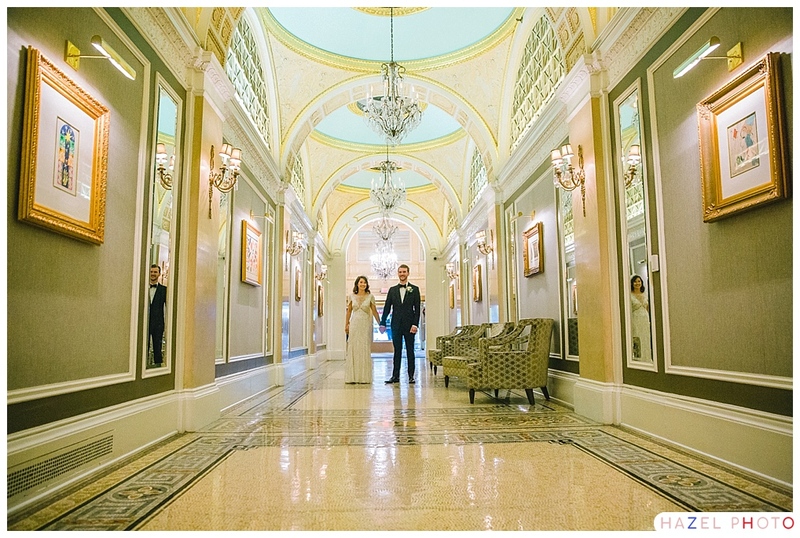 The two got ready across the street at the ever elegant Fairmont Copley. 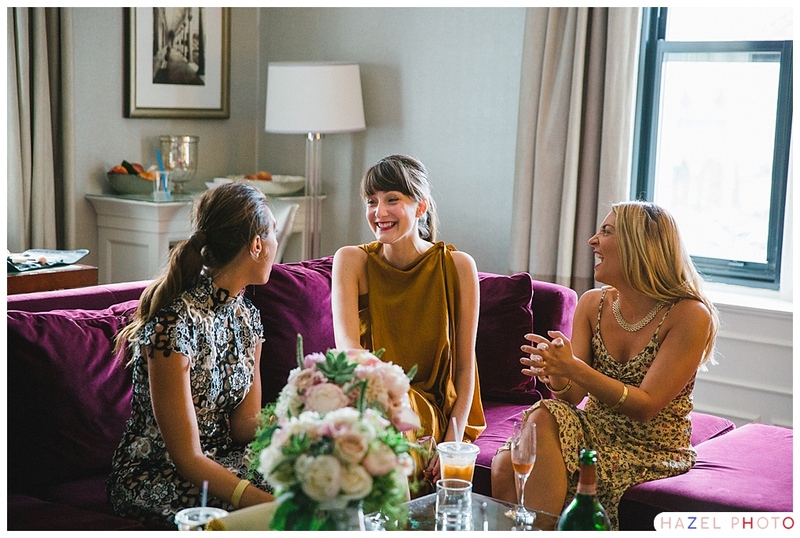 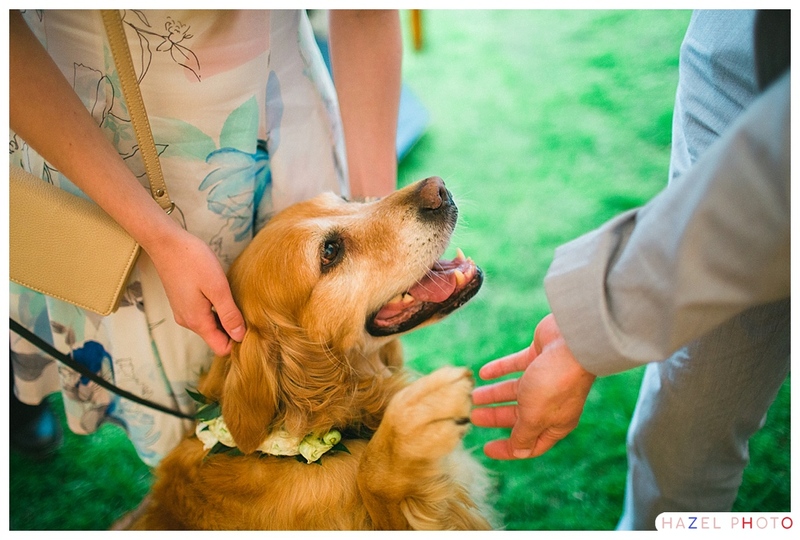 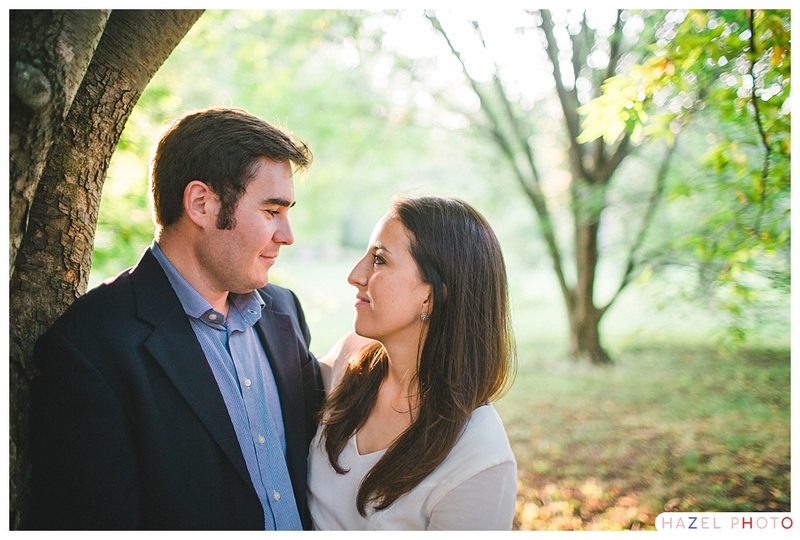 In a pre-wedding consult I asked Alexandra and Eric if there were any details they were particularly excited about. 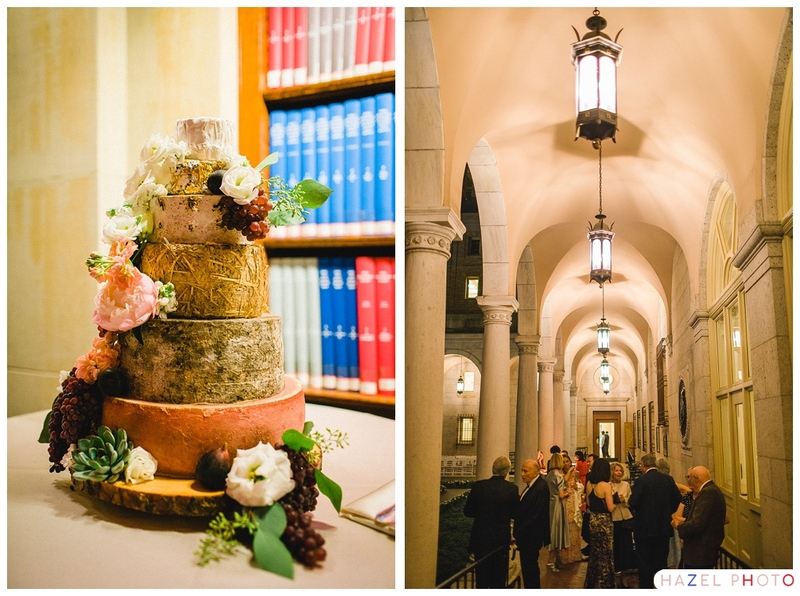 Eric mentioned the cheese/cake and they both broke into laughter describing the tower of wheels of cheese decorated with flowers, herbs and champagne grapes. 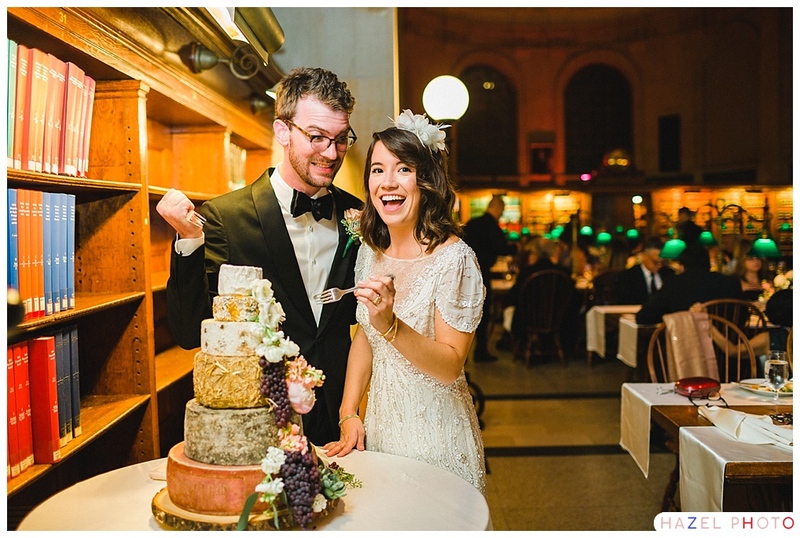 Let’s just say the cheese wedding cake did not disappoint in person. 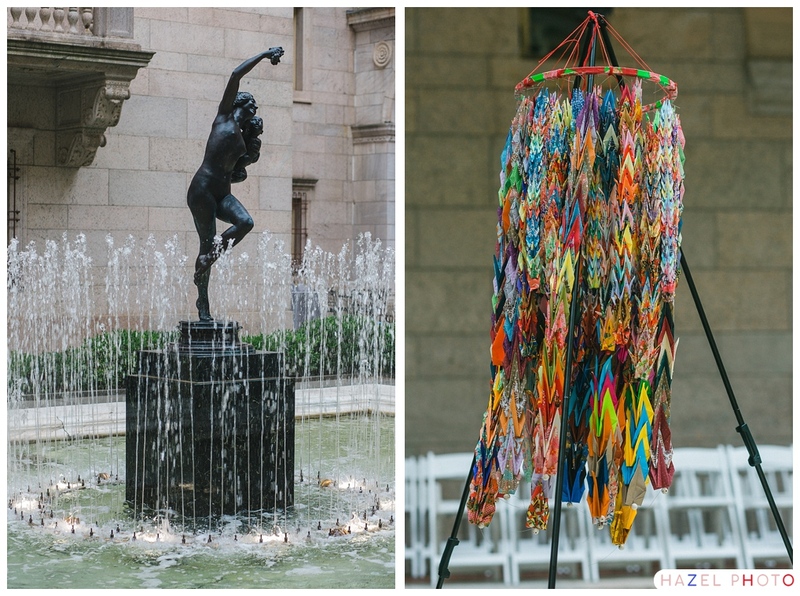 The courtyard of the McKim building is transporting. 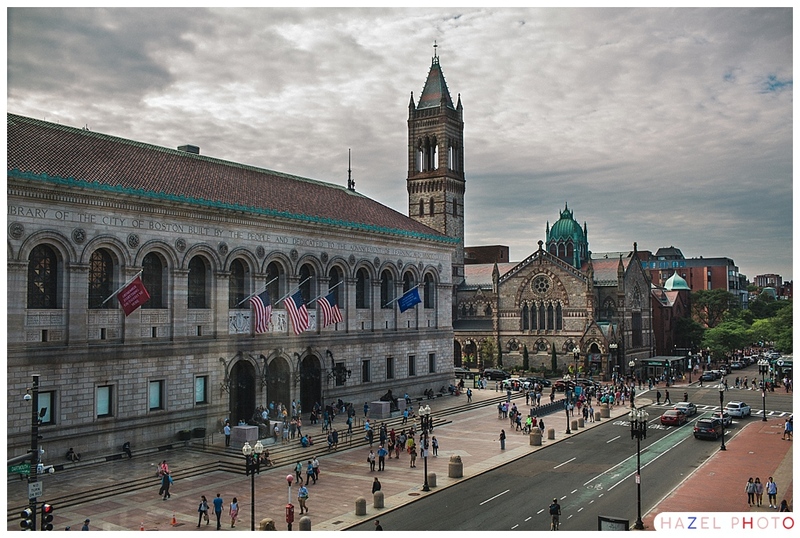 It was easy to forget we were in the center of a busy Metropolis. 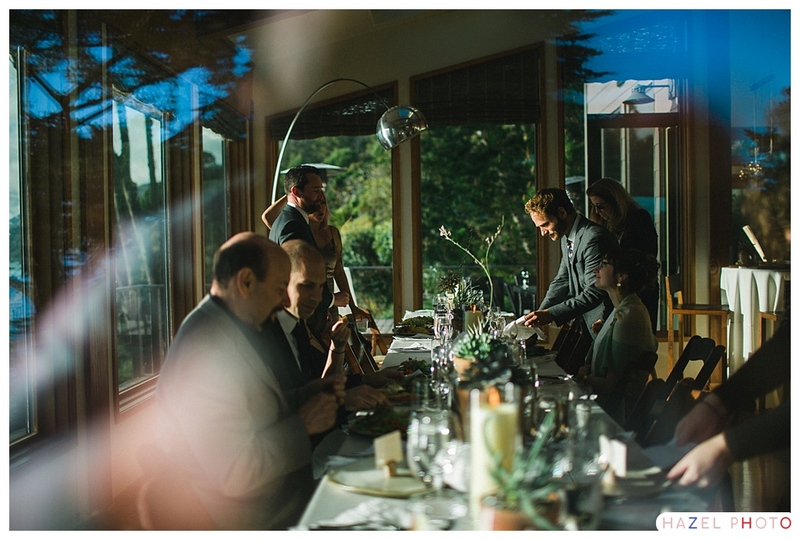 The light drew low, as the two were joined, flanked by their siblings, and surrounded by family and friends. 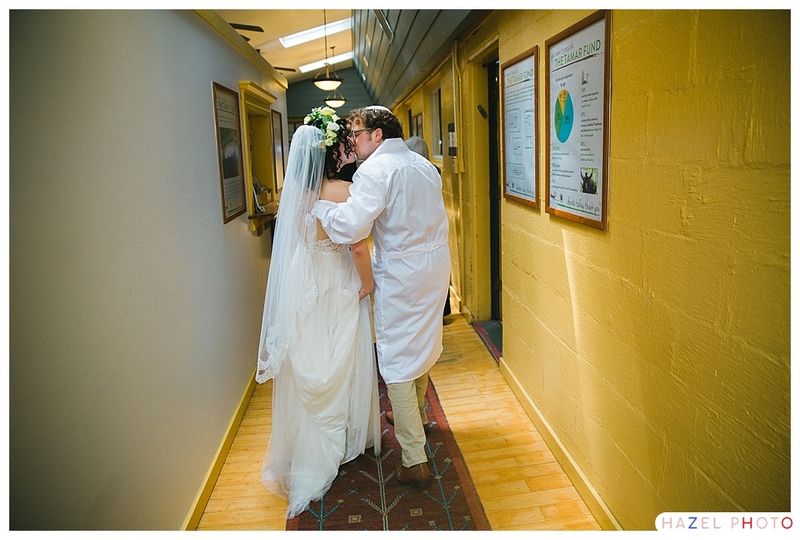 Alexandra and Eric are scientists. 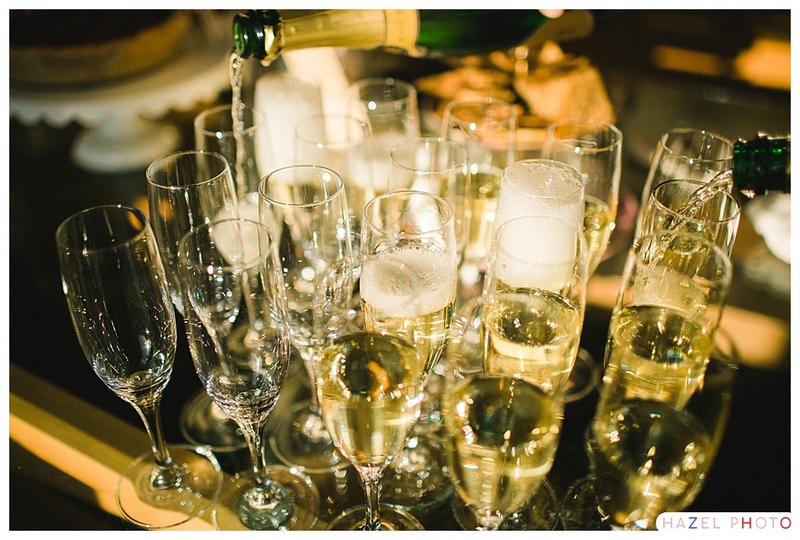 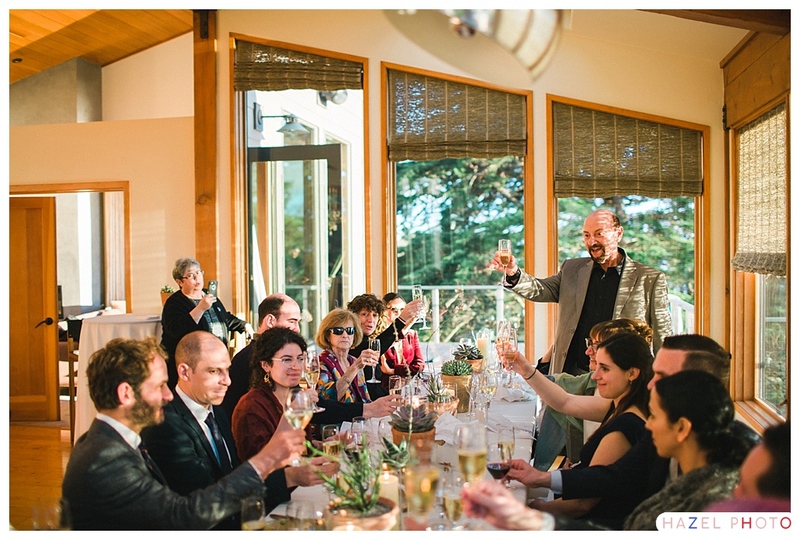 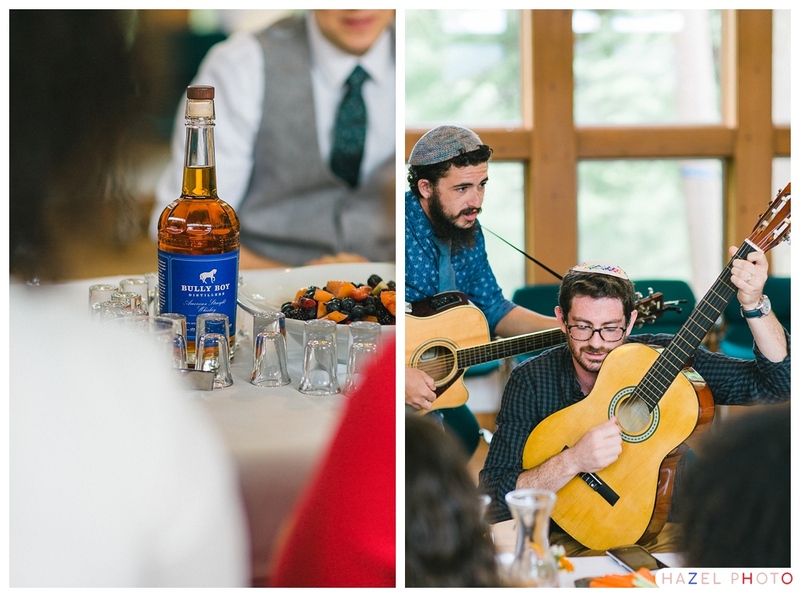 The officiant’s sermon, and the toasts both made reference to this shared passion. 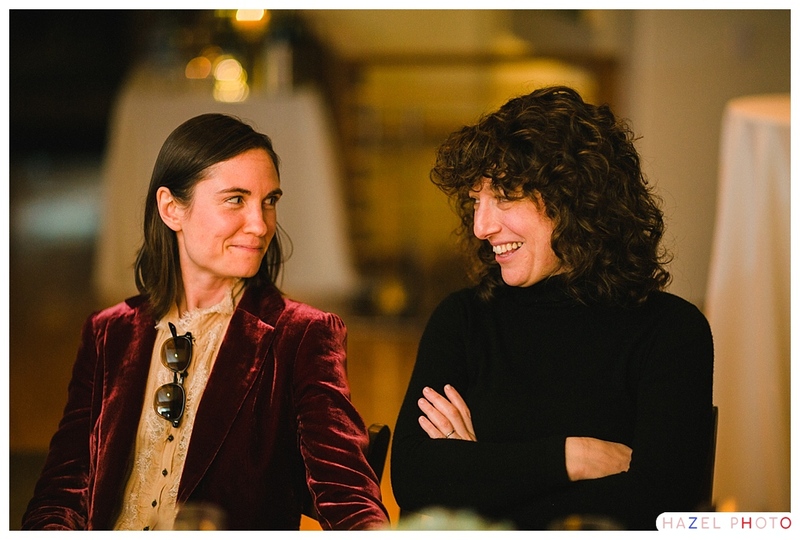 Apparently the two spend much time thinking and talking about the chemistry of pink lakes and cell death among other salient topics. 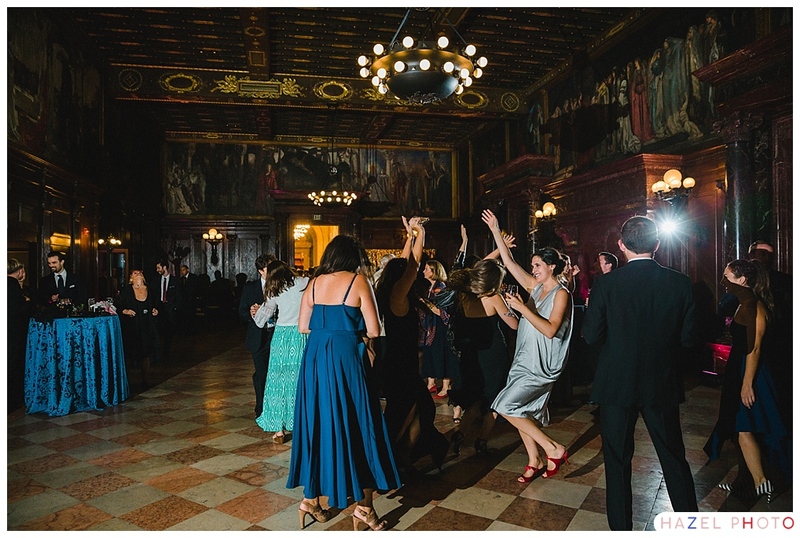 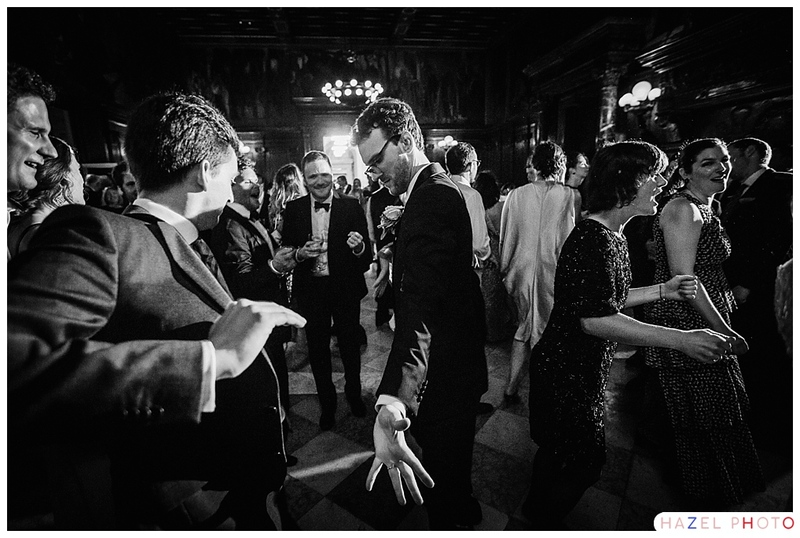 There were a few exceptionally talented dancers in attendance, which made for a lively, and visually stunning dance floor in the Abbey Room. 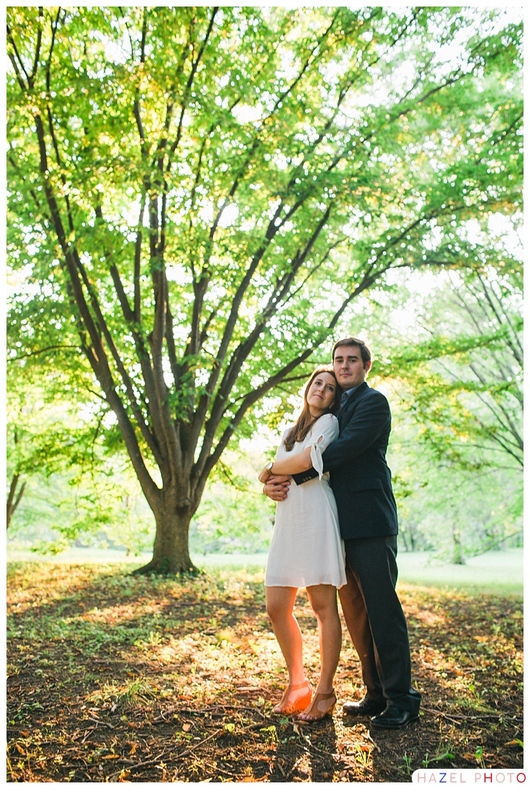 Shoutout to Leah Astore for helping out with photos! 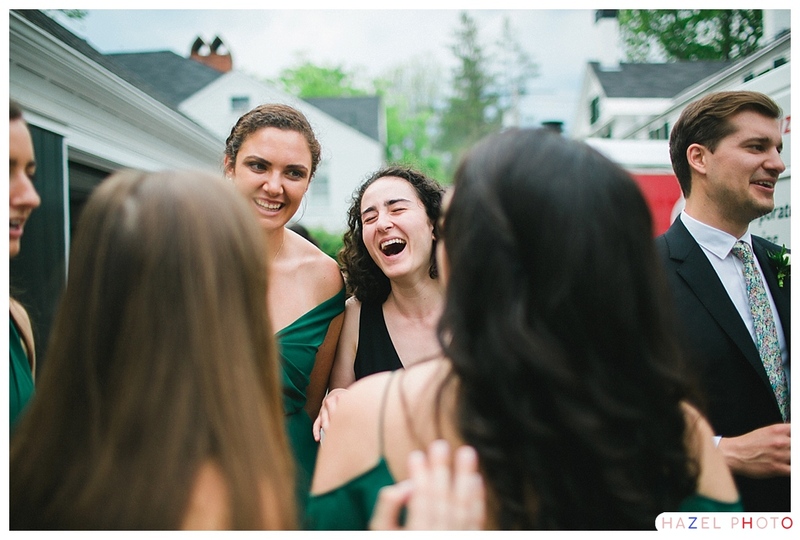 and to Bryanne Pepin and the whole crowd at A Catered Affair for doing what they do best. 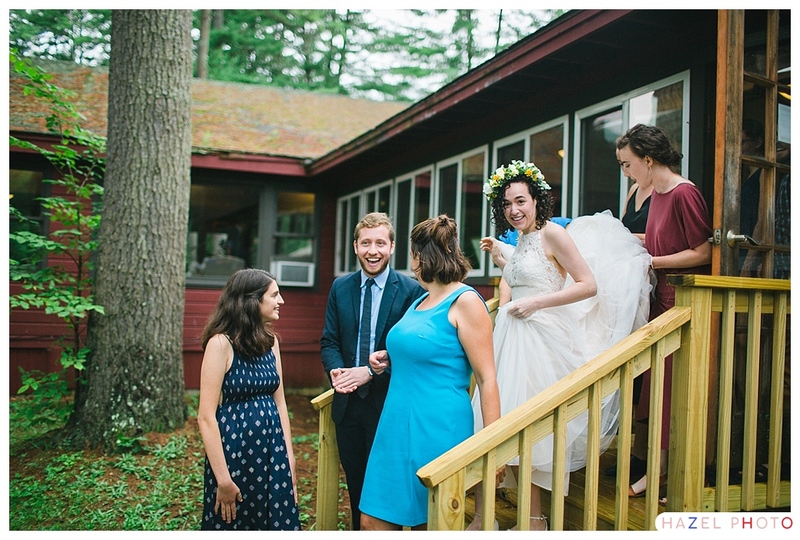 Rebecca and Jonah had a full wedding weekend at the Isabella Freedman Center in Western Connecticut. 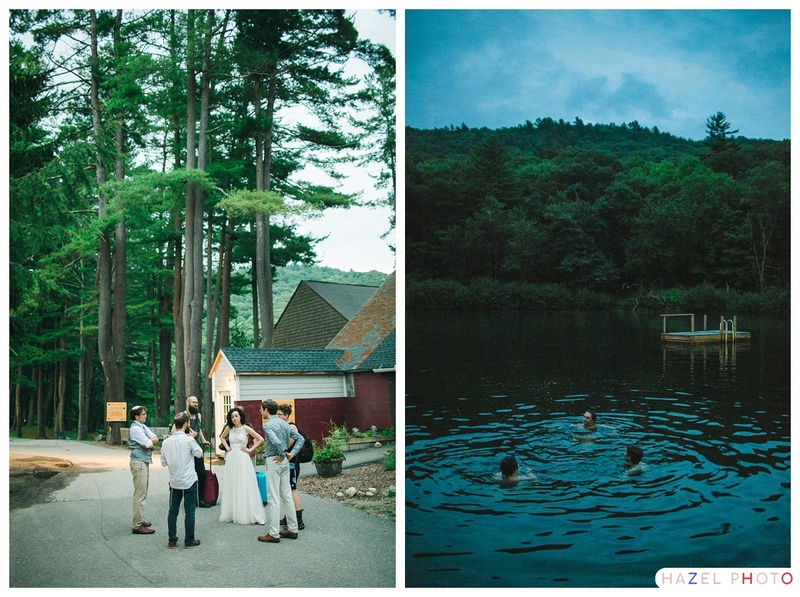 The Center is set around a lovely lake. 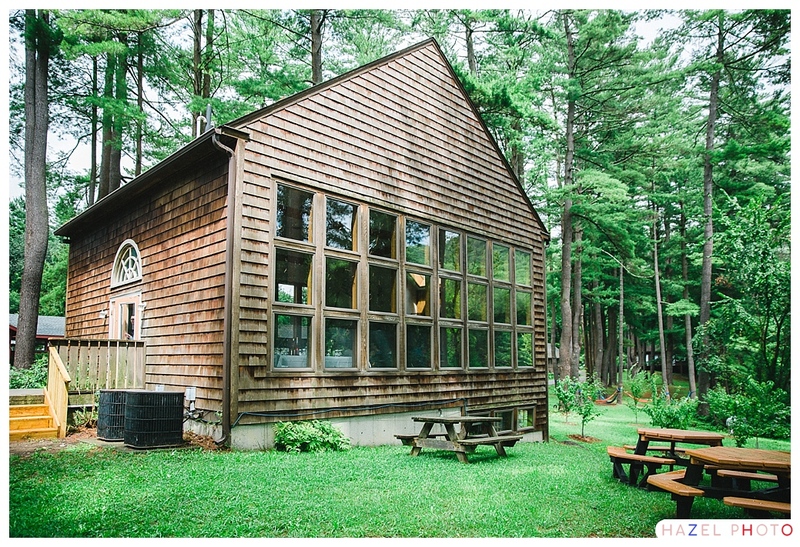 It hosts retreats, and houses a sustainable farm. 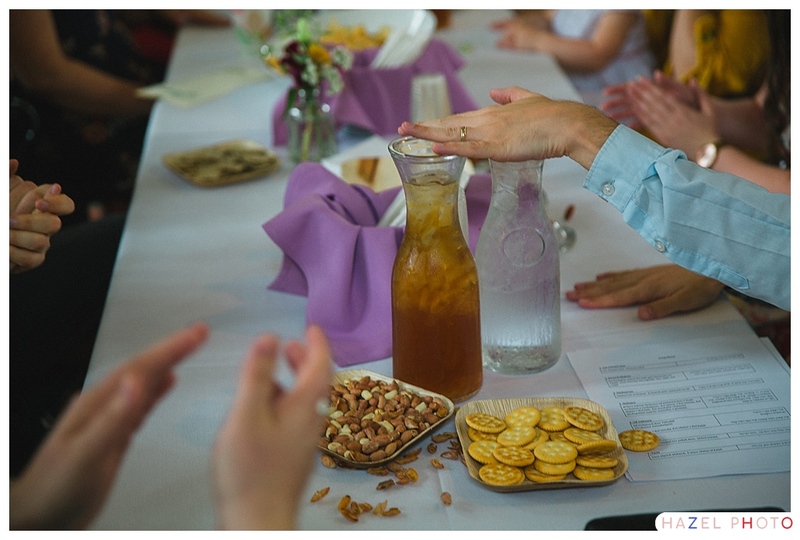 I was brought in to document festivities on the Sunday. 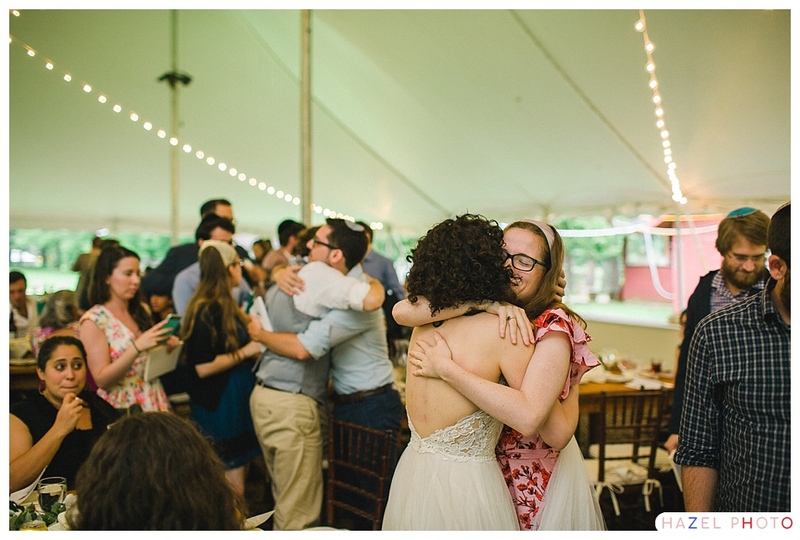 When I arrived, Jonah and Rebecca had already been celebrating for a couple days, and their guests had settled into a palpable comfort and warmth. 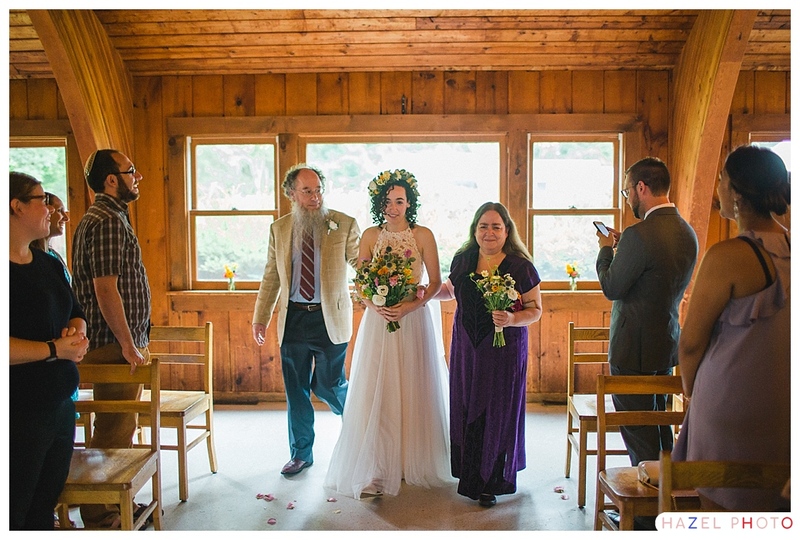 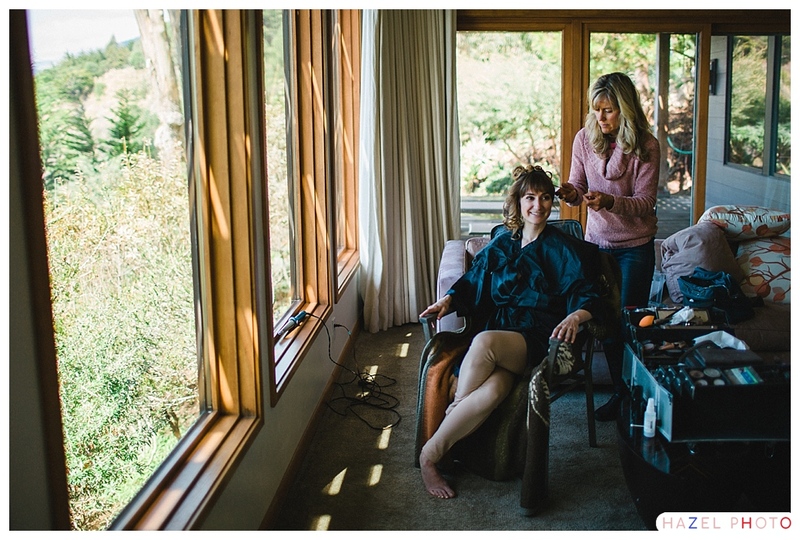 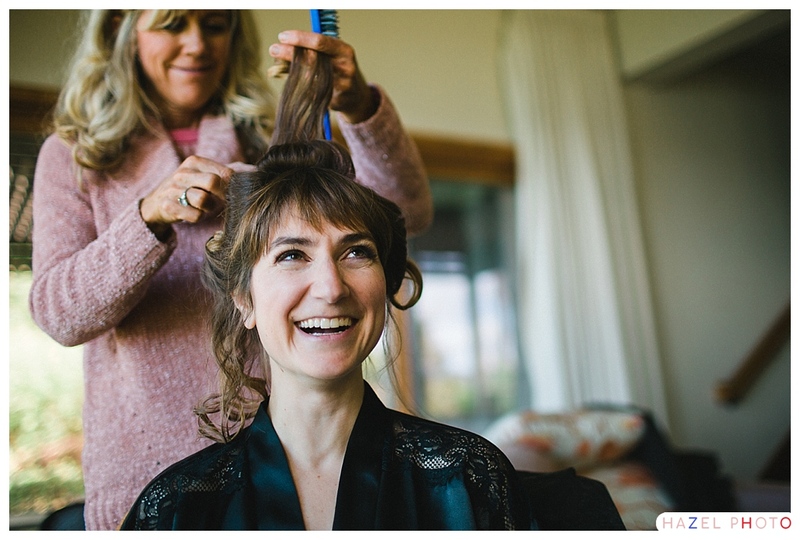 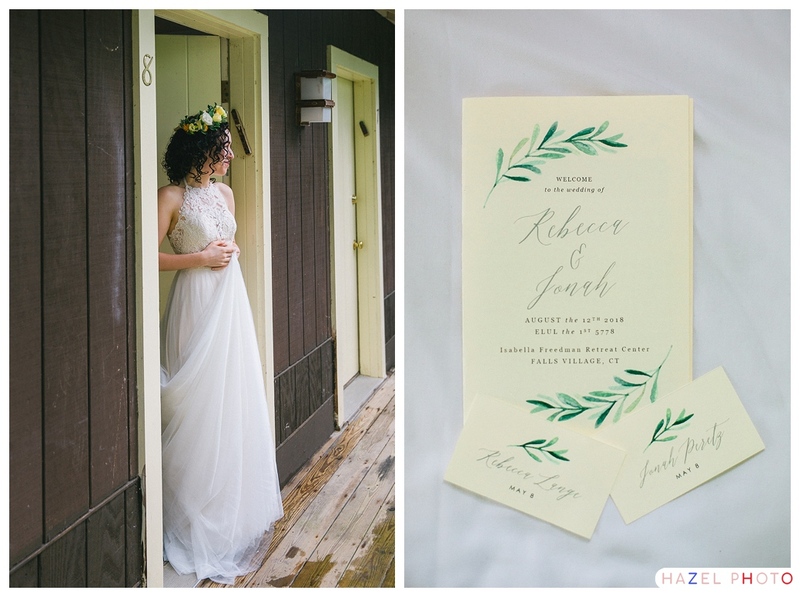 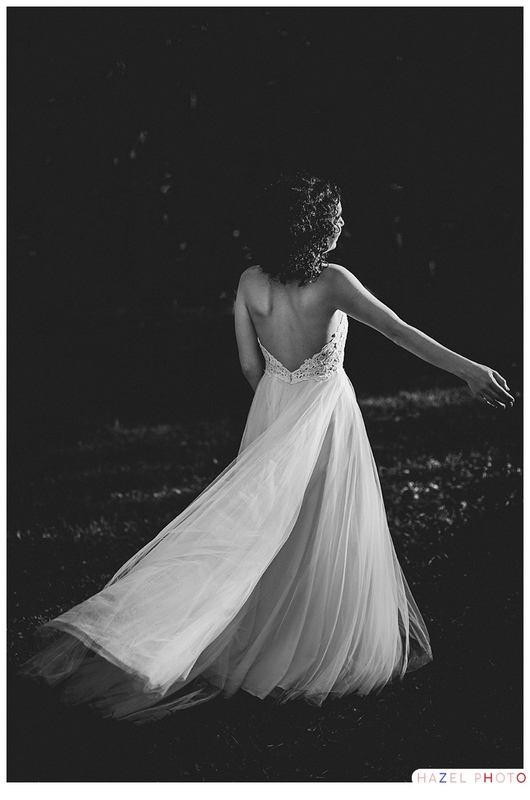 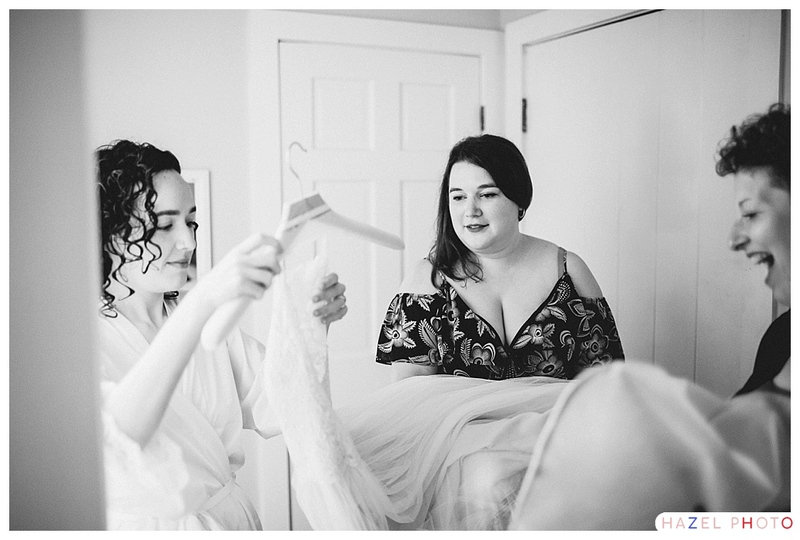 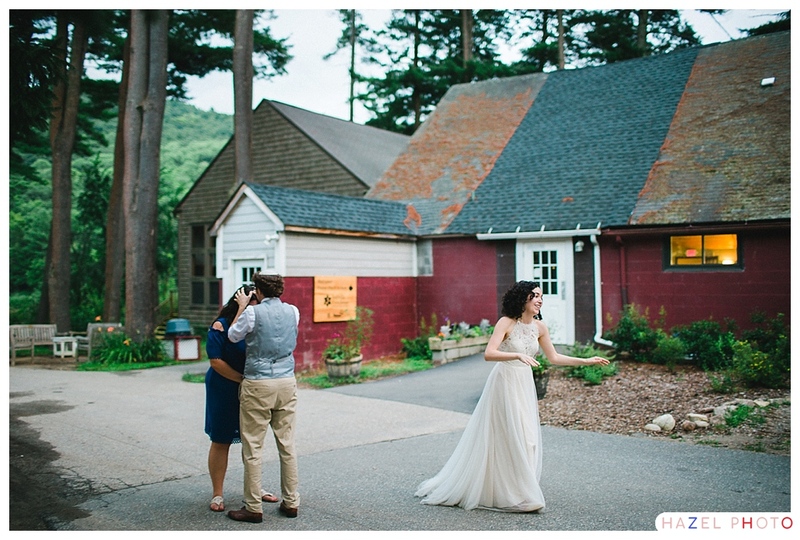 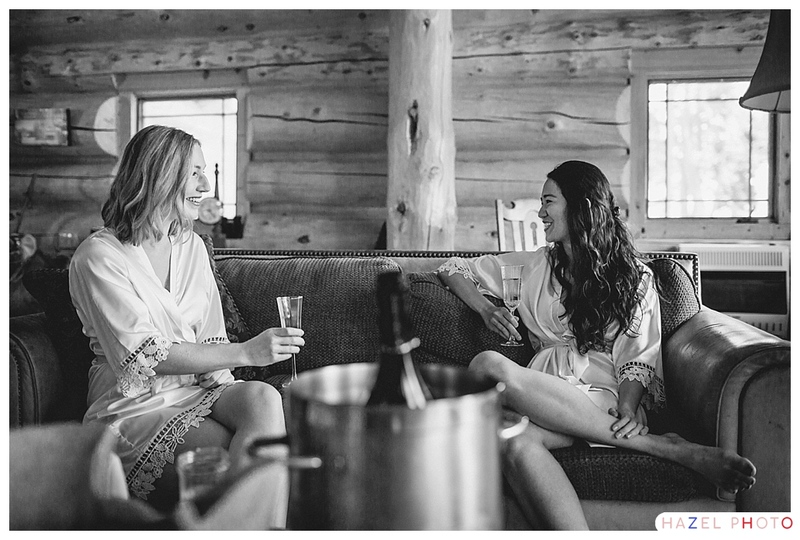 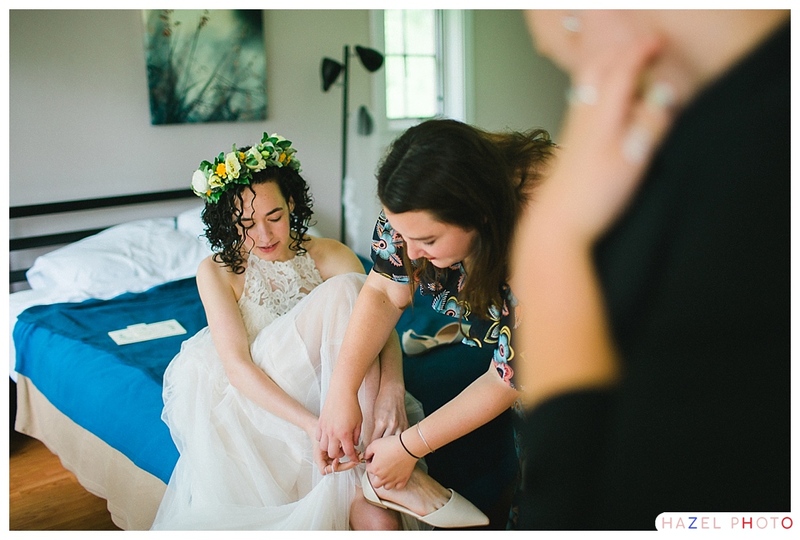 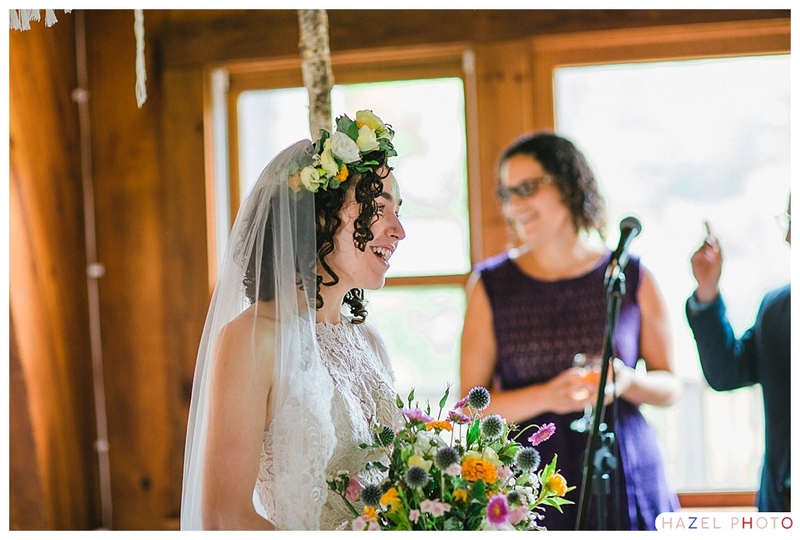 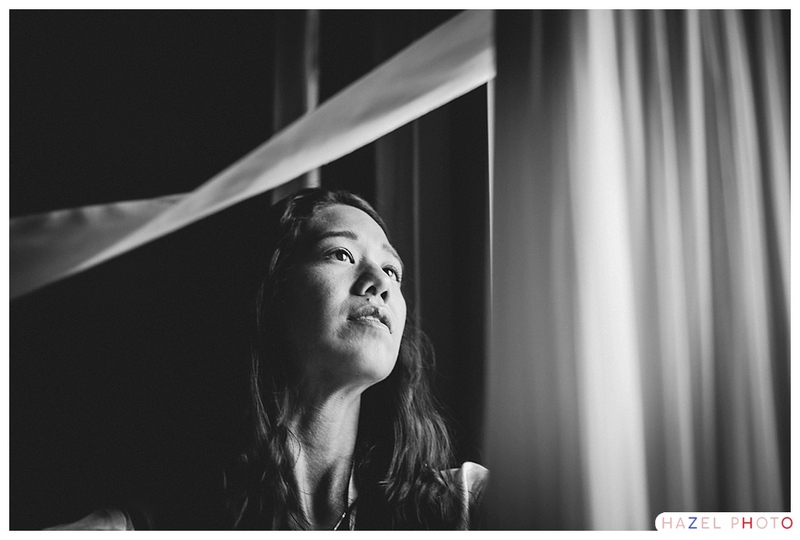 I met Rebecca in one of the cabins where a couple of her closest friends were accompanying her as she got ready. 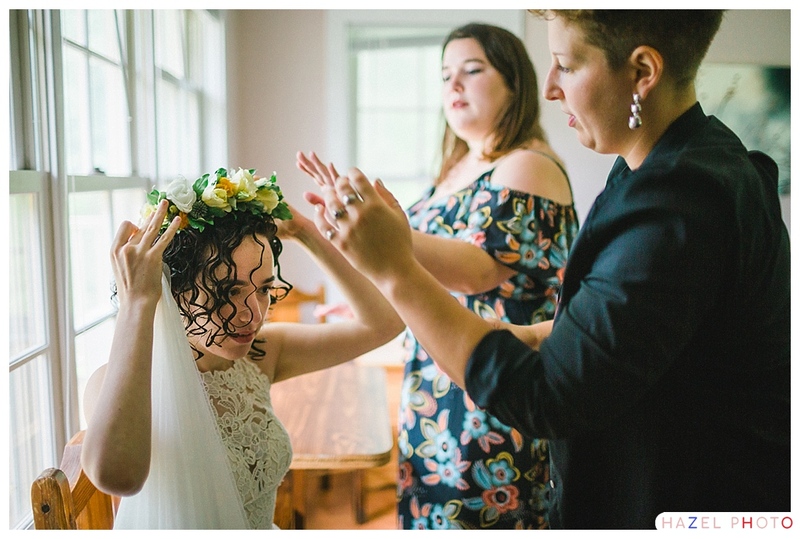 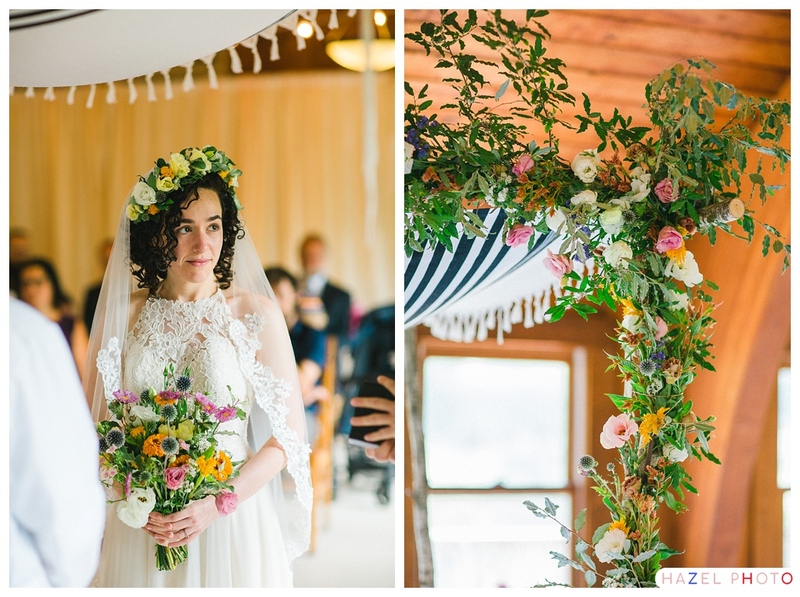 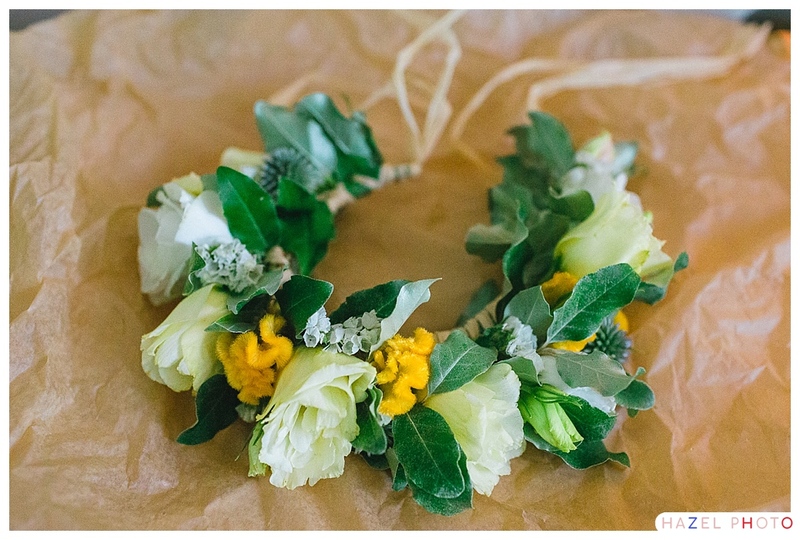 She wore a floral crown from Tiny Hearts Farm. 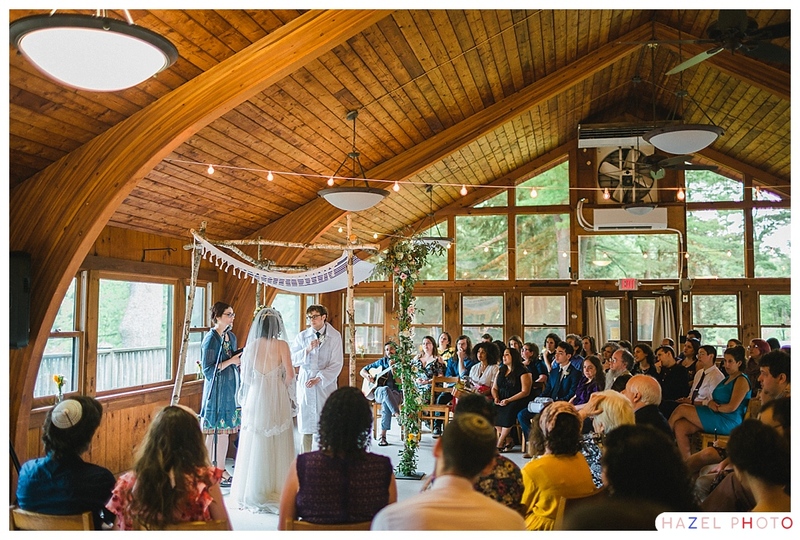 Jonah had his Tisch in the synagogue space, which is almost a greenhouse in the best possible way, just check out that wall of windows. 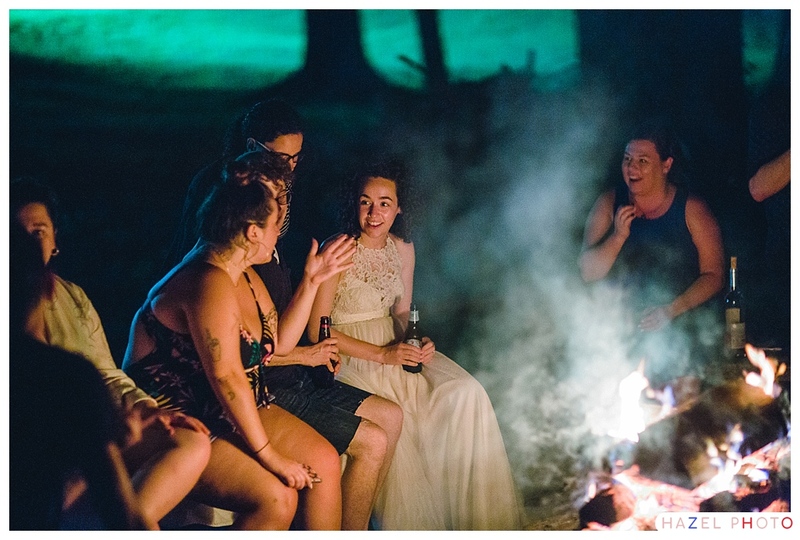 There was much singing and laughing and toasting. 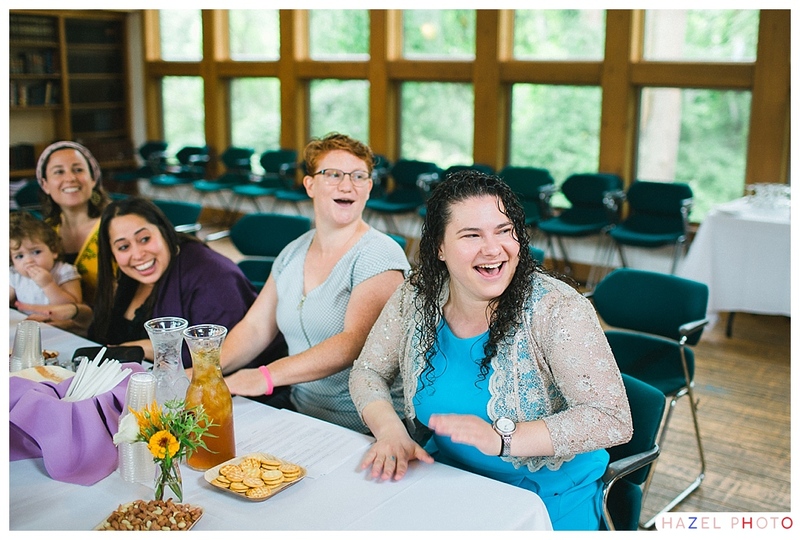 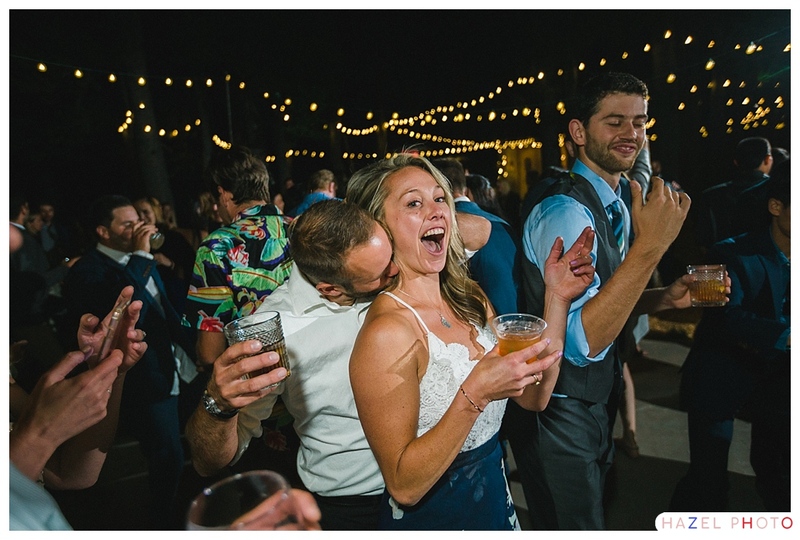 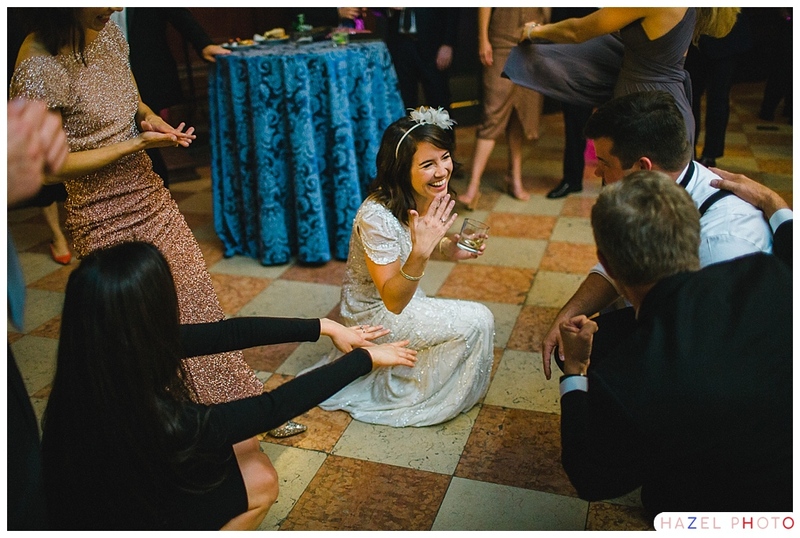 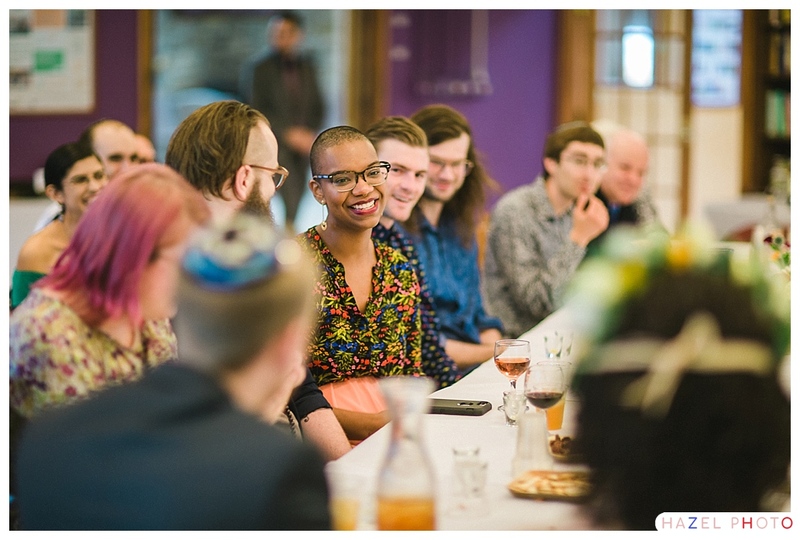 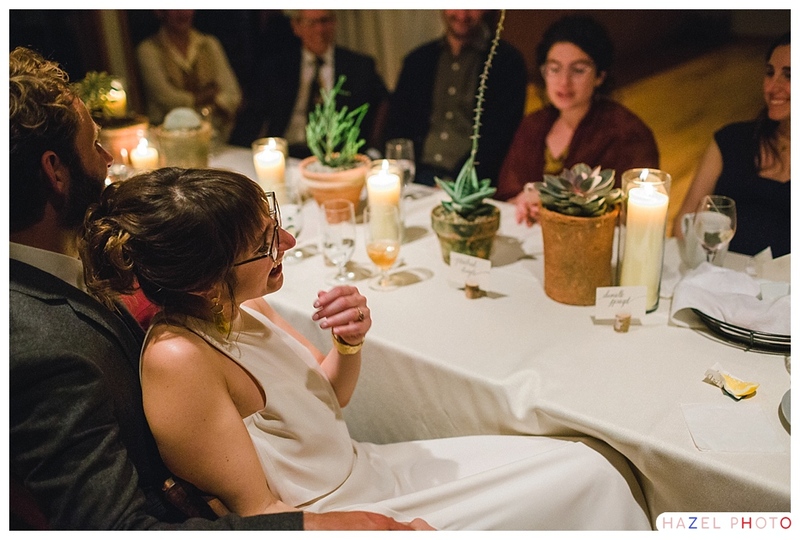 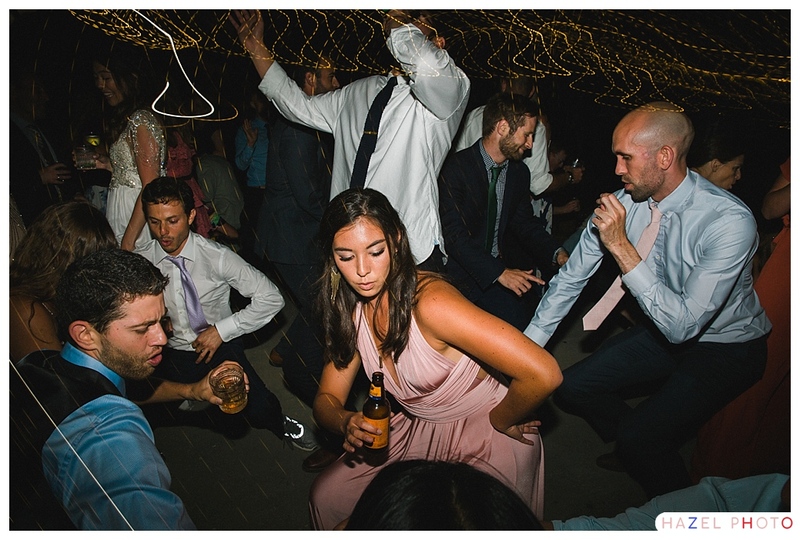 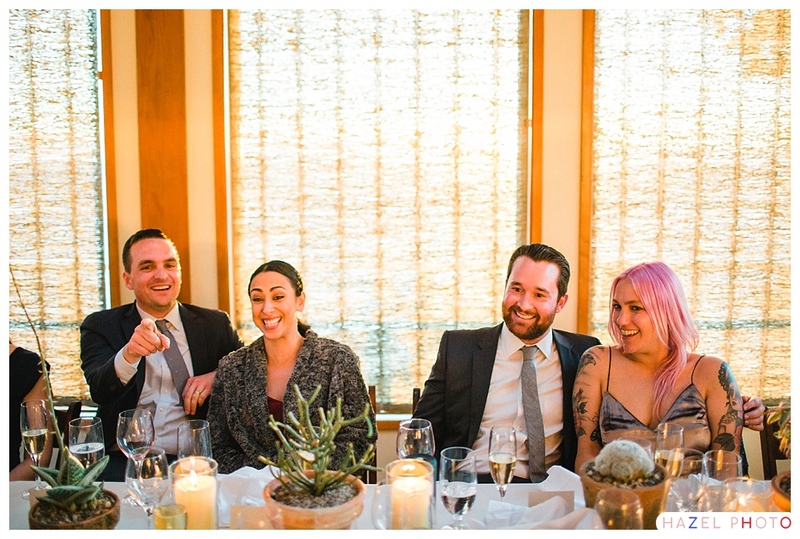 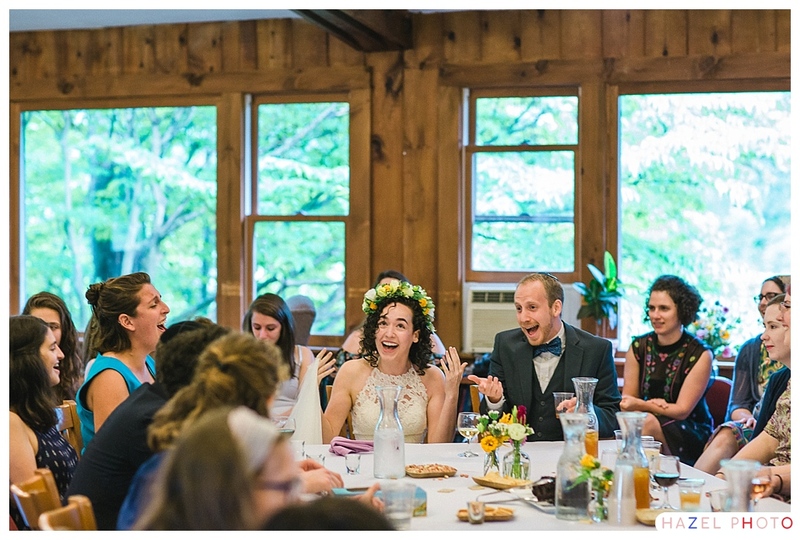 One of my favorite moments was when it got so raucous that the table was shaking, and somebody had to secure the refreshments so they didn’t tumble over. 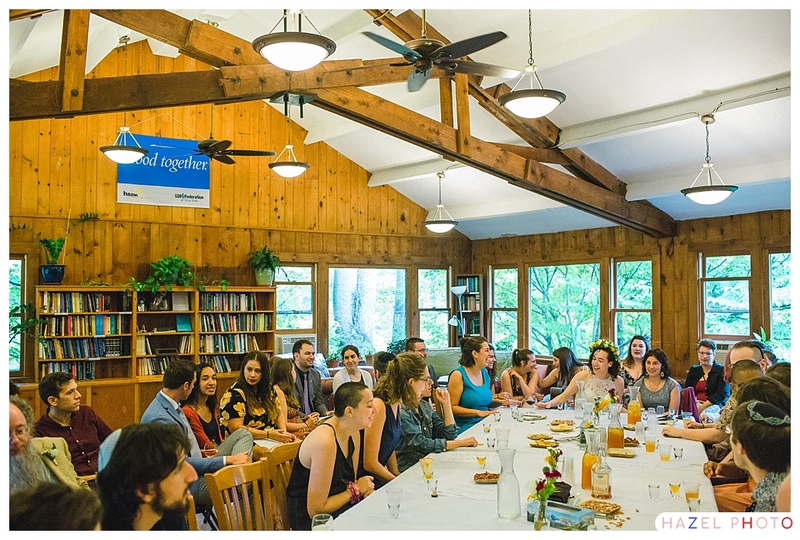 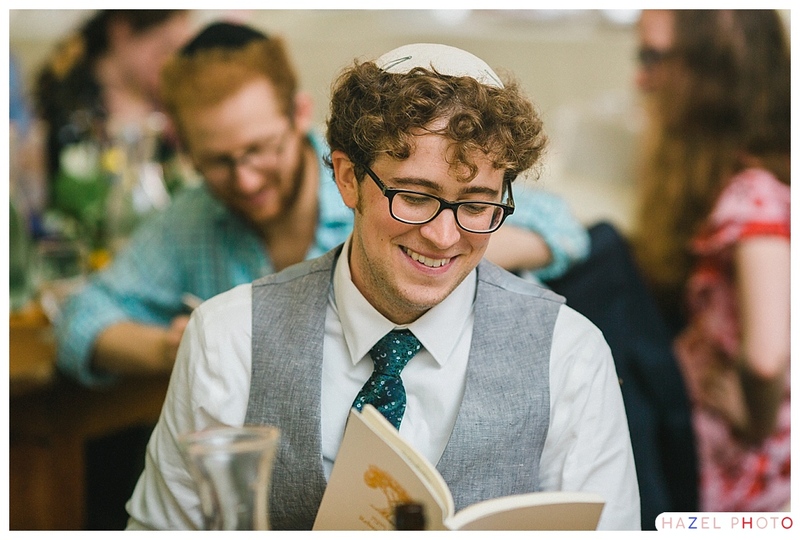 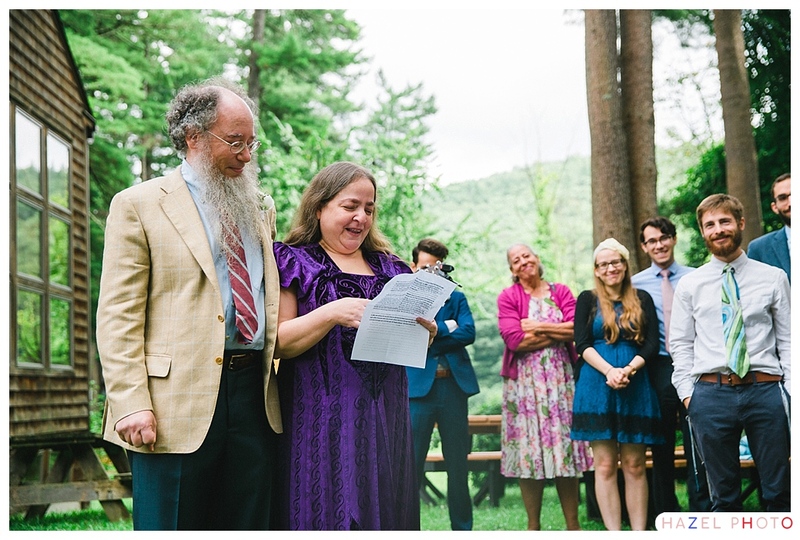 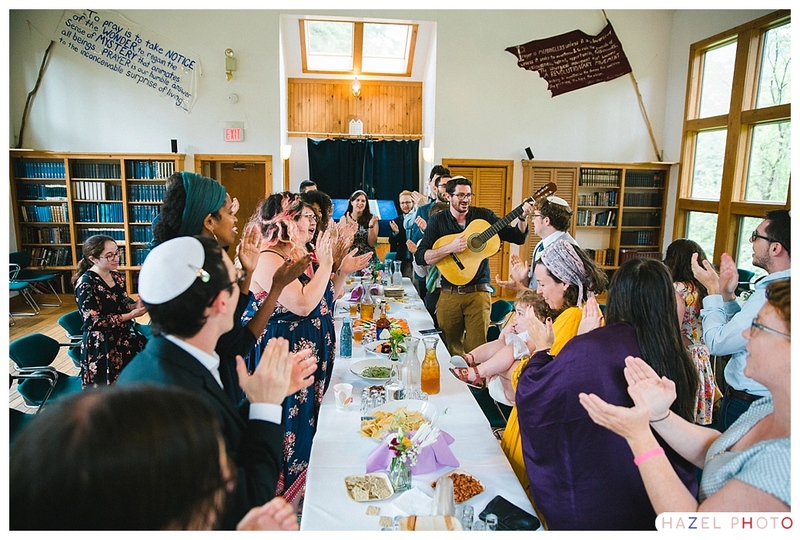 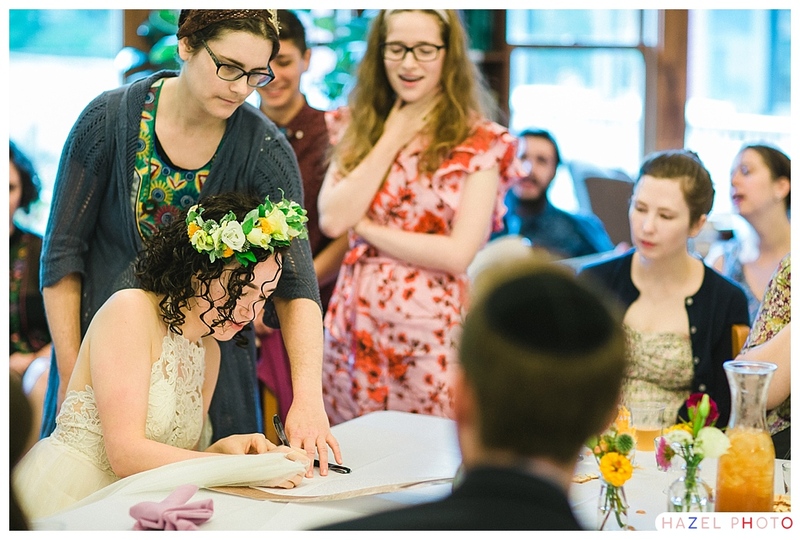 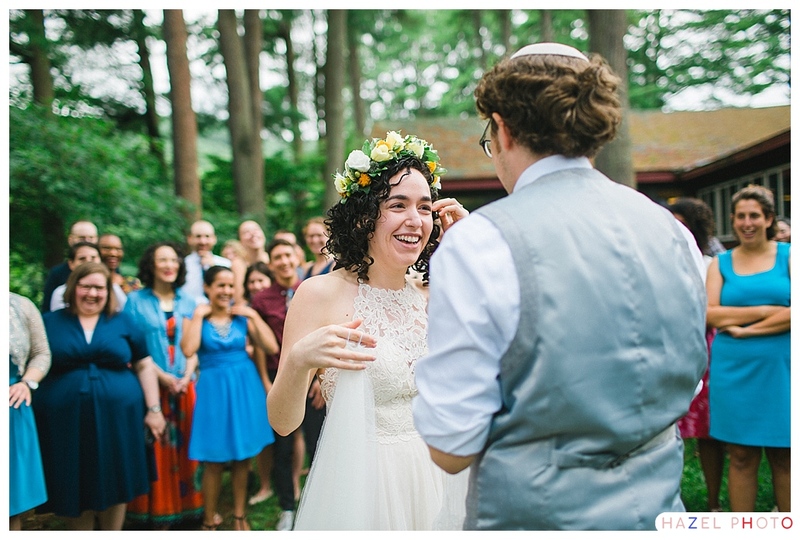 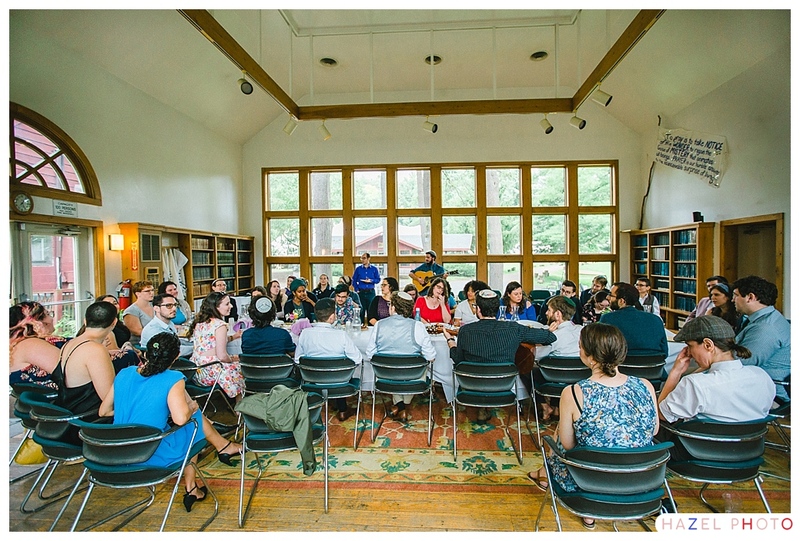 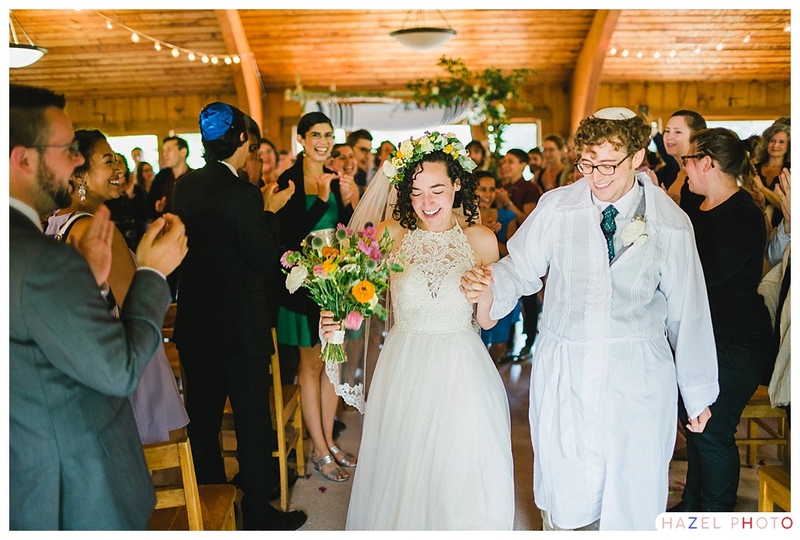 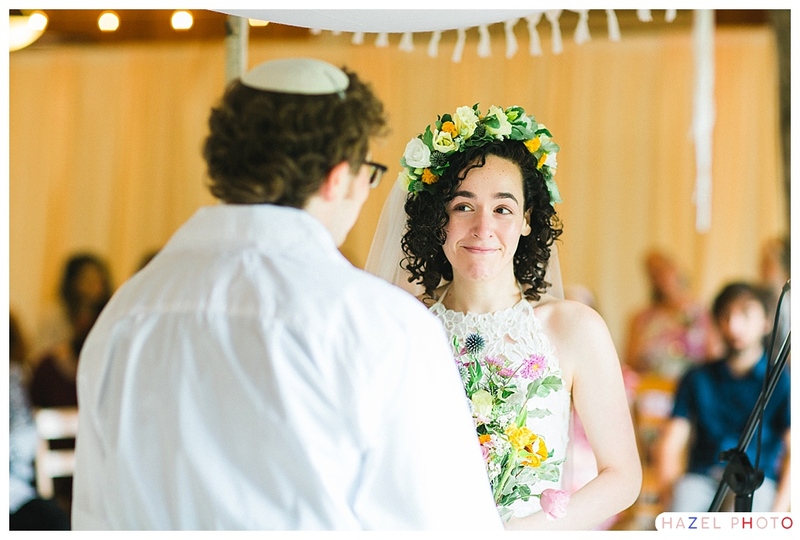 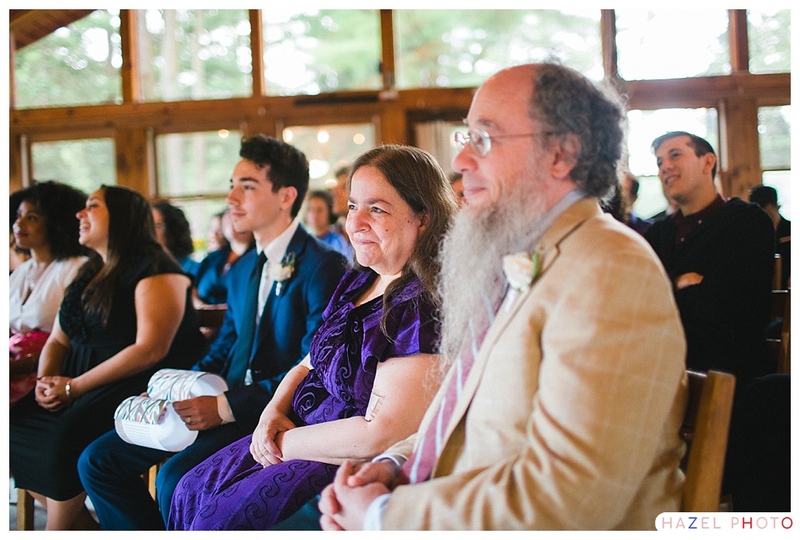 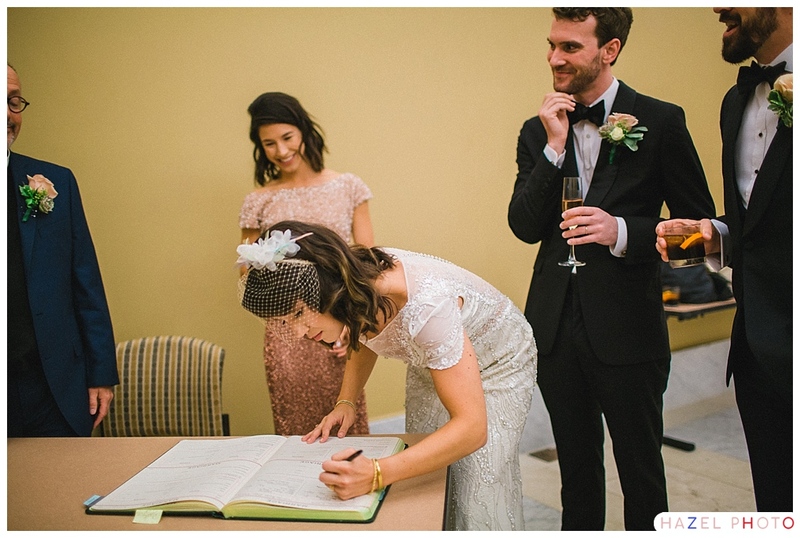 Rebecca had her Tisch in the library, where she signed her half of the Ketubah. 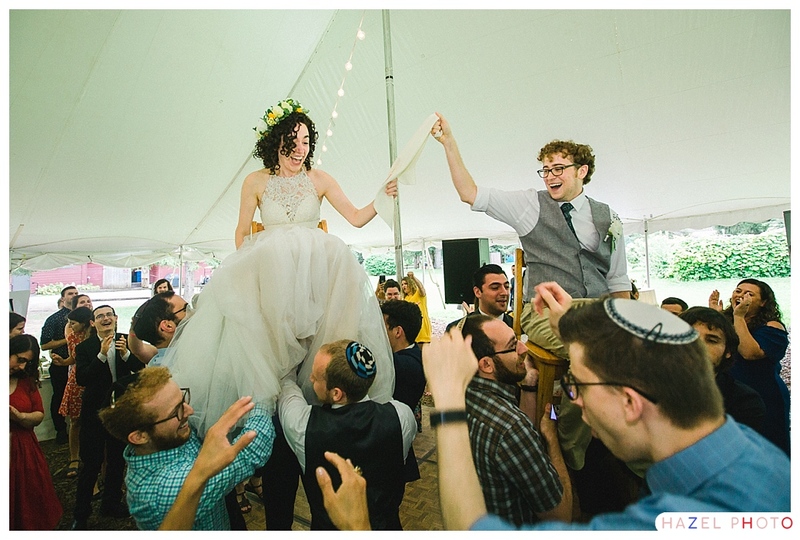 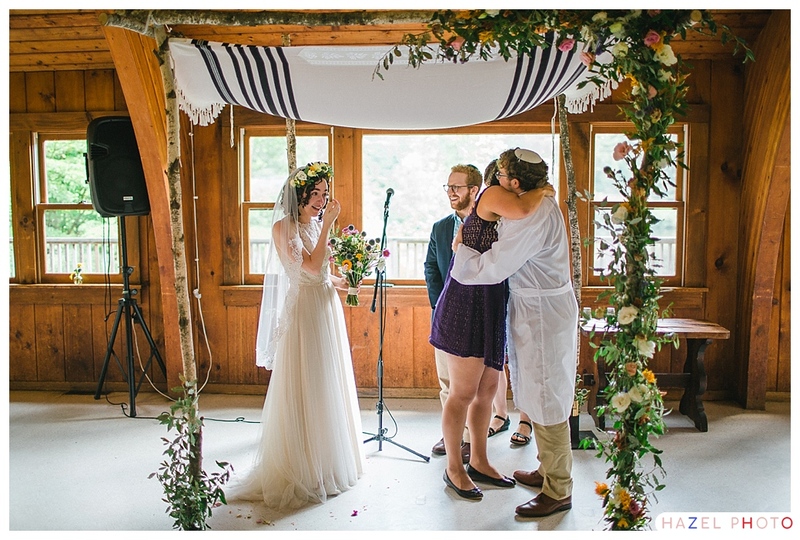 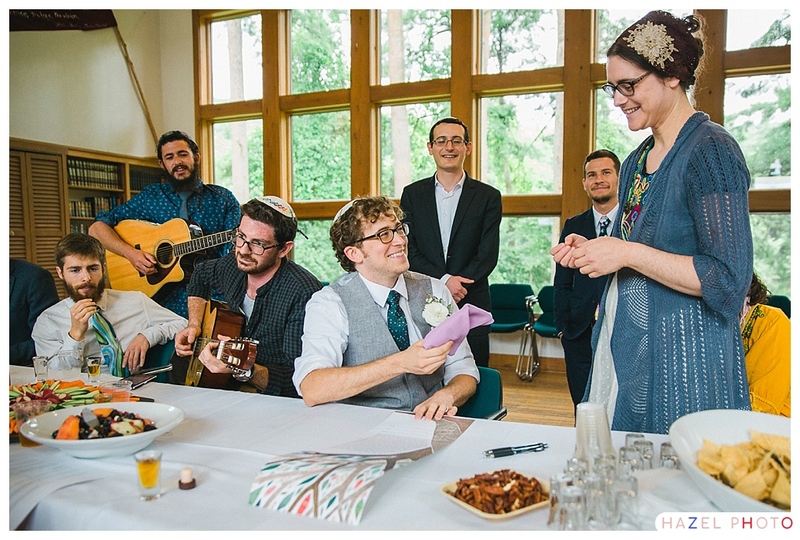 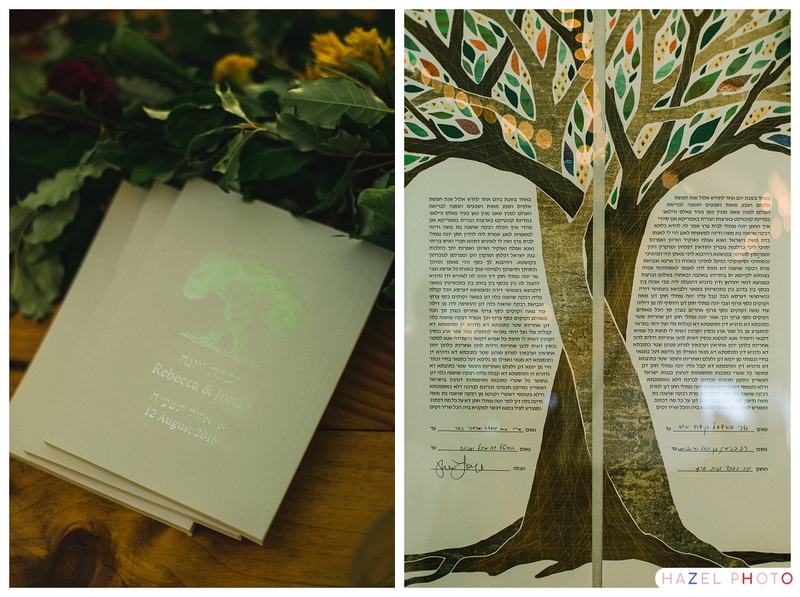 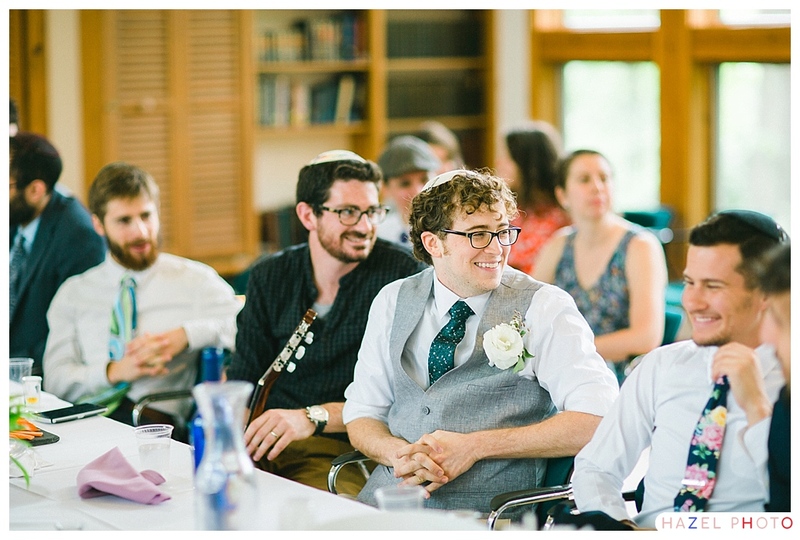 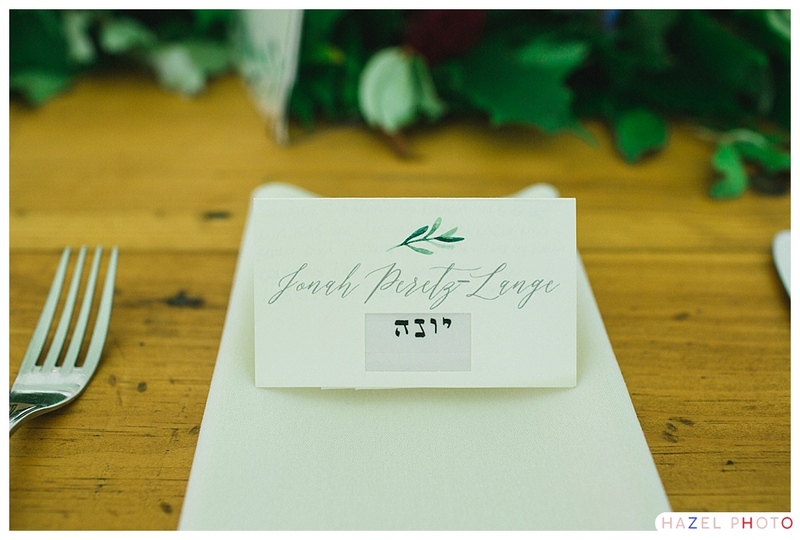 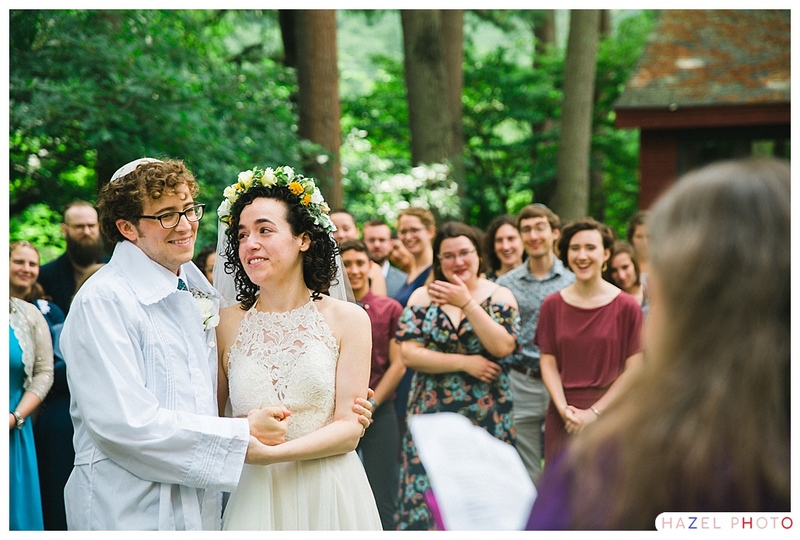 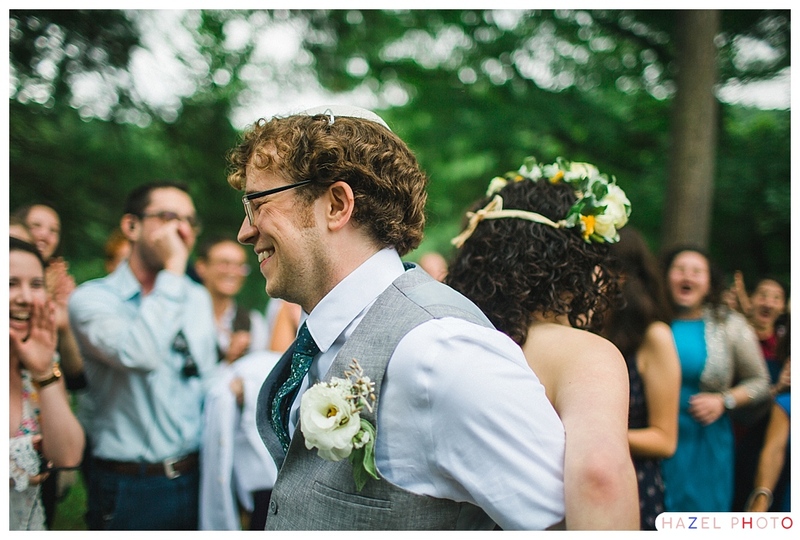 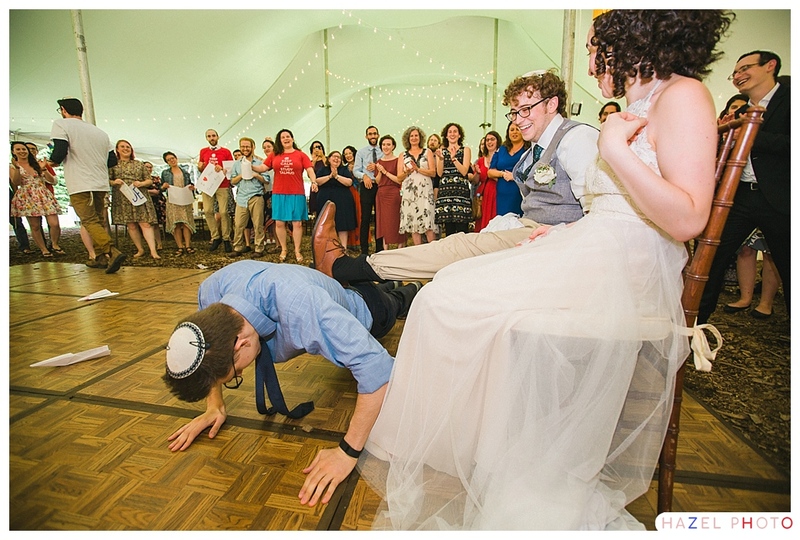 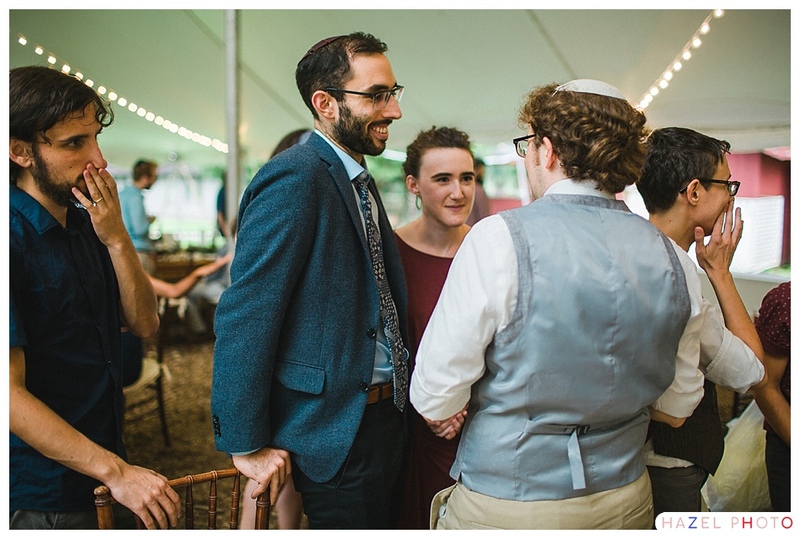 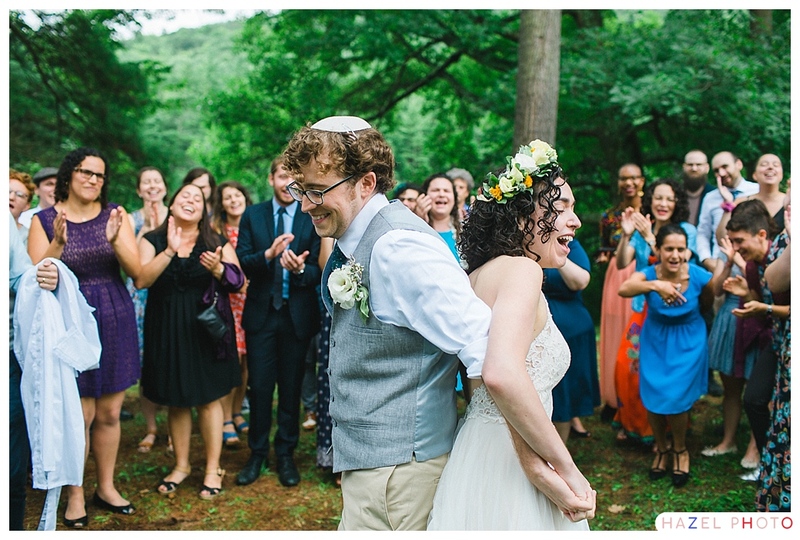 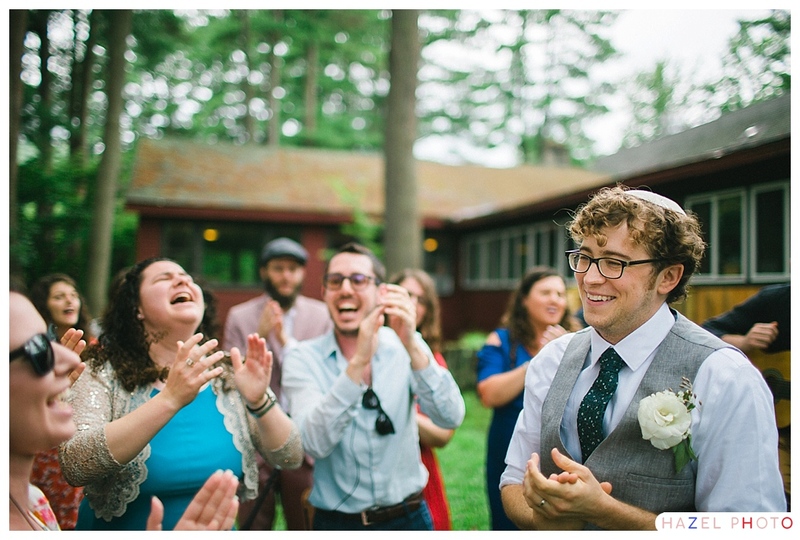 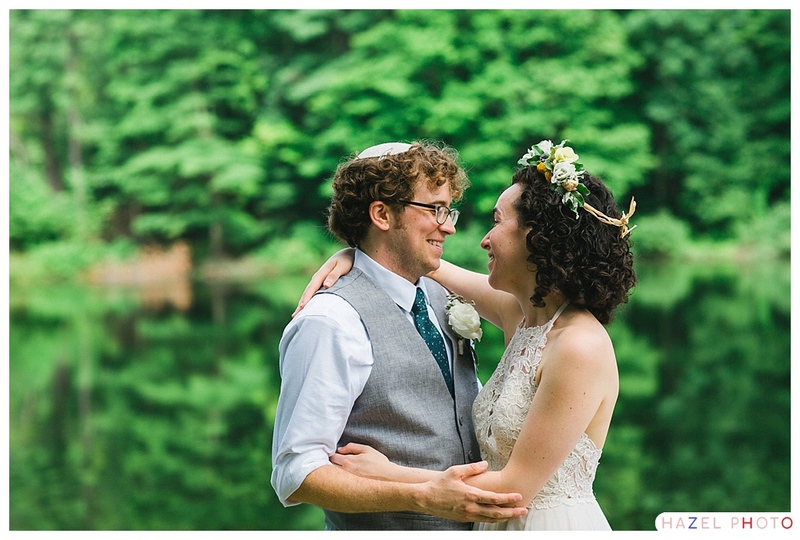 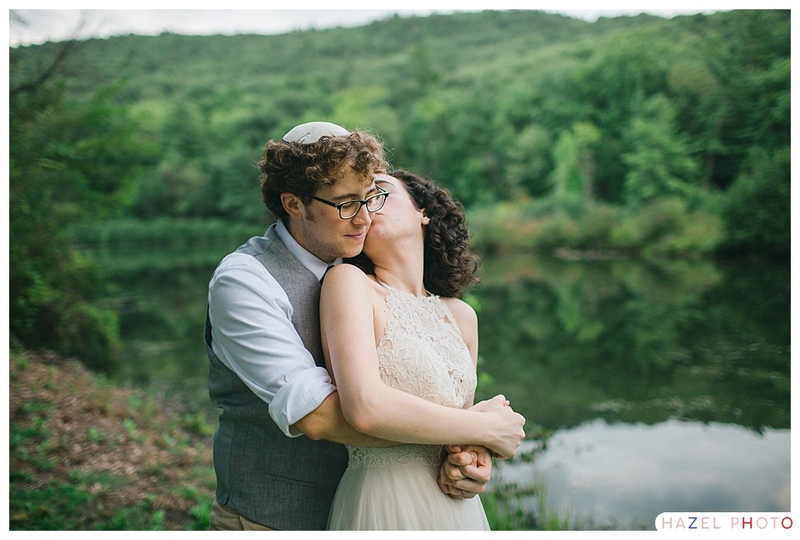 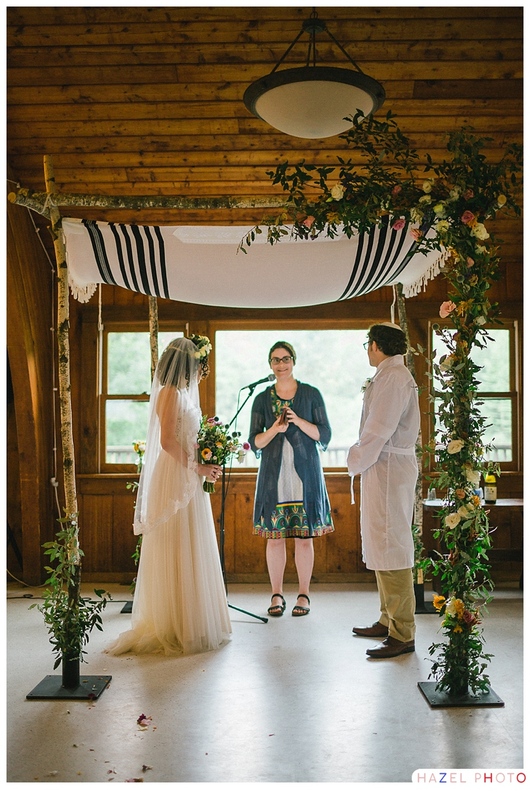 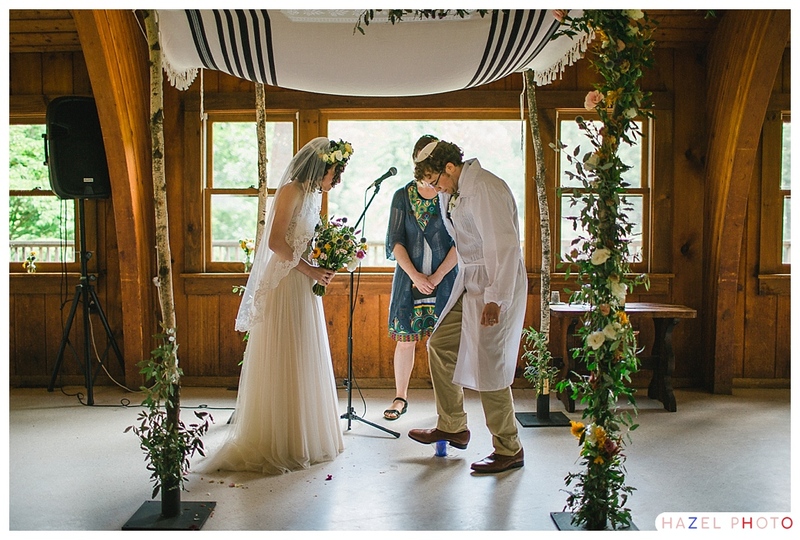 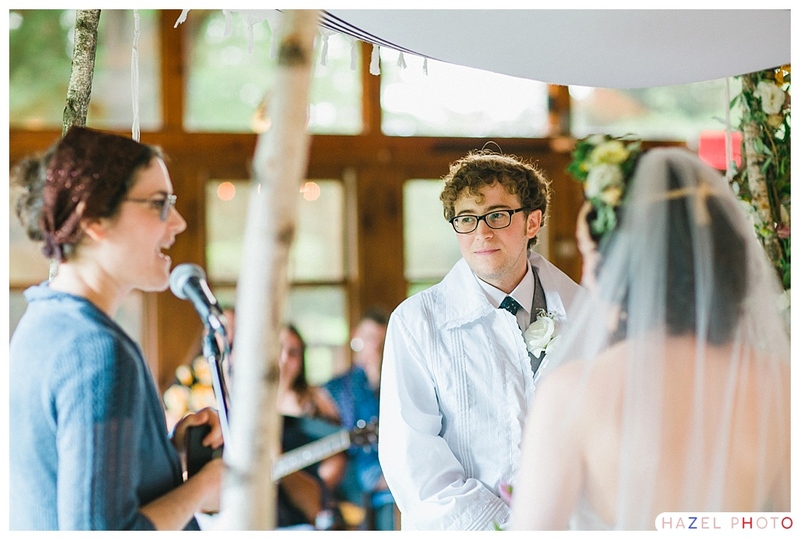 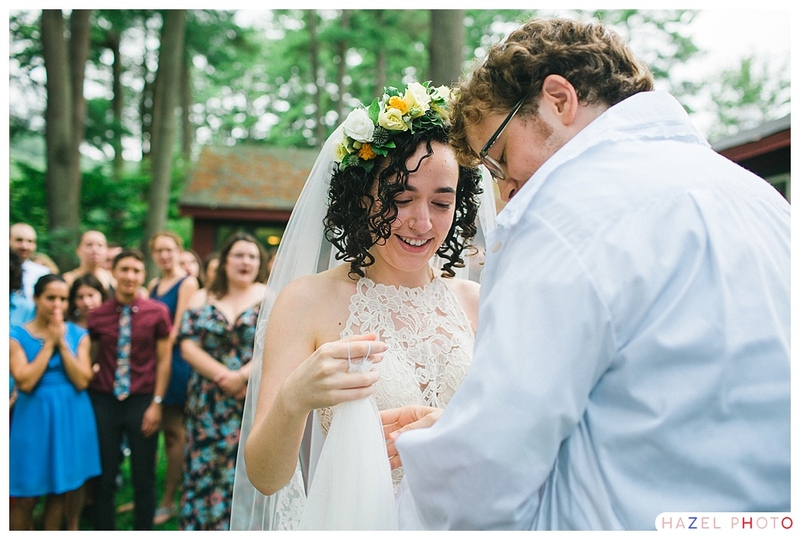 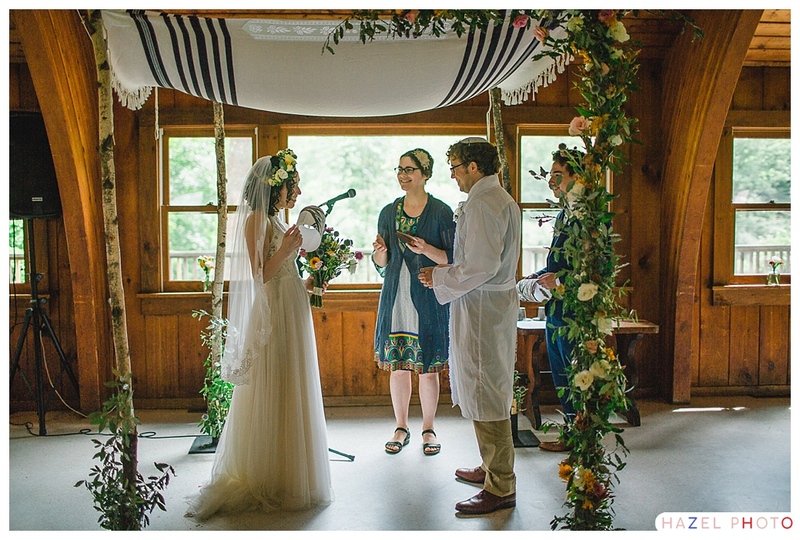 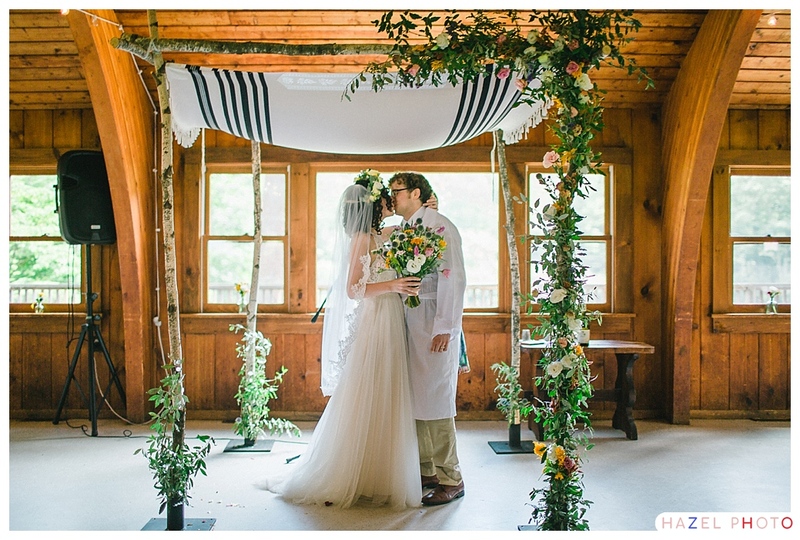 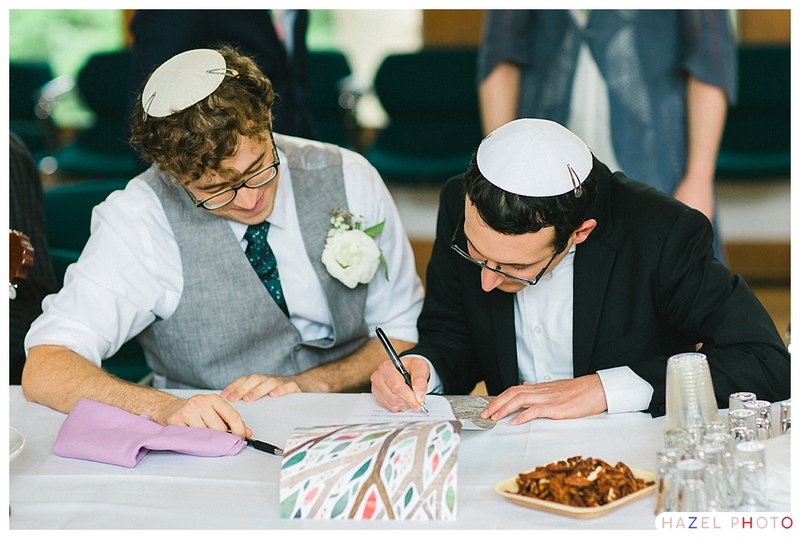 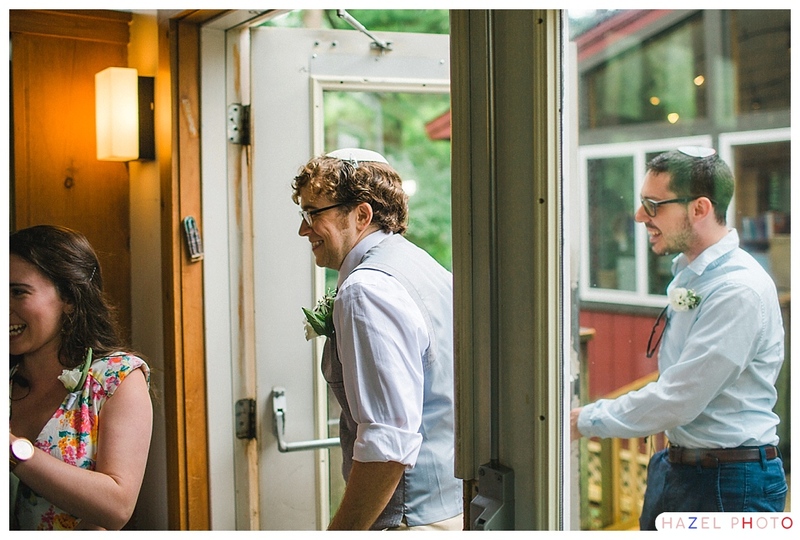 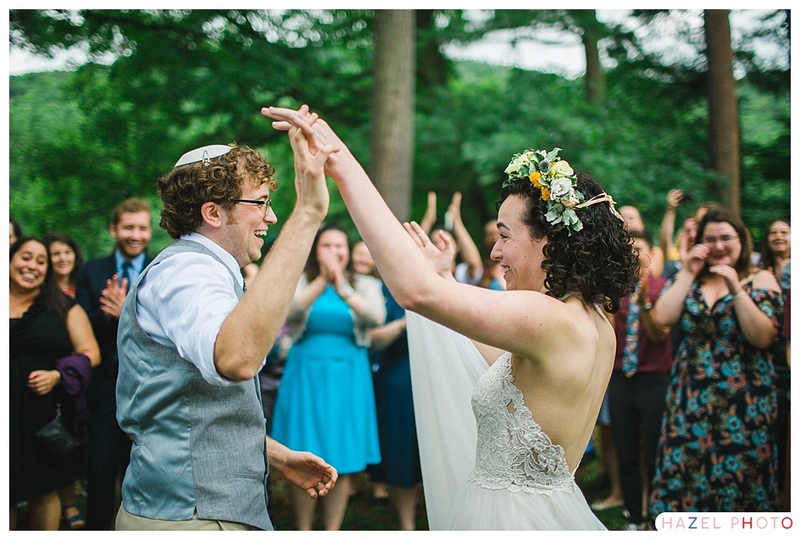 Jonah signed his half and they were joined together under the chuppah. 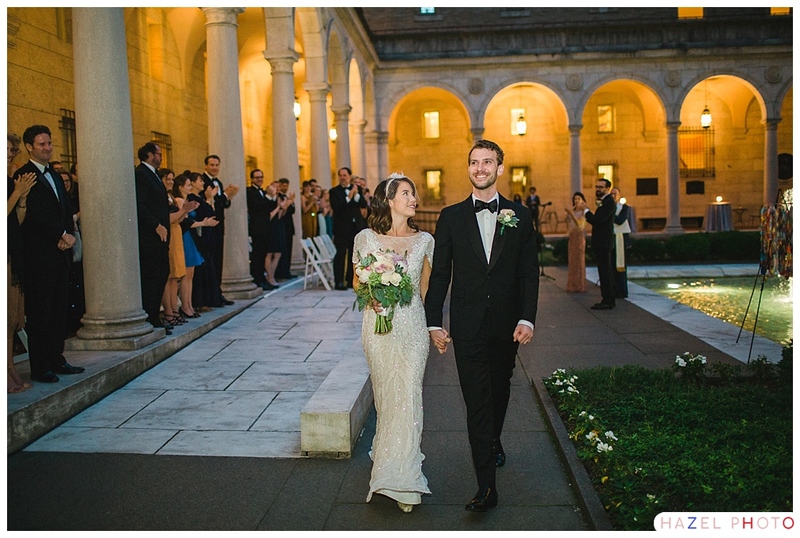 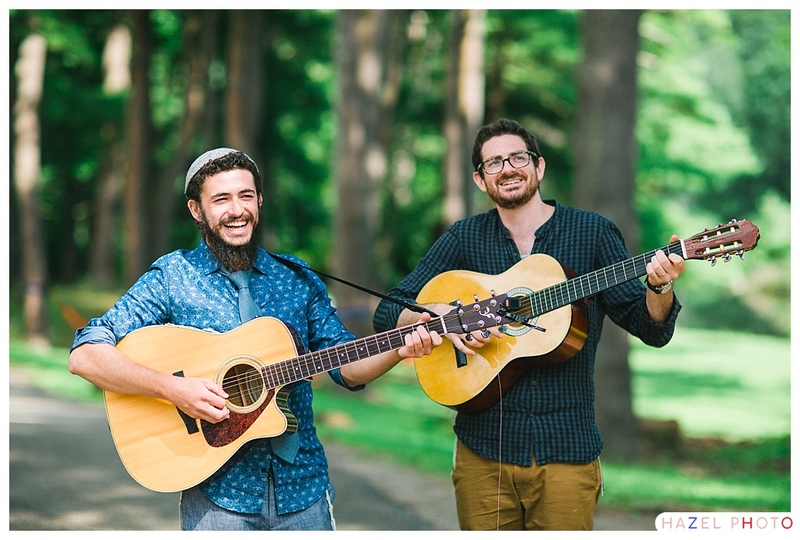 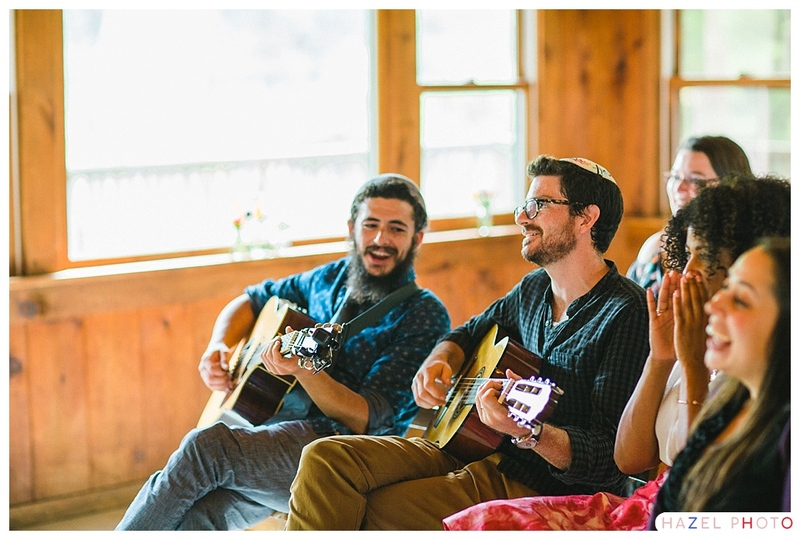 From their Tisch’s the two were lead out onto the lawn to the sounds of a chorus of voices and a few guitars. 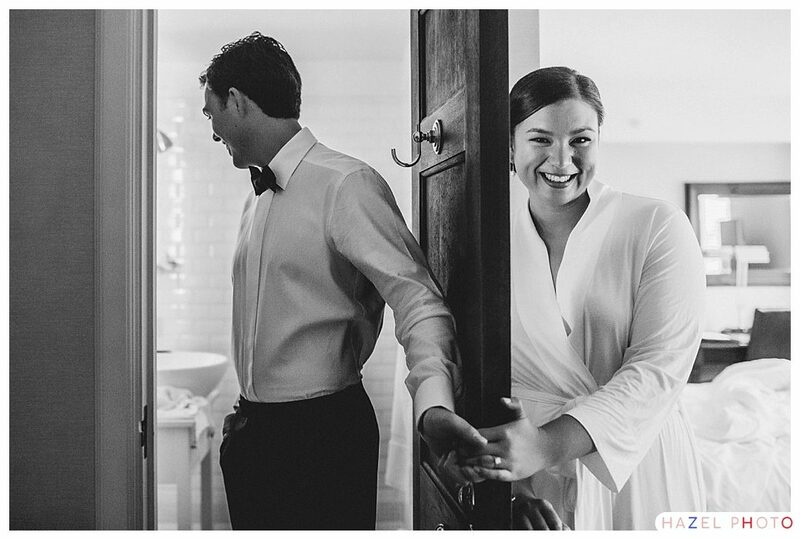 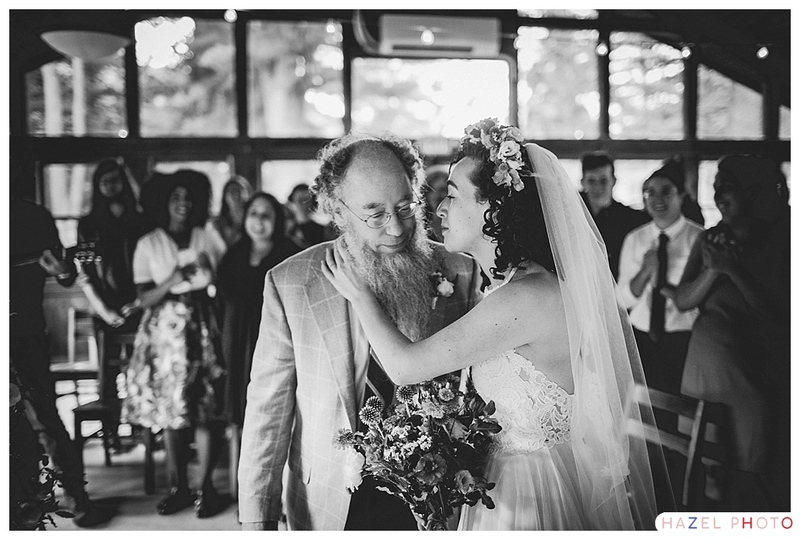 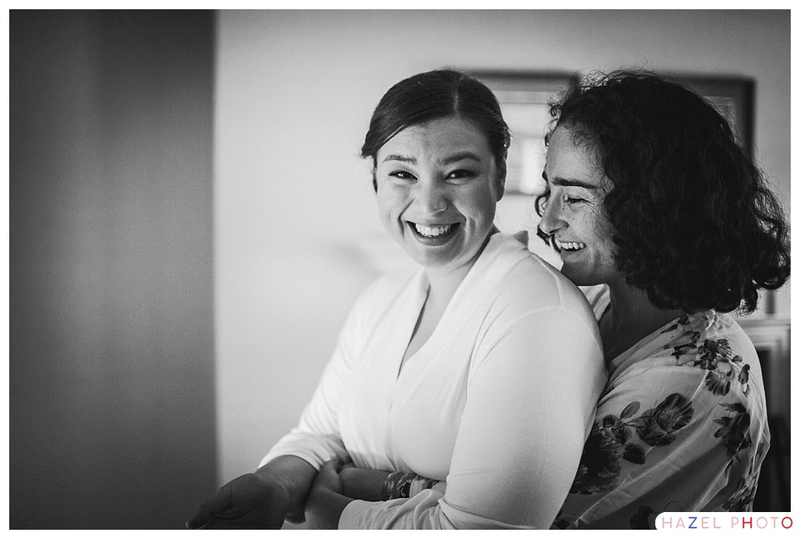 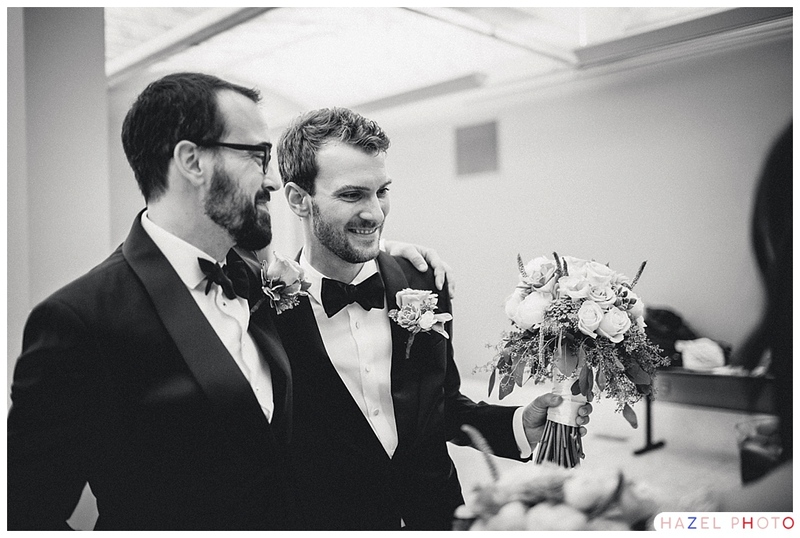 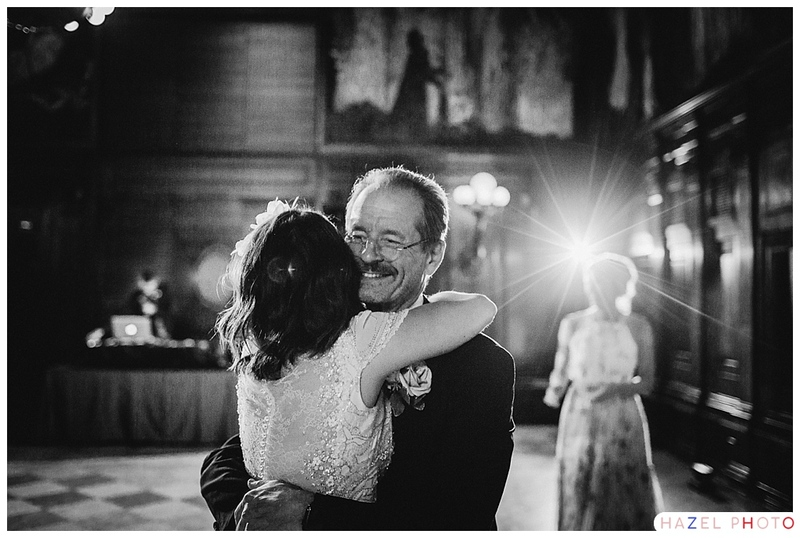 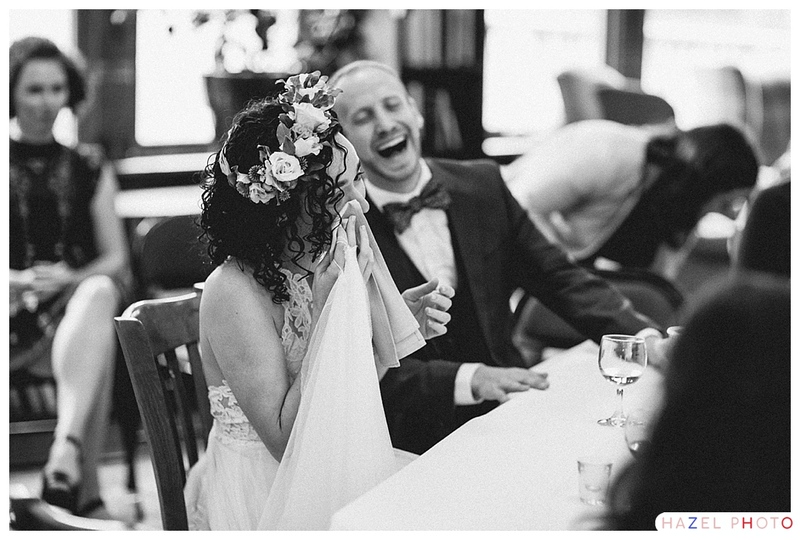 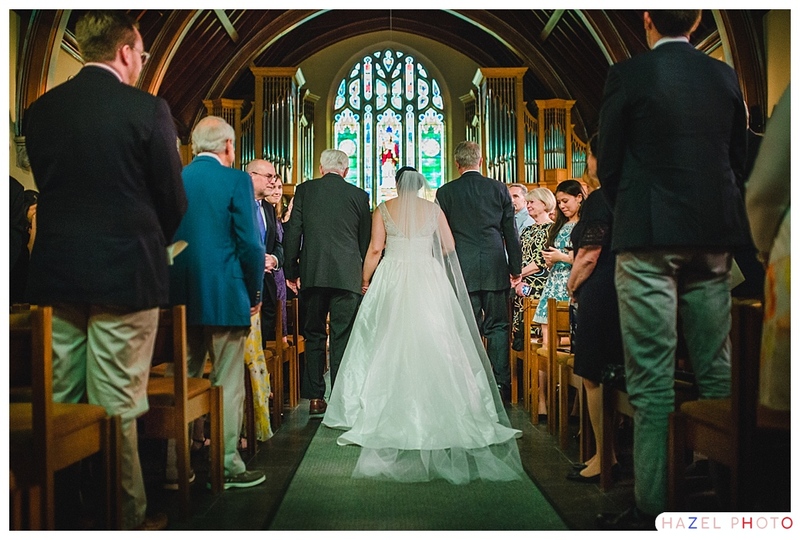 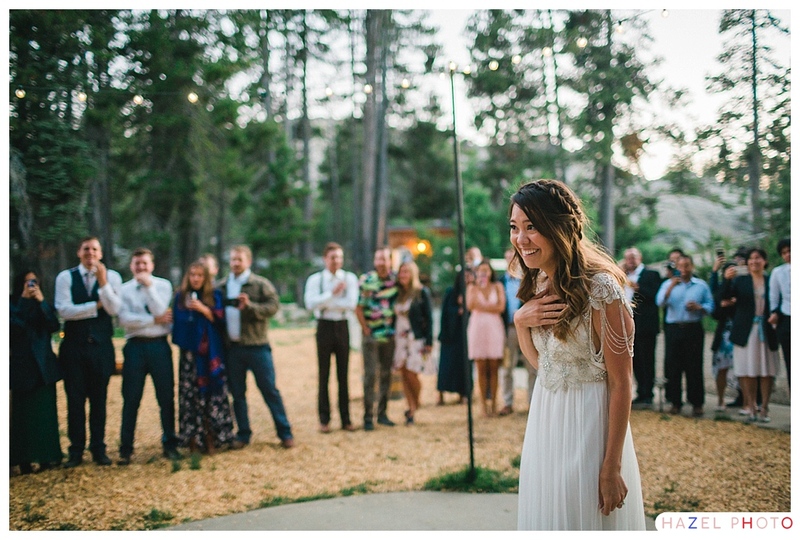 I love the moment of elation when they turned around and saw each other for the first time on their wedding day. 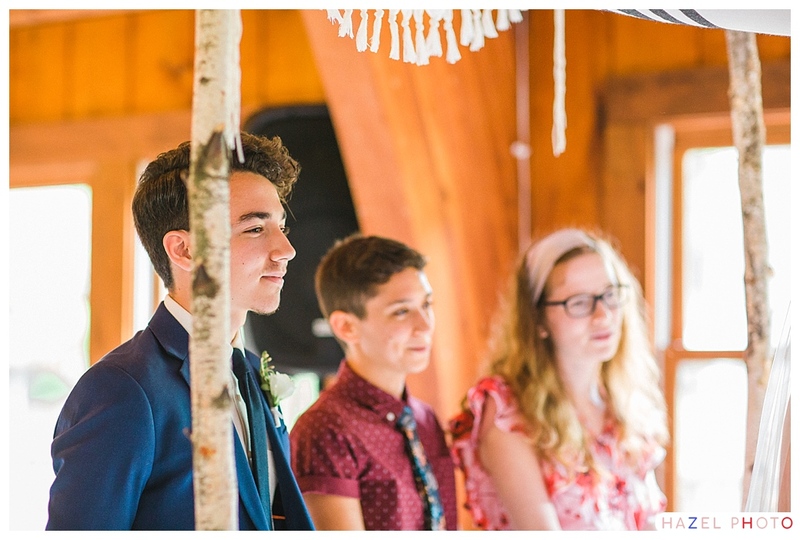 The day kept unfolding. 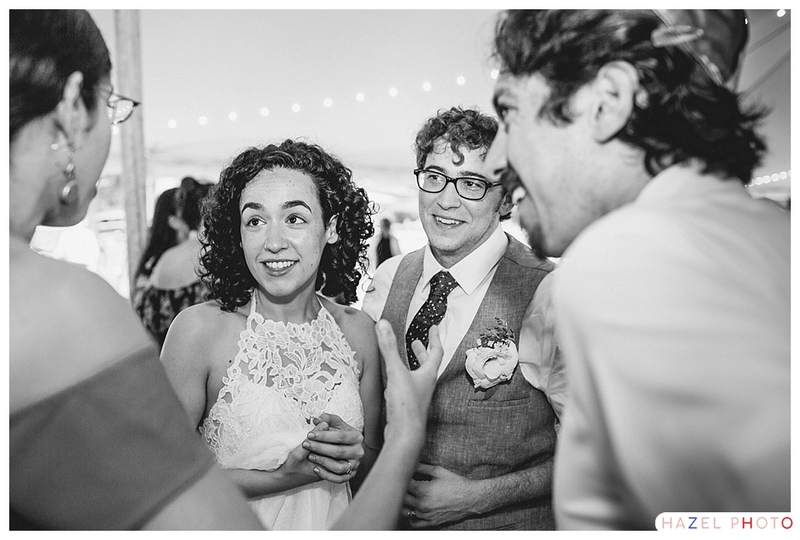 The Schtick was particularly joyous and funny. 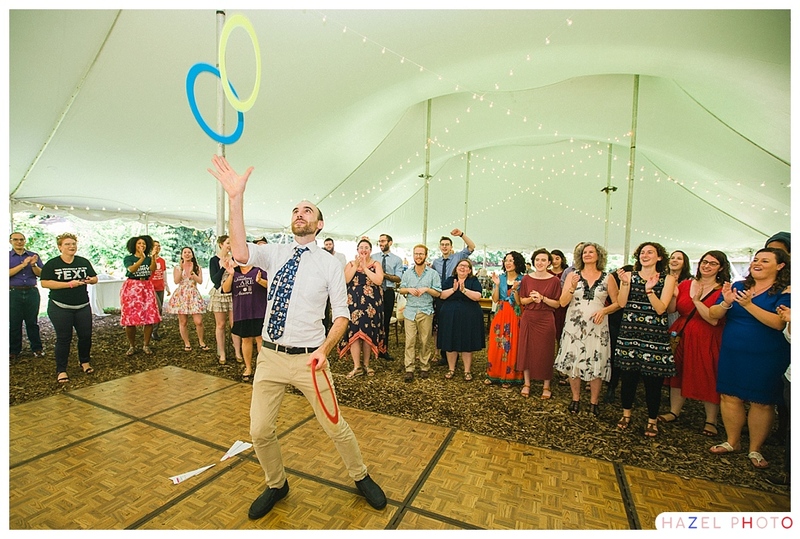 Acrobatics, paper airplanes, juggling, reading, dancing, push ups. 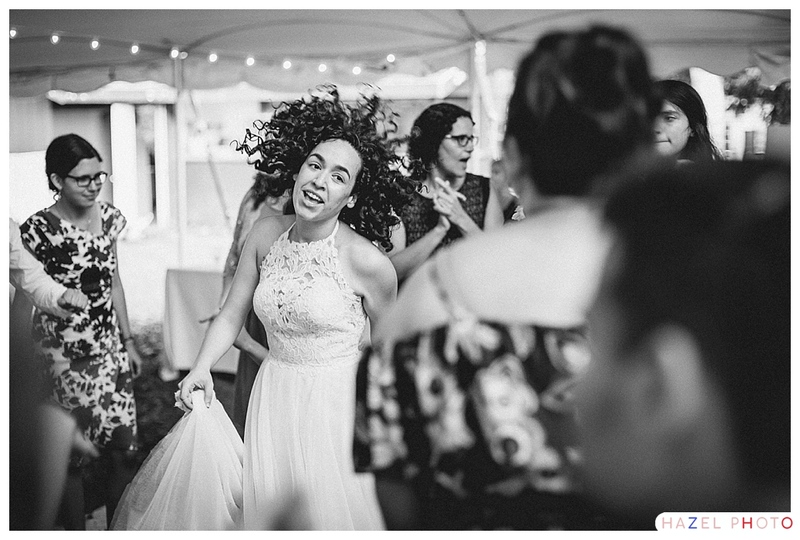 It had it all. 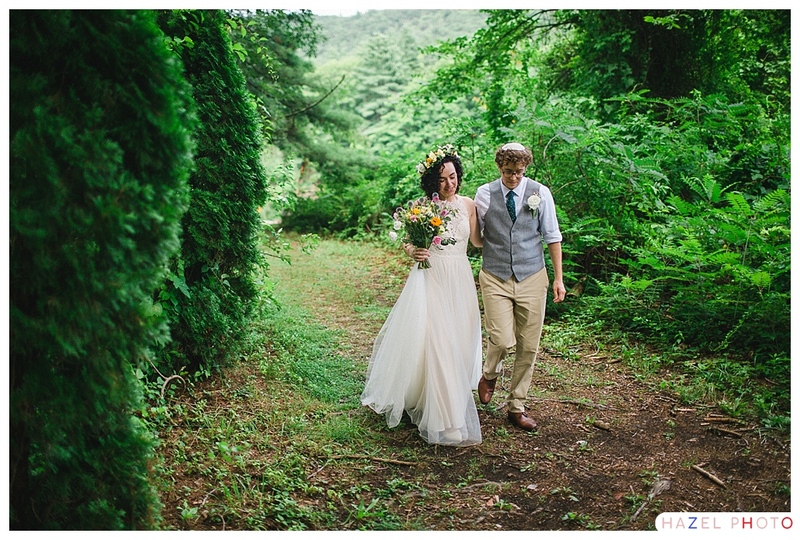 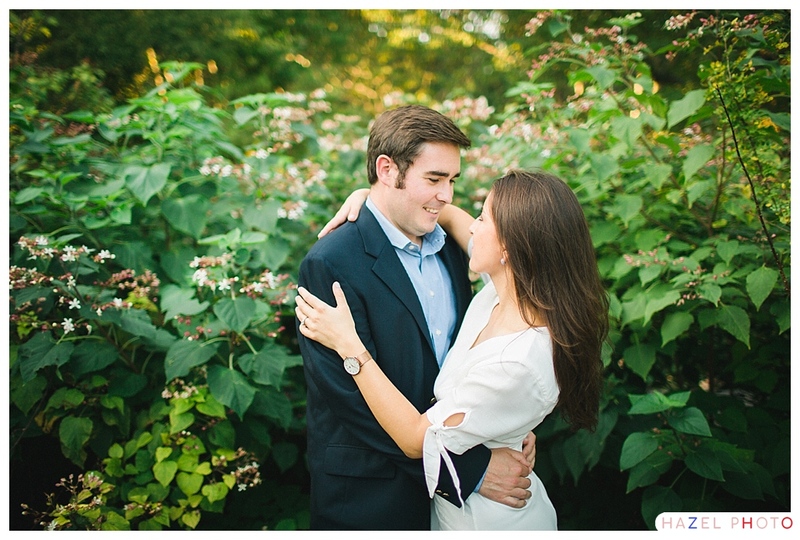 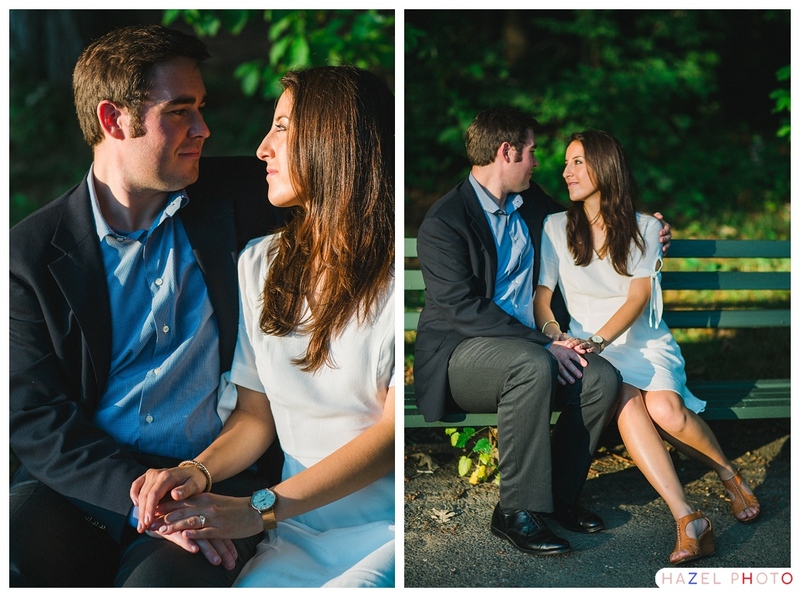 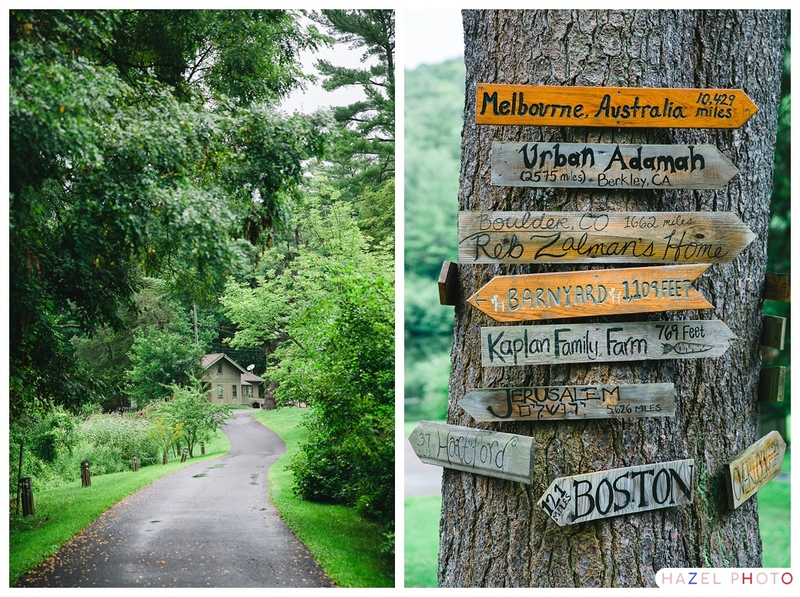 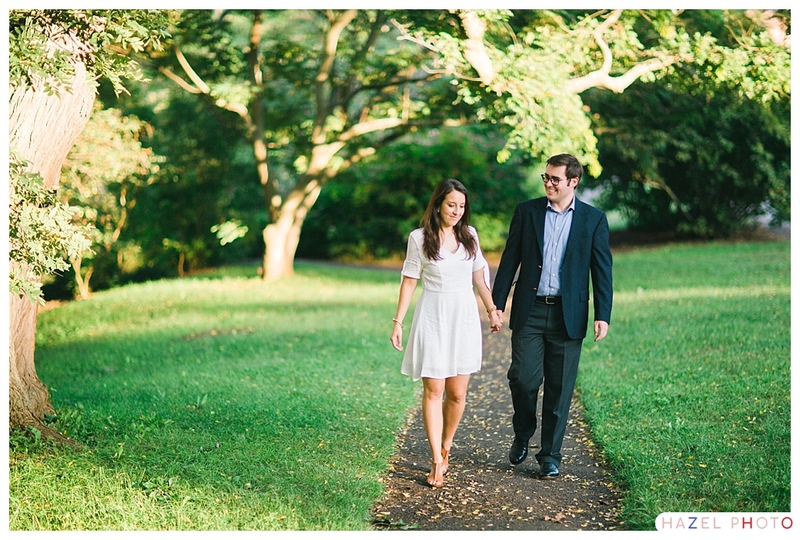 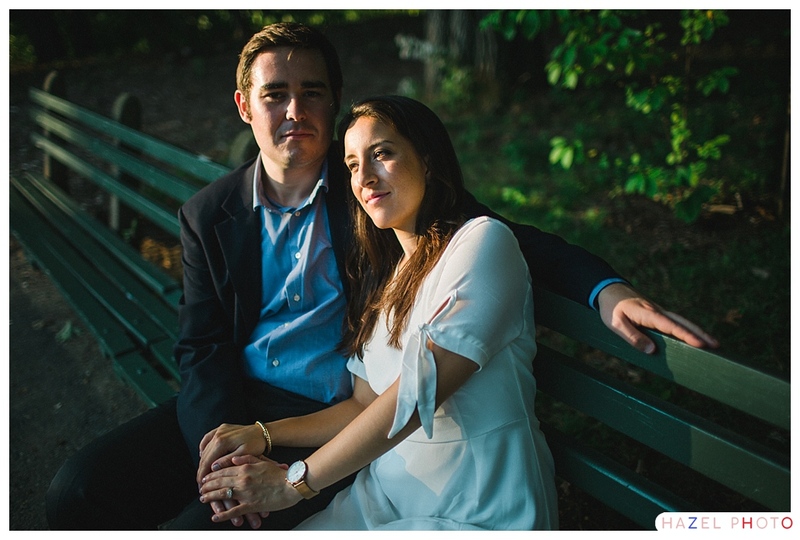 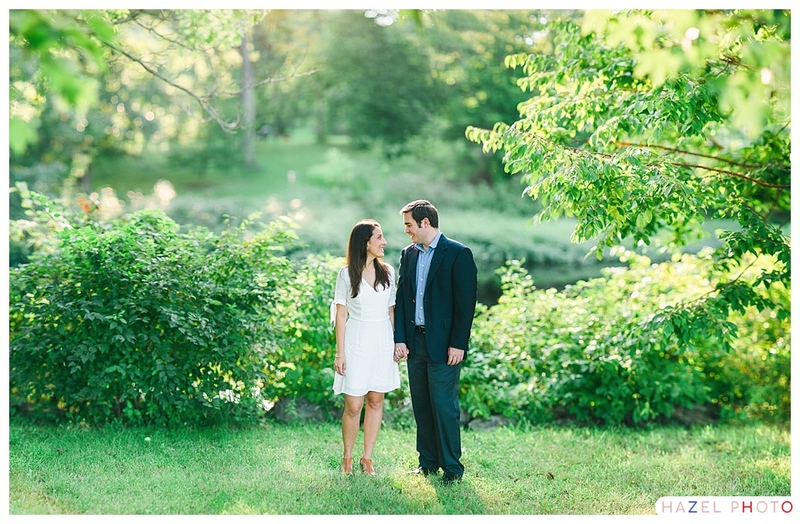 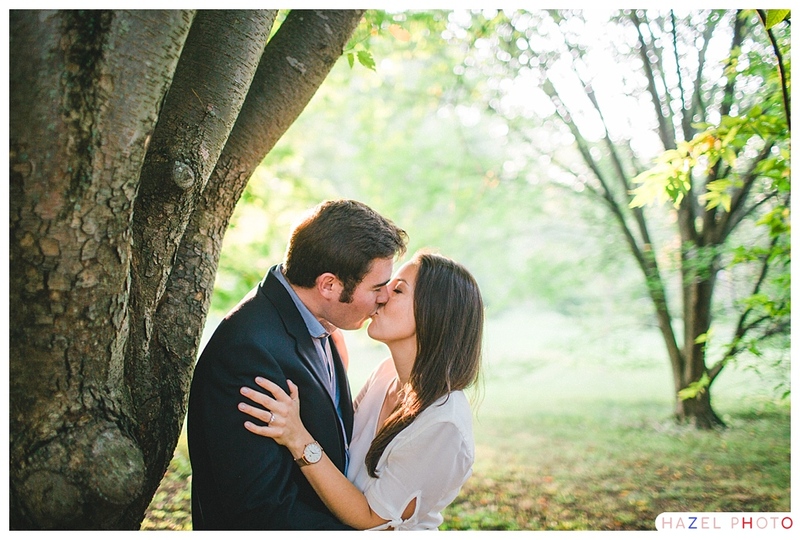 Few places in Boston are quite so lovely for engagement photos as Arnold Arboretum. 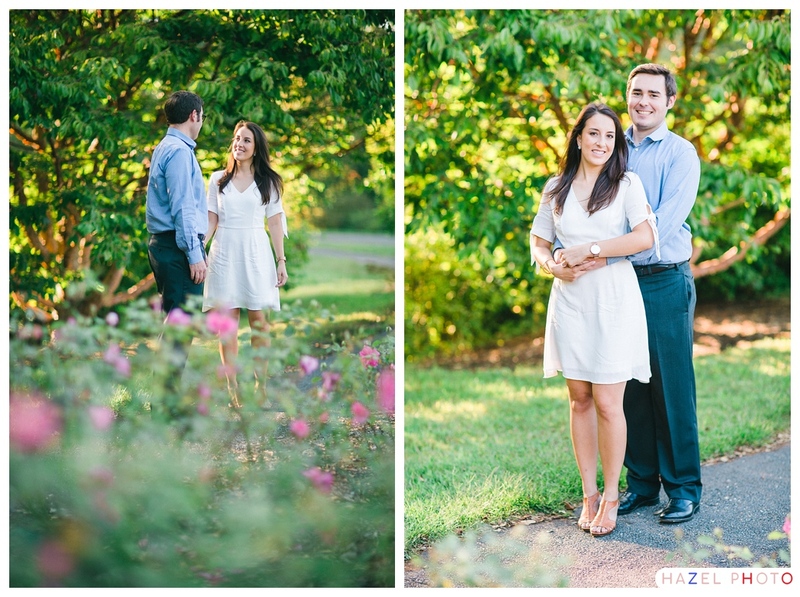 We found some glorious light on this lovely, temperate, September day. 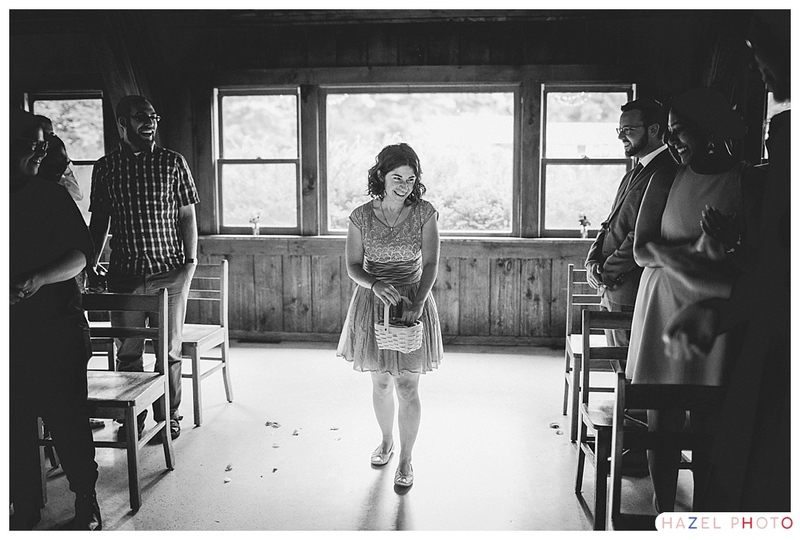 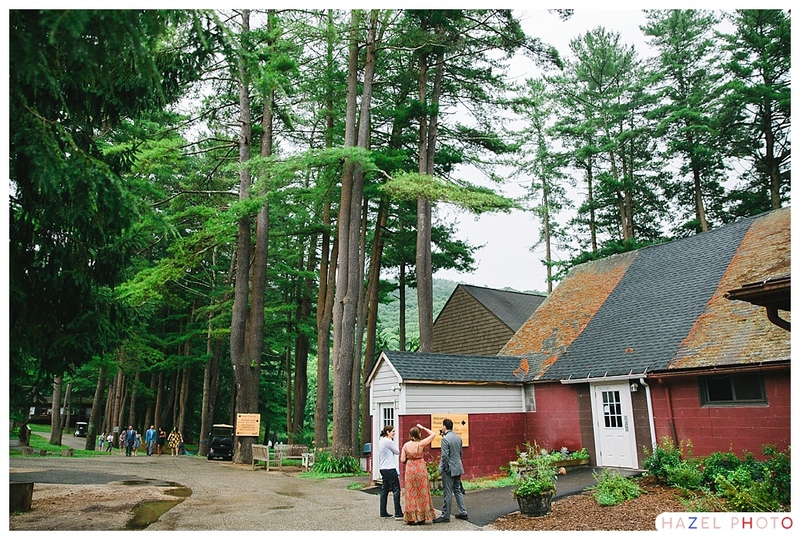 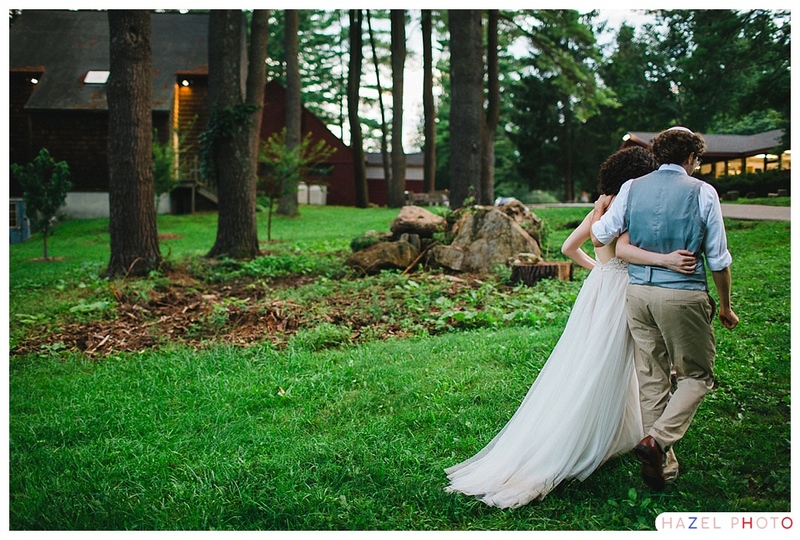 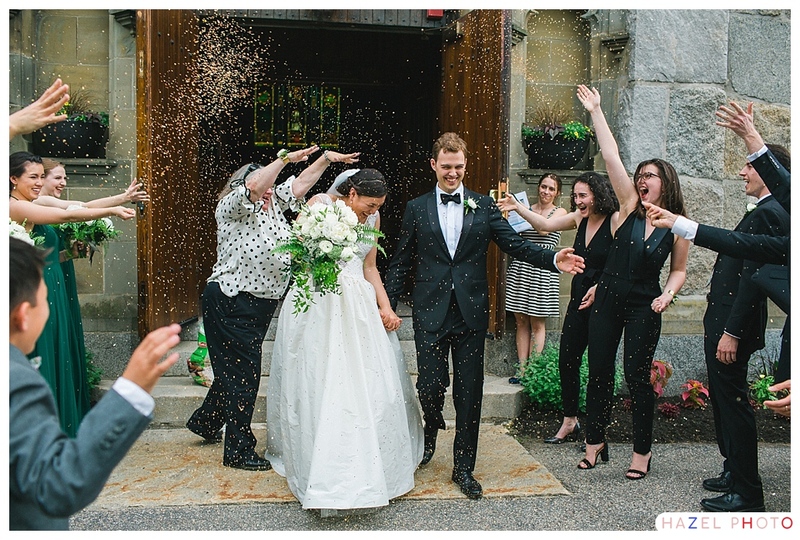 Fast forward to their wedding at the Thompson Inn in New Hampsire. 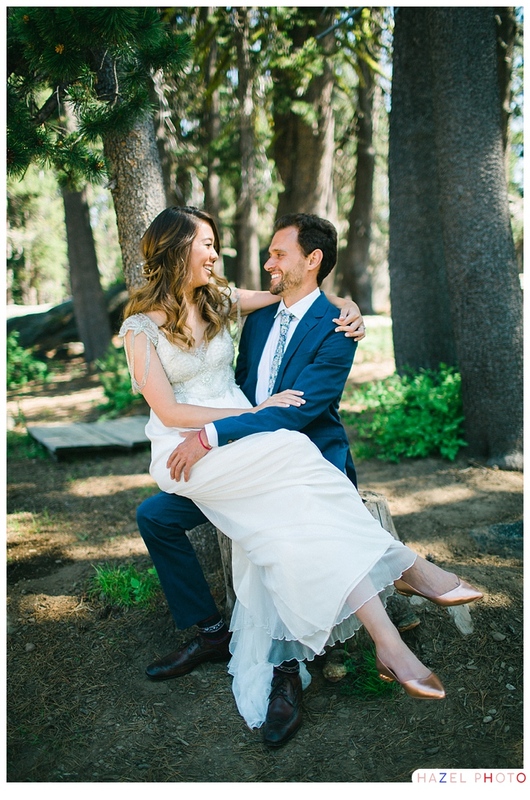 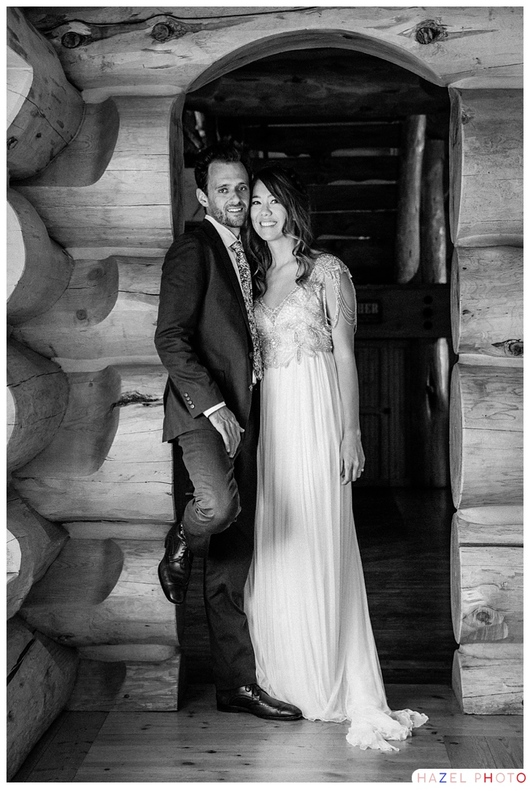 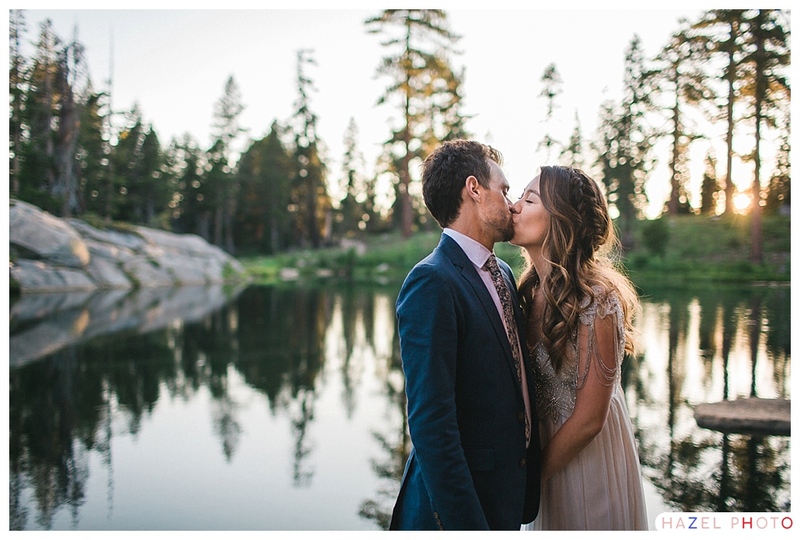 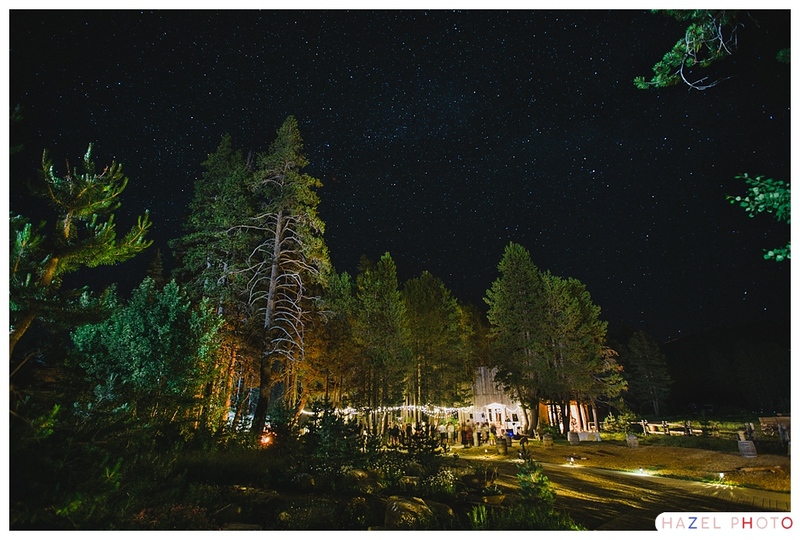 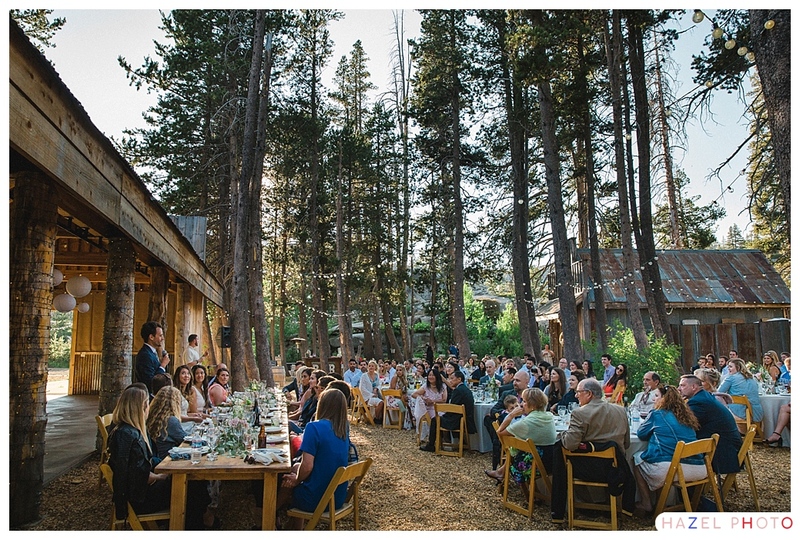 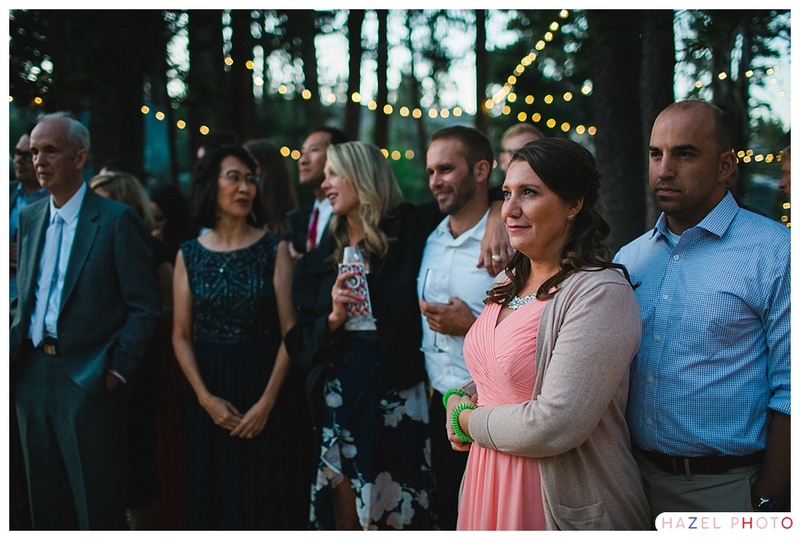 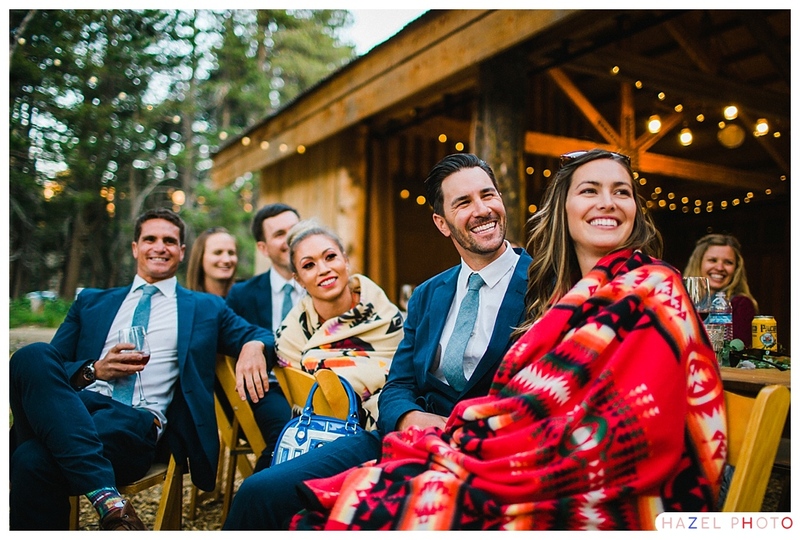 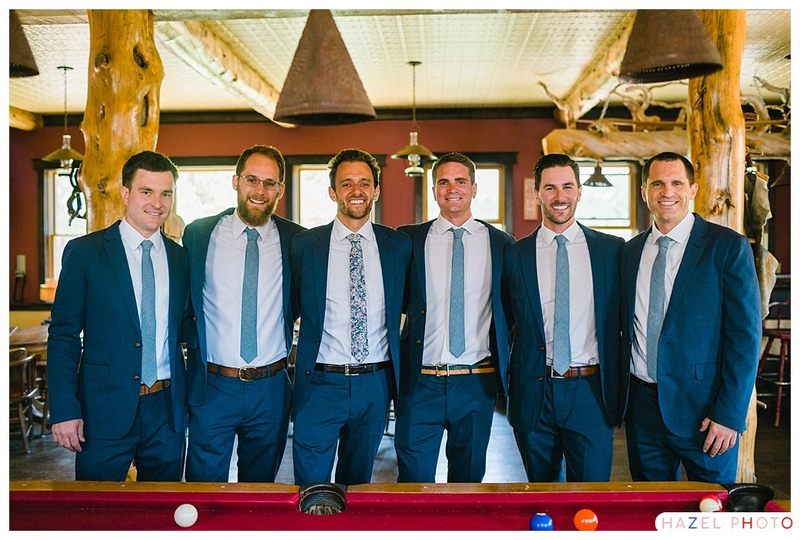 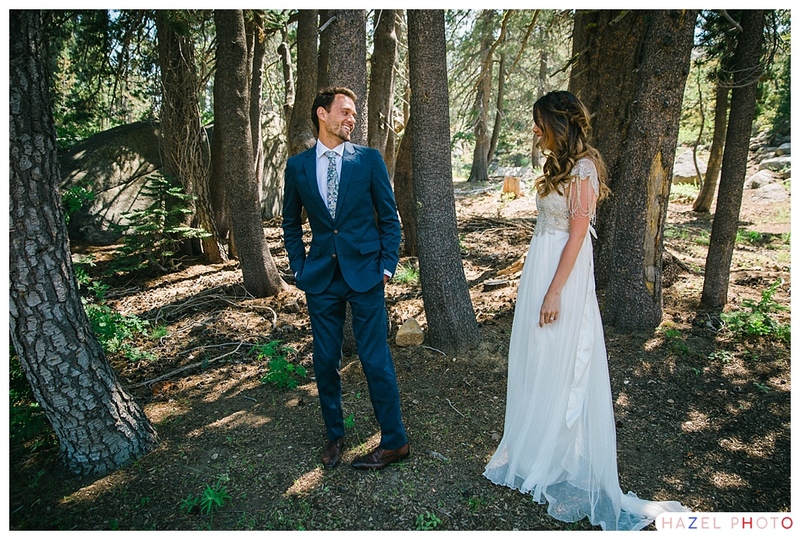 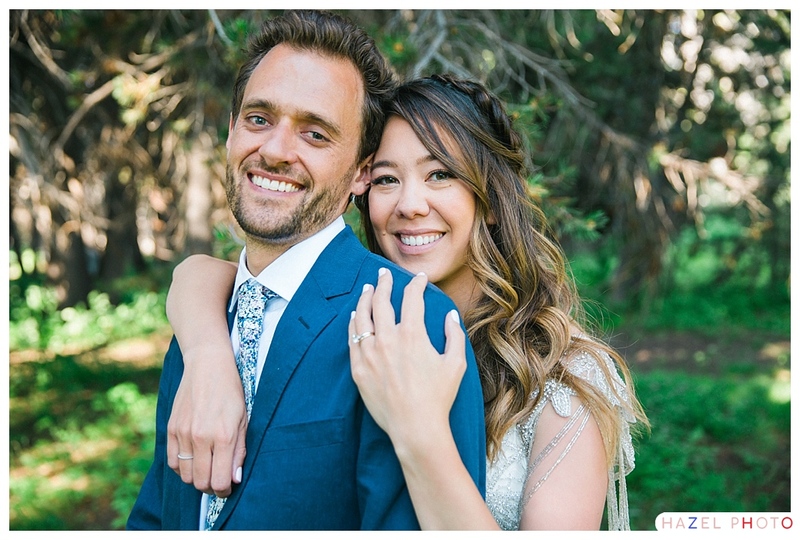 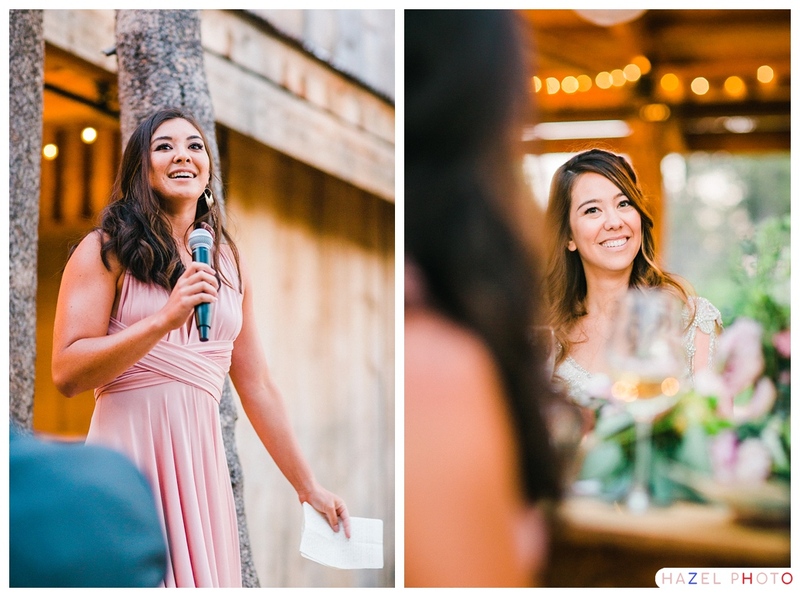 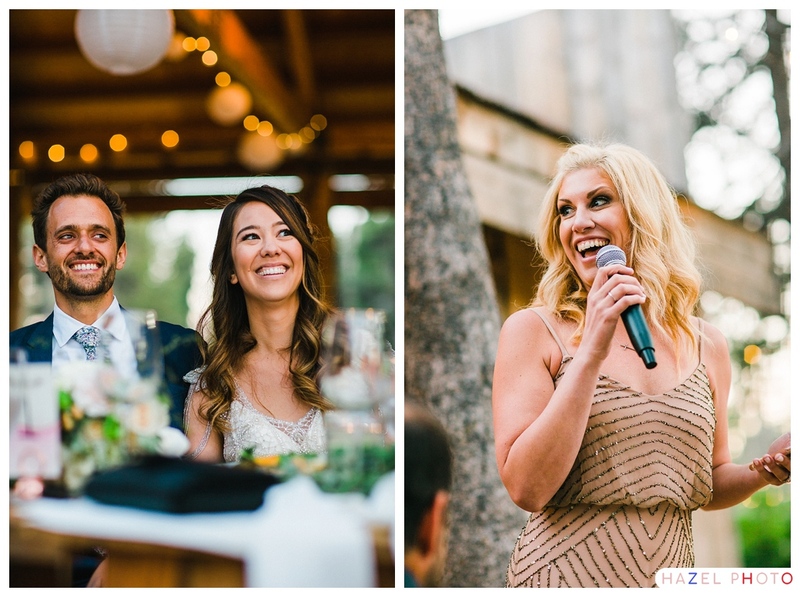 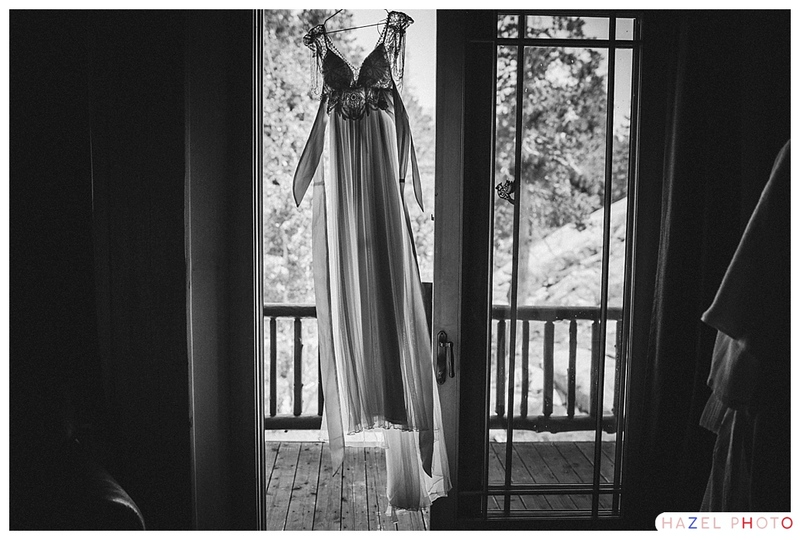 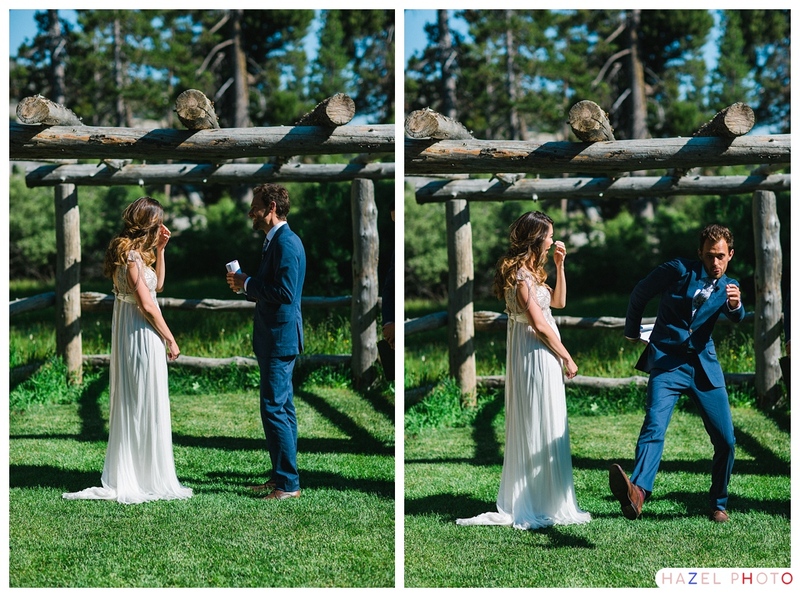 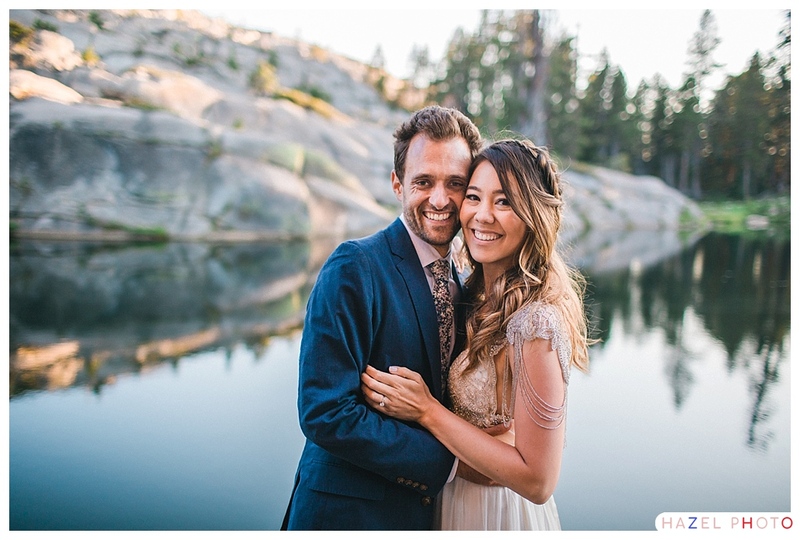 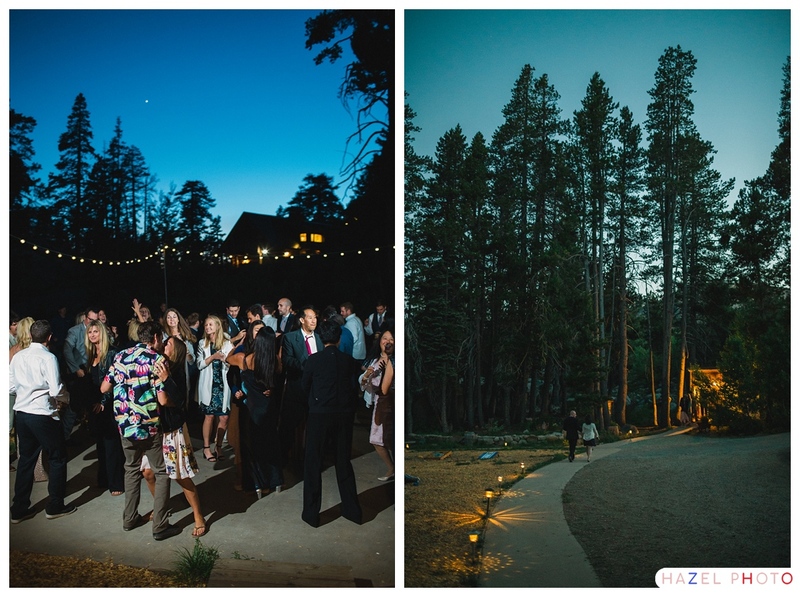 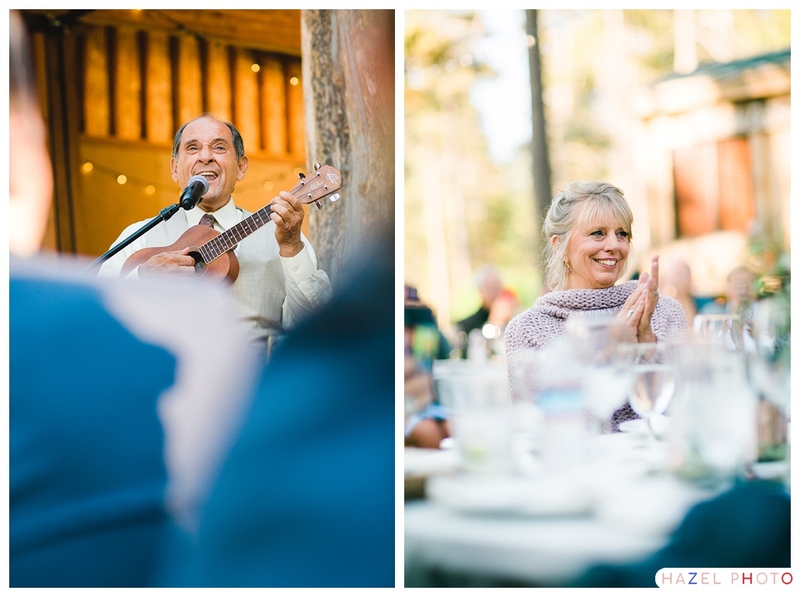 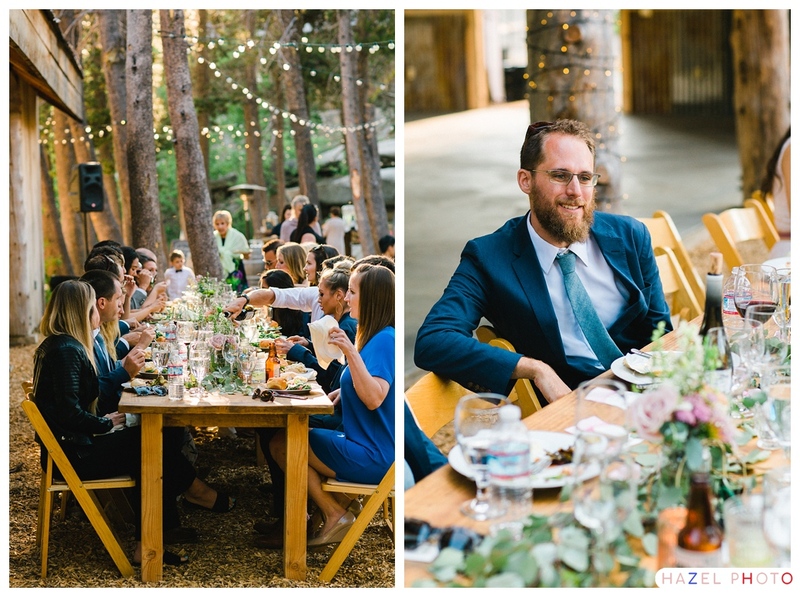 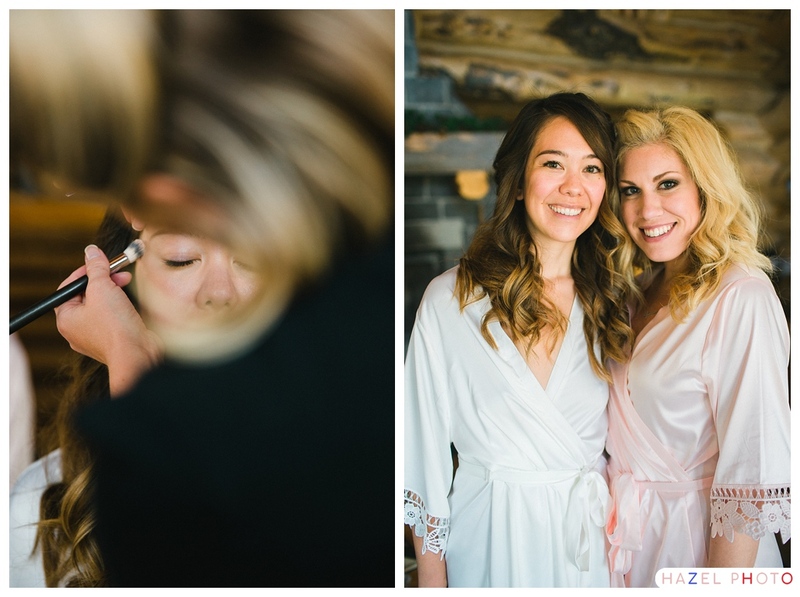 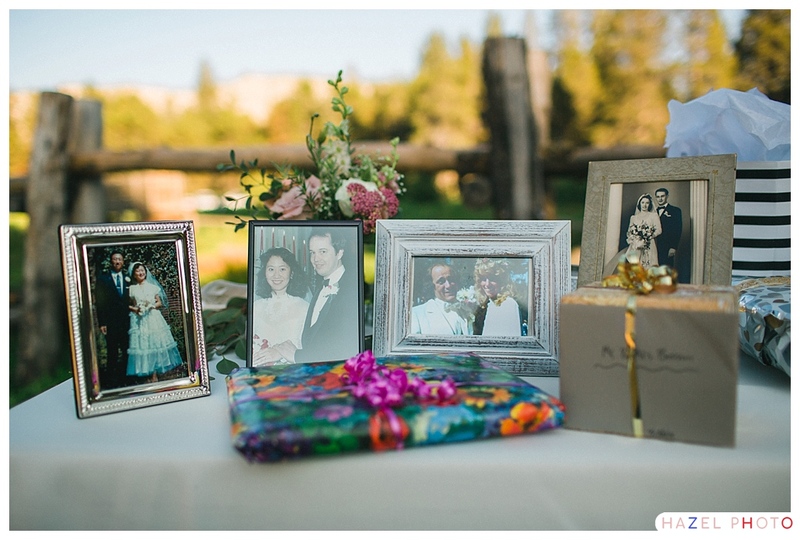 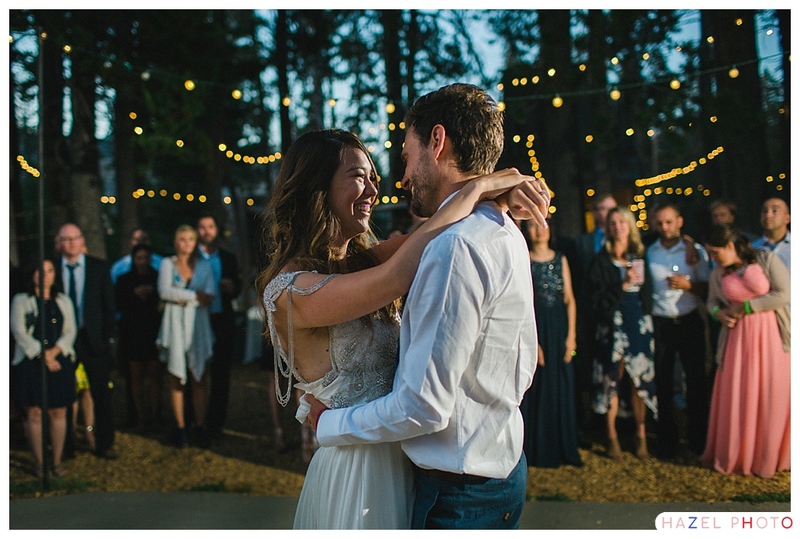 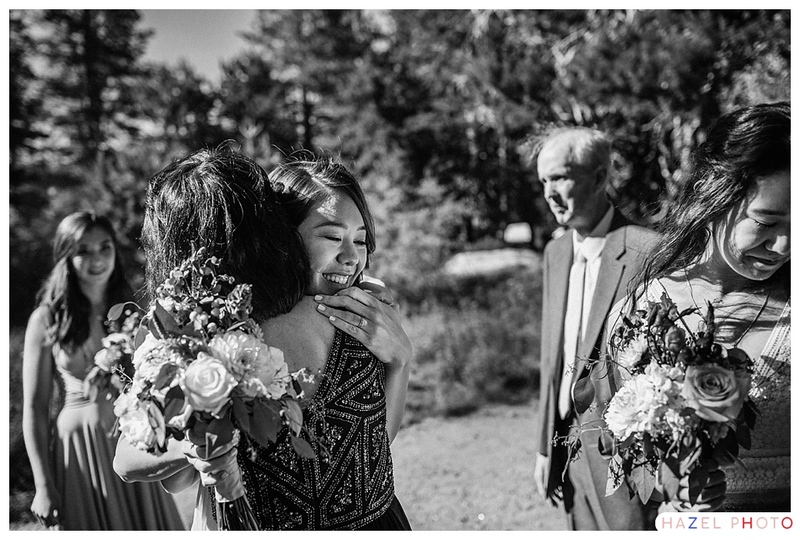 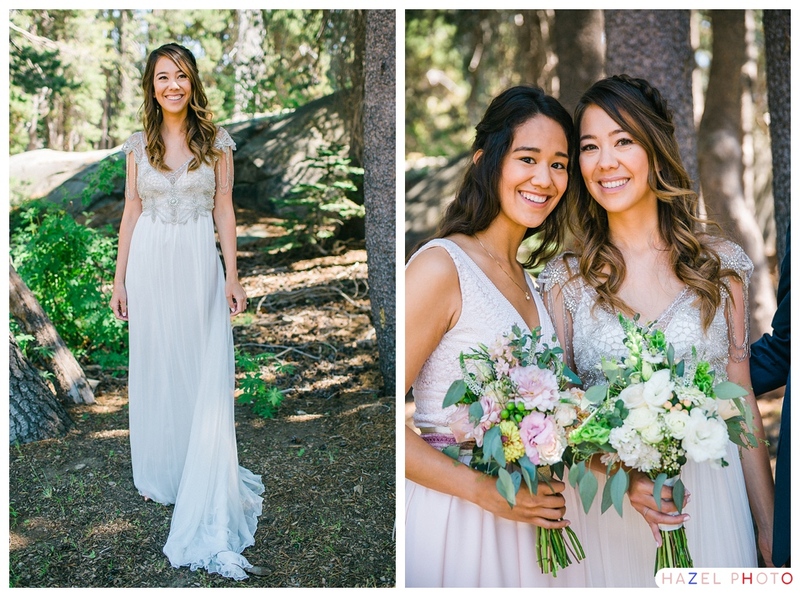 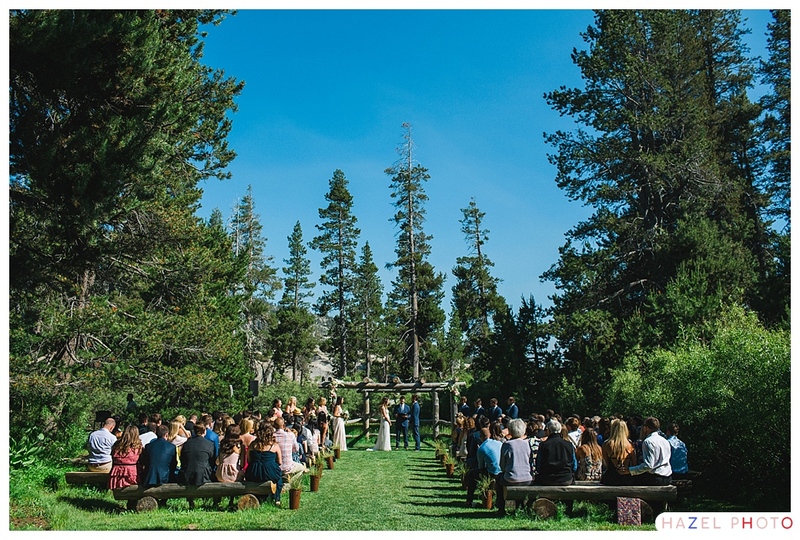 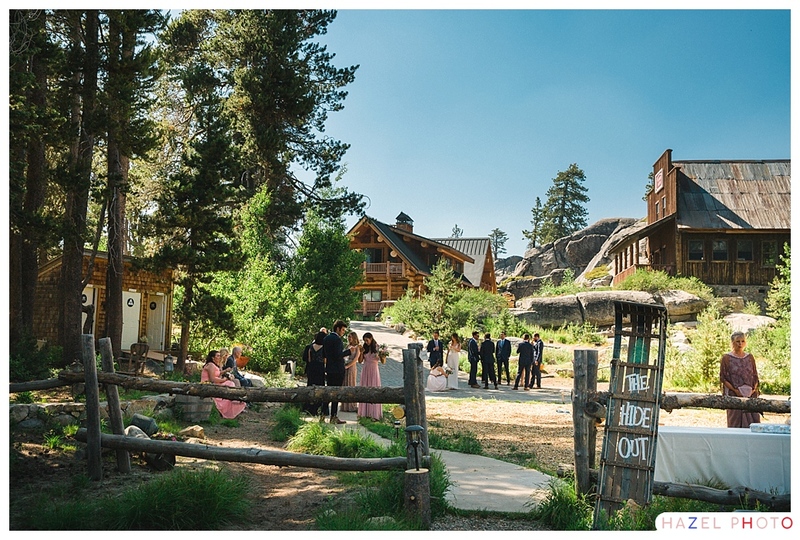 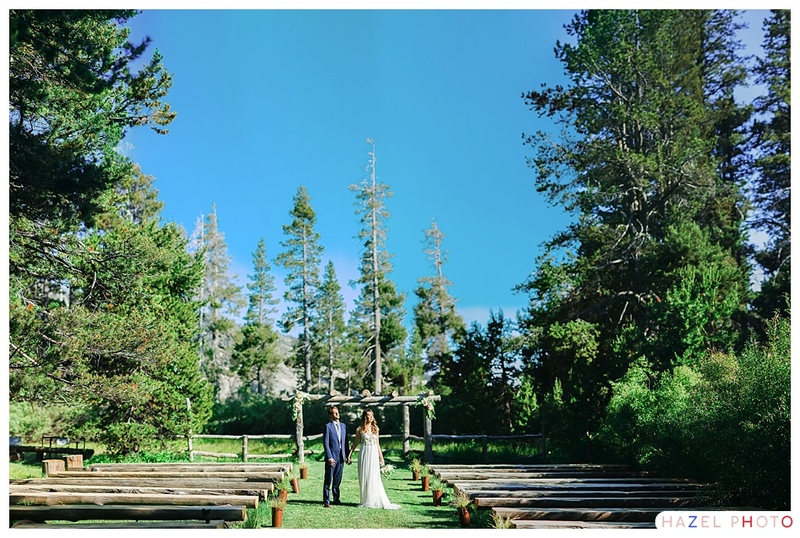 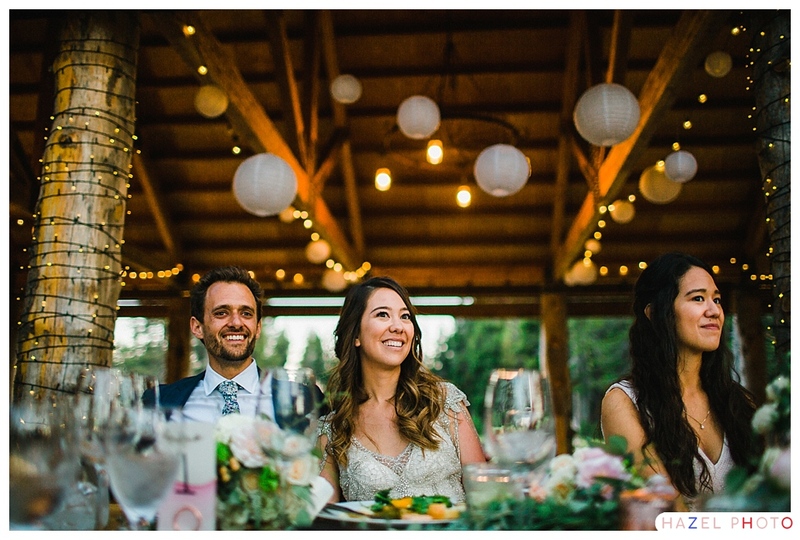 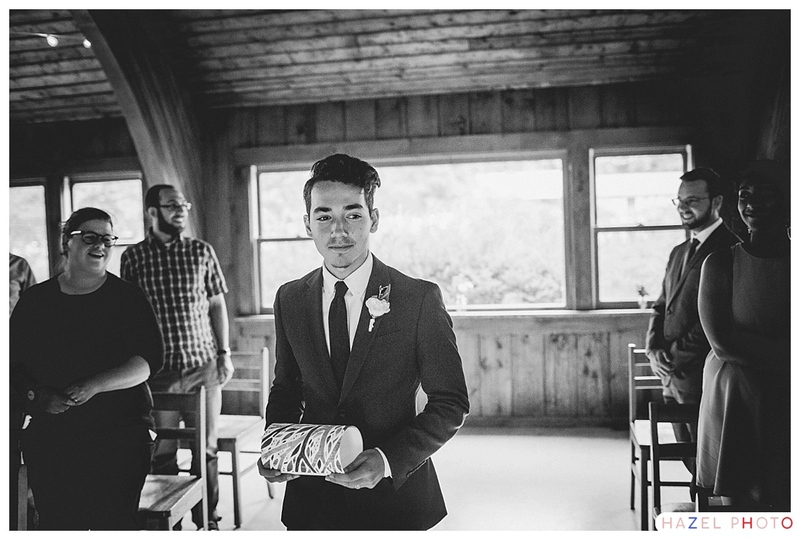 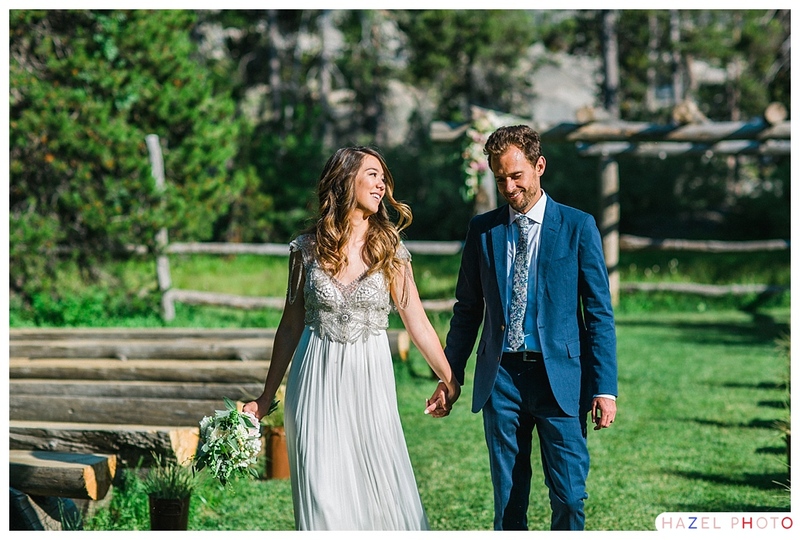 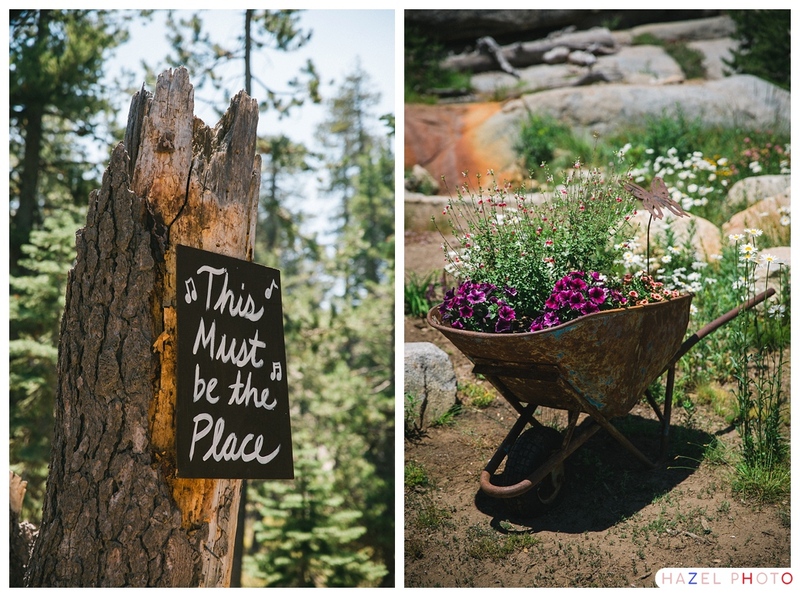 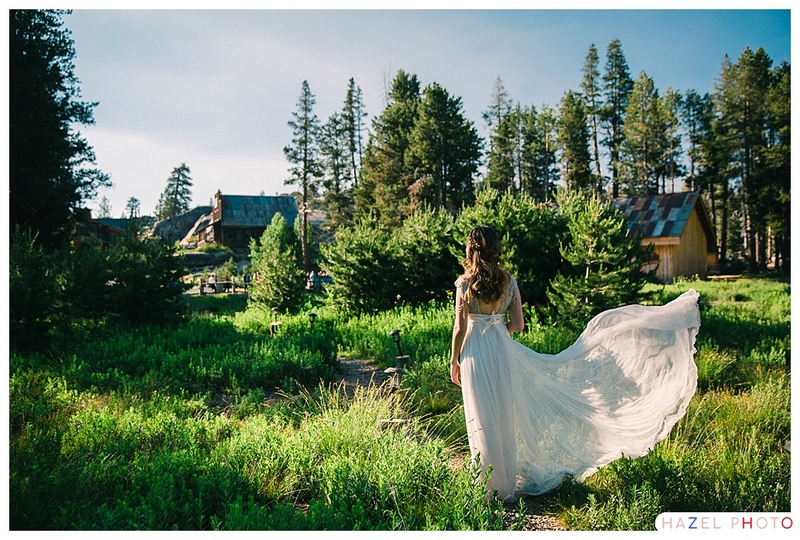 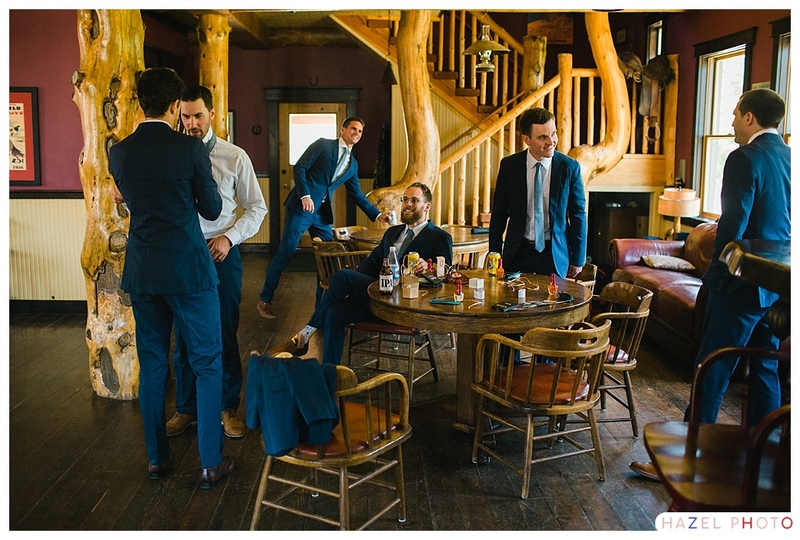 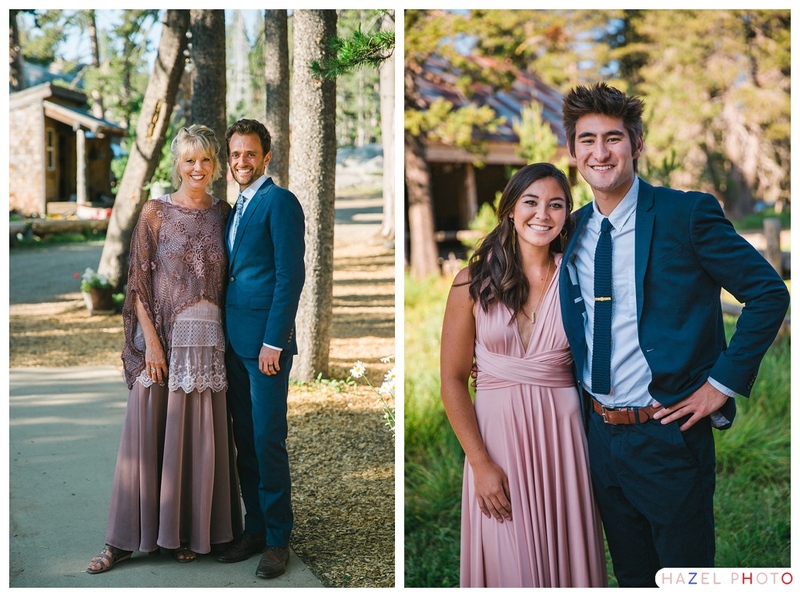 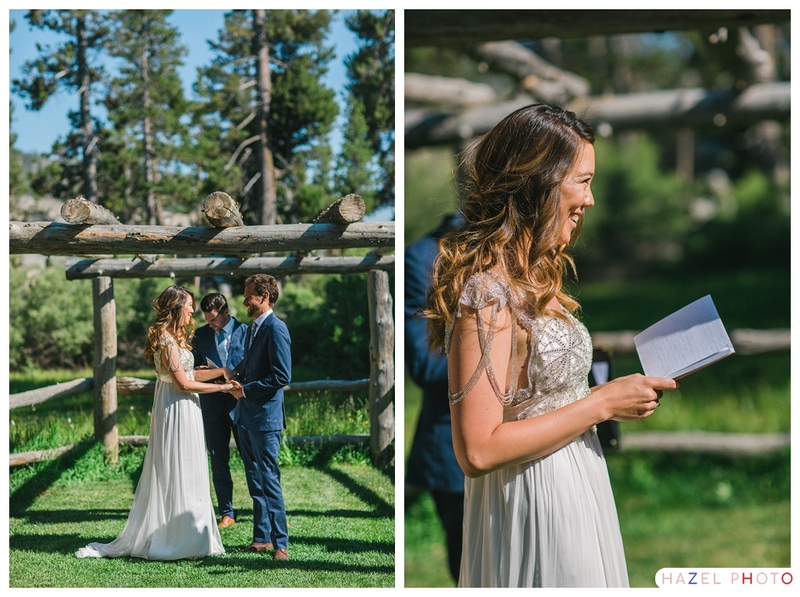 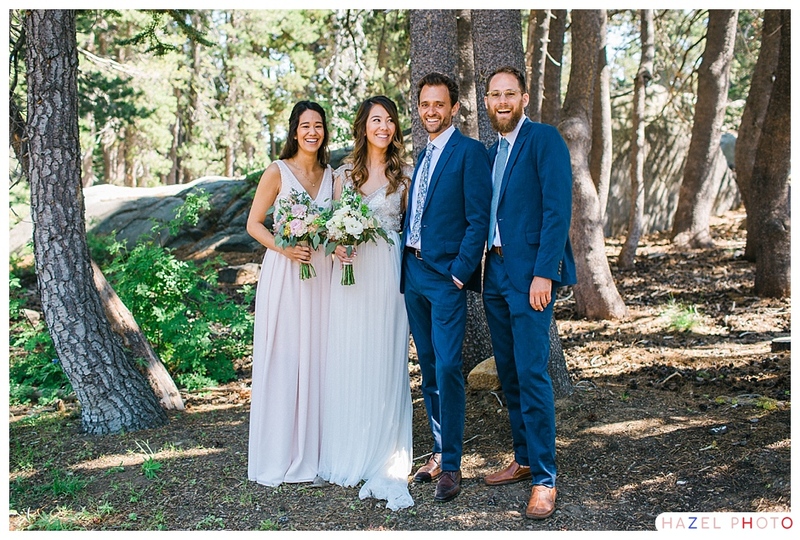 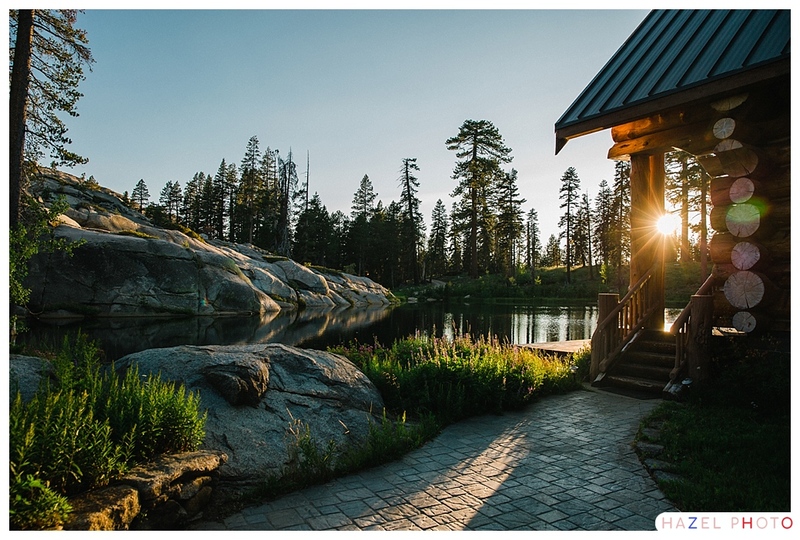 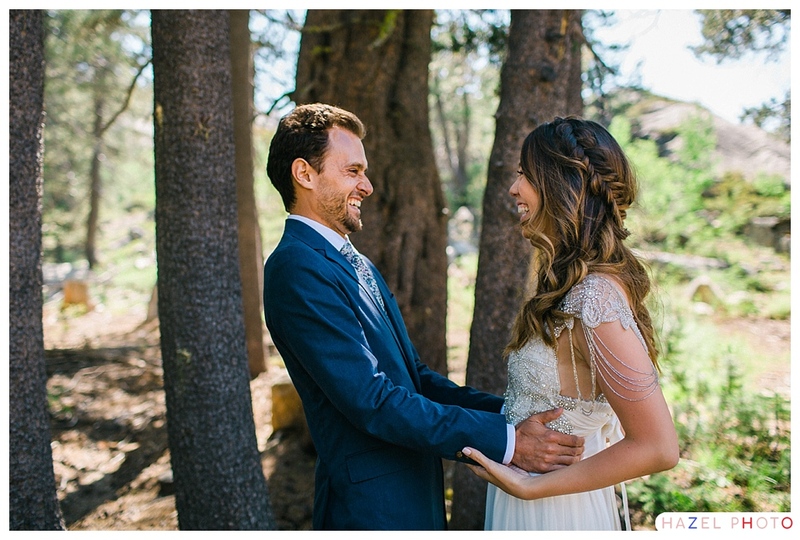 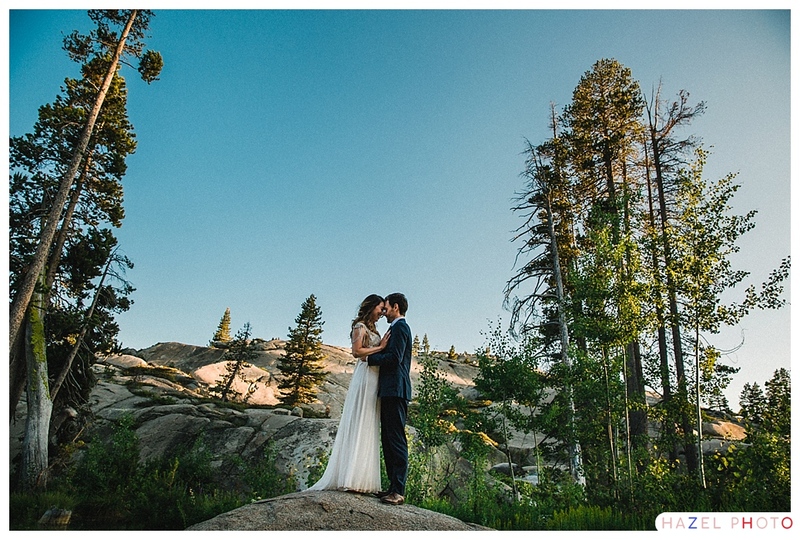 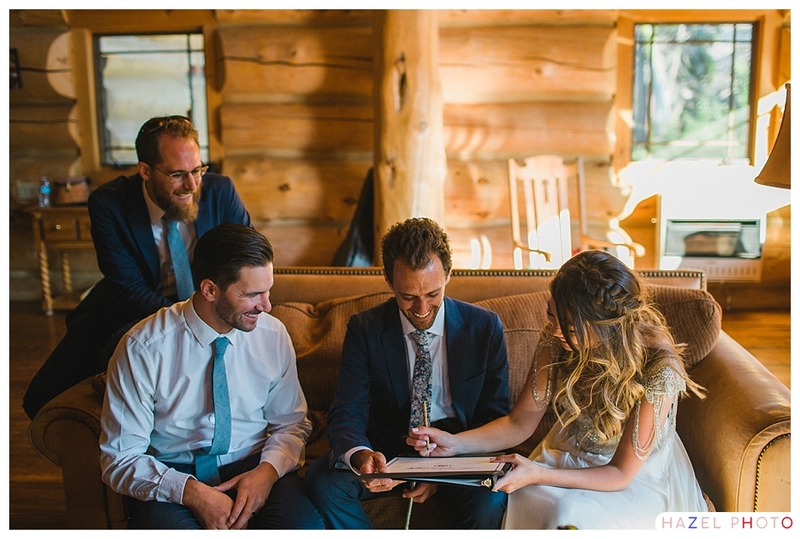 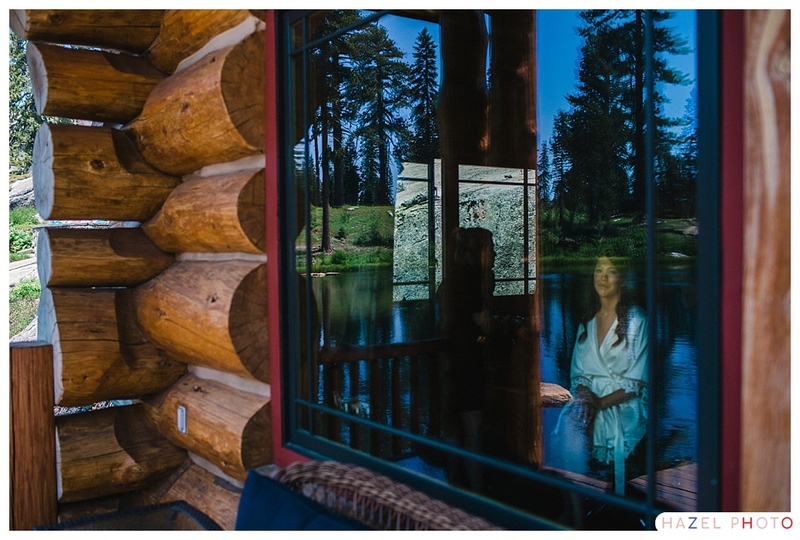 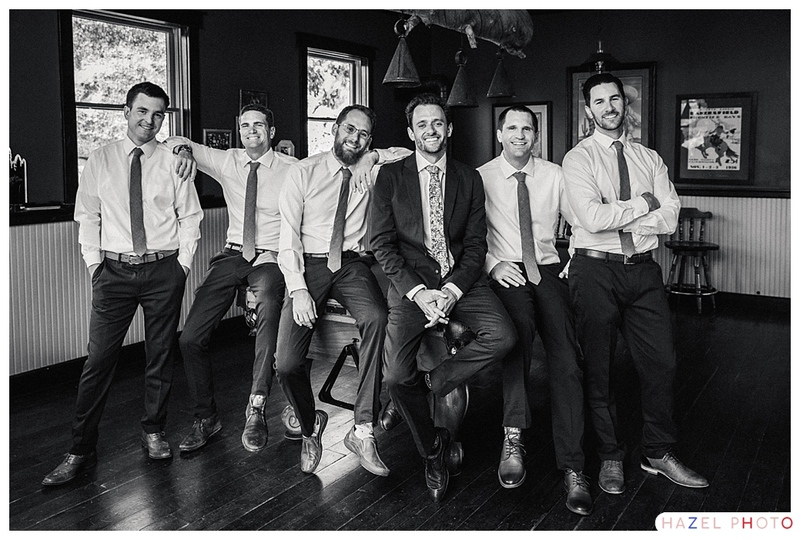 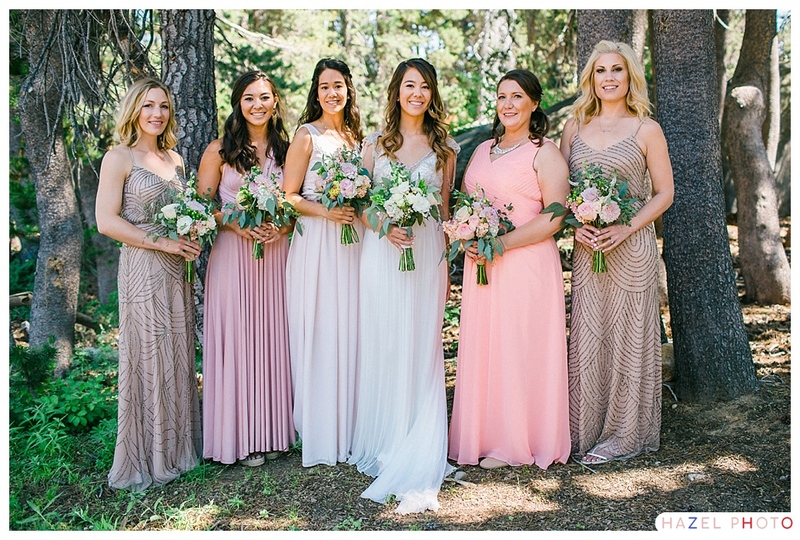 Allie and Dave held their wedding at The Hideout at Kirkwood near Lake Tahoe up in the Sierra Mountains. 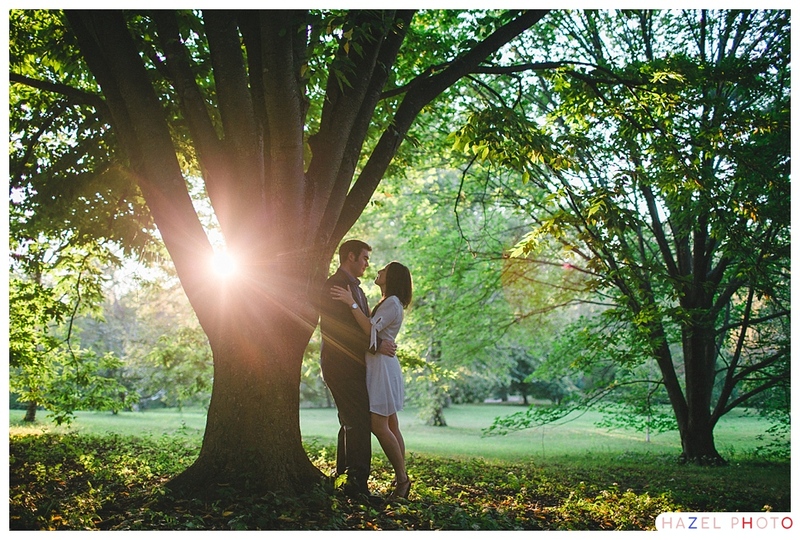 It was a very bright and sunny day, and it cooled down pleasantly when the sun went down. 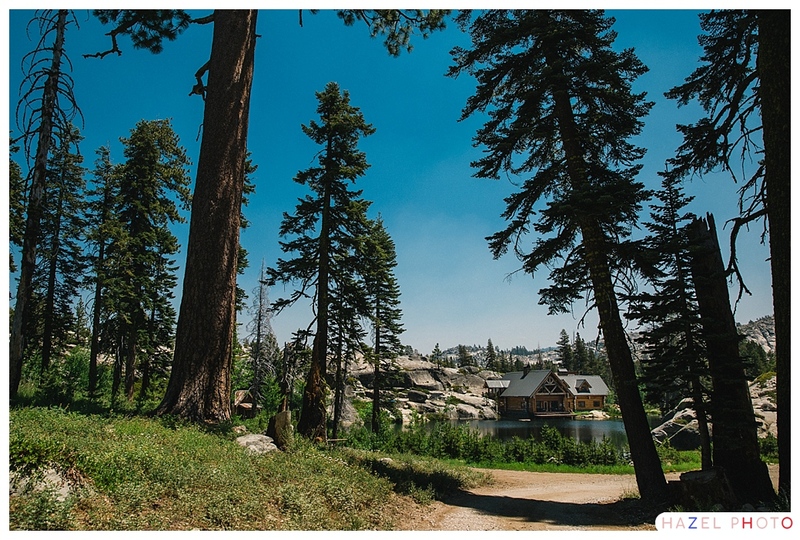 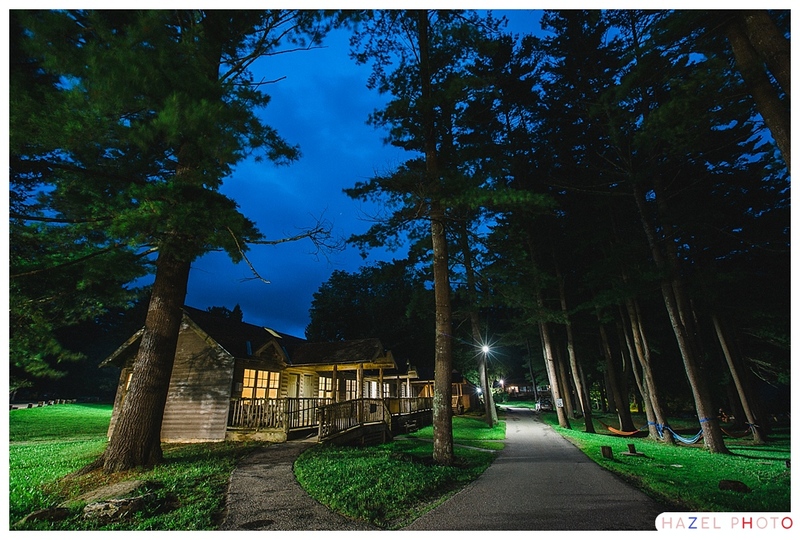 The approach to the Hideout is majestic, miles down a winding dirt road, a clearing opens with a lake and a lodge in the distance. 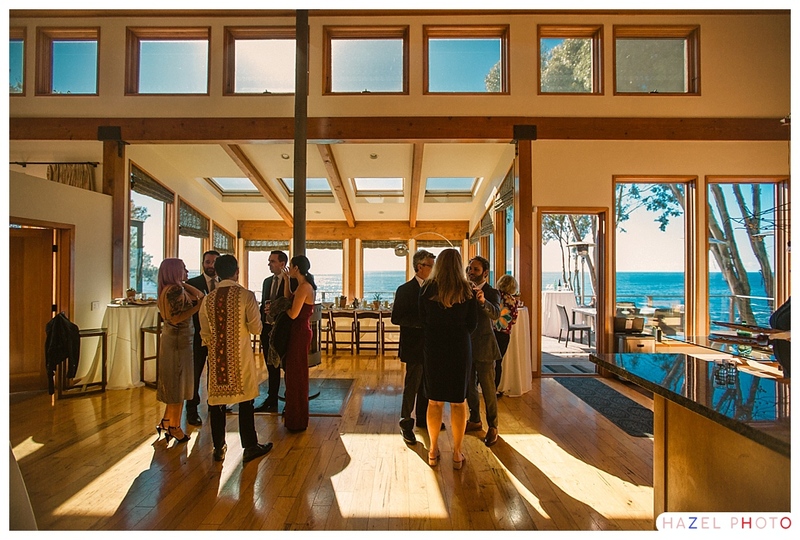 This place feels both tucked away and expansive. 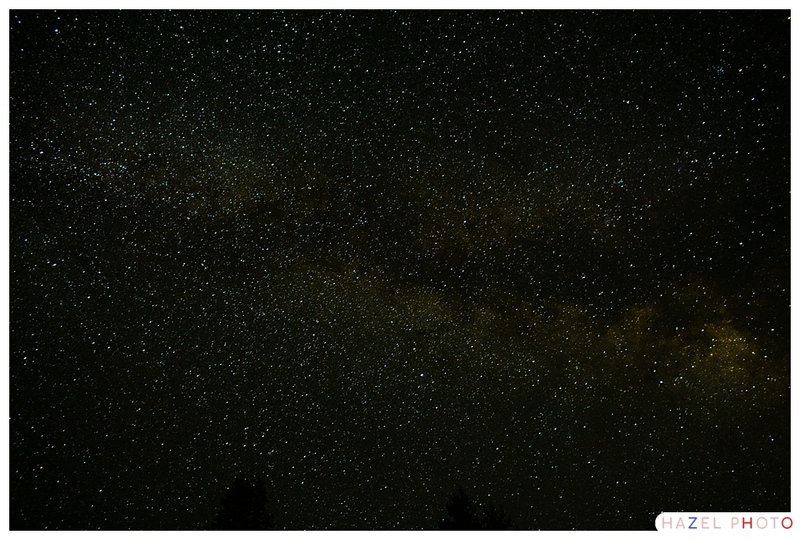 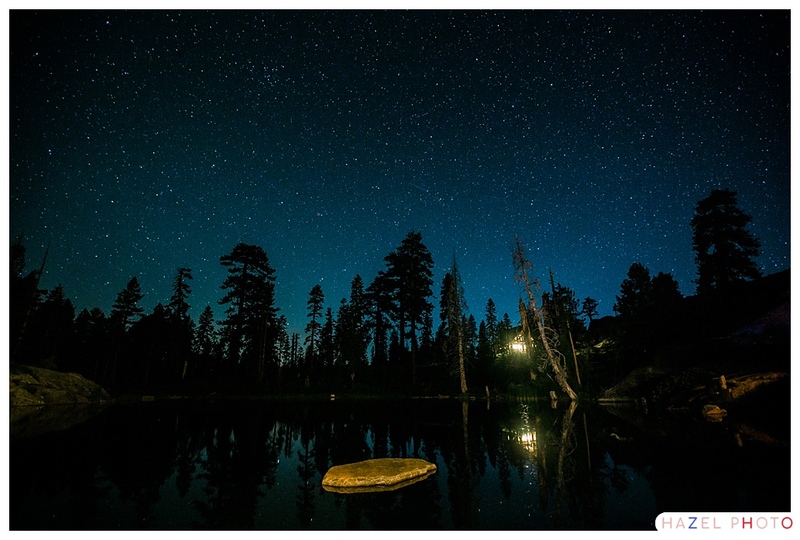 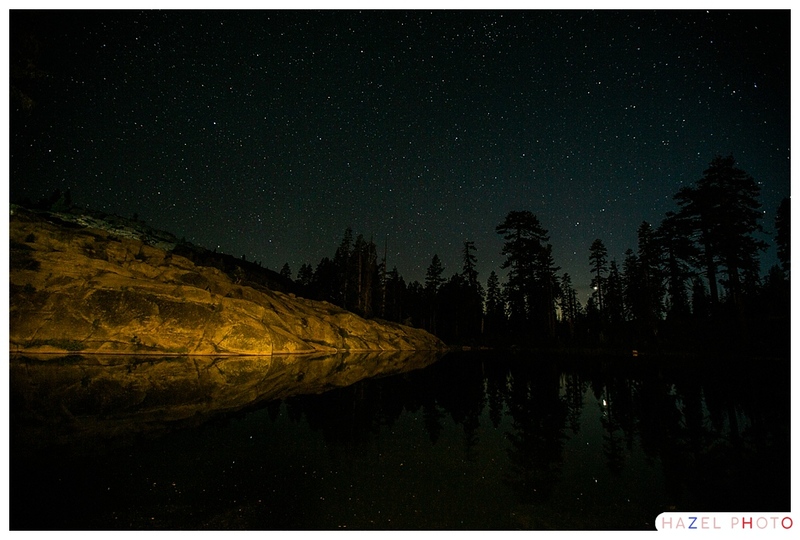 Don’t miss the night photos that show the natural beauty of the setting. 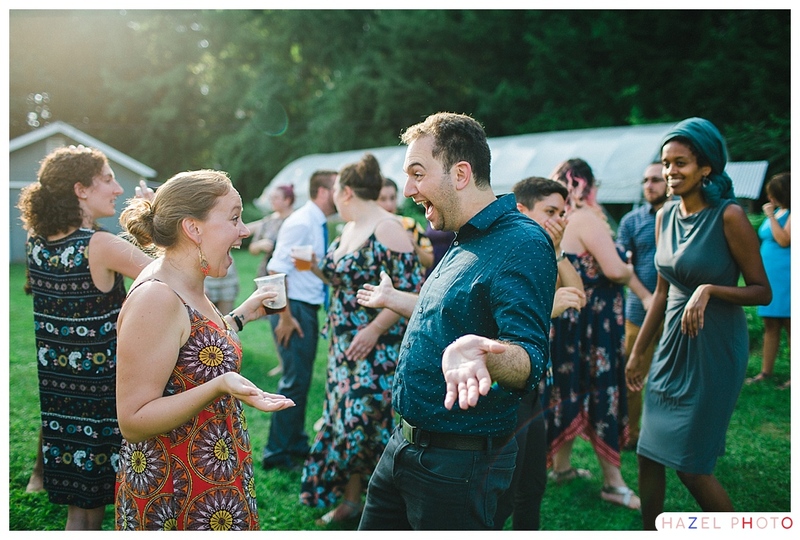 Allie and Dave have particularly complimentary personalities. 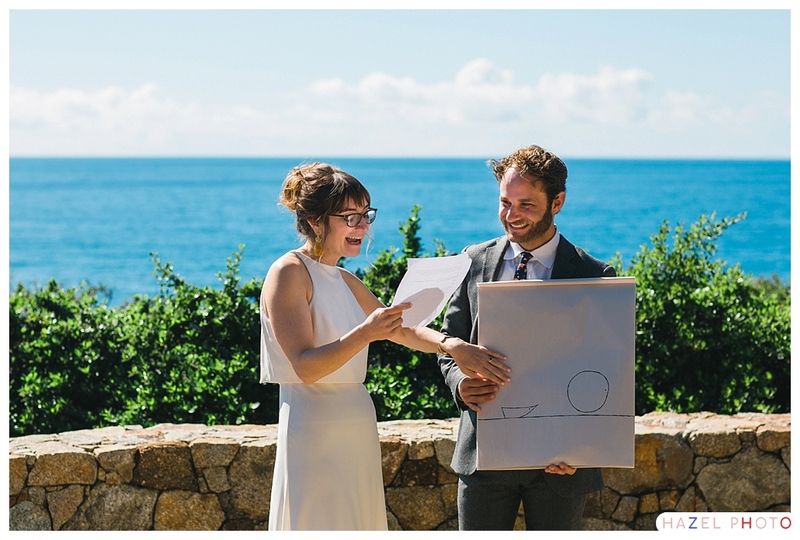 There was this one moment where, as part of his vows, Dave painted a picture of the moment he was given entry to Allie’s relaxed side. 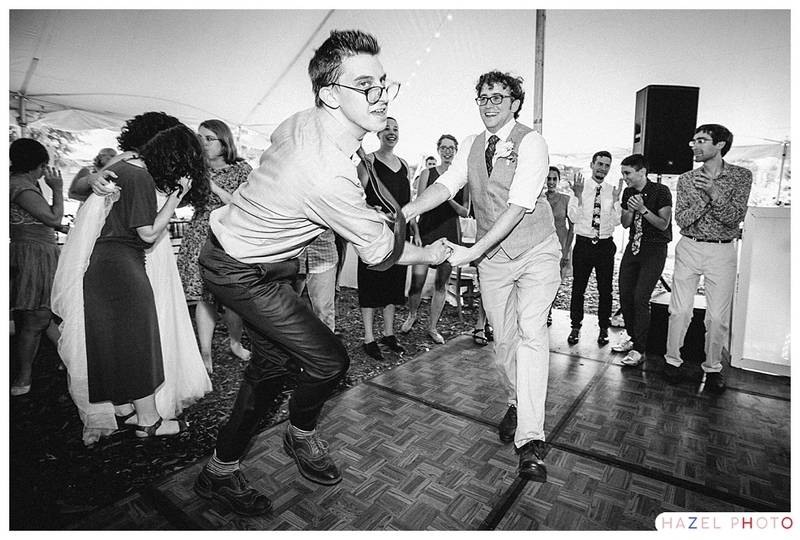 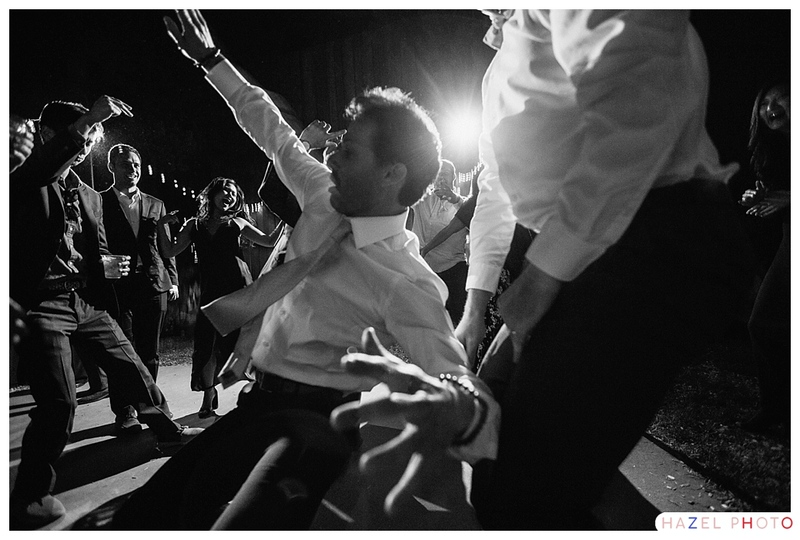 All the sudden he broke into a lively dance. 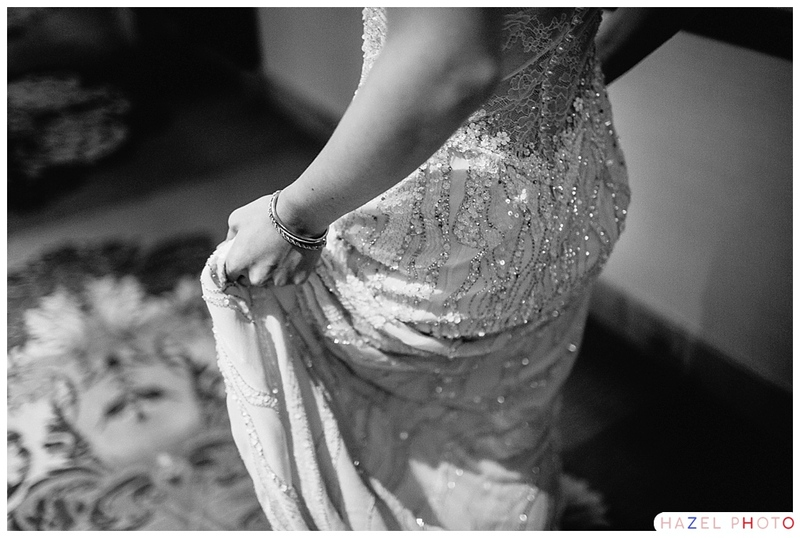 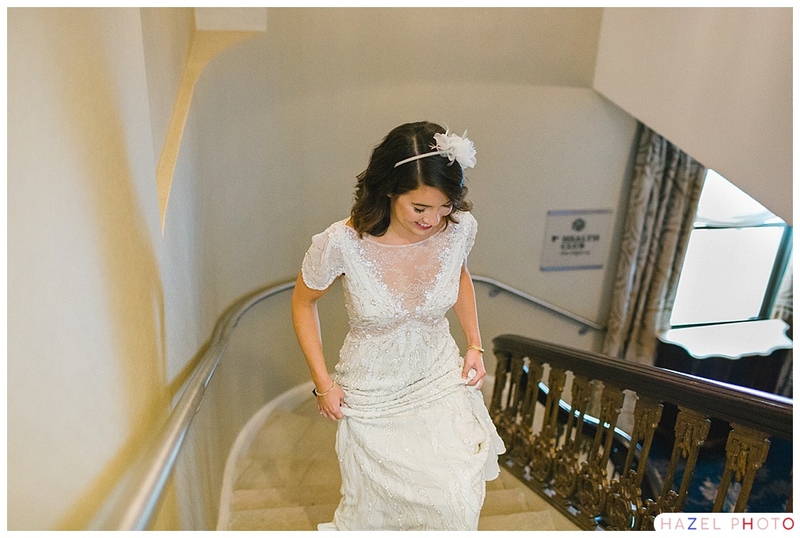 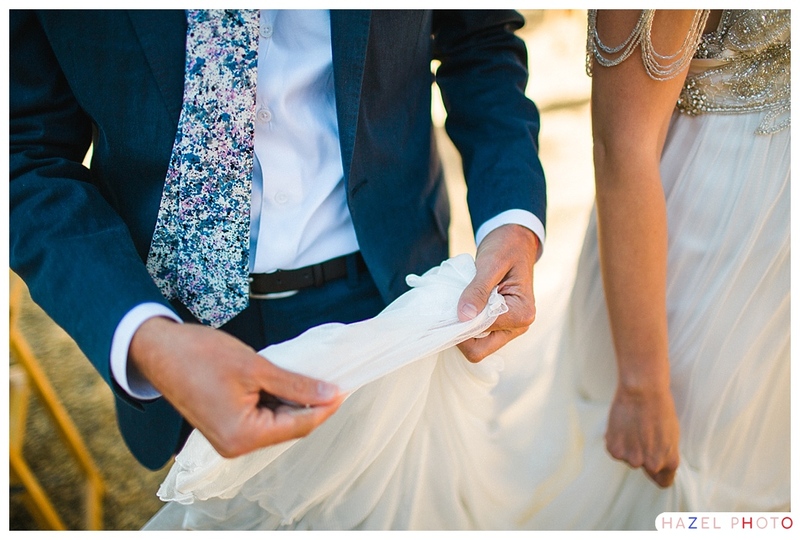 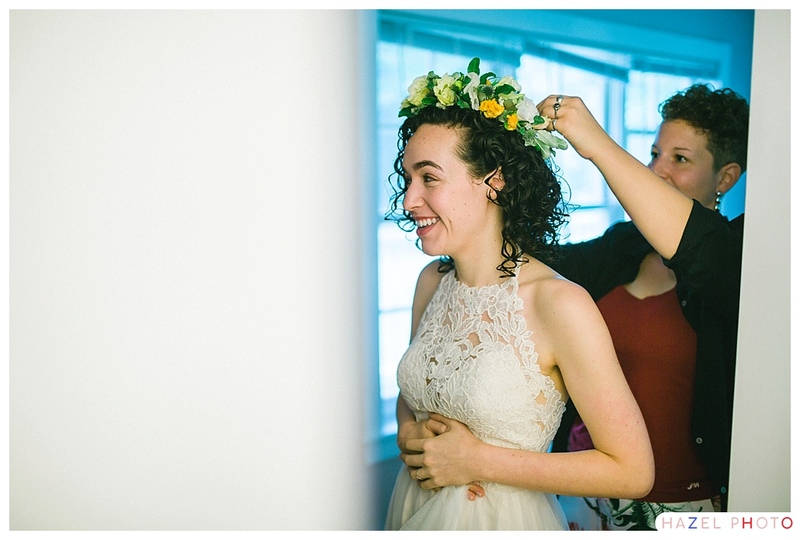 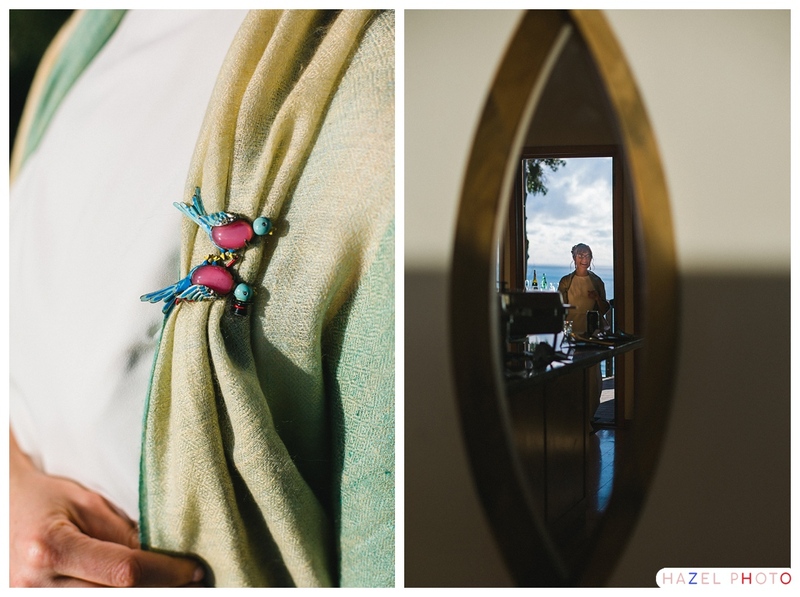 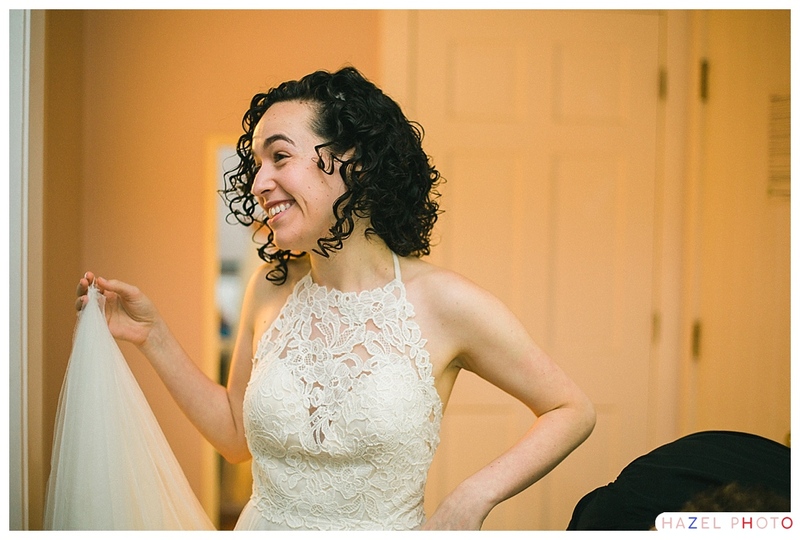 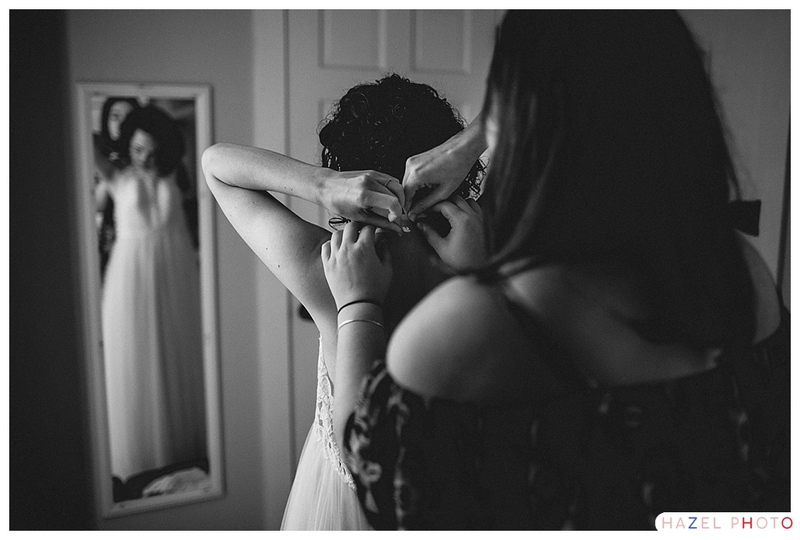 Allie’s wedding dress was adorned with the most gorgeous intricate beadwork. 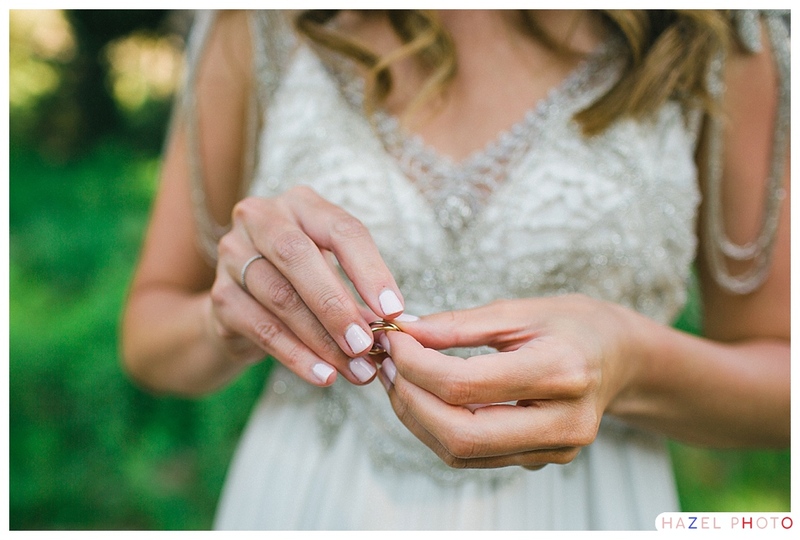 She wore her hair in wrapped loose braids, which complimented the dress perfectly. 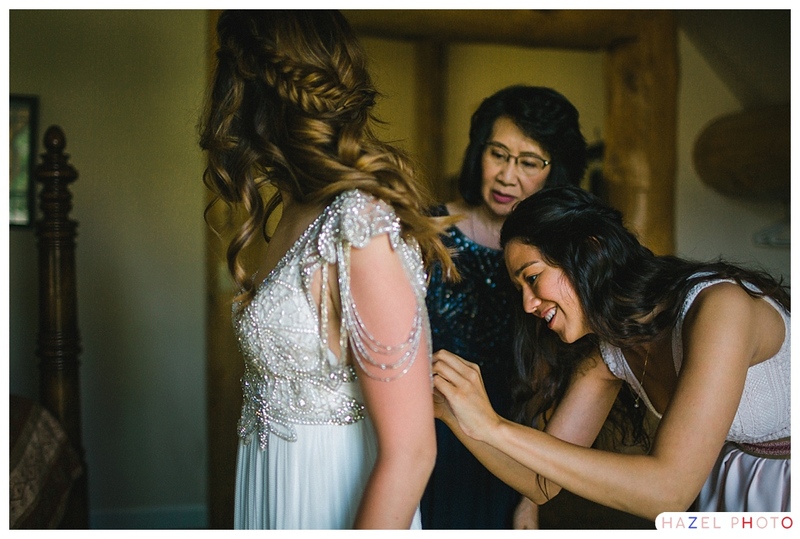 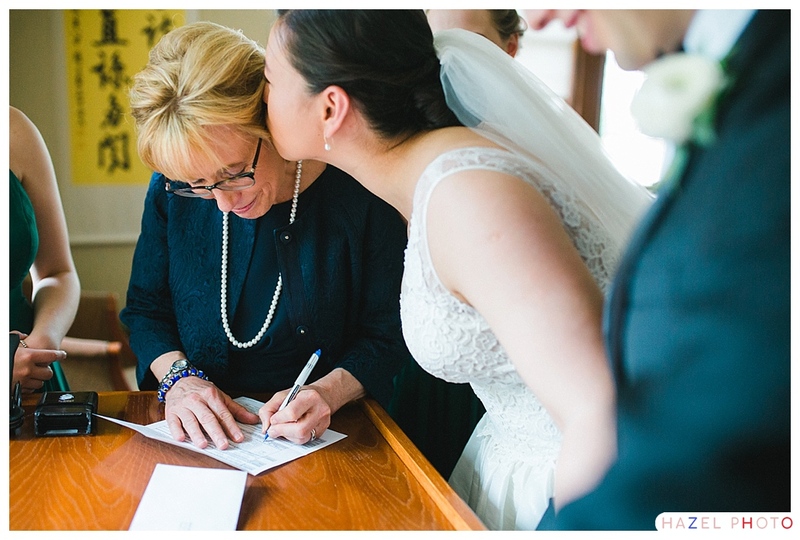 Allie’s mother and sister were exceptionally sweet as they helped her into her dress. 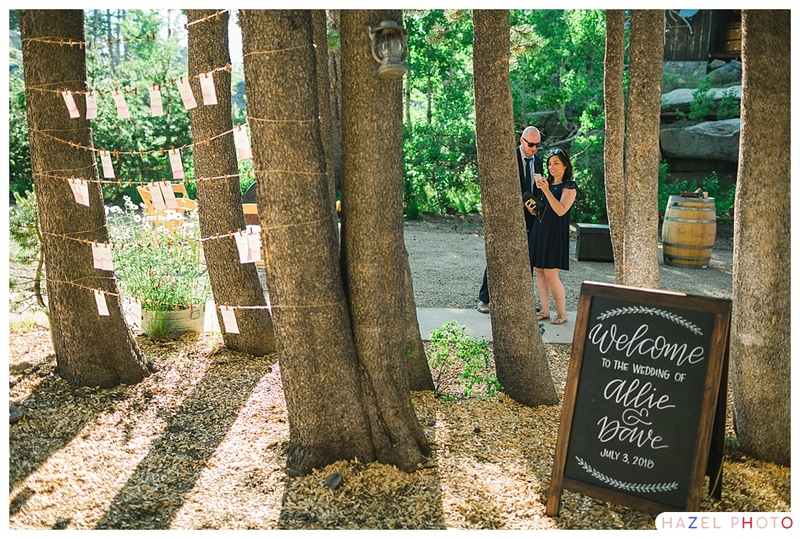 All of the vendors Allie and Dave brought in were lovely, and worked together well. 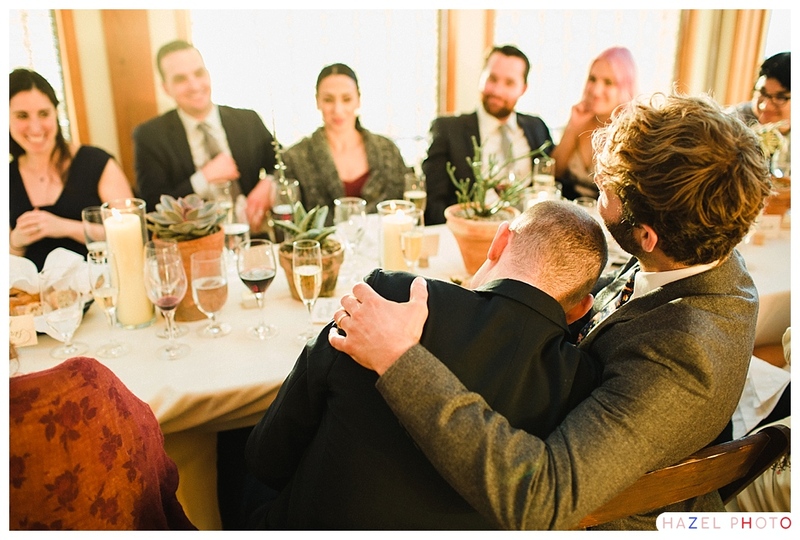 This totally makes sense, because Allie and Dave are genuine, warm people. 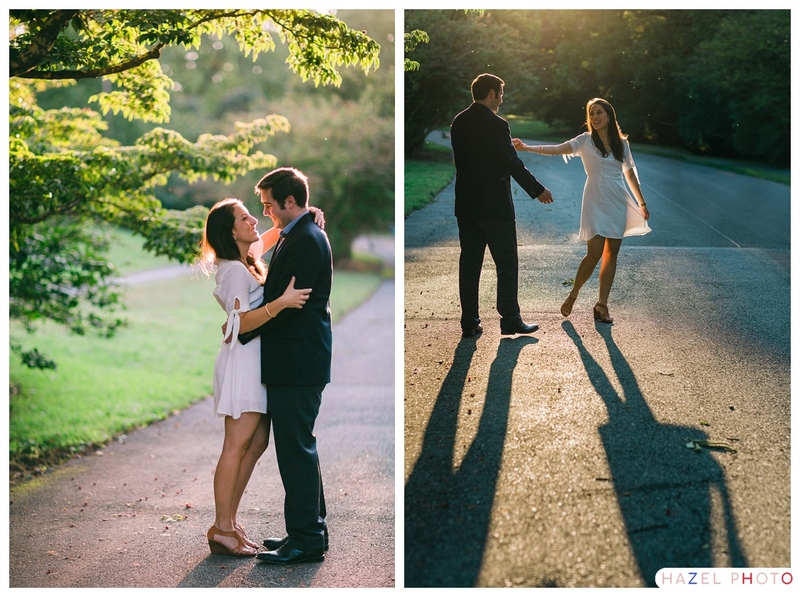 I was particularly appreciative of Shannon of J Jasper Events who helped us to make time for a couple sunset photos, which are some of my favorite from the day. 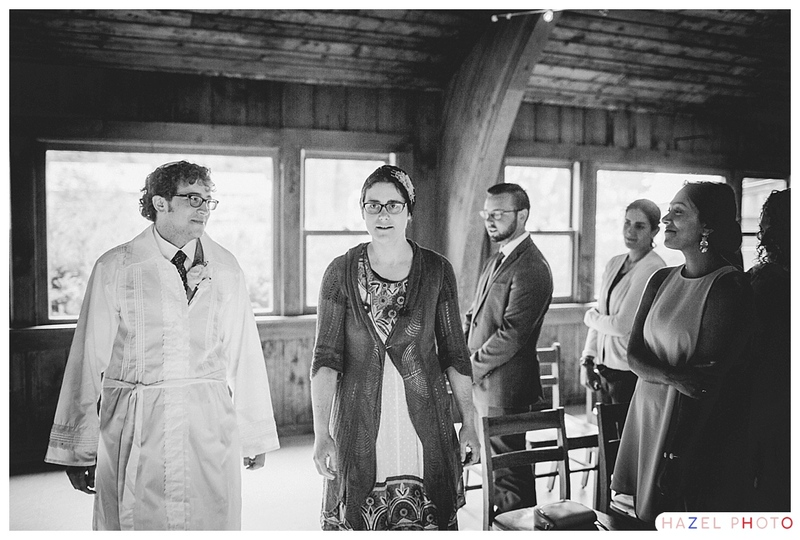 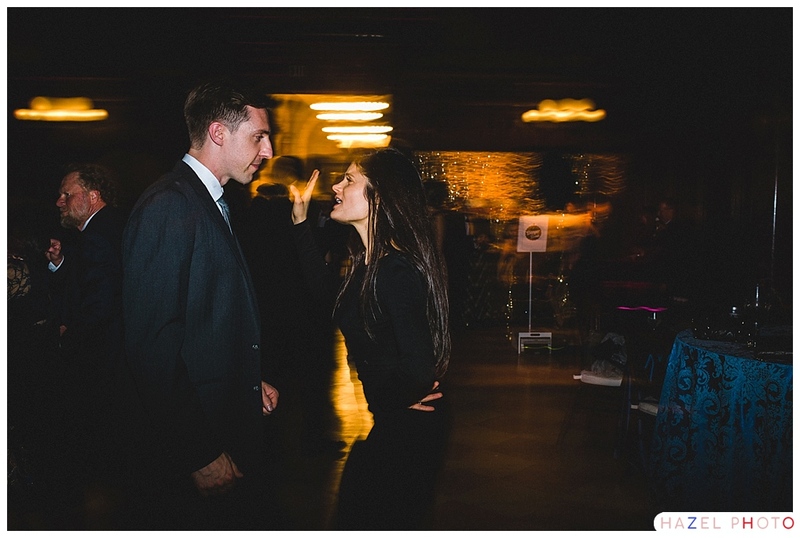 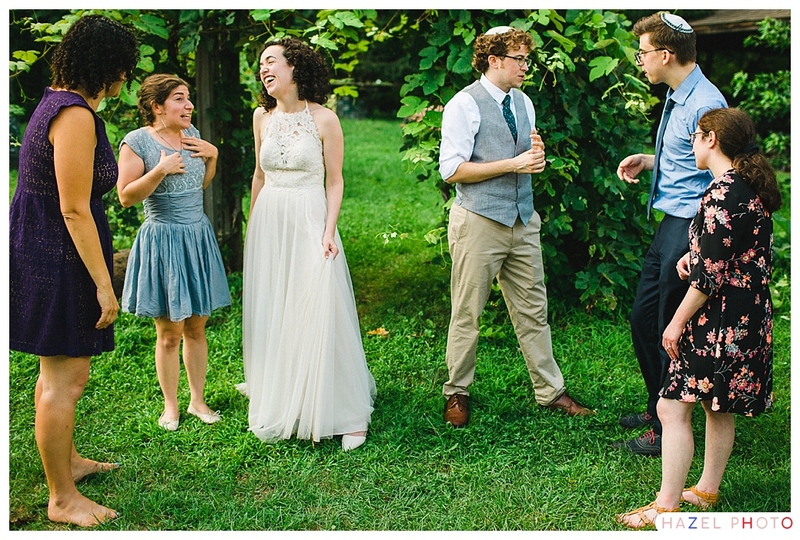 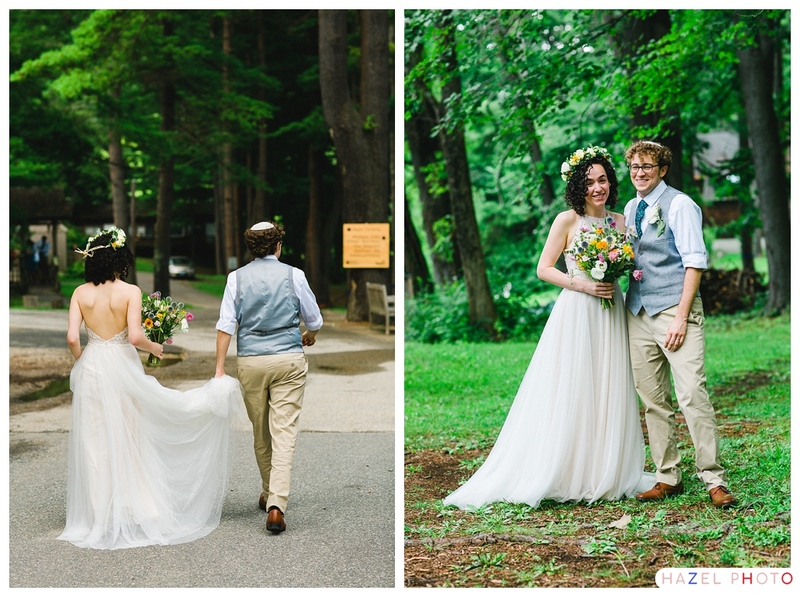 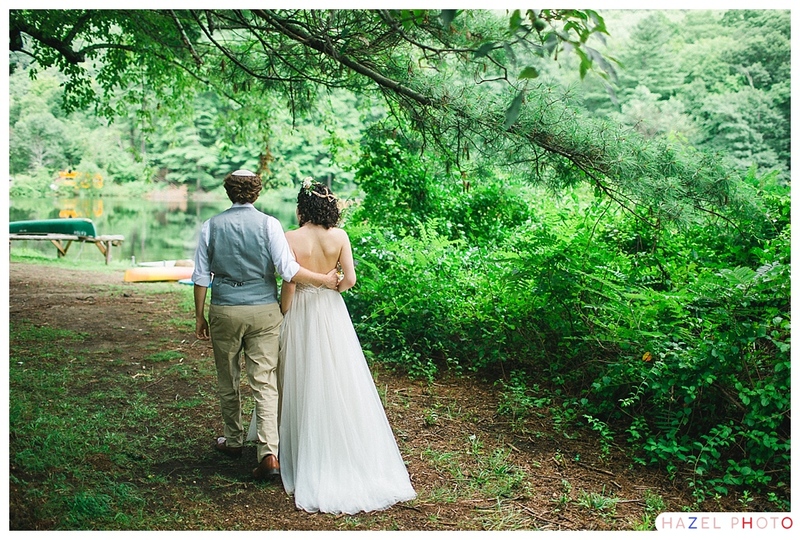 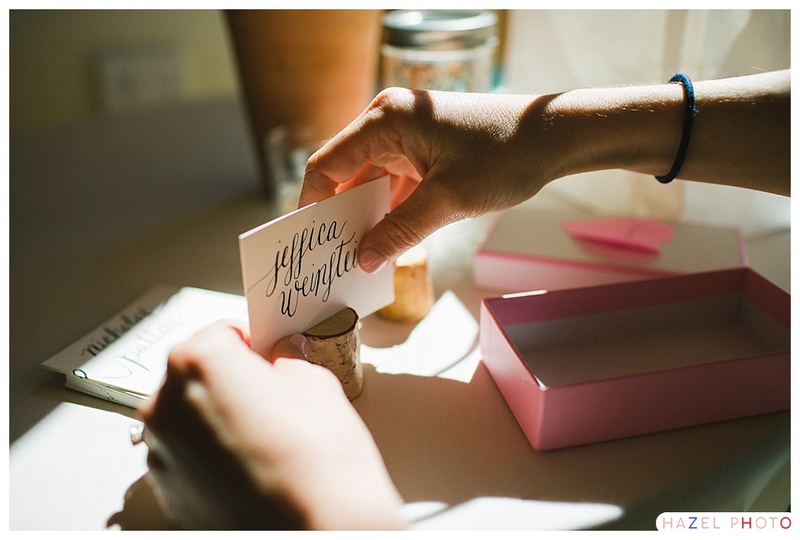 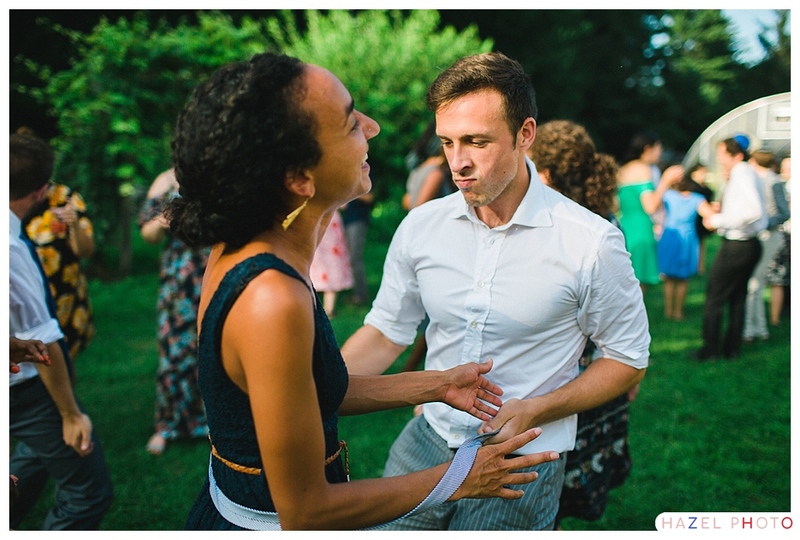 The story of how it came to be that I photographed Jocelyn and Tom’s wedding is on the complicated side of things. 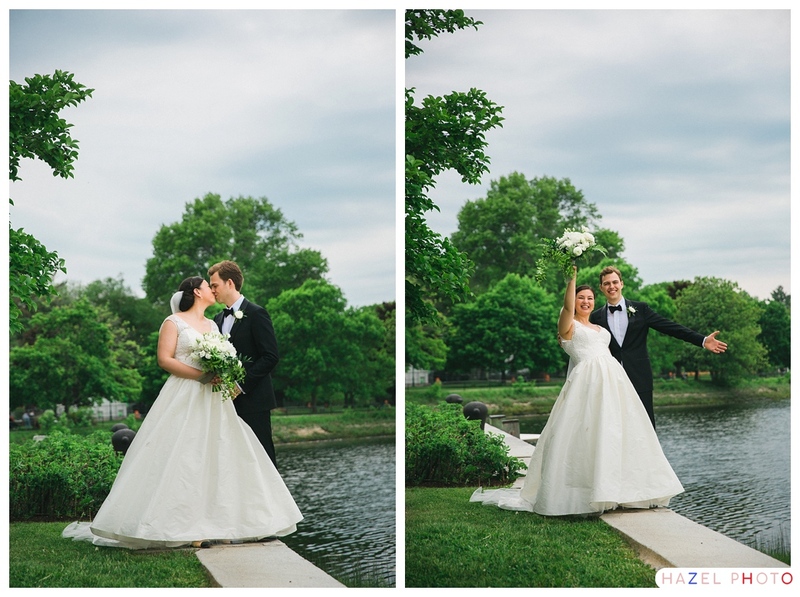 Jocelyn reached out to see if I was available to photograph her wedding on the Sunday of Memorial Day. 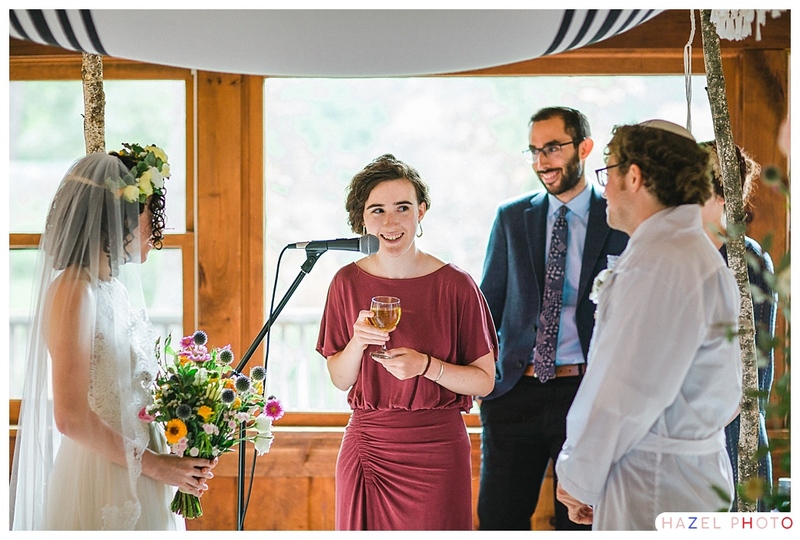 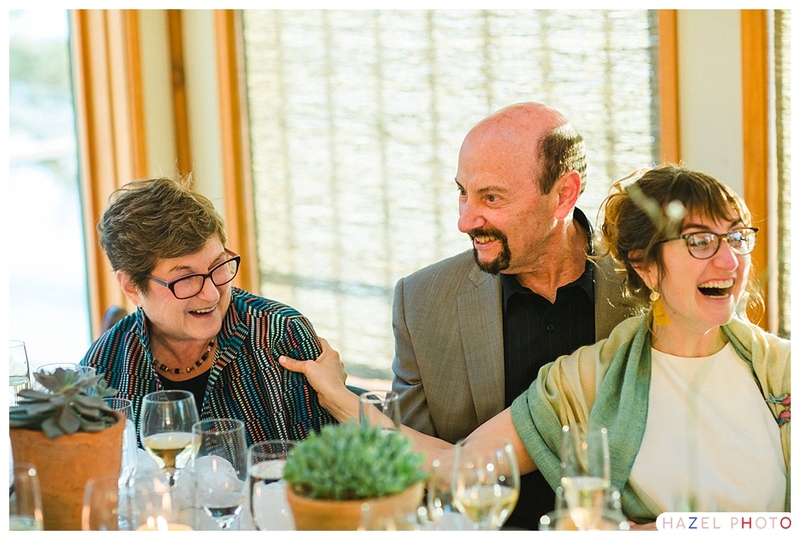 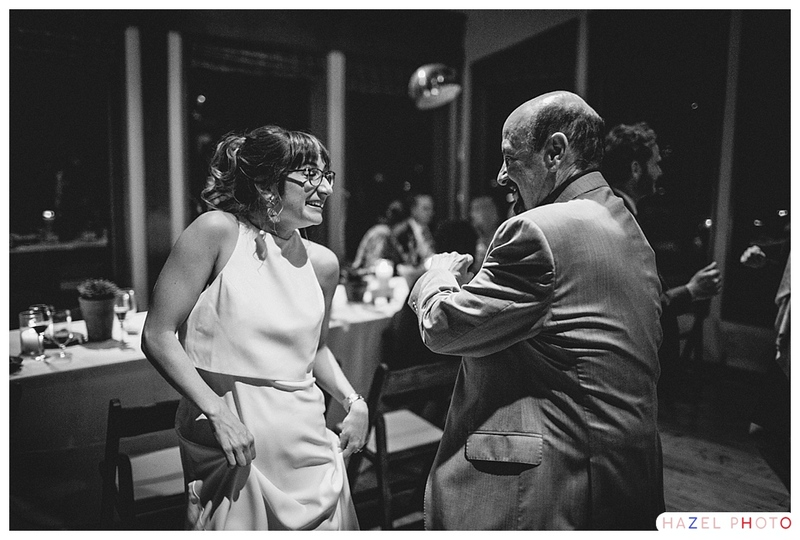 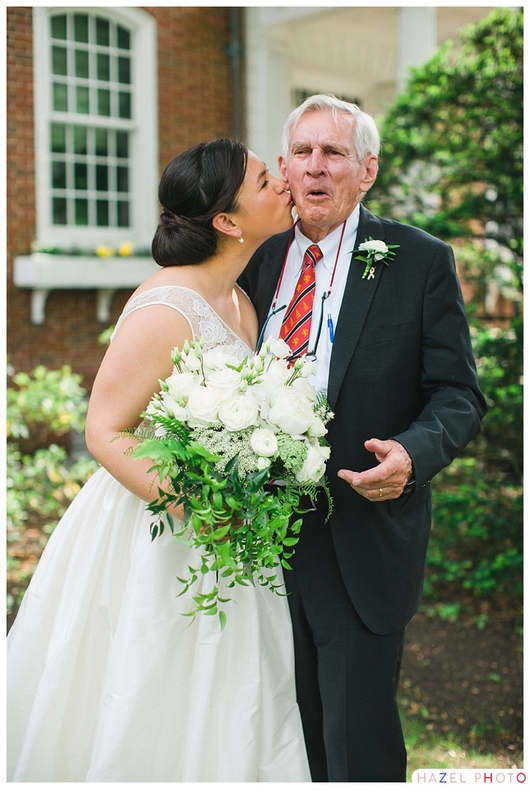 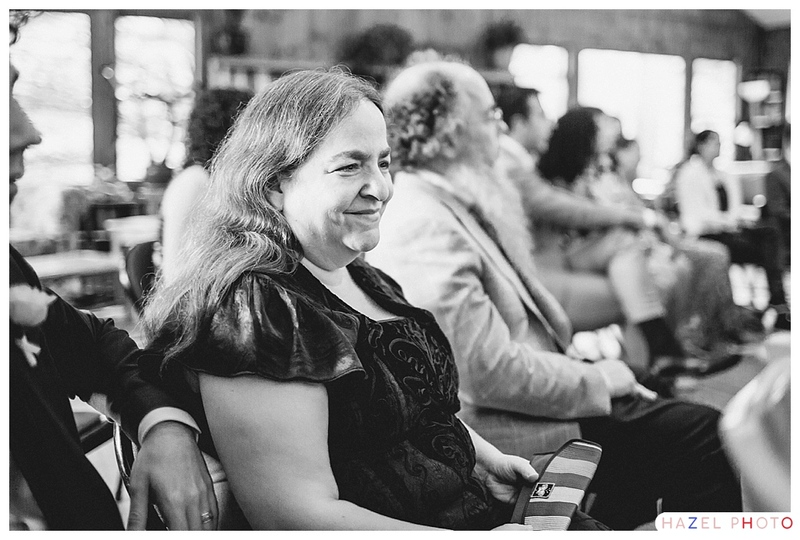 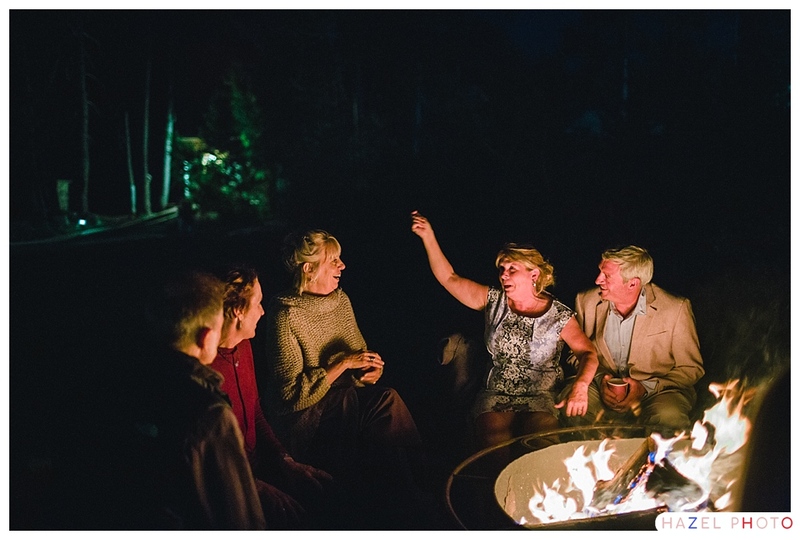 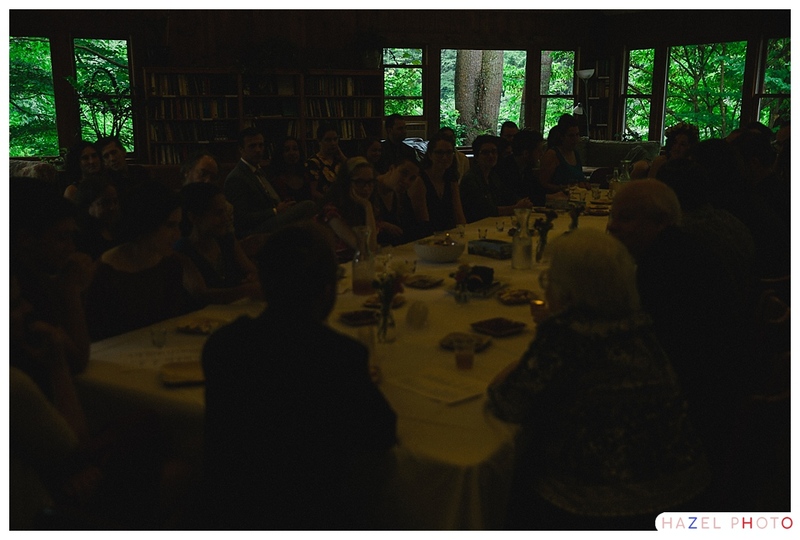 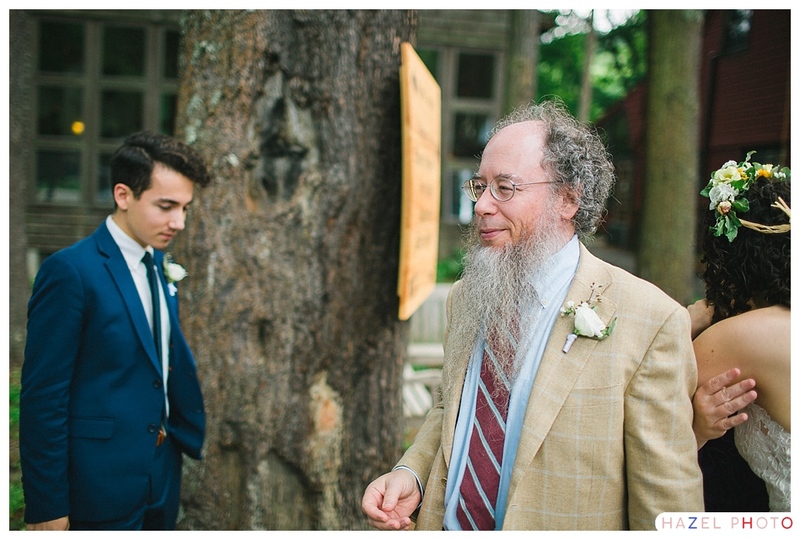 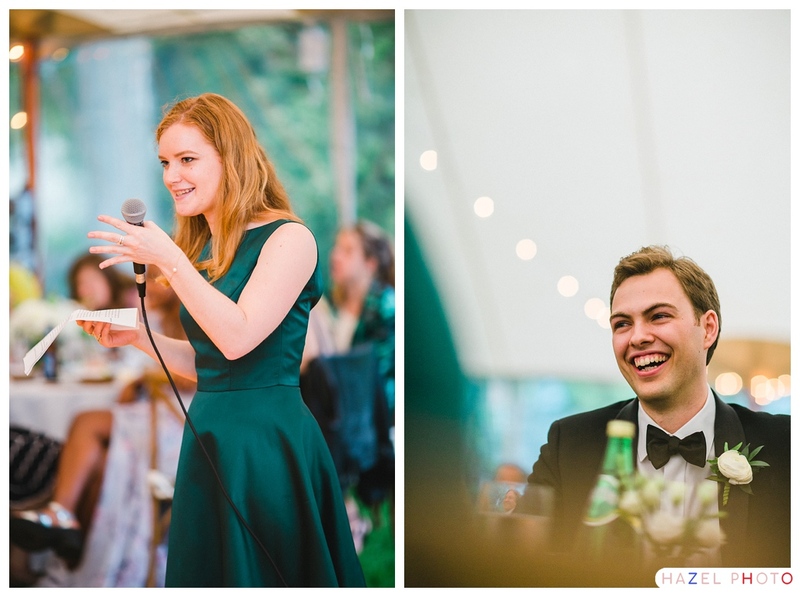 She is an incredible storyteller, and went into detail in her initial query about the history of her grandma and grandpa’s house where the reception would be held. 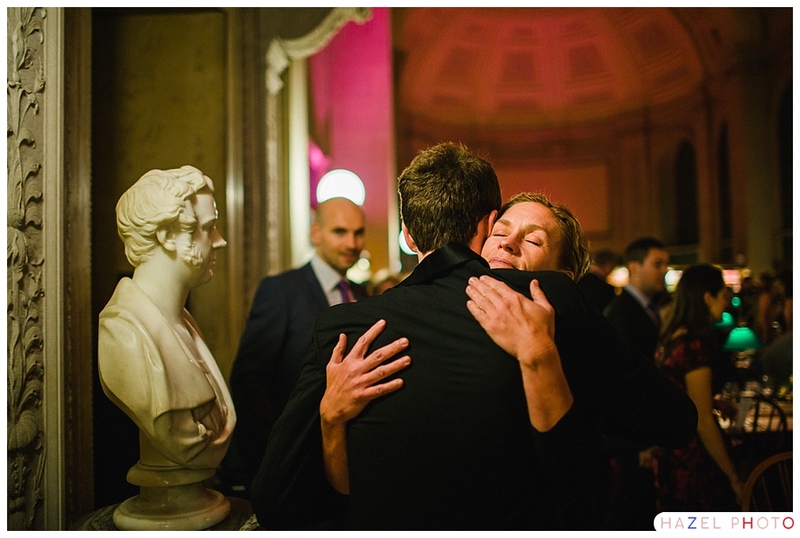 The house actually had it’s 300th birthday this year. 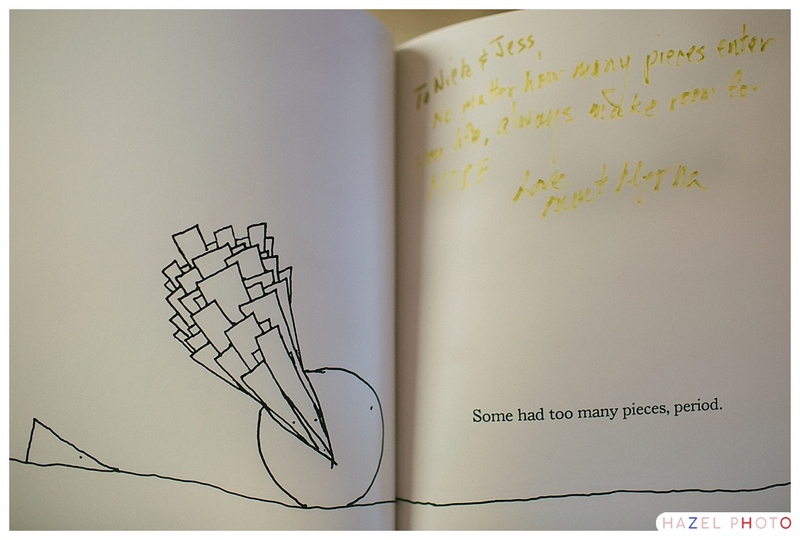 There was a fabled apple tree, apple pies, peach jam, and a grapevine Robert Frost had written a poem about. 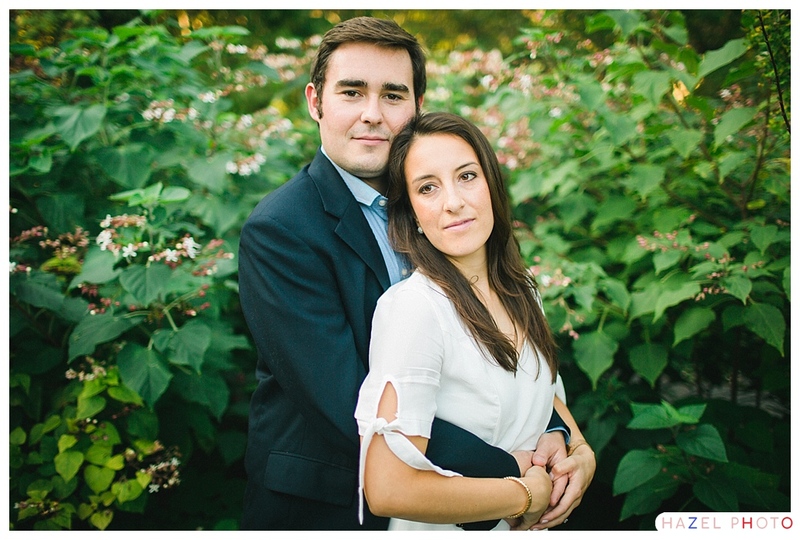 Jocelyn and Tom were high school sweethearts at Exeter where they both rowed on the crew team. 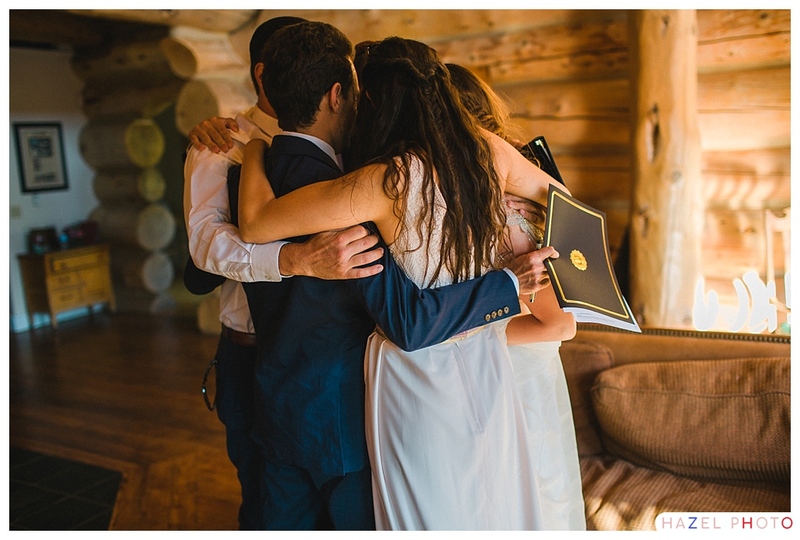 Very sad for me! 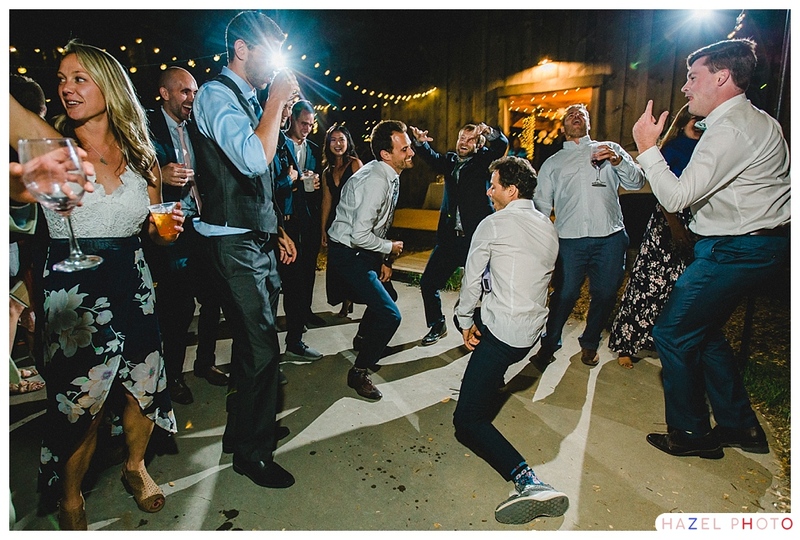 I was booked Sunday, but I was available Saturday, so I cheekily suggested they change the date of the wedding to Saturday. 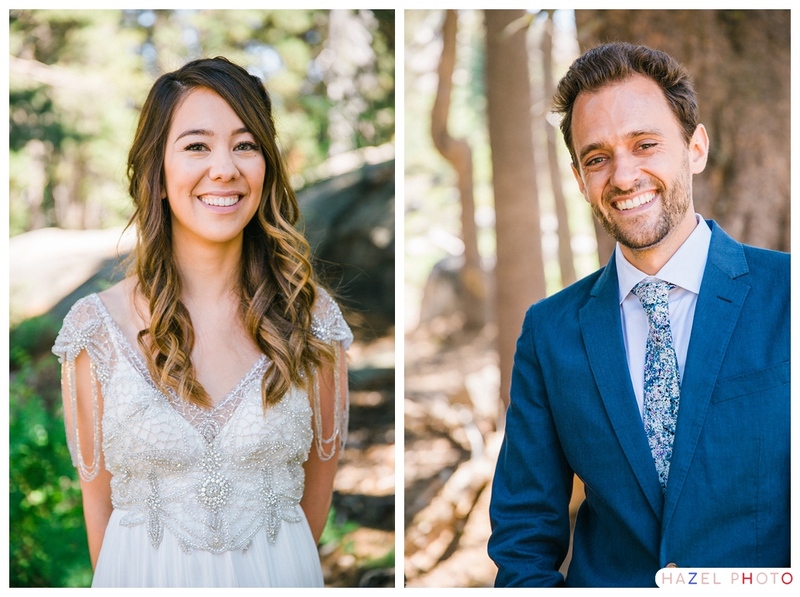 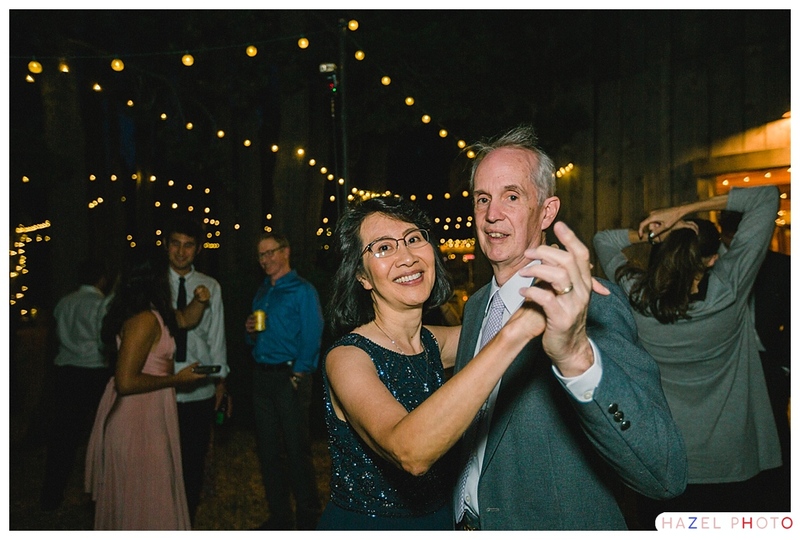 By mere chance, or some celestial tinkering, Jocelyn and Tom changed their wedding date to Saturday, and booked me as their photographer! 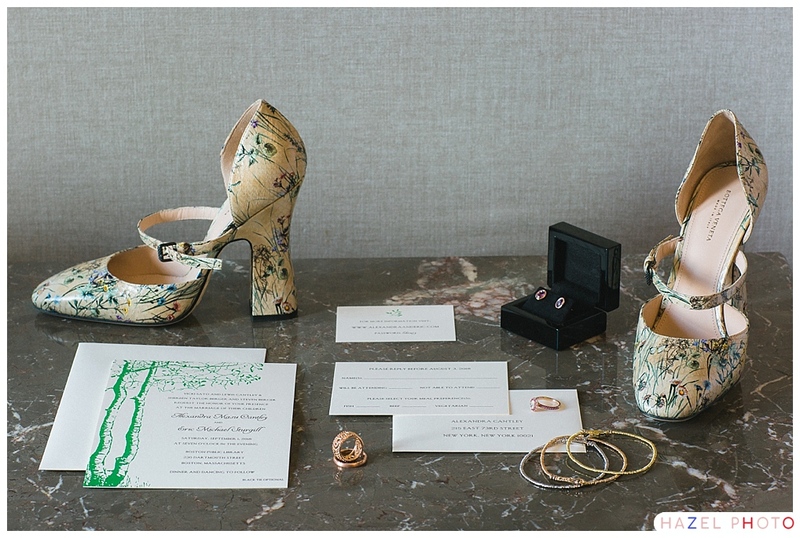 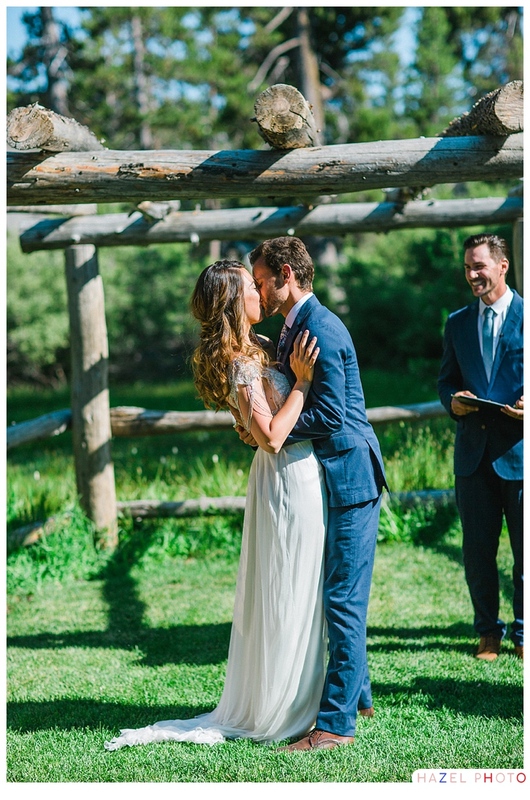 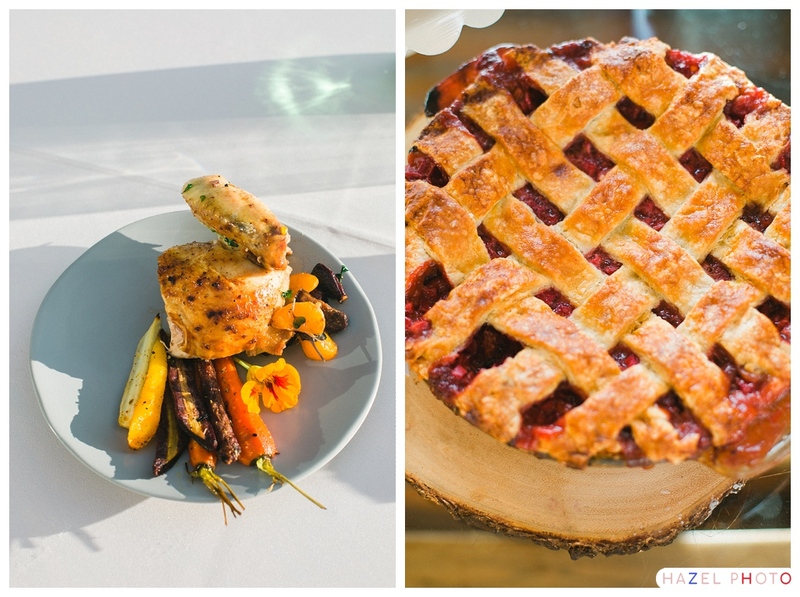 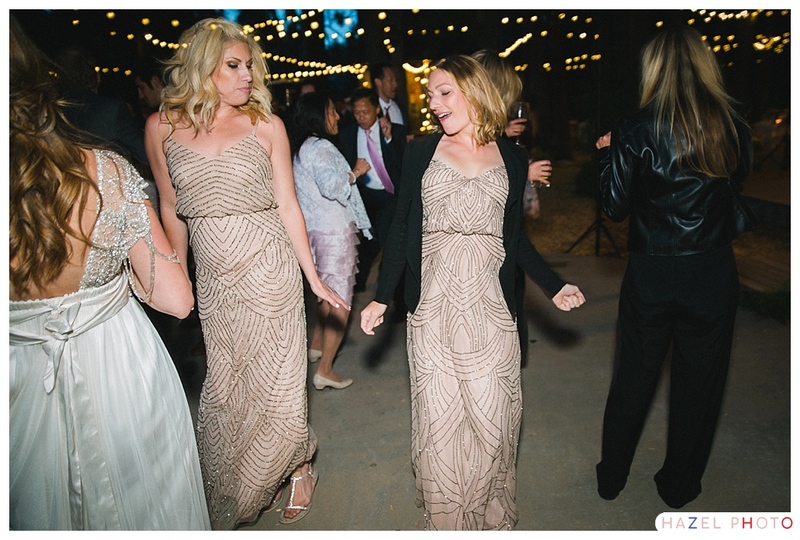 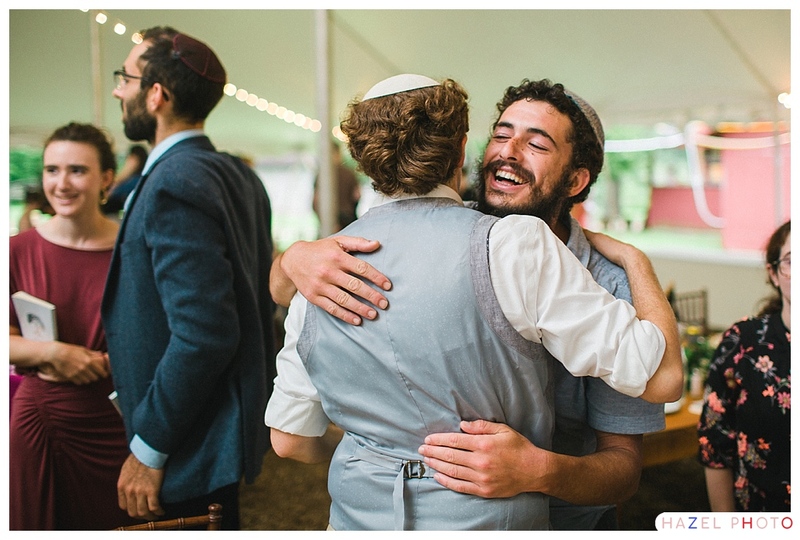 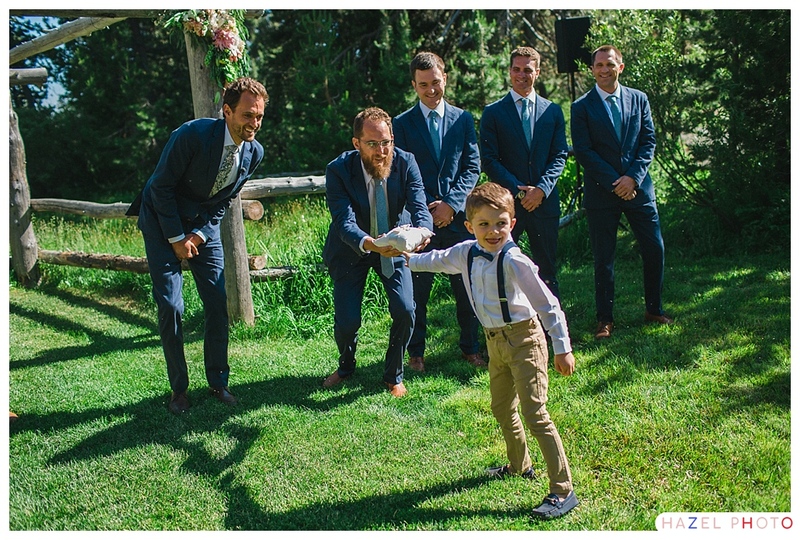 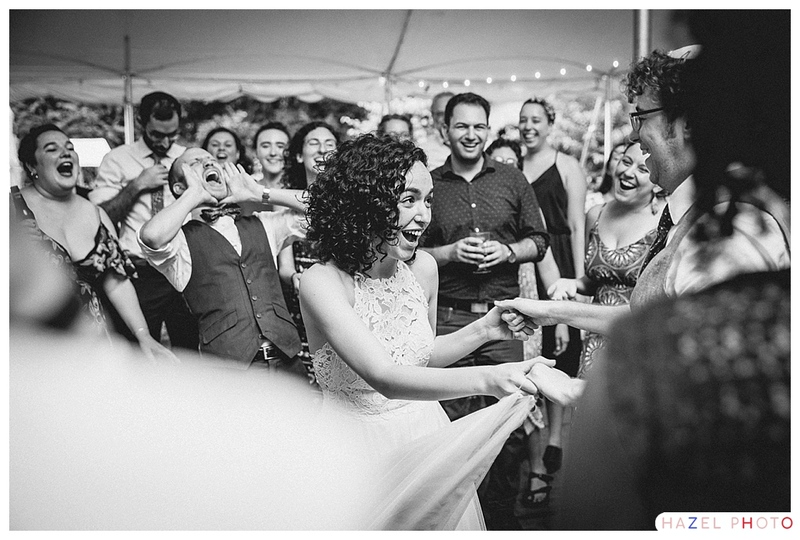 I anticipated the wedding with excitement all year long, and when it finally came to pass, it did not disappoint. 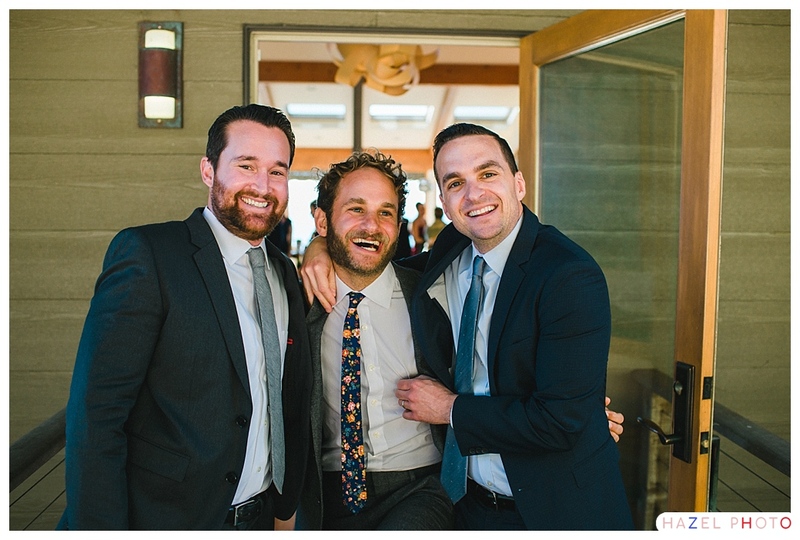 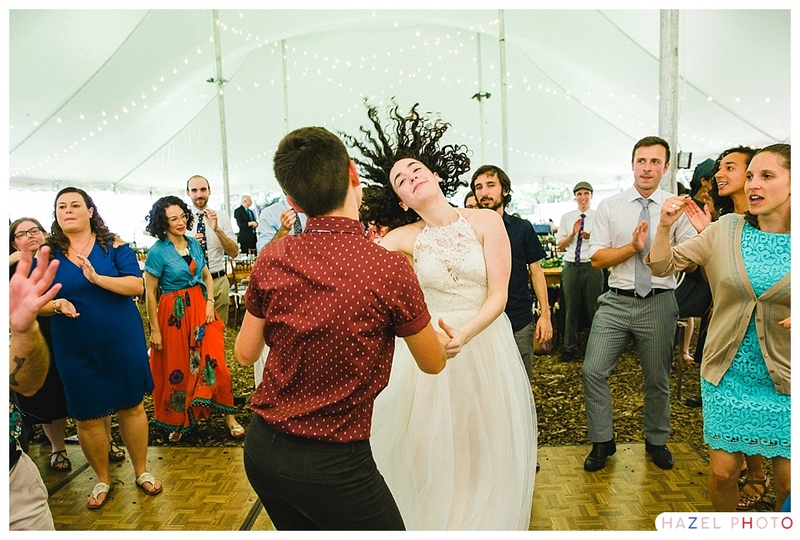 The wedding was a classic. 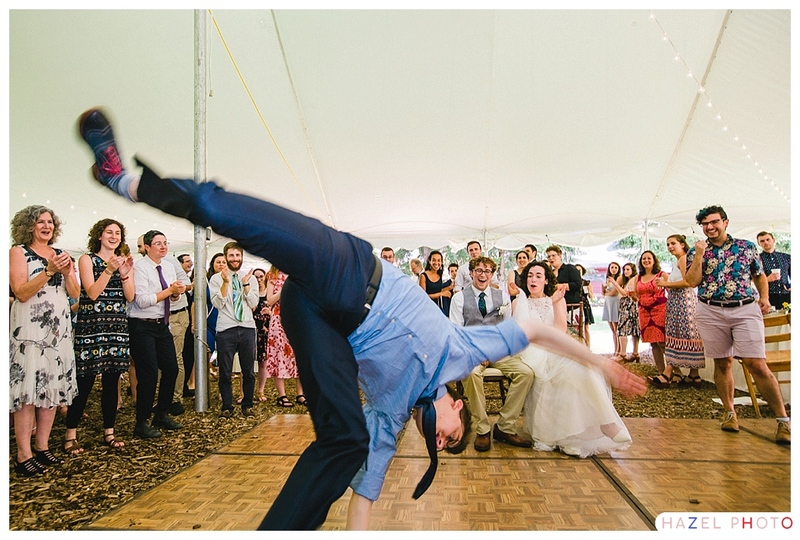 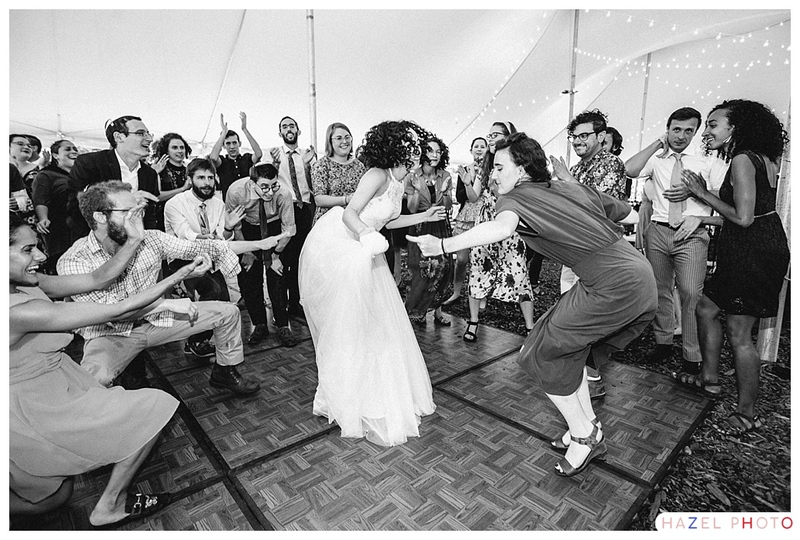 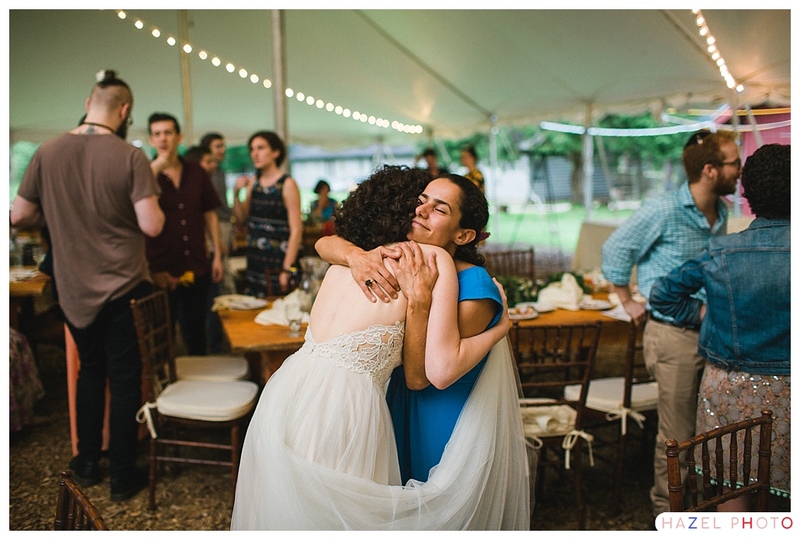 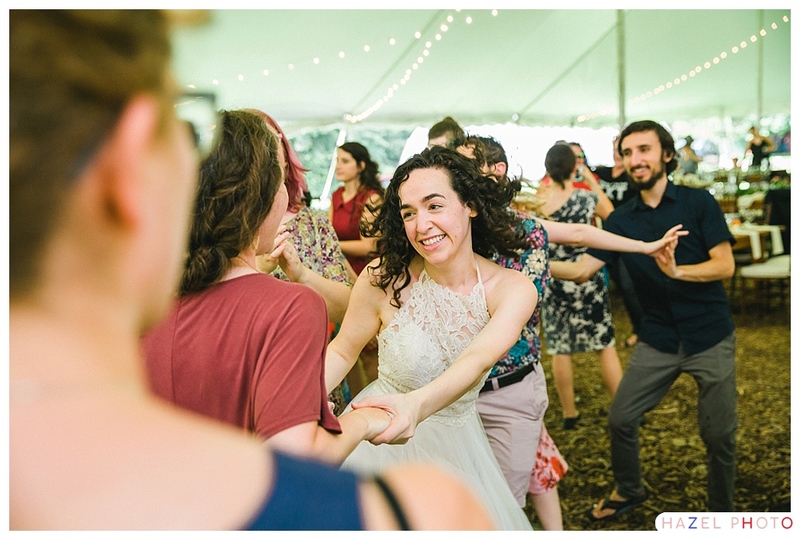 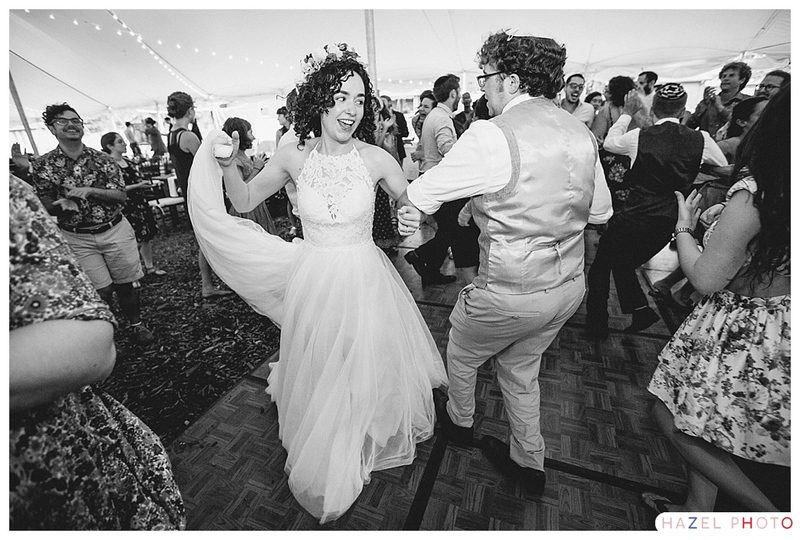 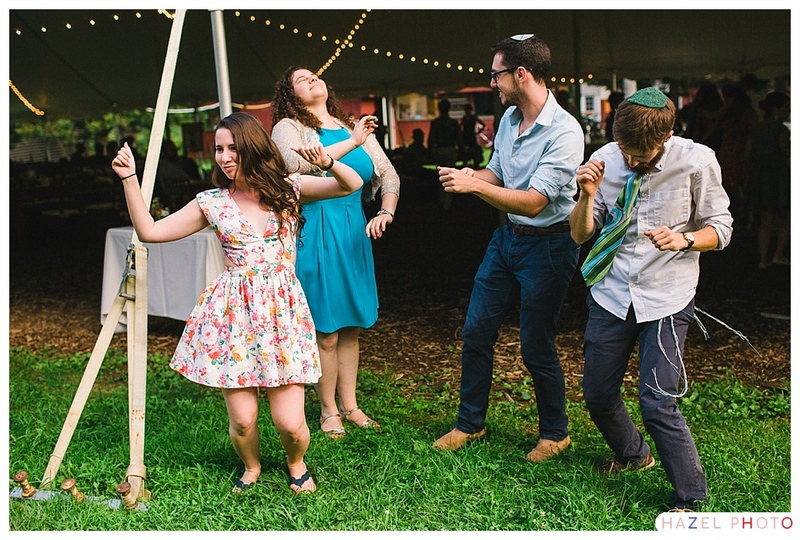 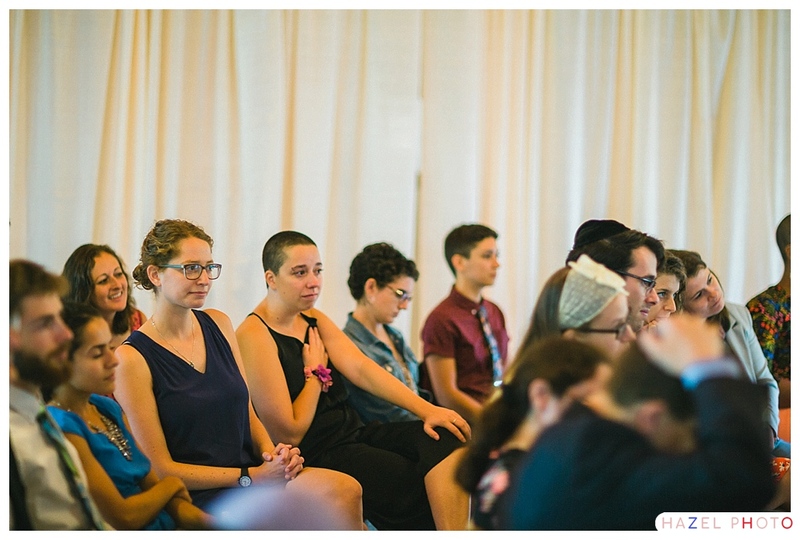 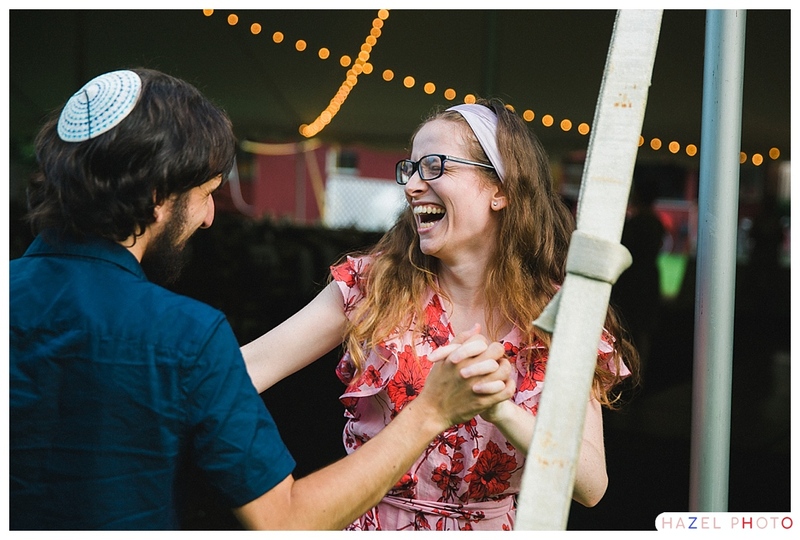 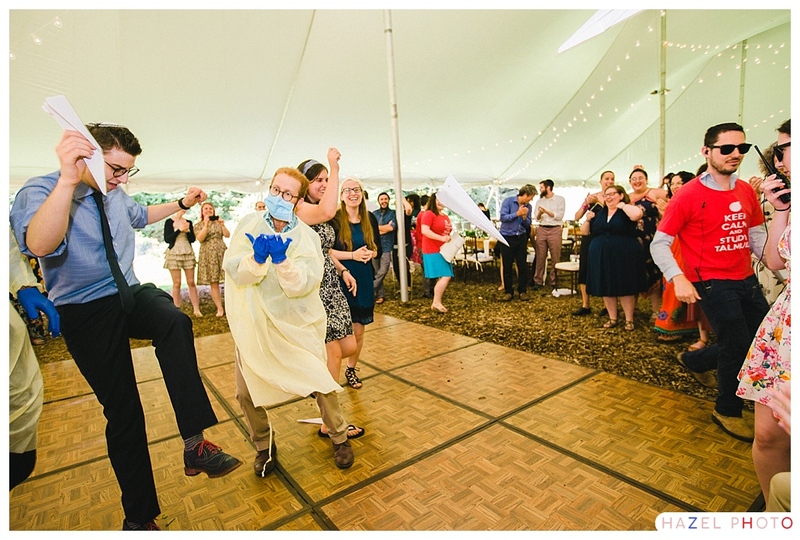 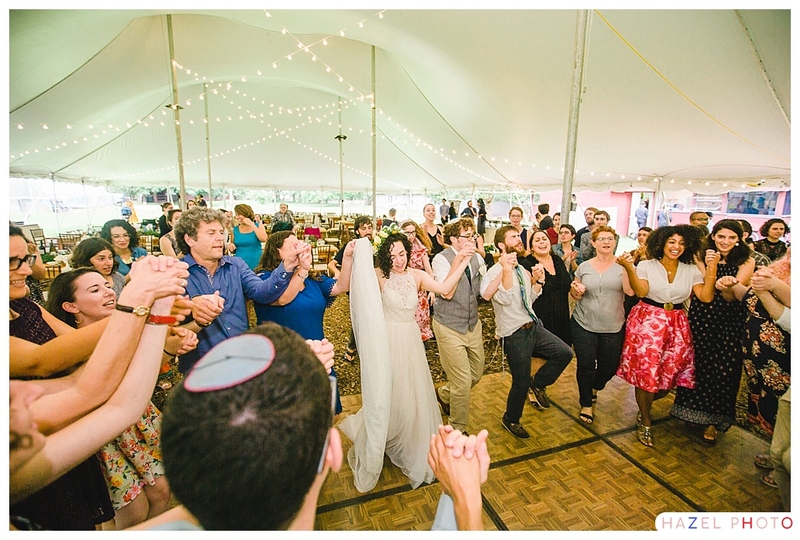 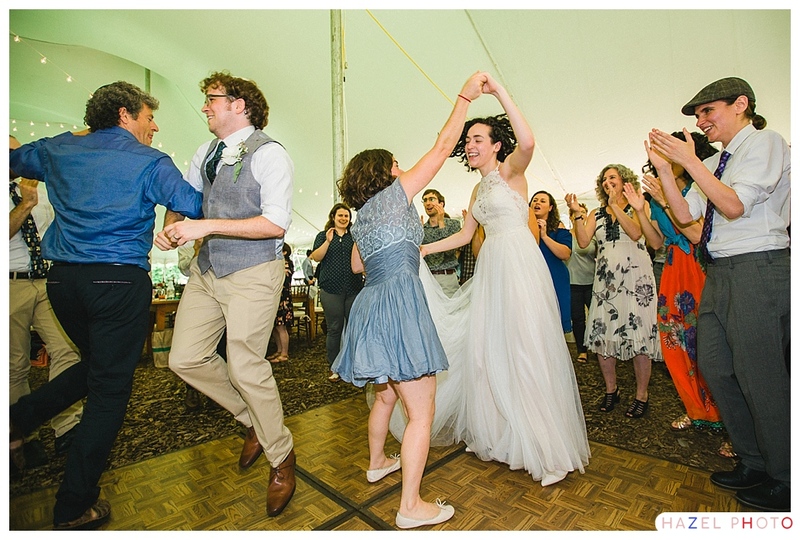 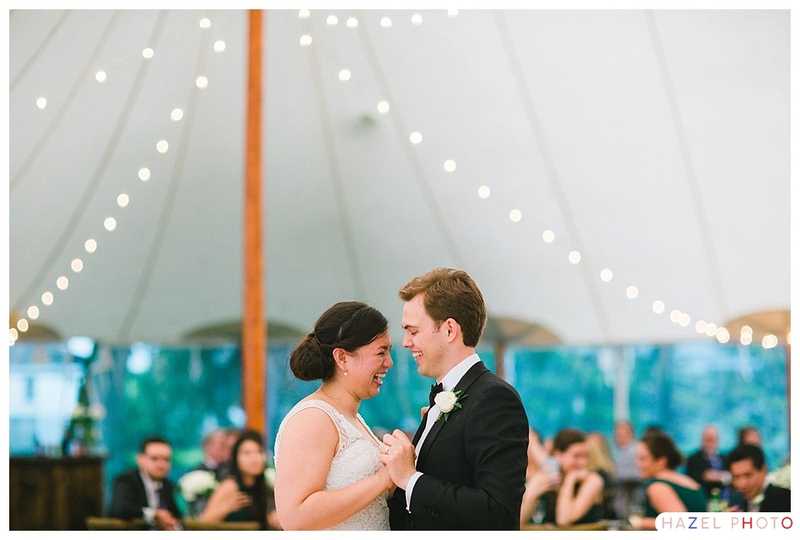 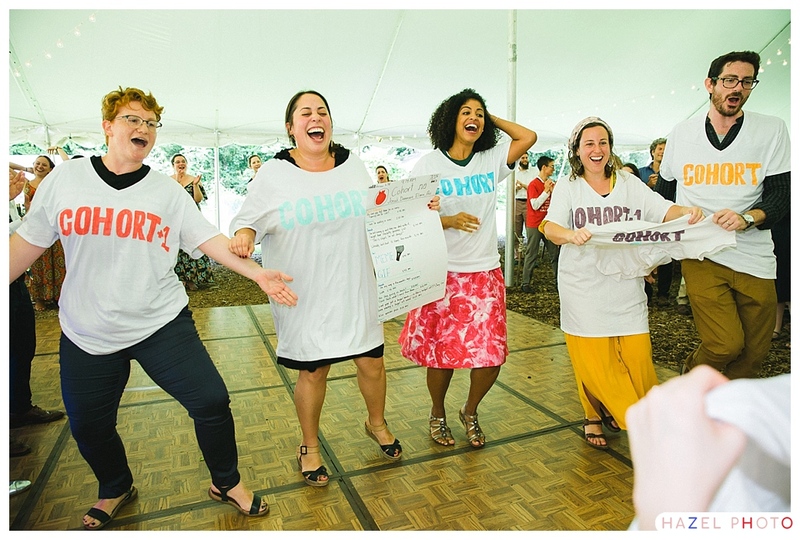 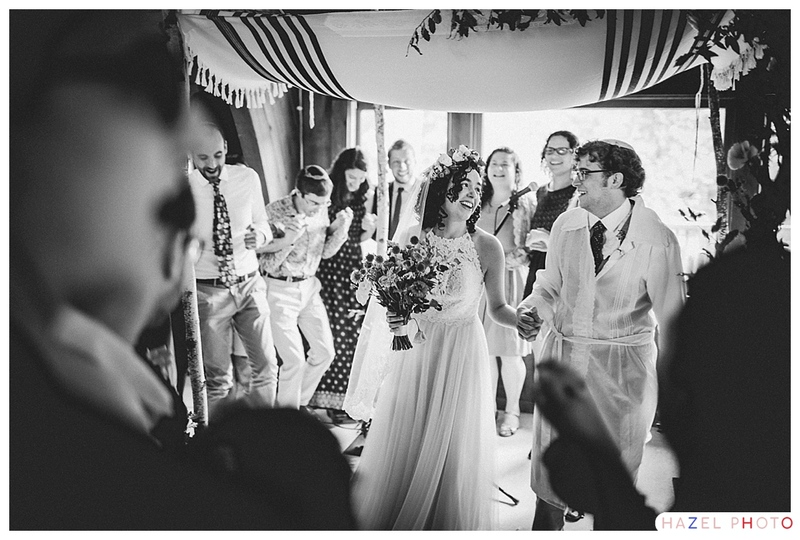 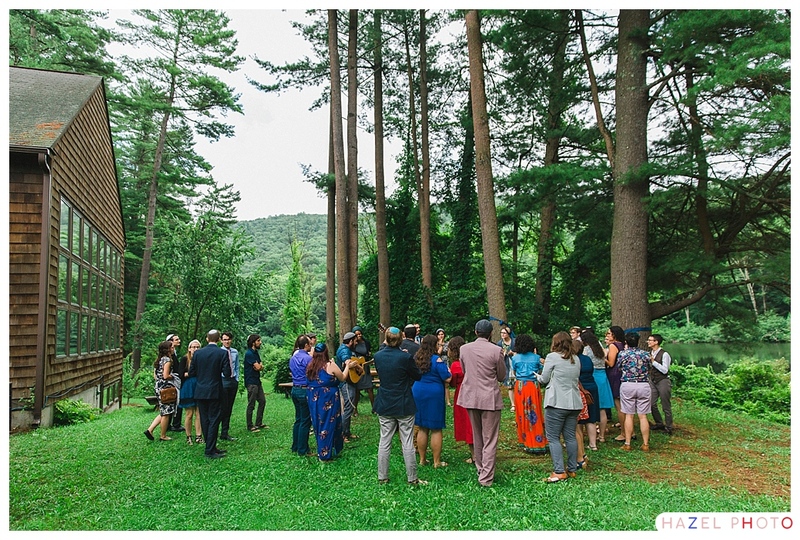 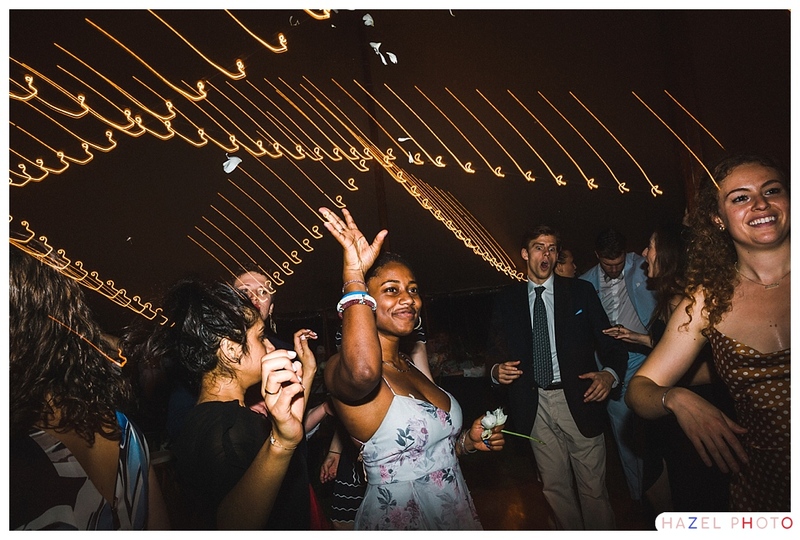 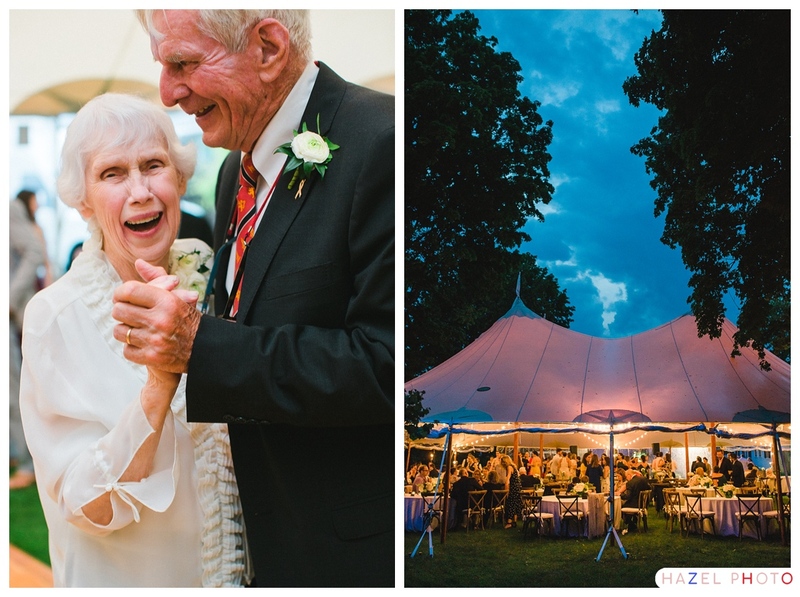 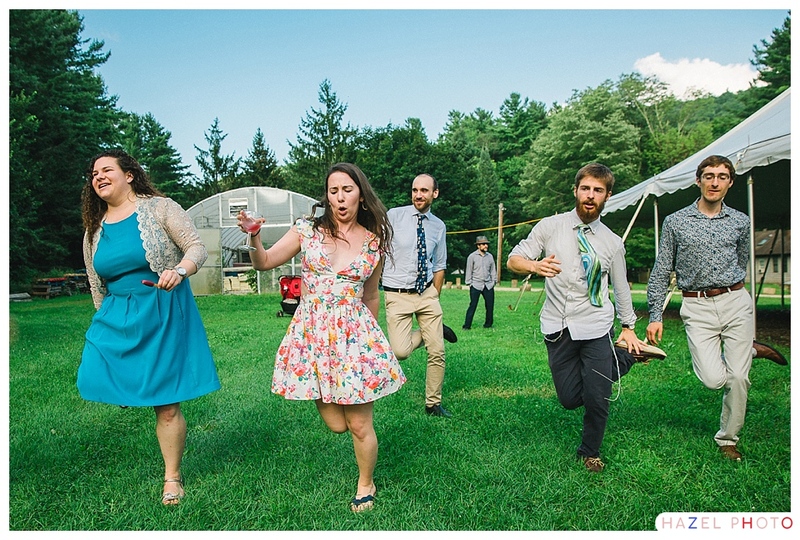 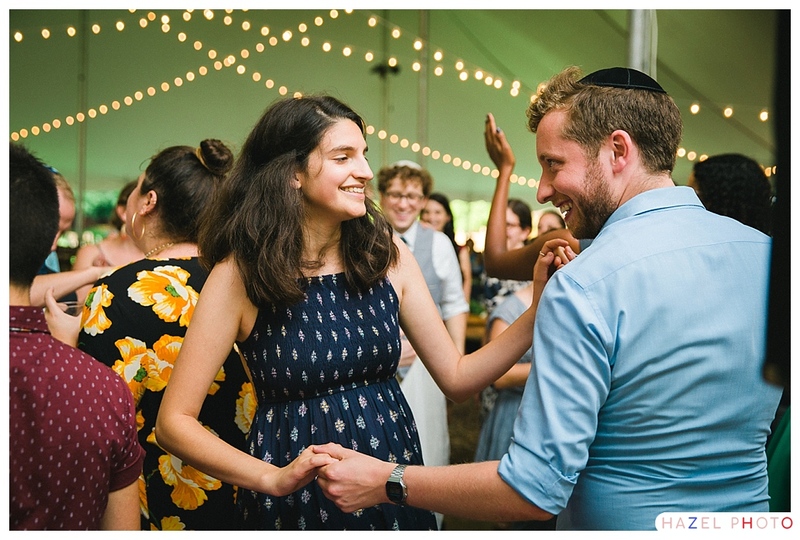 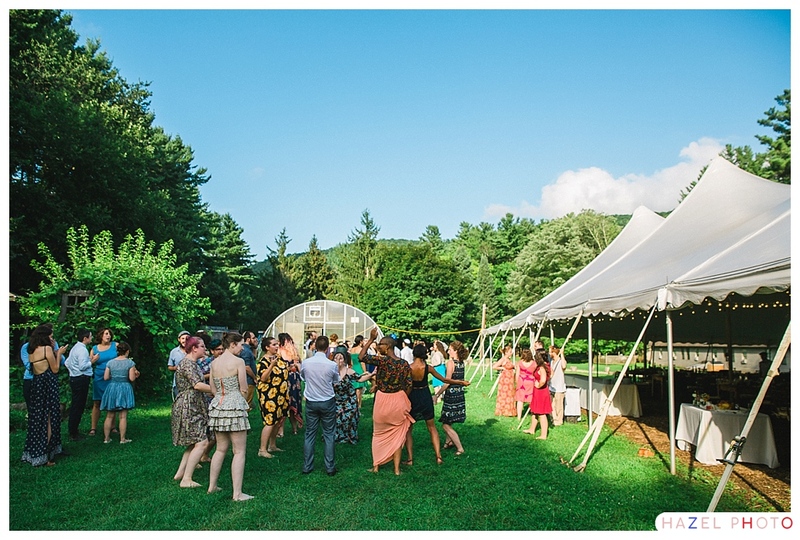 It started in the Exeter church, and ended with joyous dancing under a topsail tent. 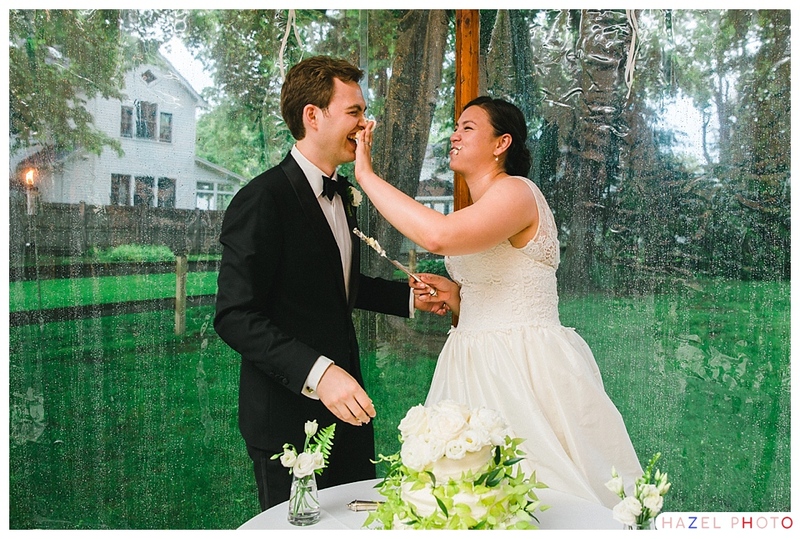 The thing that struck me most about their wedding was how right it felt. 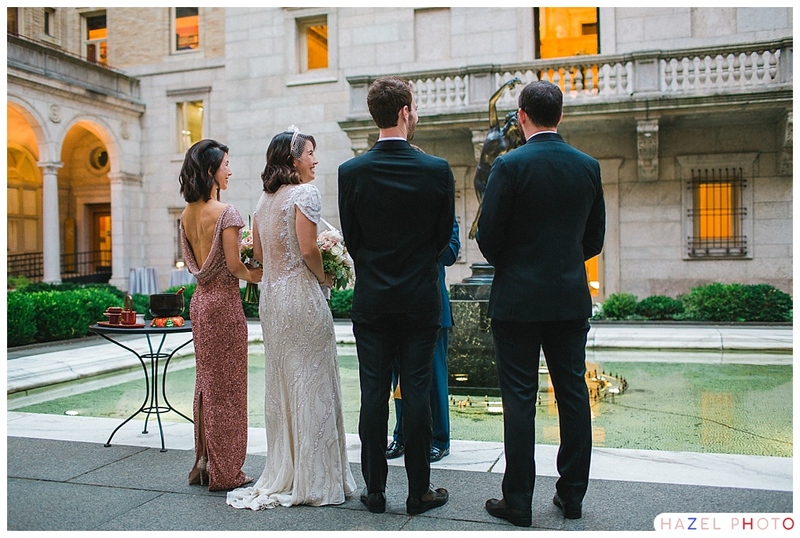 They were surrounded by family and friends who could see with great clarity how happy Jocelyn and Tom made each other and what an incredible match the two made. 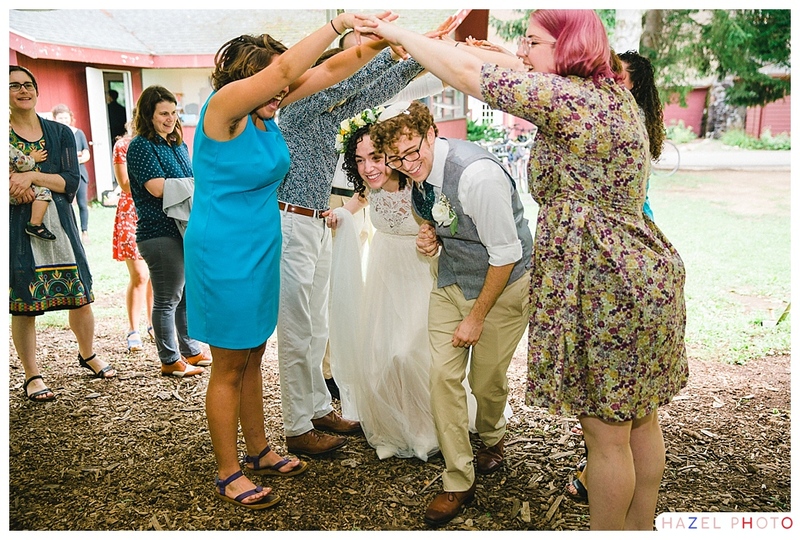 Each, in their own right, is a force to be reckoned with, but together, they are indomitable. 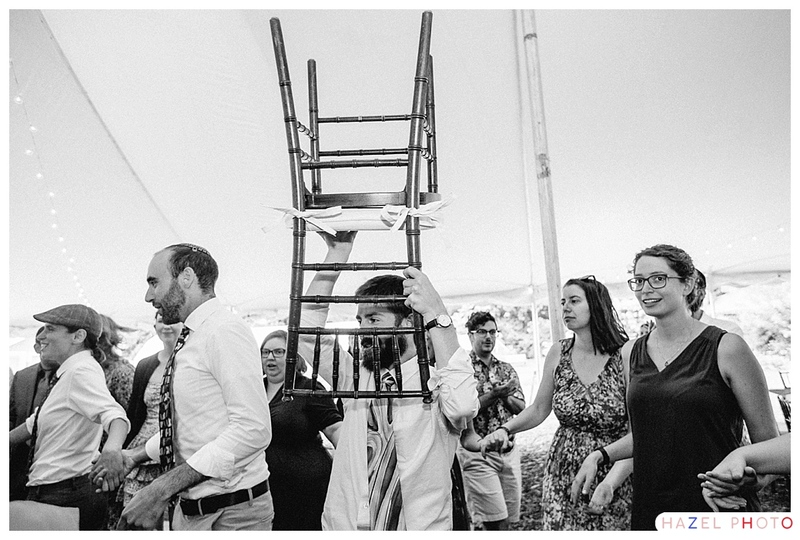 Woe to anyone who should impede their path. 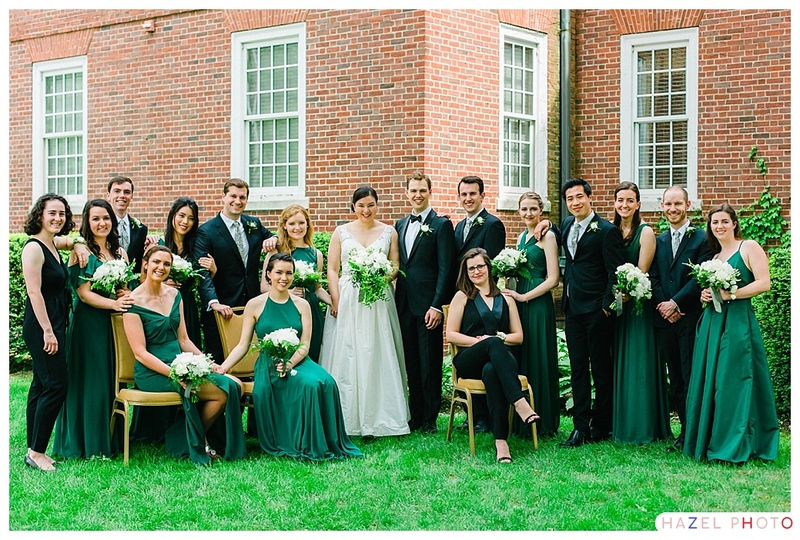 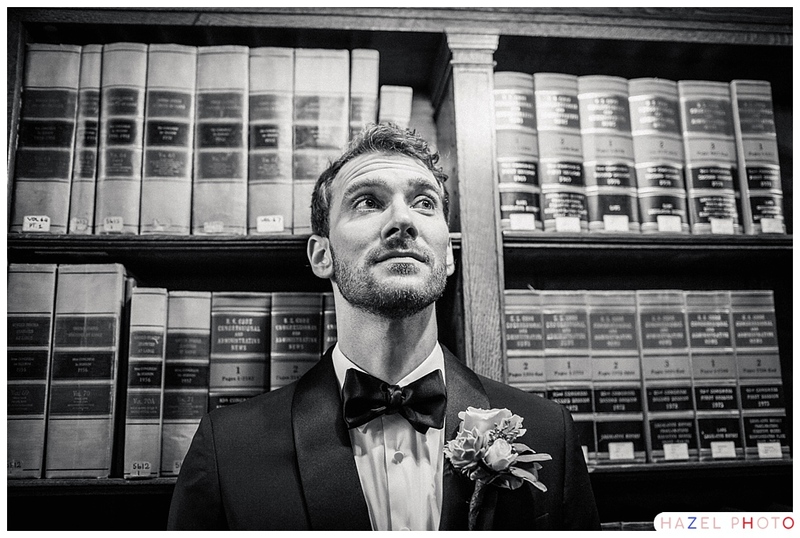 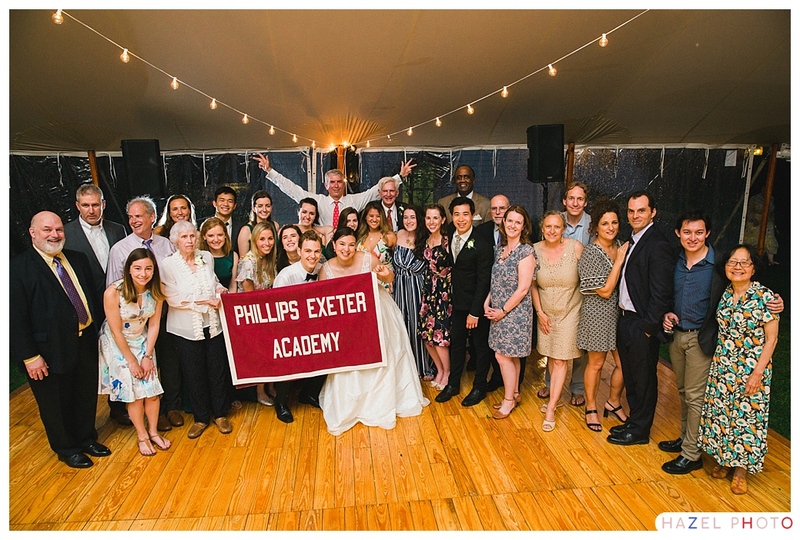 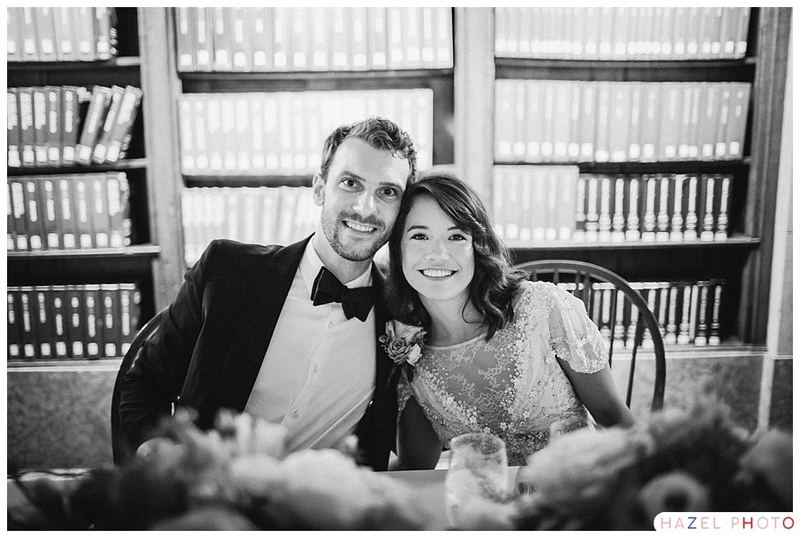 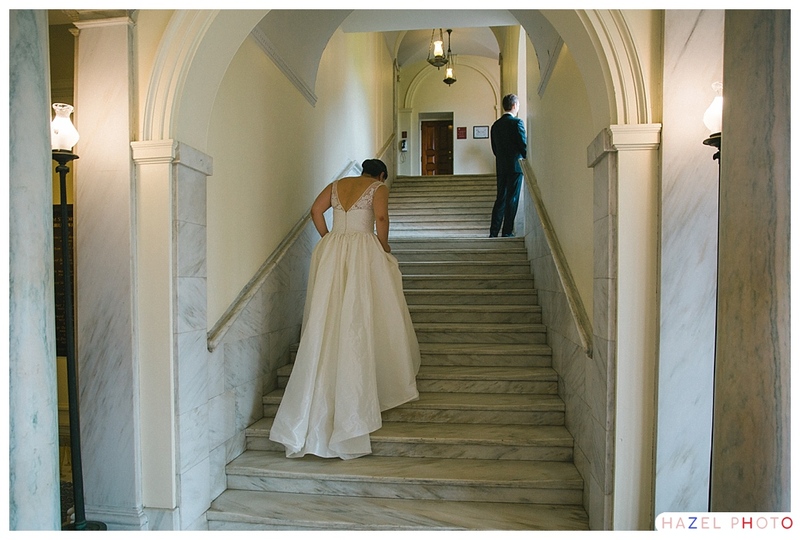 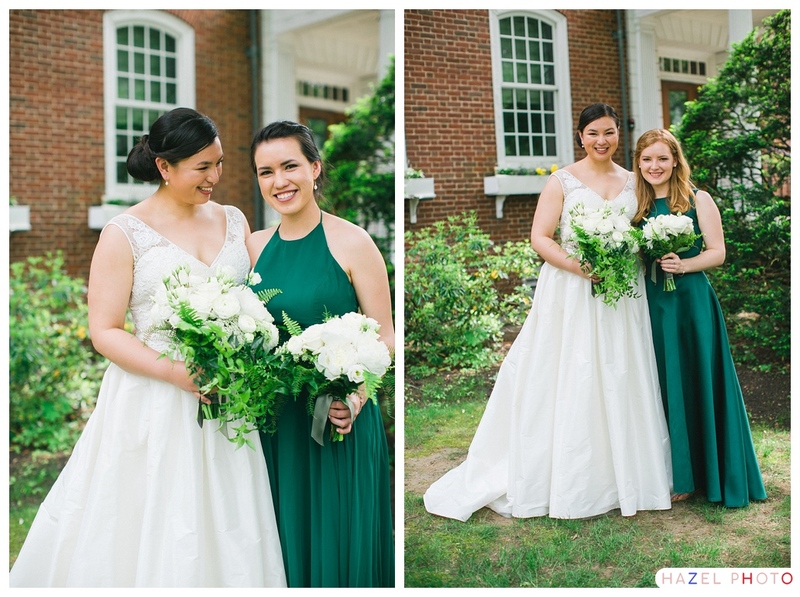 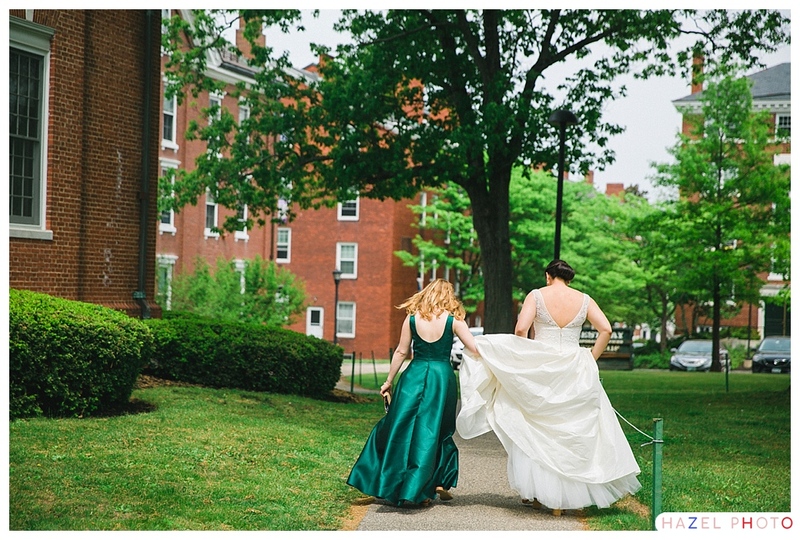 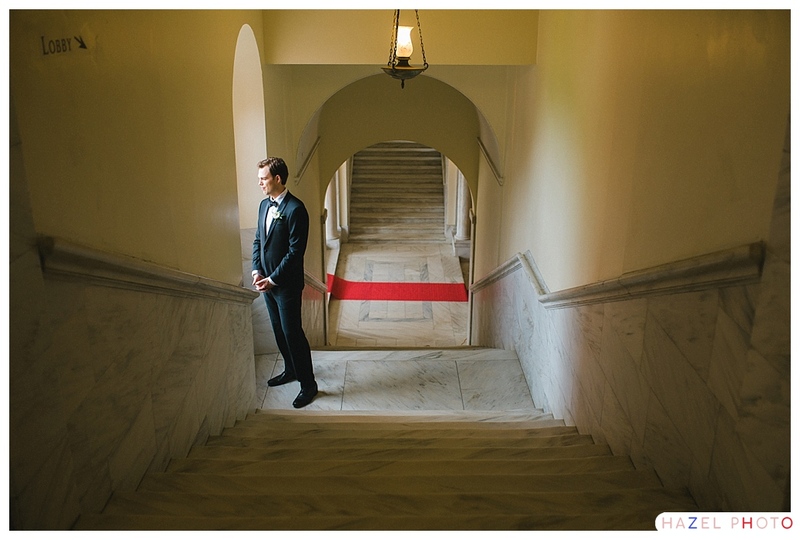 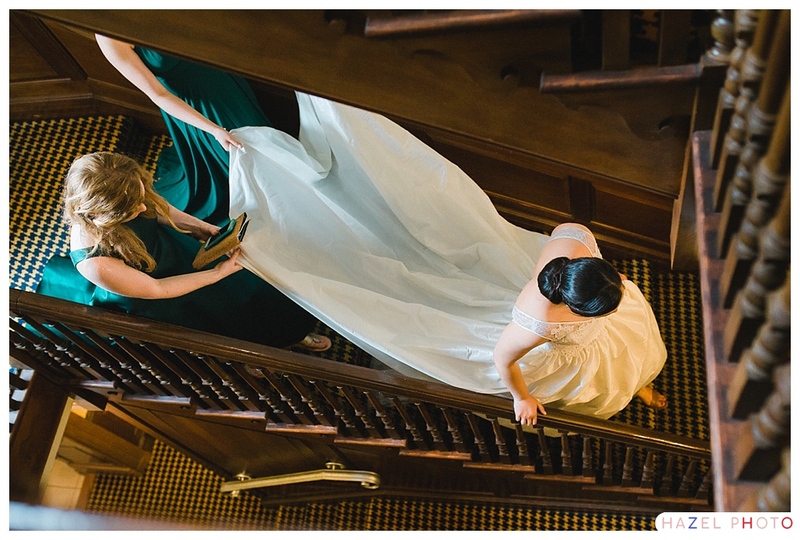 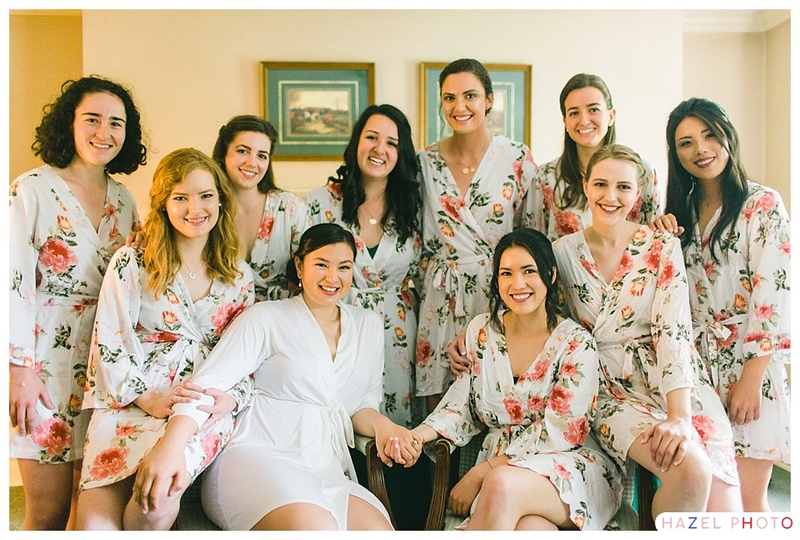 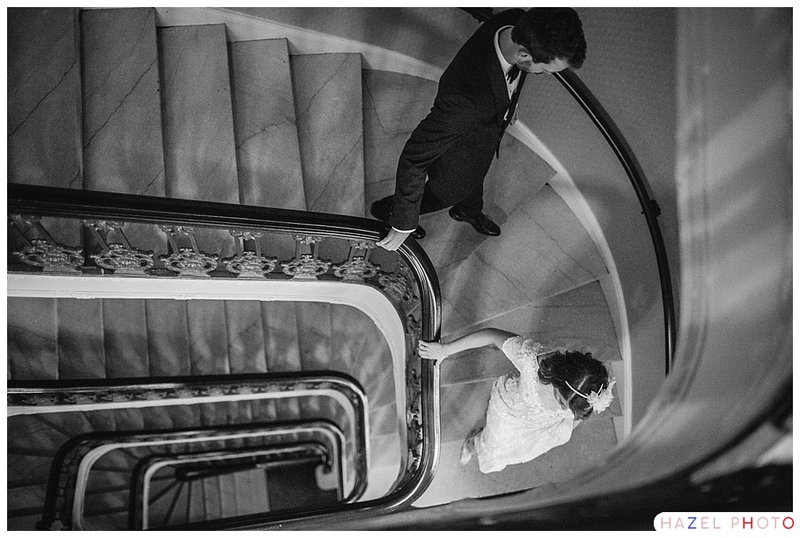 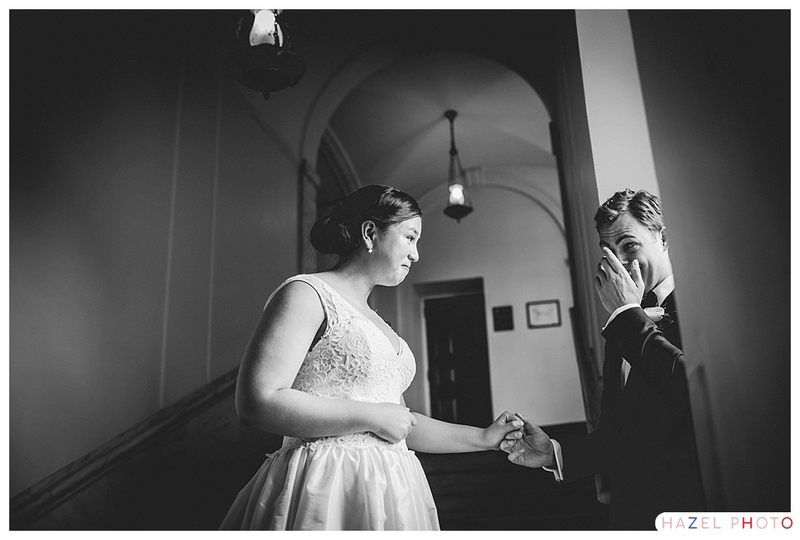 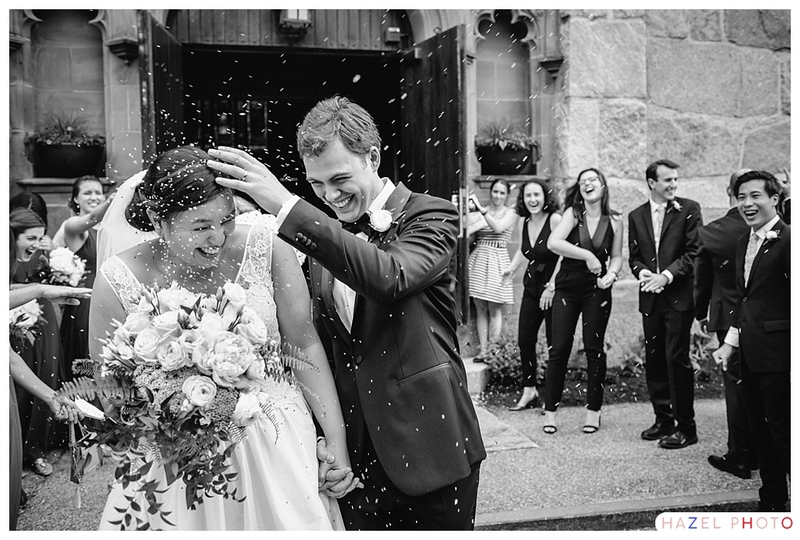 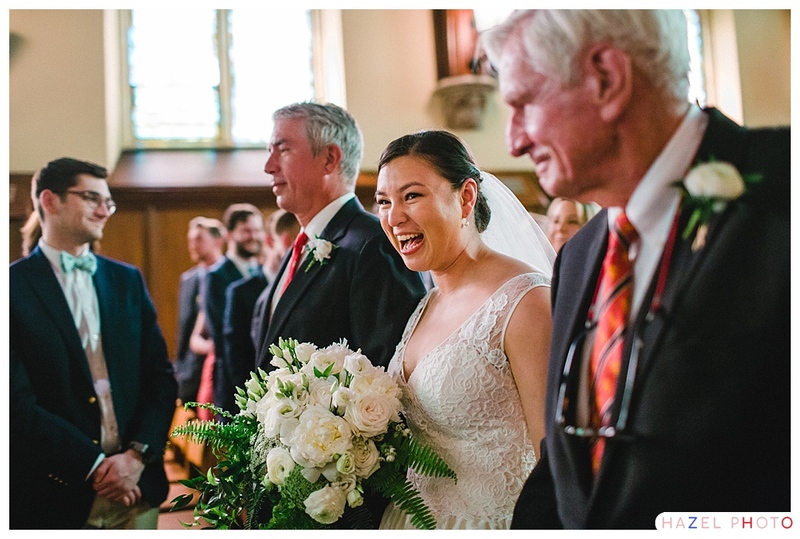 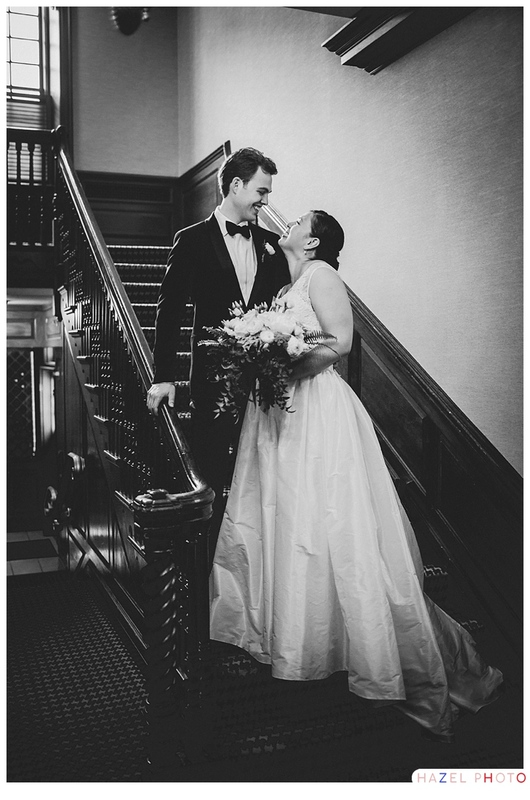 They had their first look on a worn marble staircase at Phillips Exeter Academy where they had first met and forged their connection. 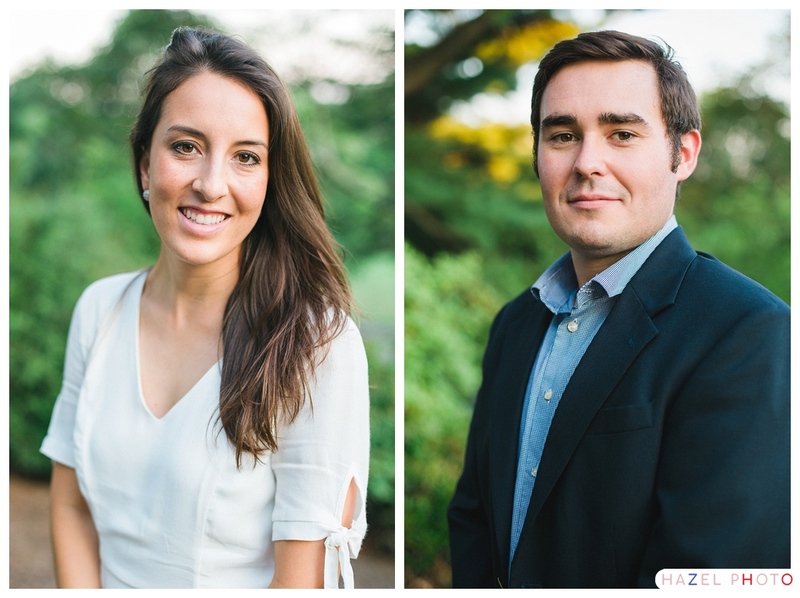 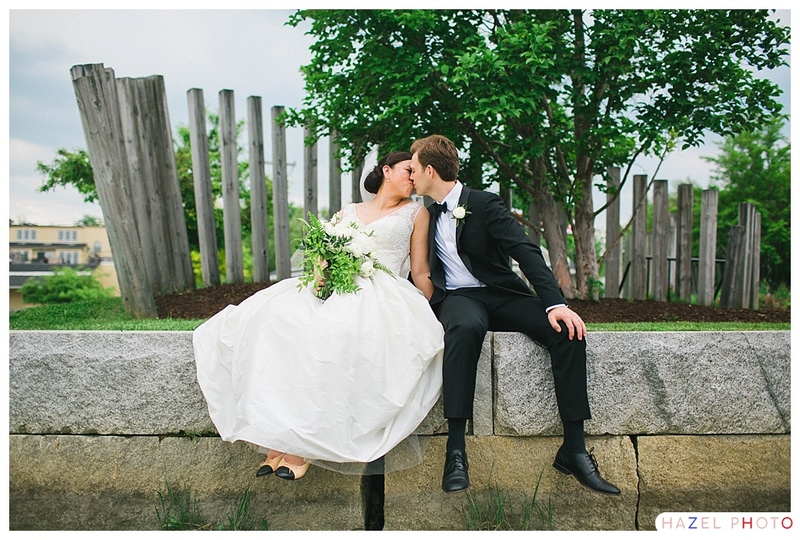 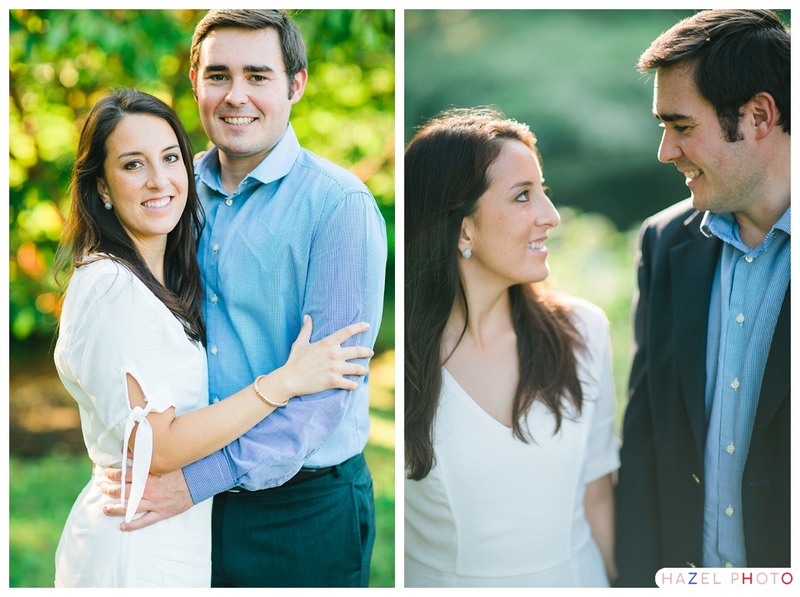 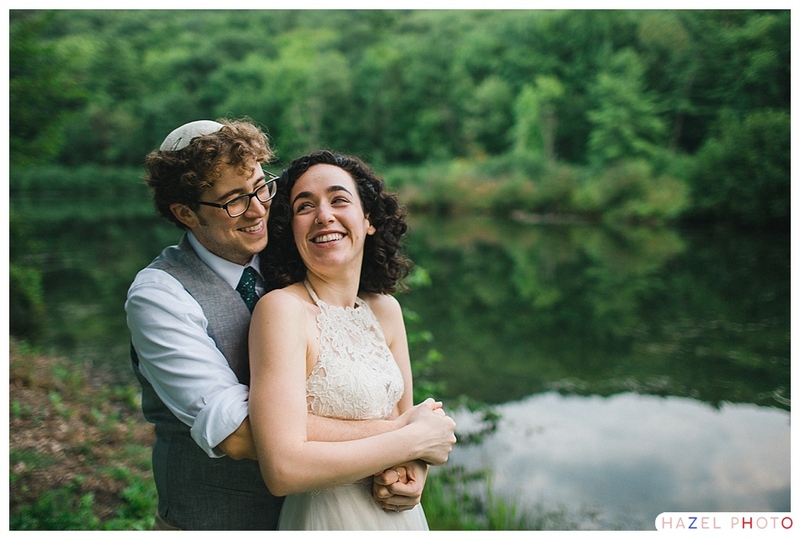 I made couples portraits of the two down at the Exeter Boathouse, the site of their first date! 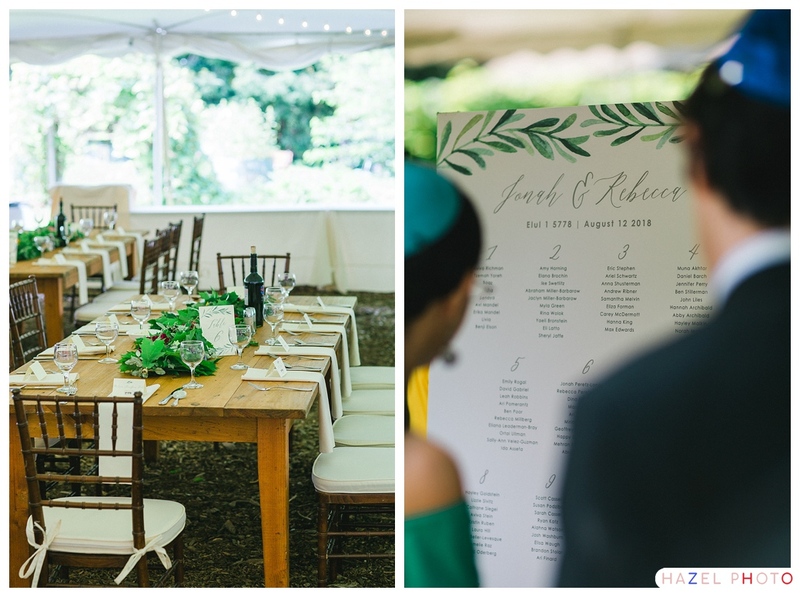 I could go on and on about the wonders of their wedding… Thank you again for being so lovely to work with, Jocelyn and Tom. 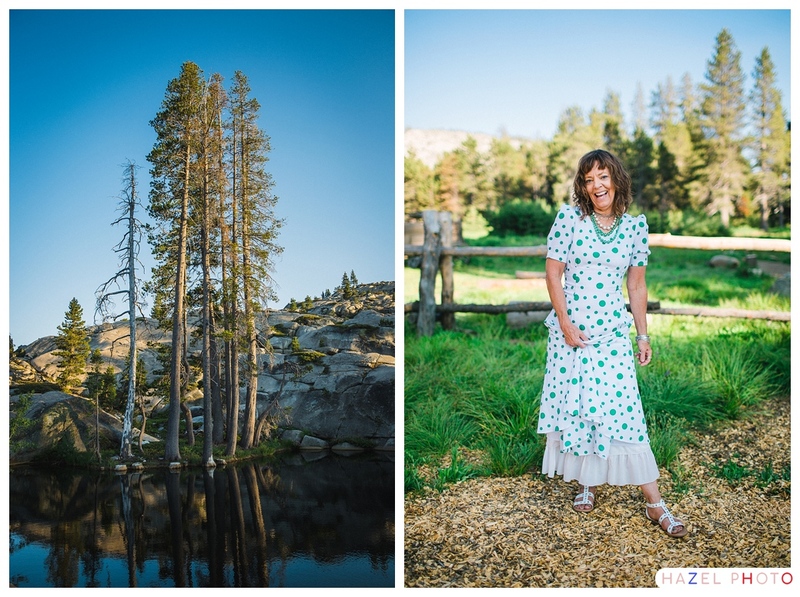 Many many thanks to the talented Cara Brostrom for coming on as a 2nd photographer. 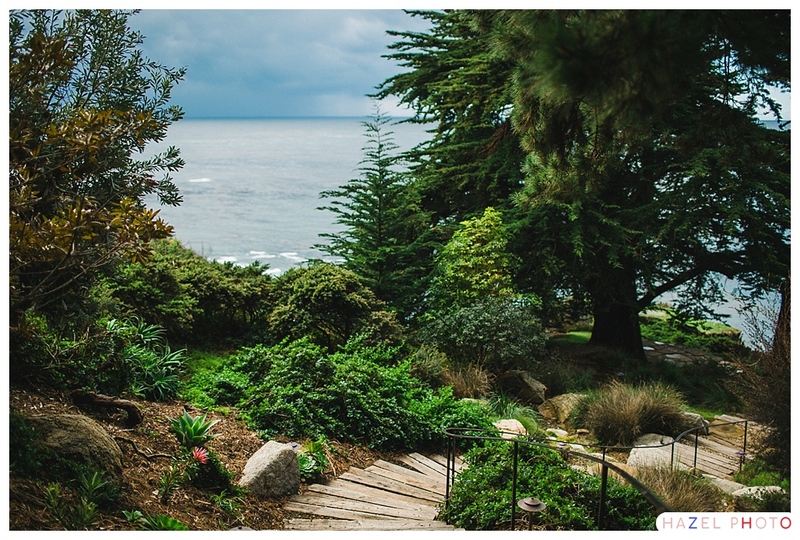 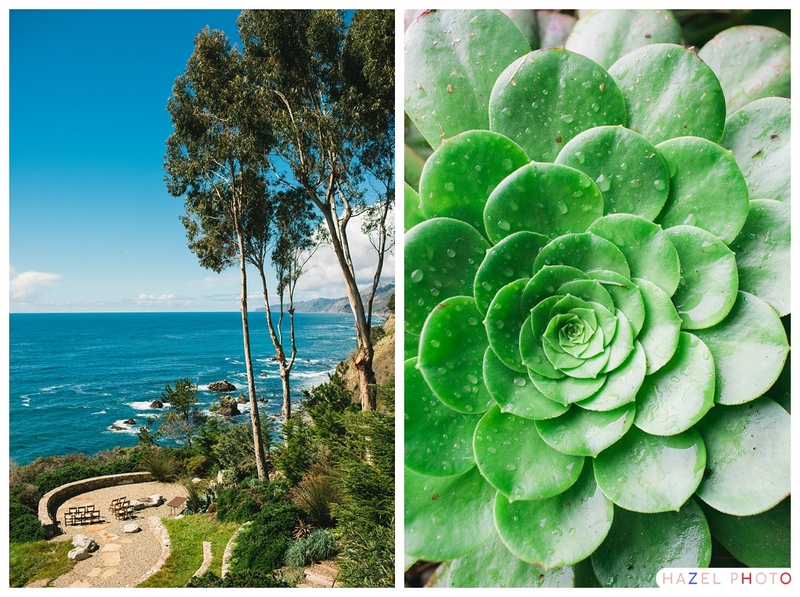 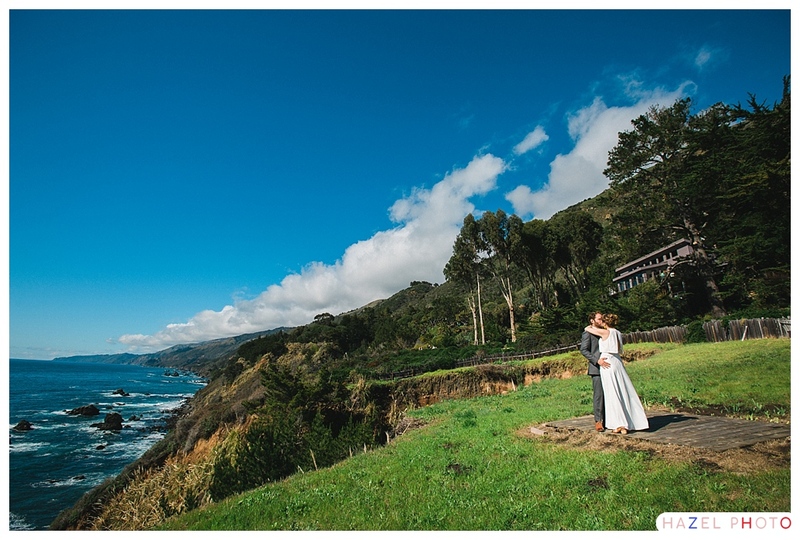 This was my first time photographing a wedding in Big Sur, and the landscape did not disappoint. 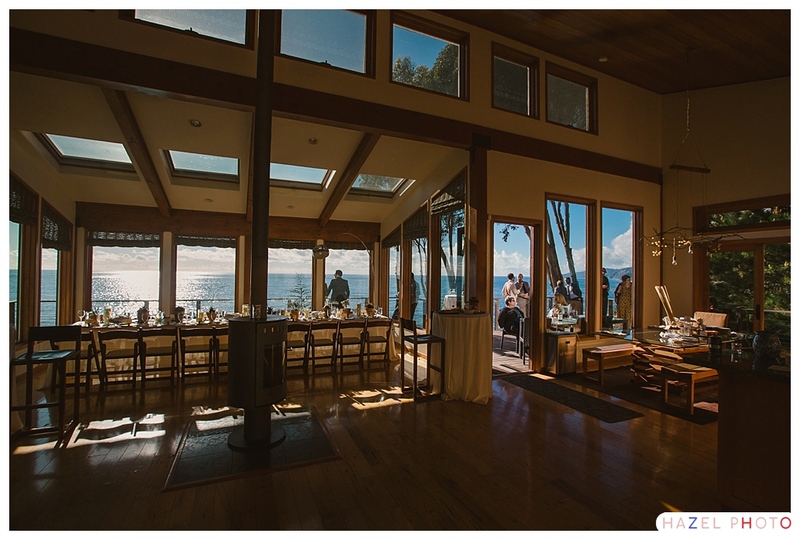 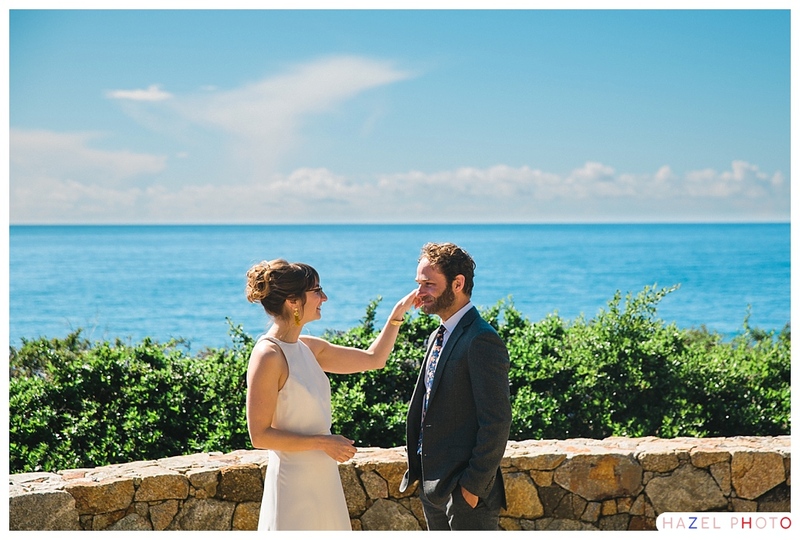 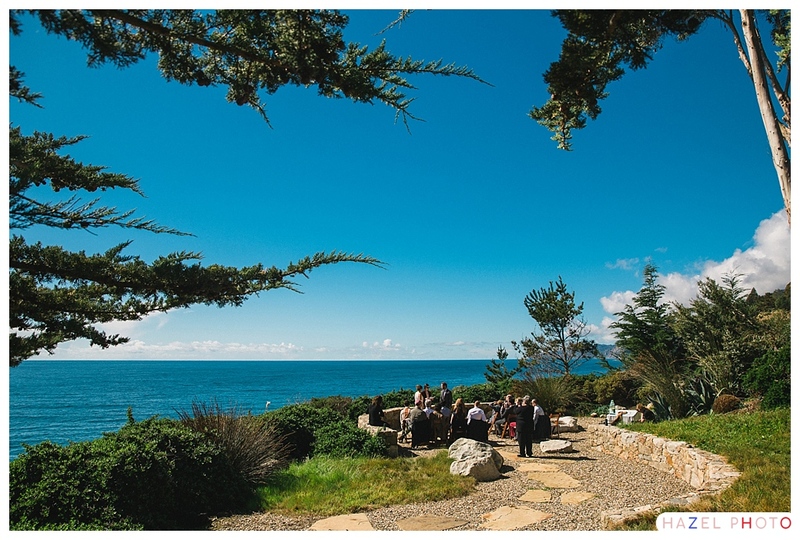 There are reasons to get married in a setting as beautiful as the Wind and Sea Estate. 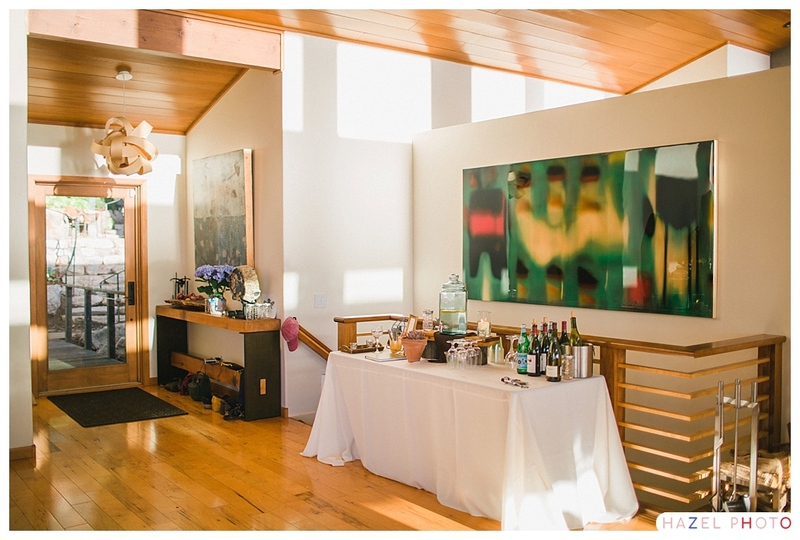 You need less decor! 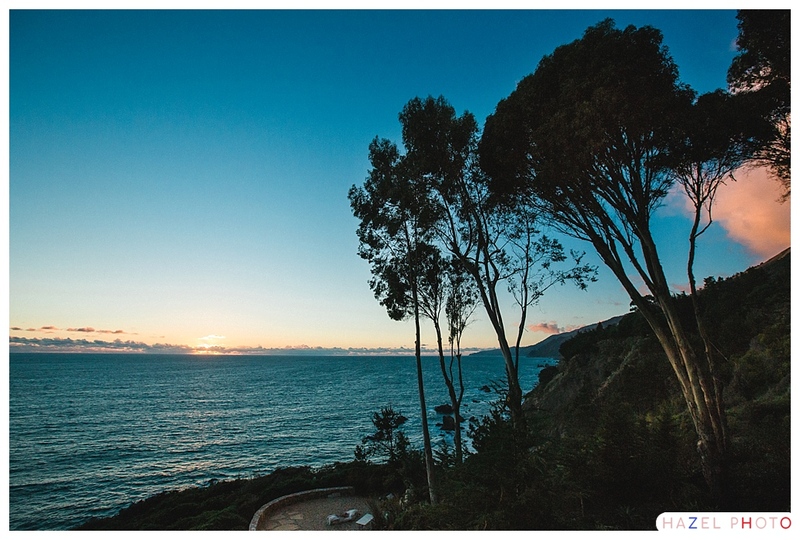 Just look how the landscape and the light change color as the day proceeds. 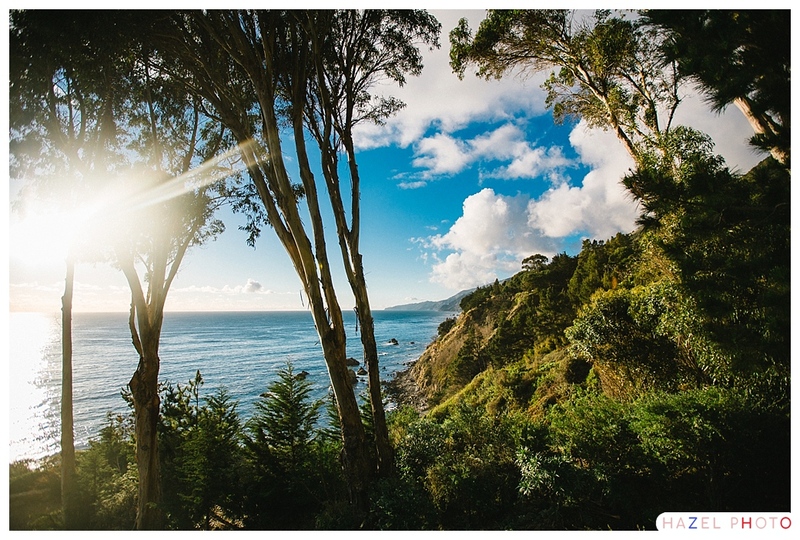 That’s California for you. 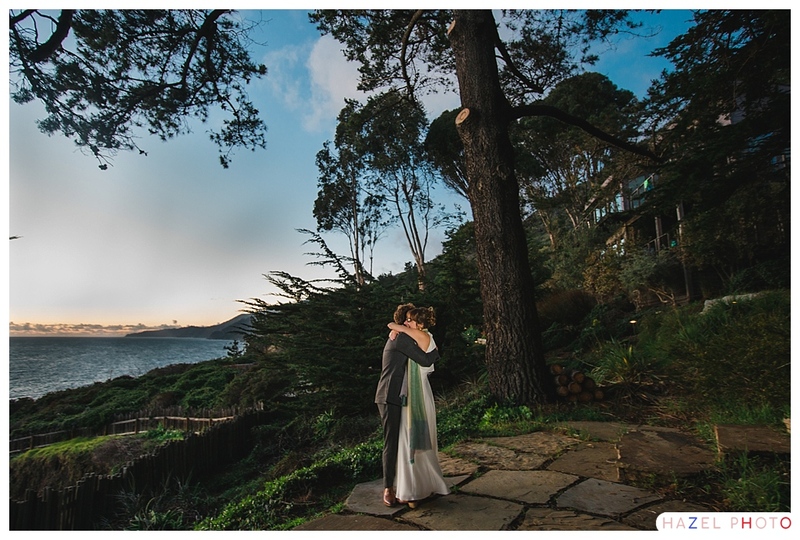 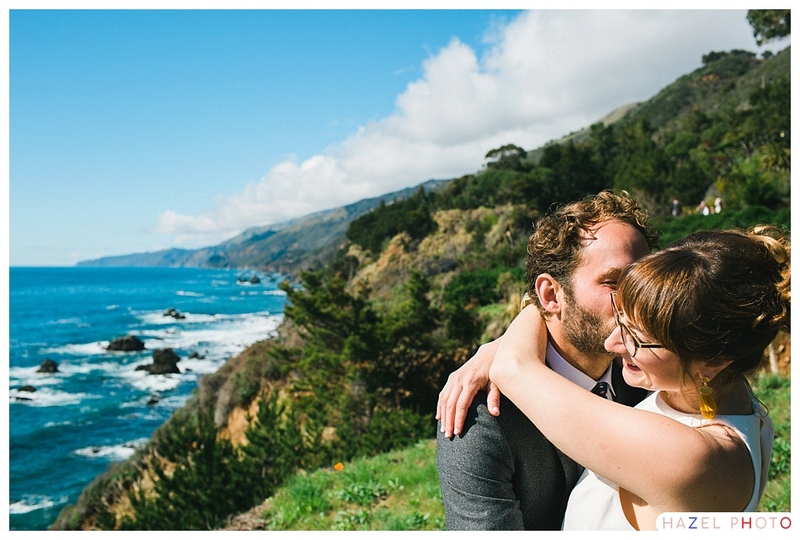 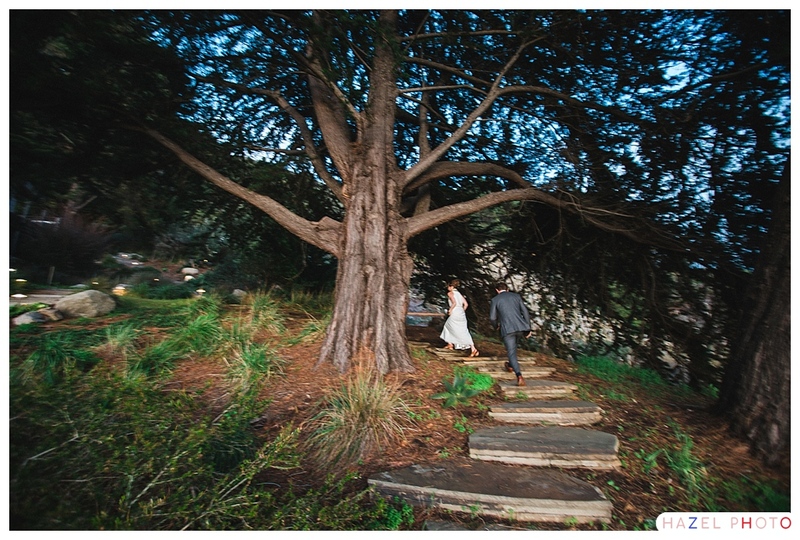 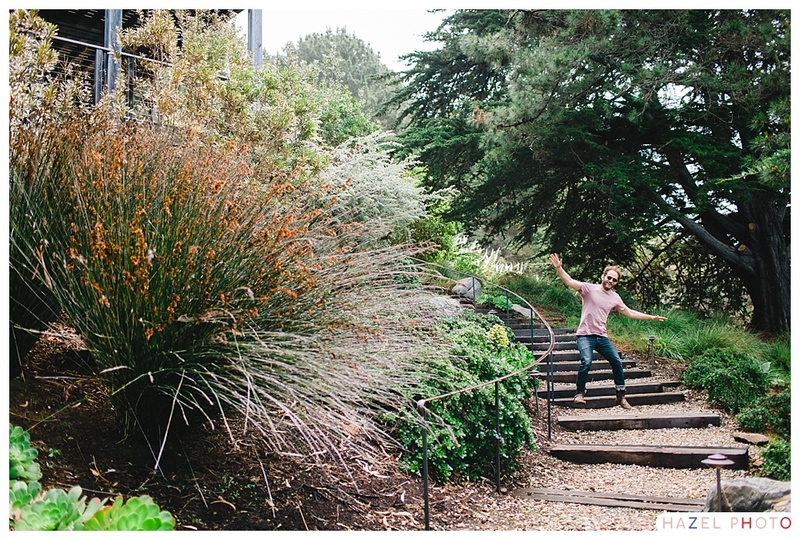 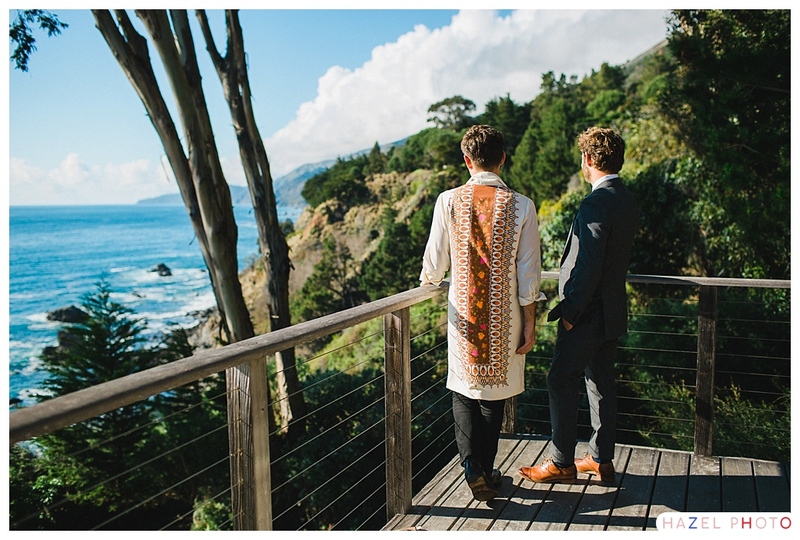 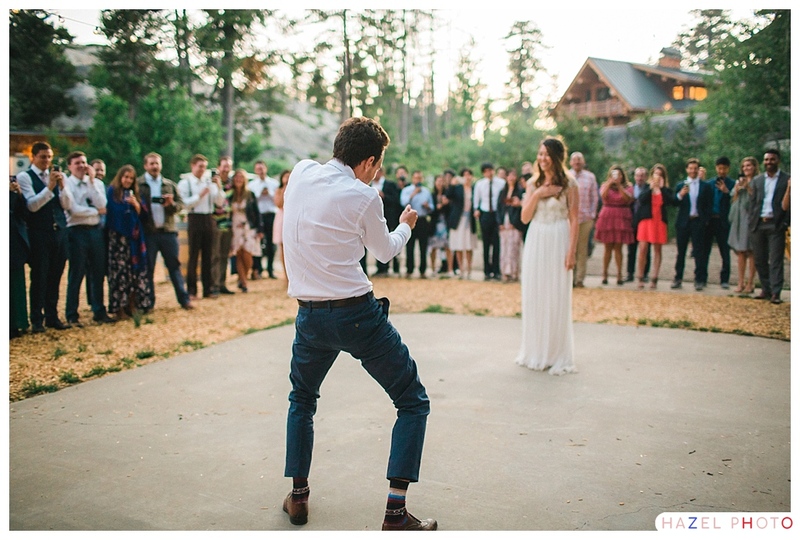 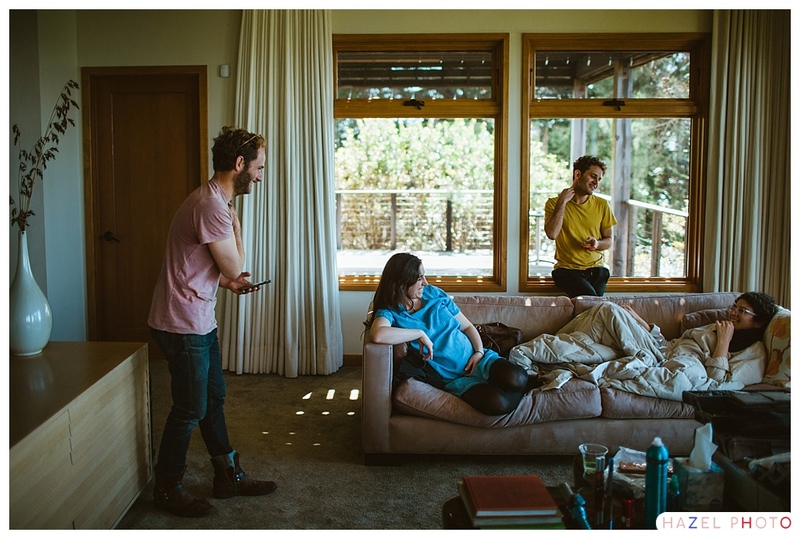 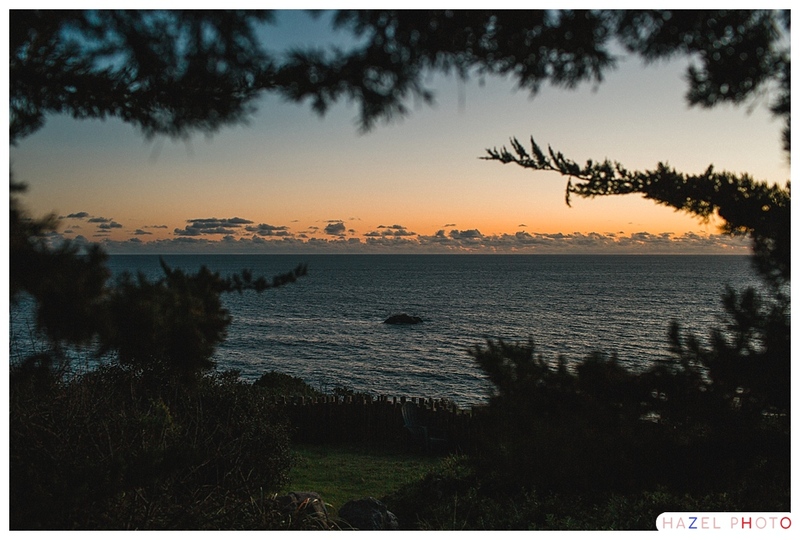 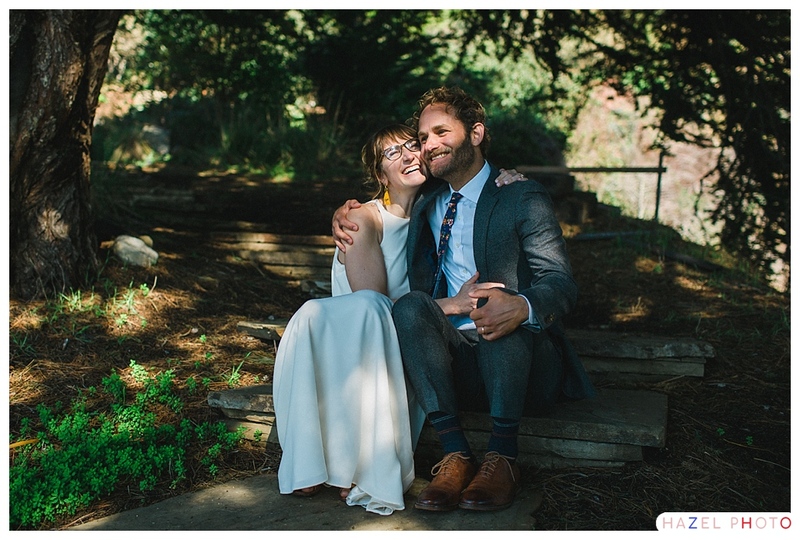 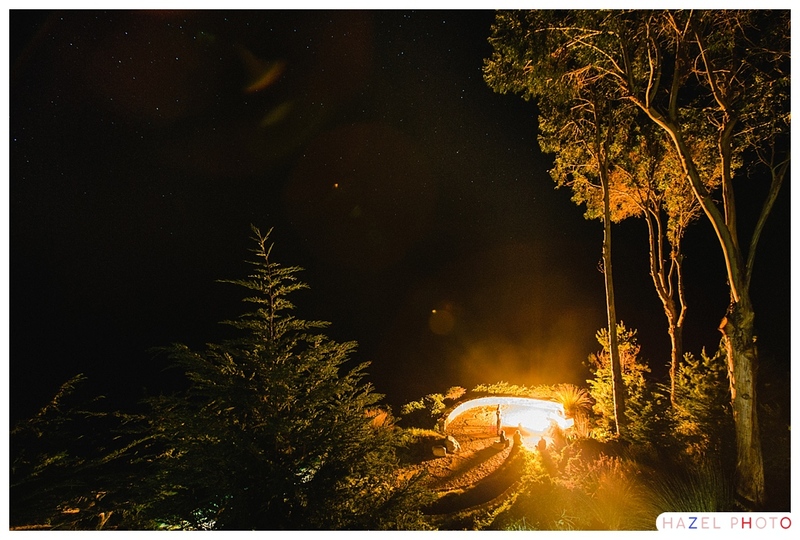 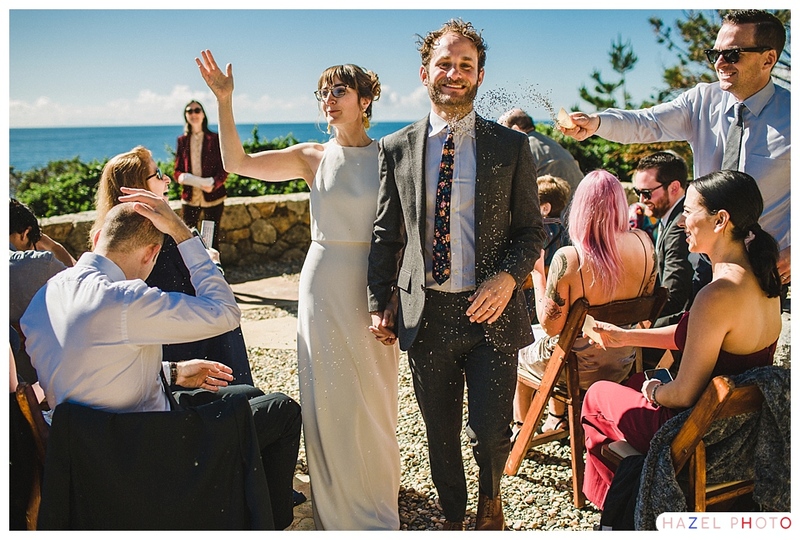 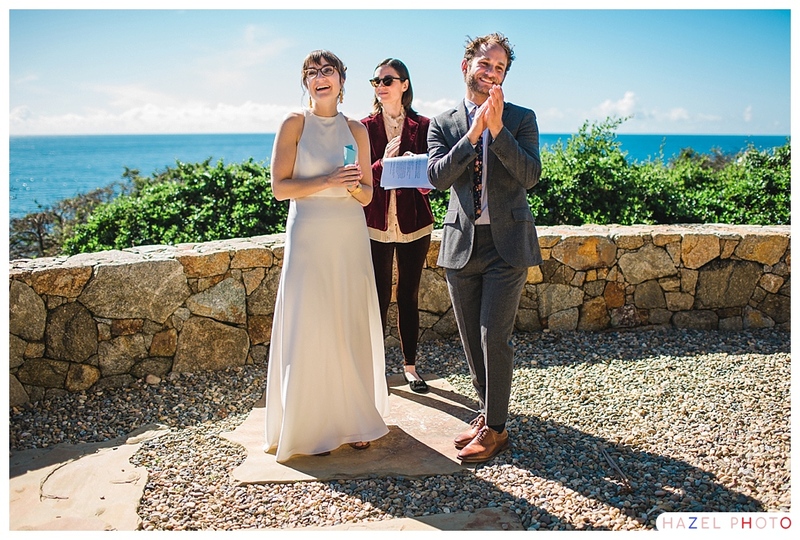 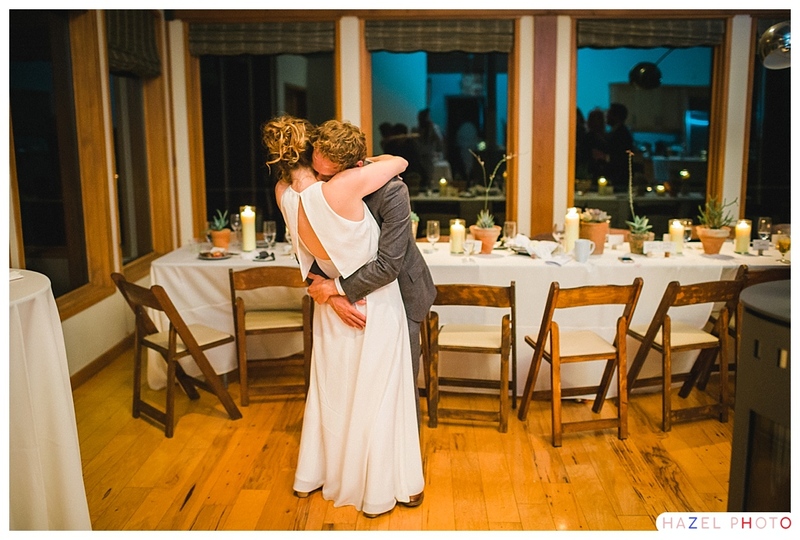 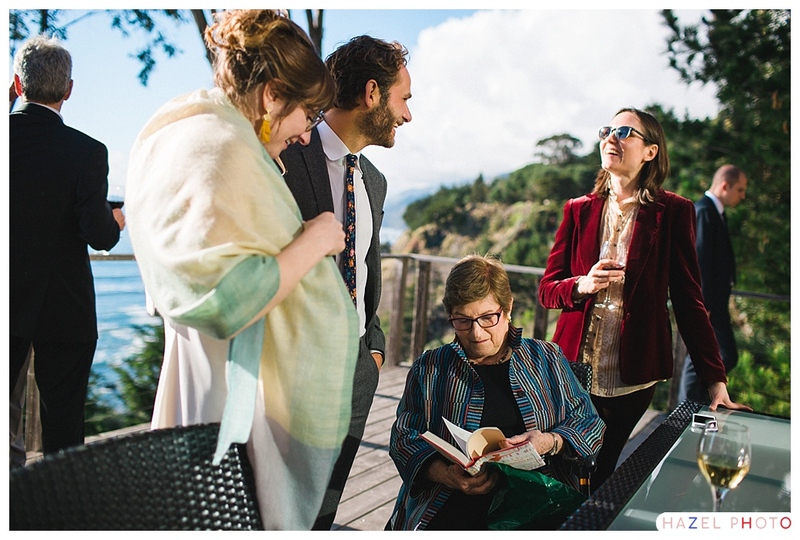 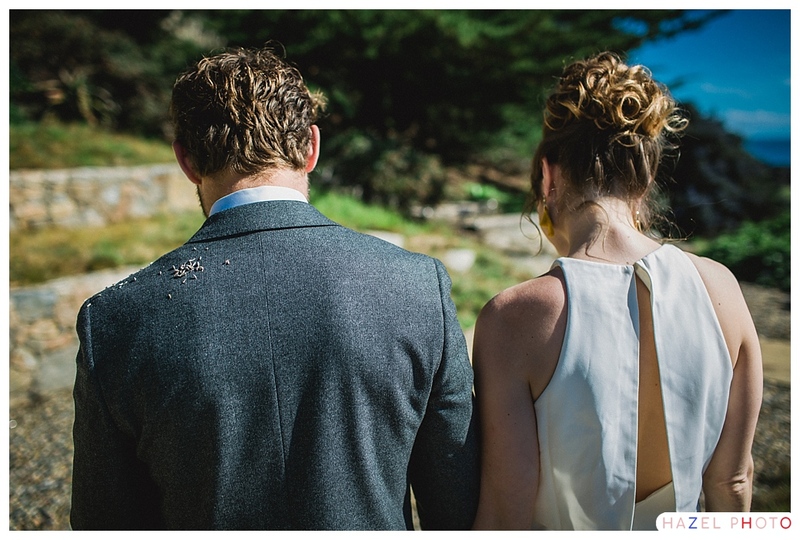 Honestly, Big Sur is kind of a wedding photographer’s dream. 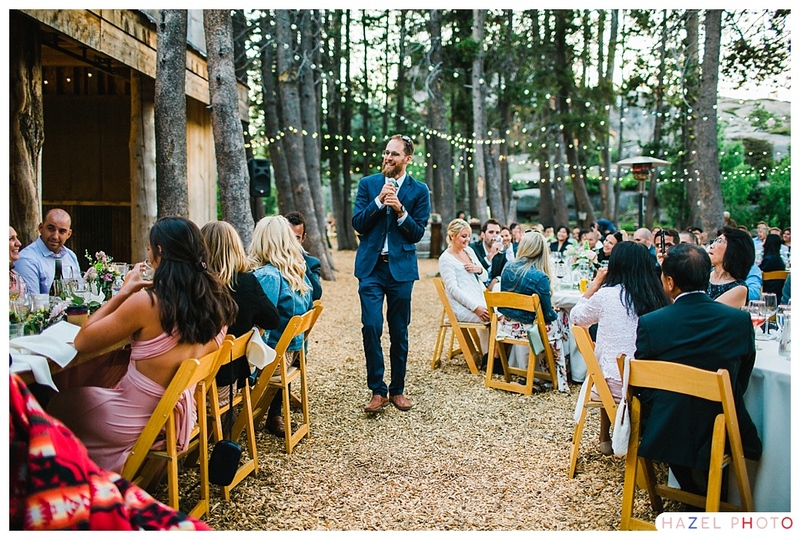 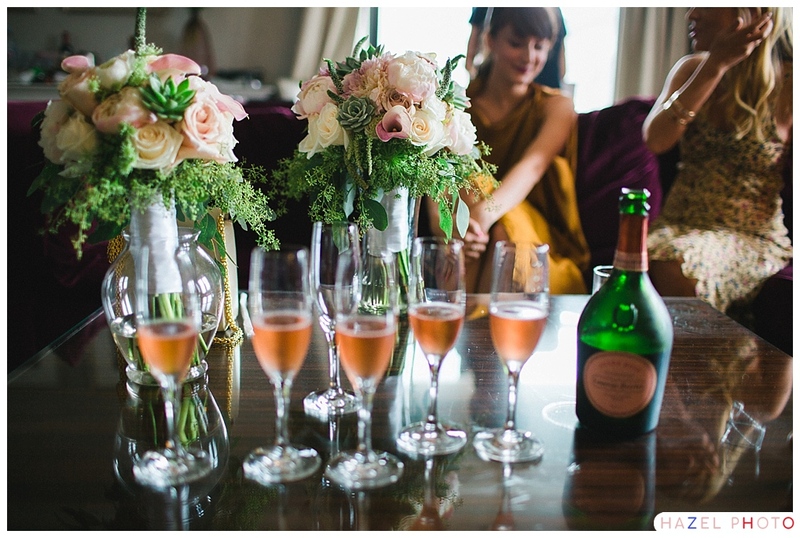 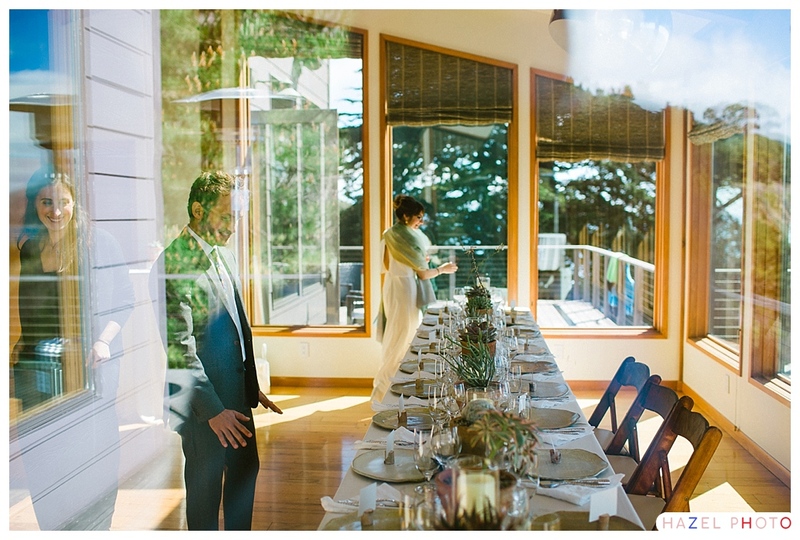 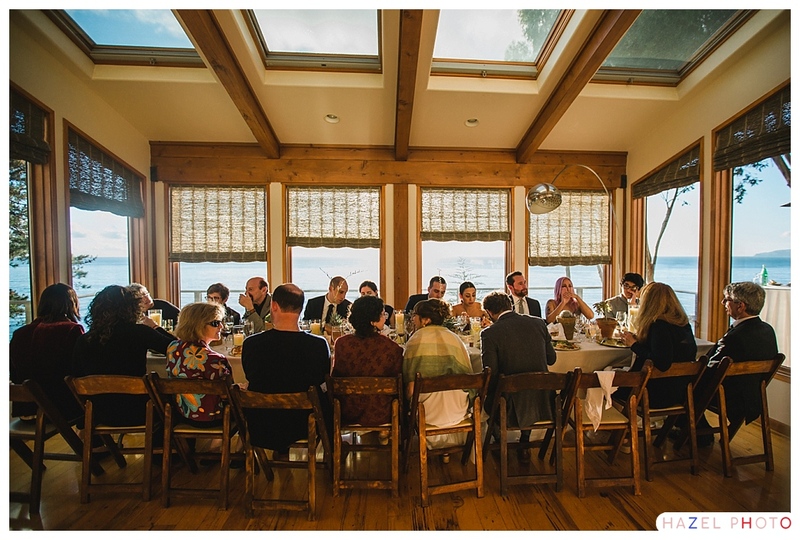 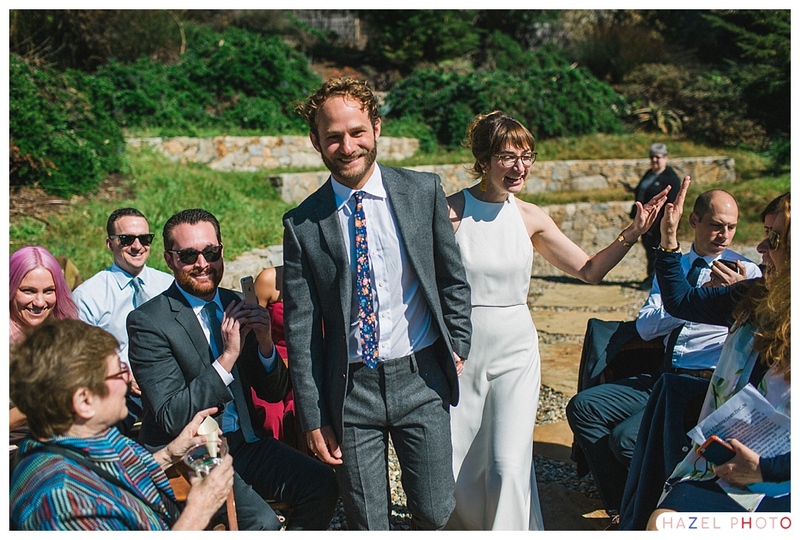 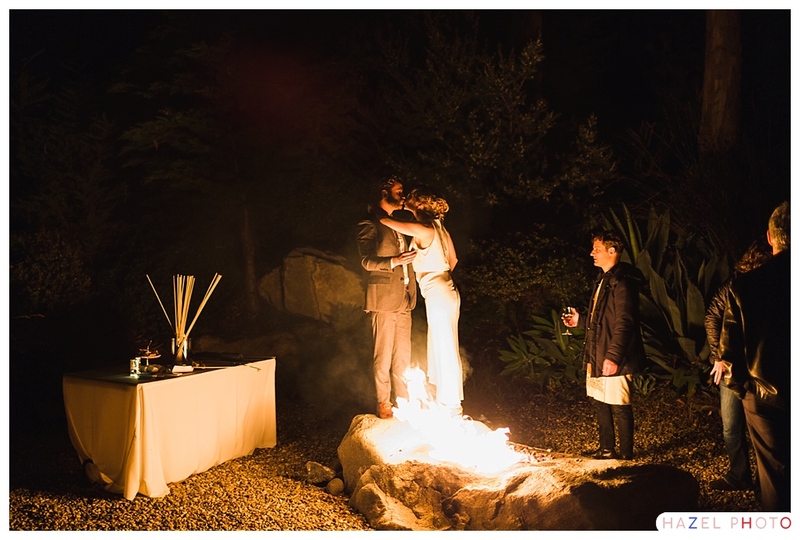 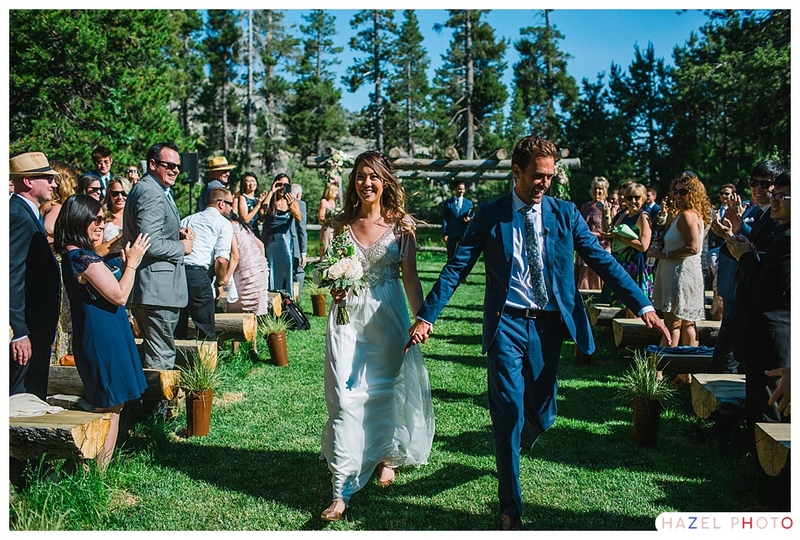 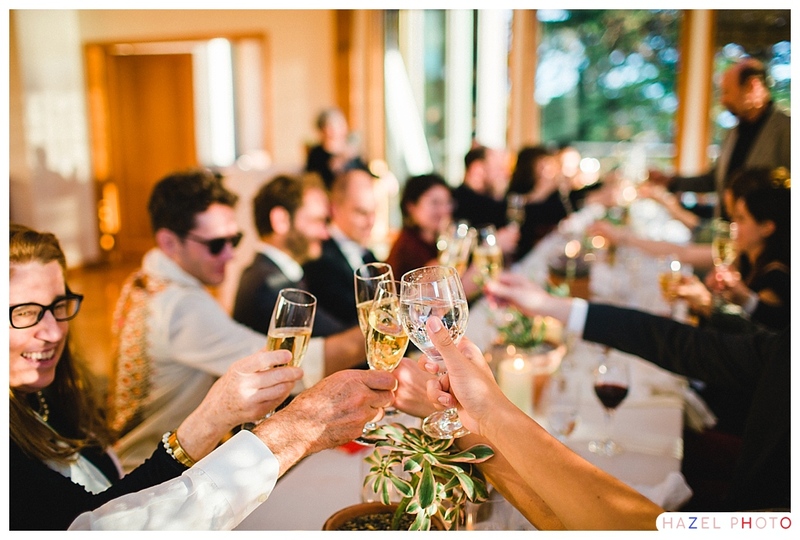 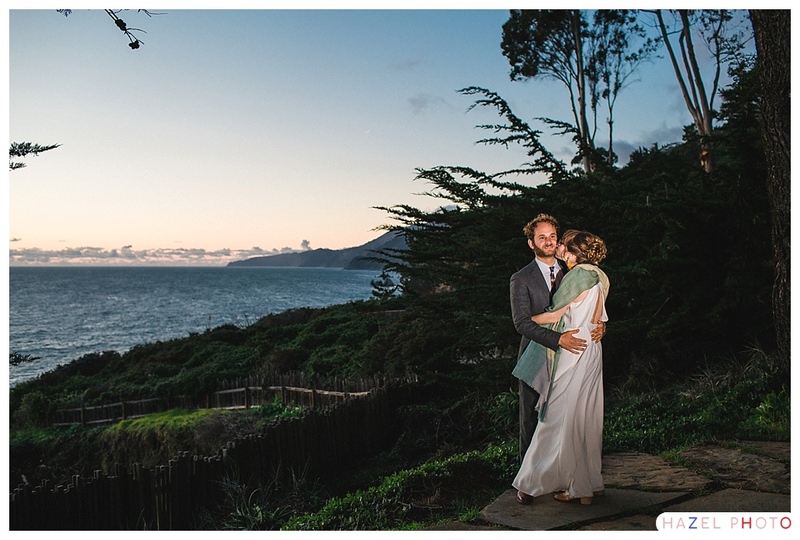 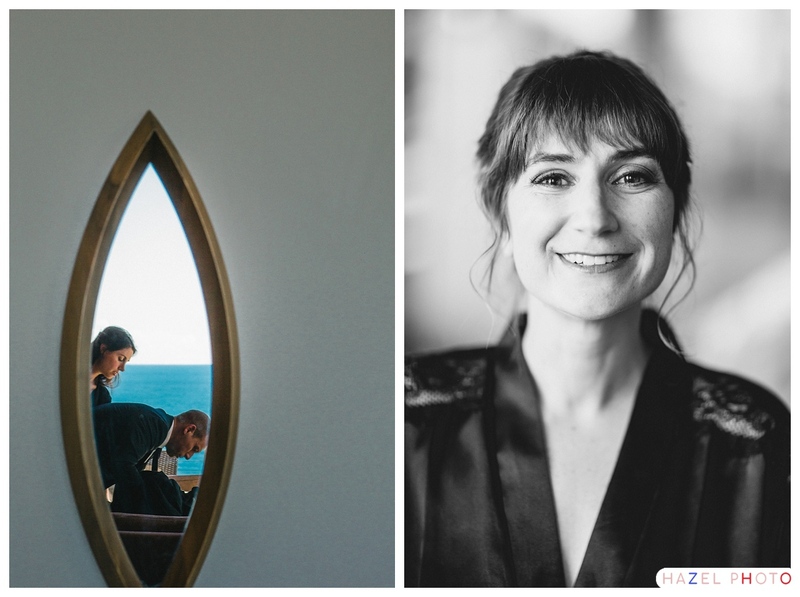 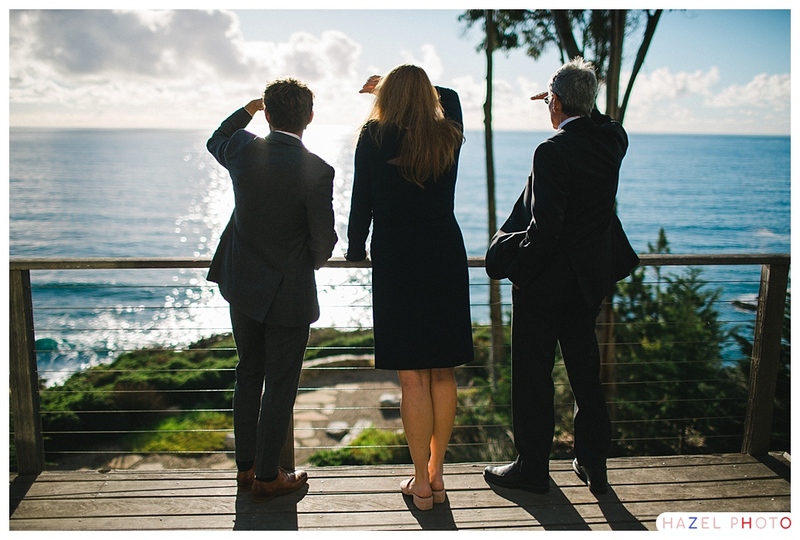 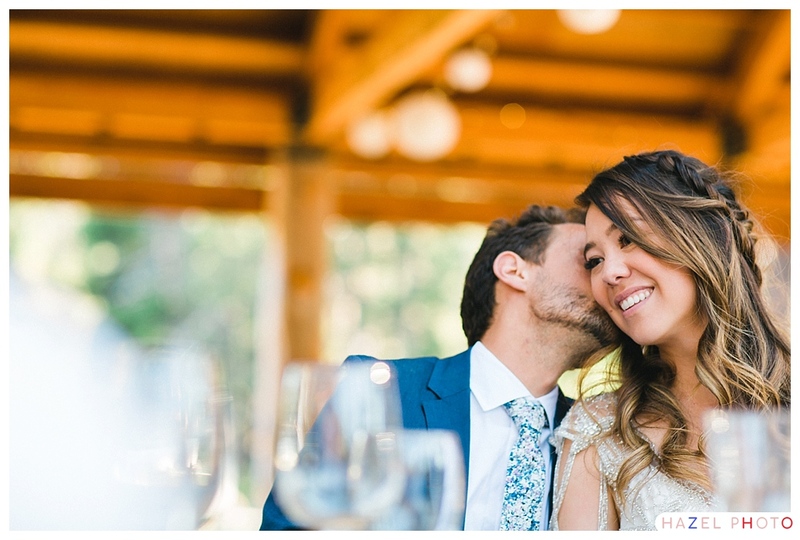 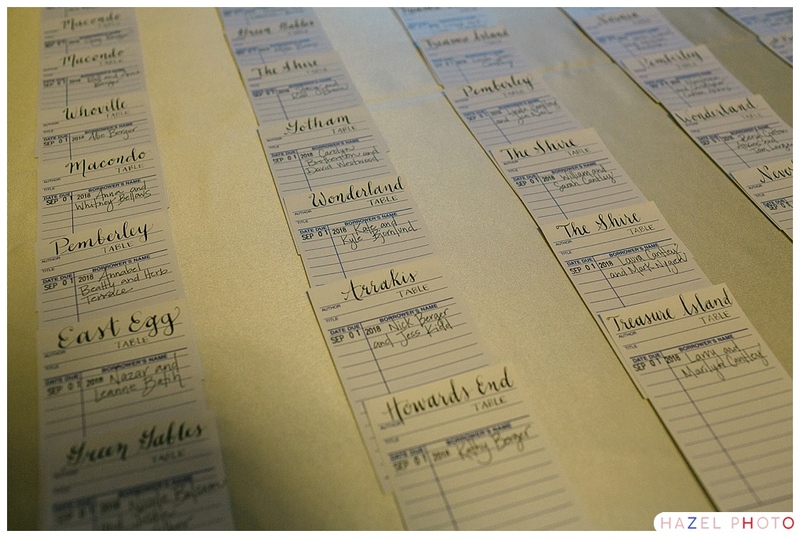 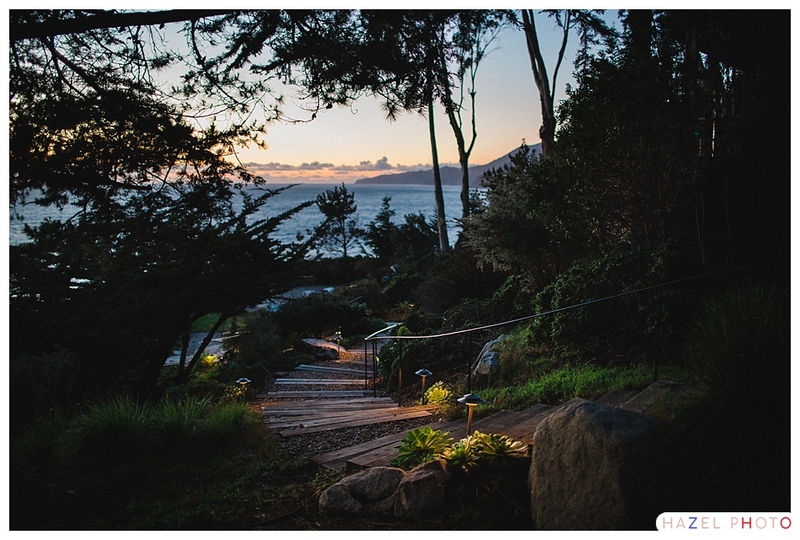 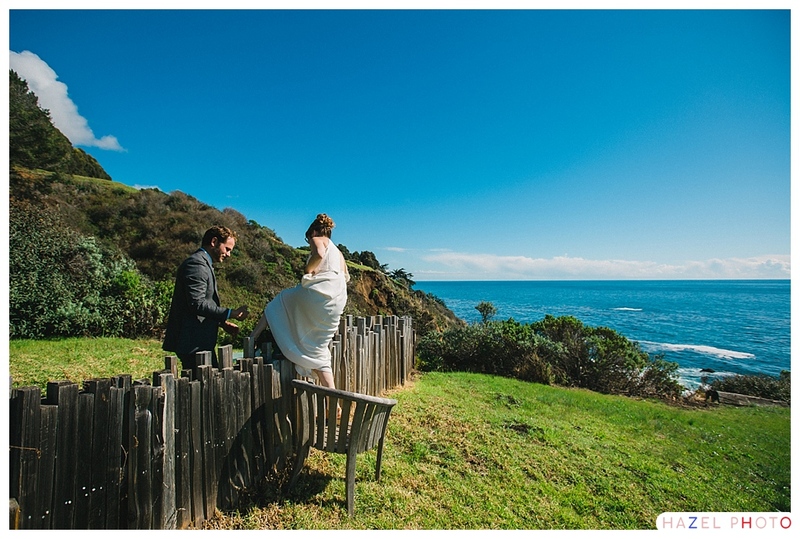 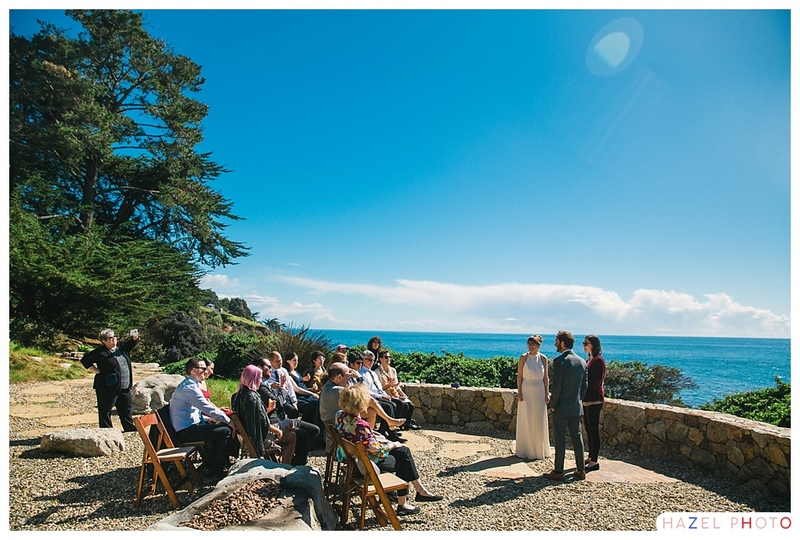 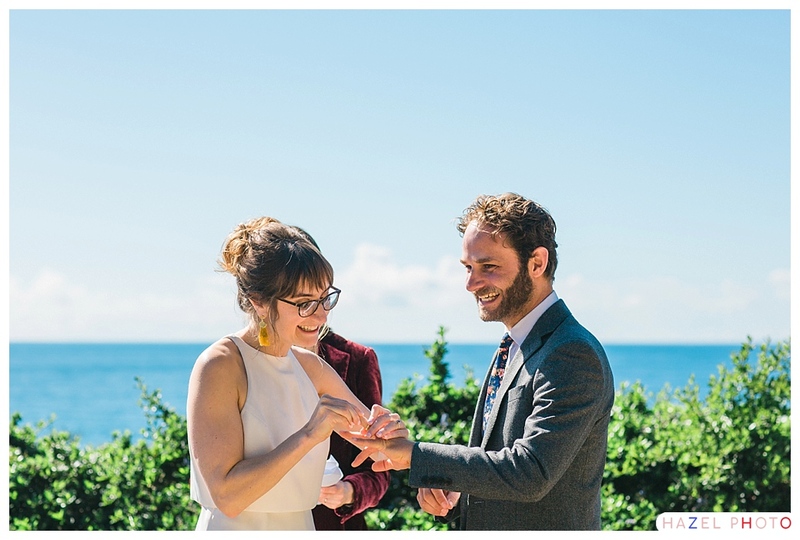 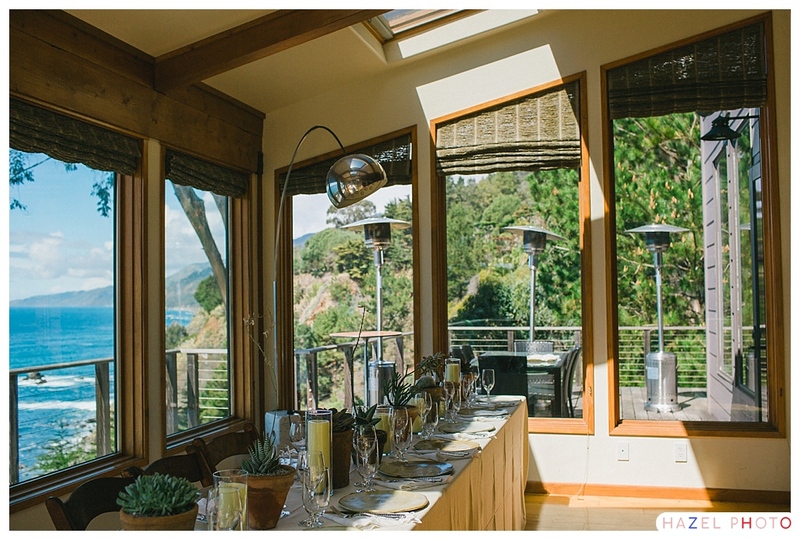 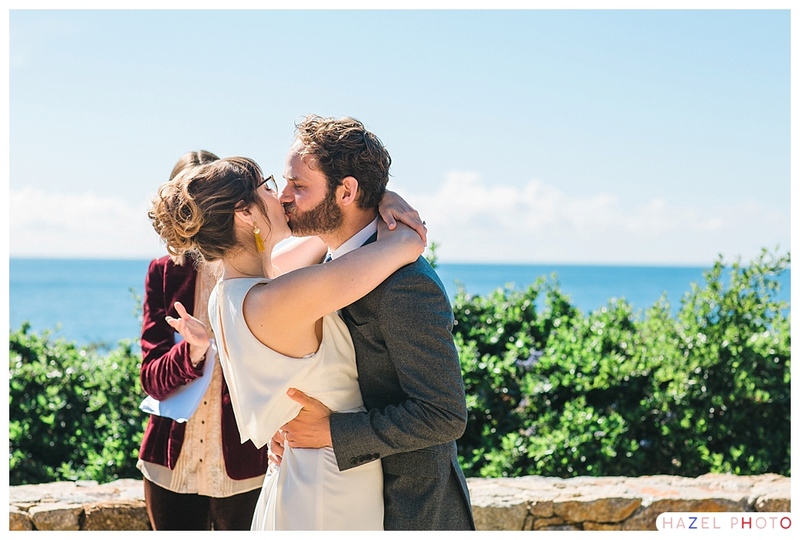 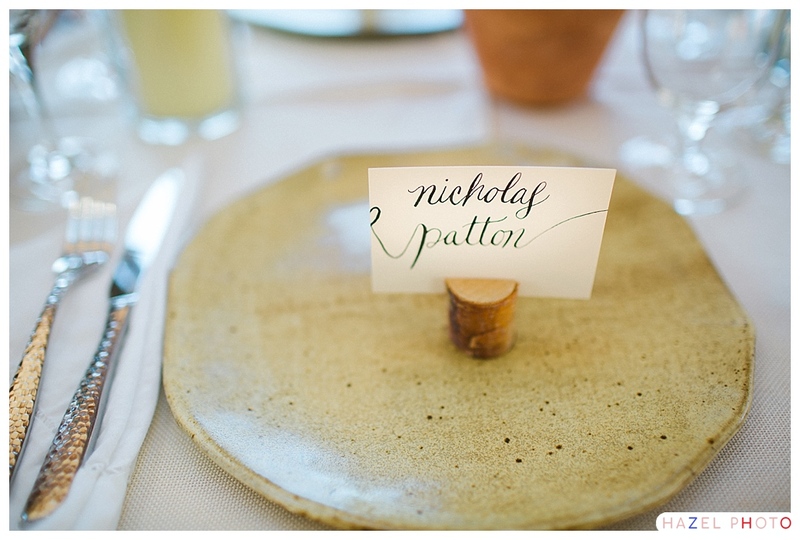 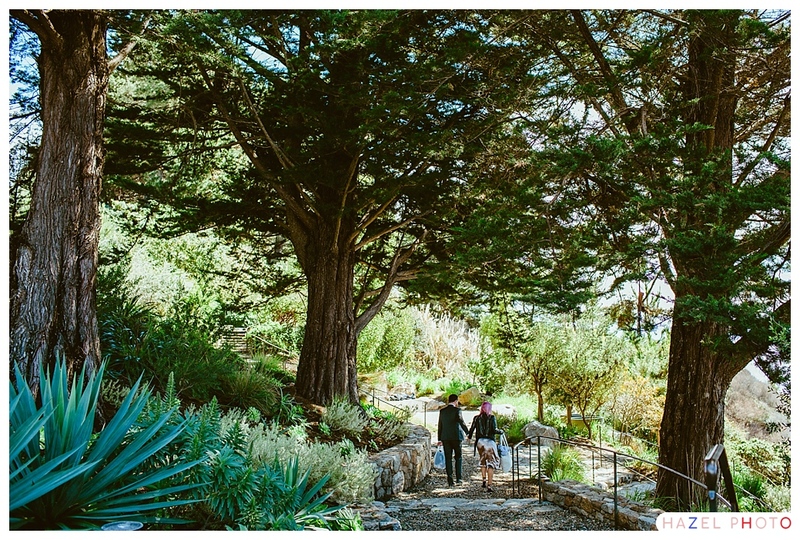 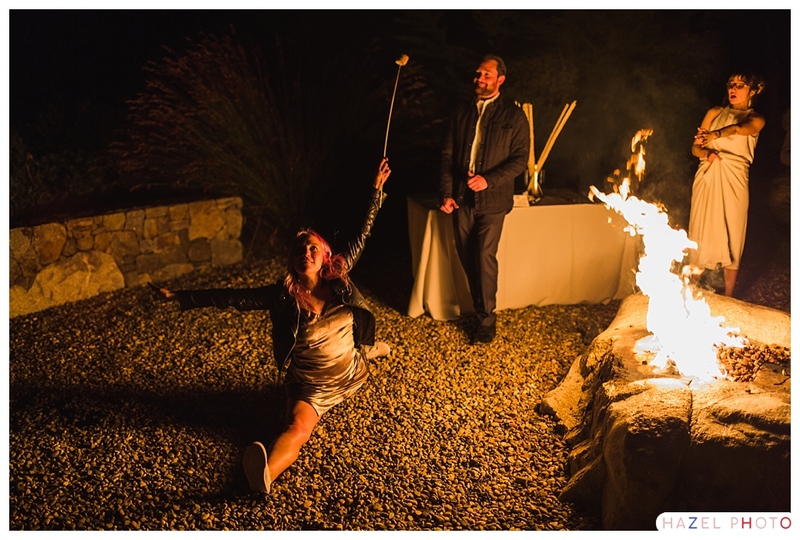 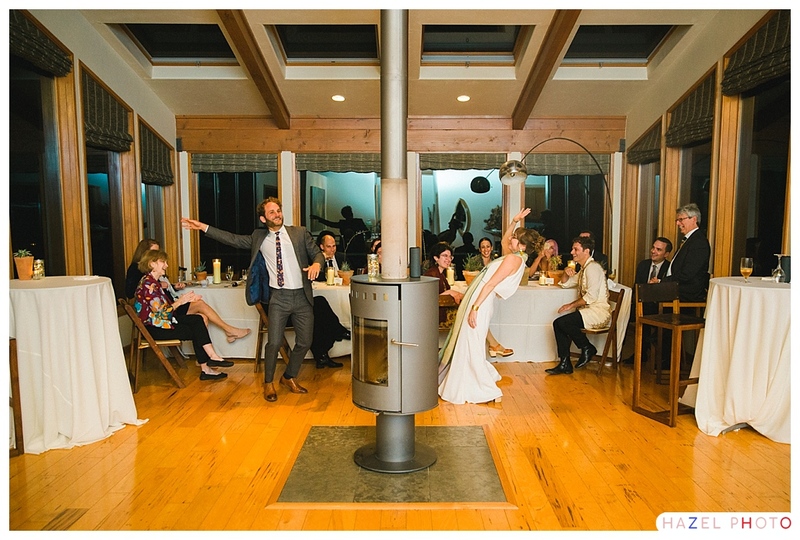 Jess and Nick had an intimate wedding with just 20 guests at the gorgeous Wind and Sea Estate in Big Sur, California. 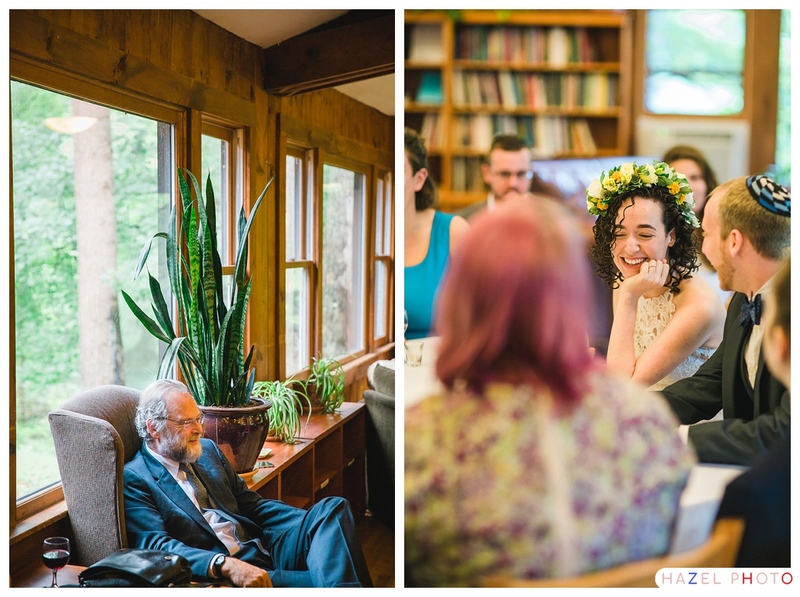 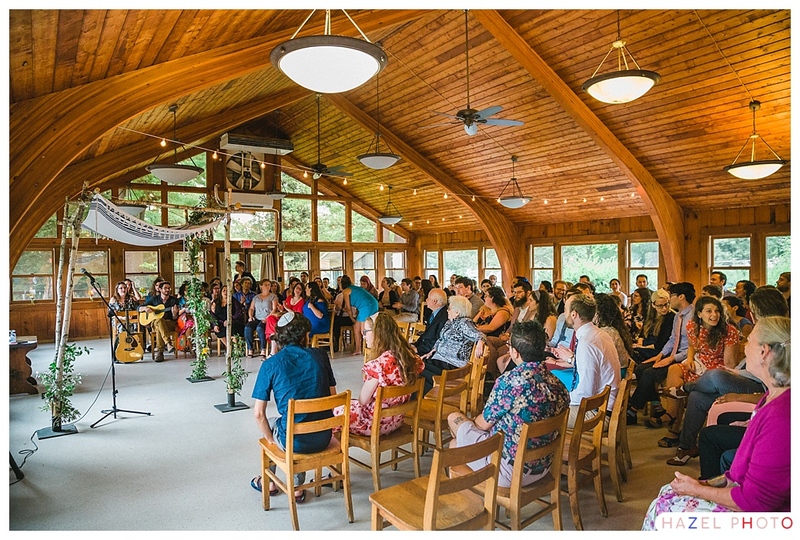 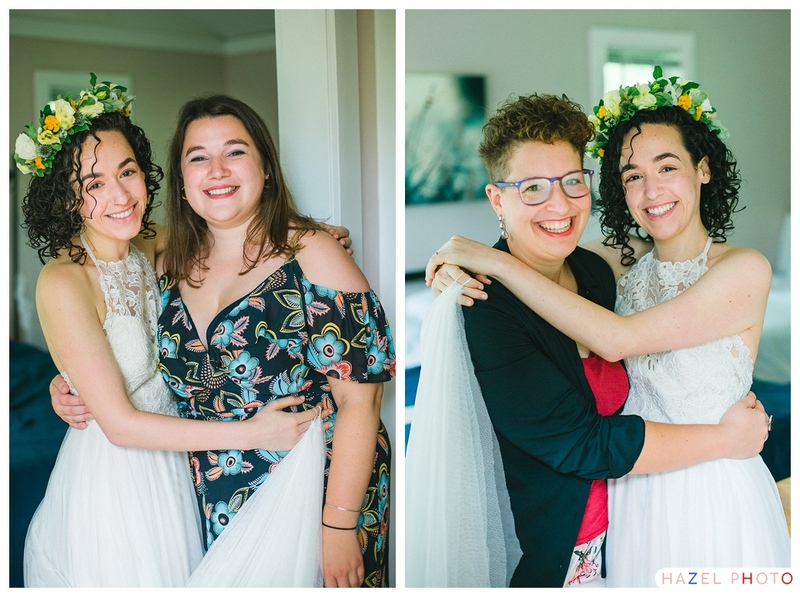 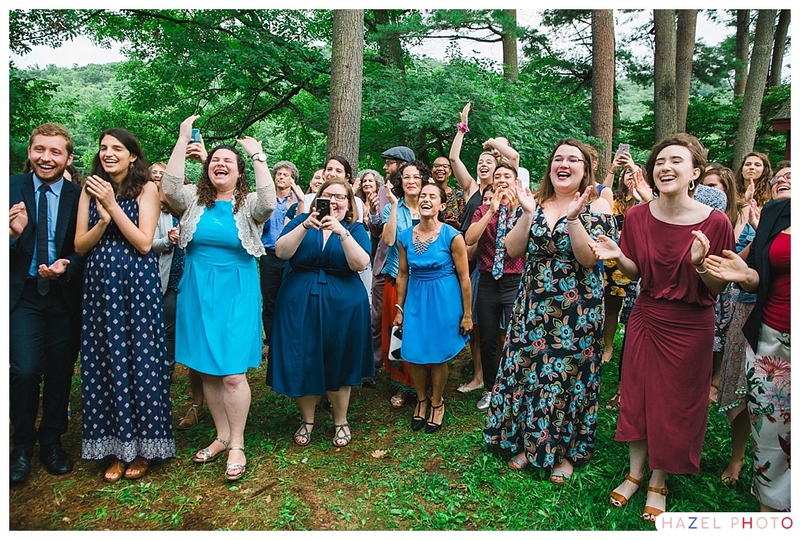 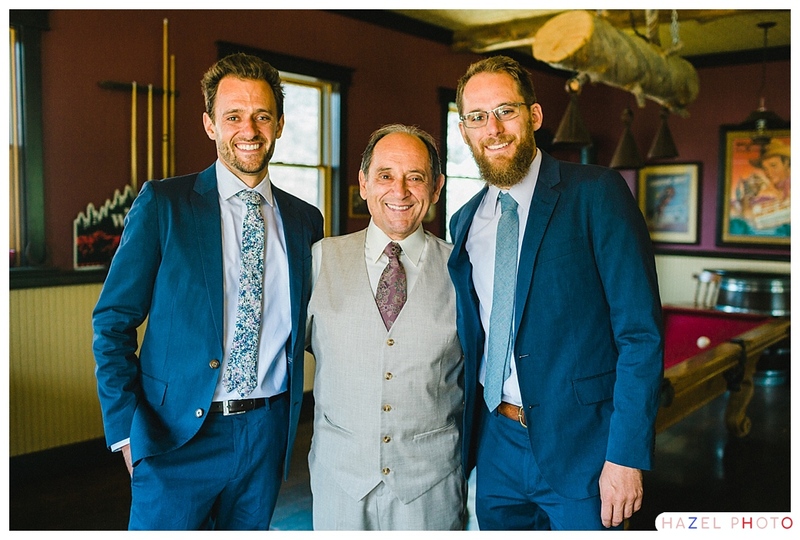 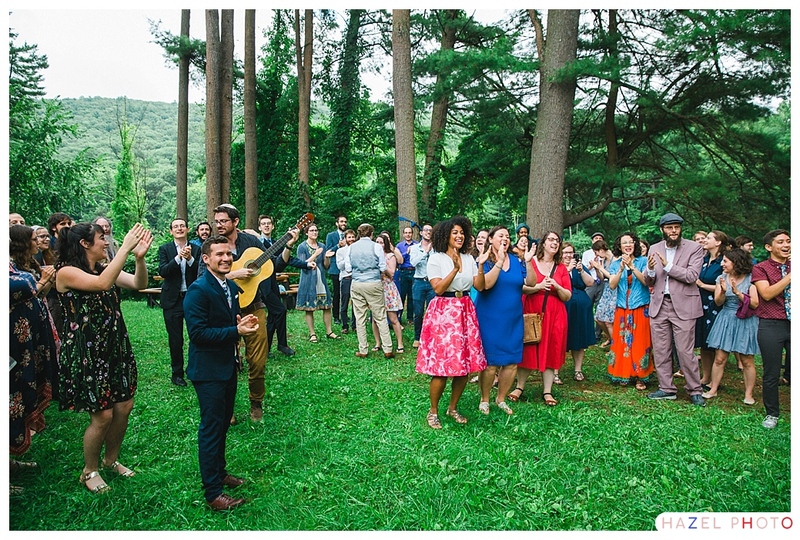 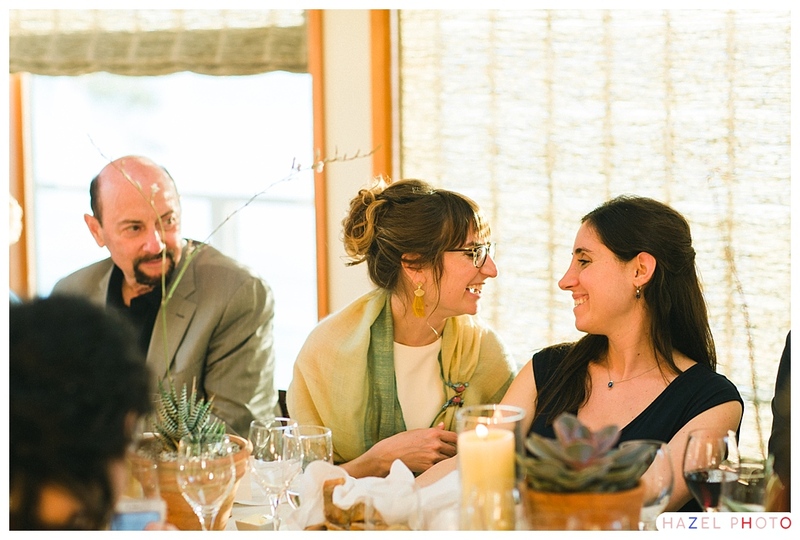 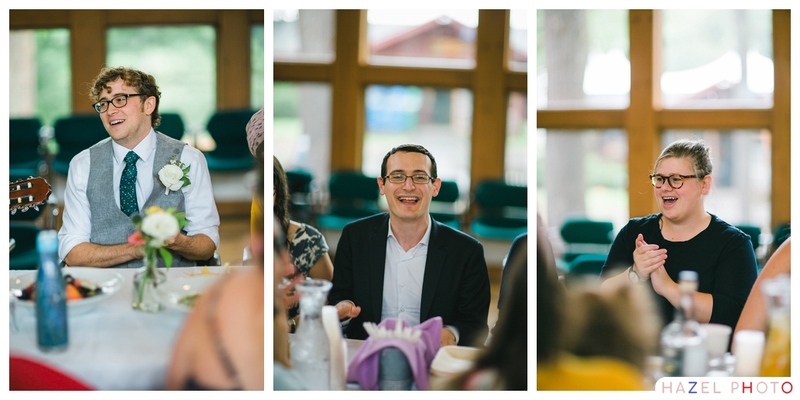 I definitely got to know the guests a bit better than I do when photographing a wedding with over 100 guests, and I am grateful for this, because across the board Jess and Nick’s people were delightful human beings. 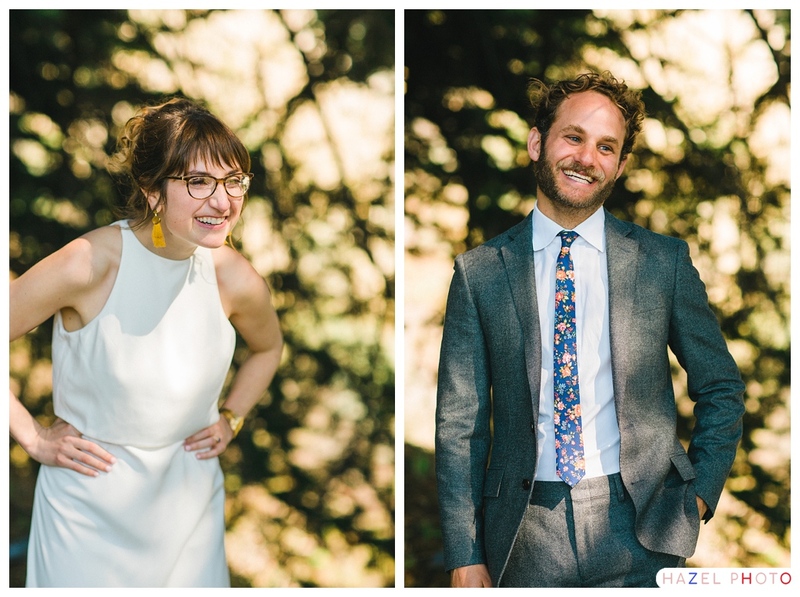 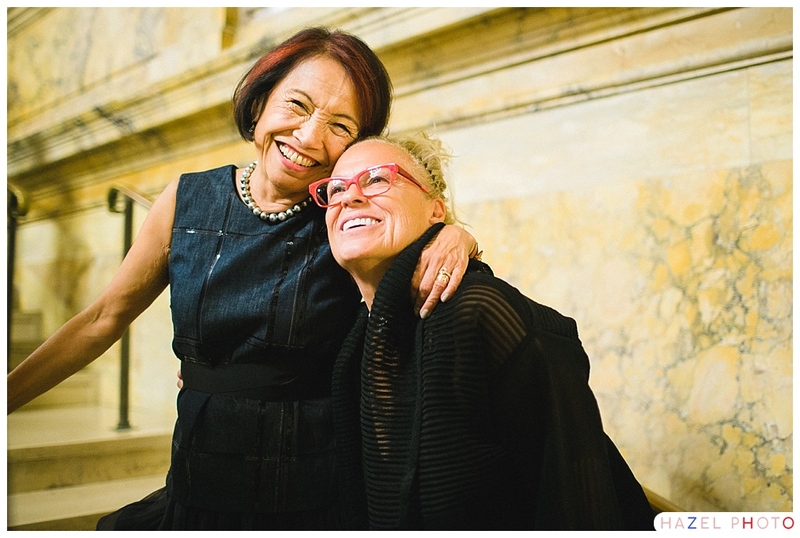 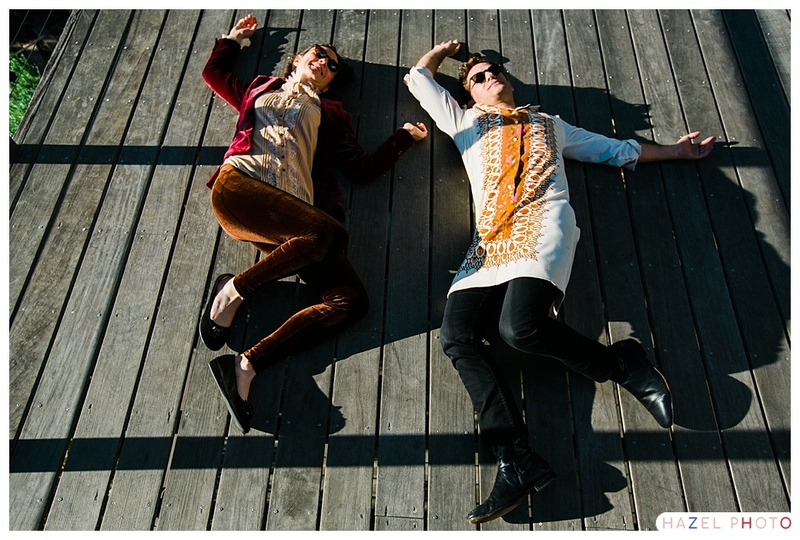 This was unsurprising really, as they are two of the warmest people I have ever had the pleasure of photographing. 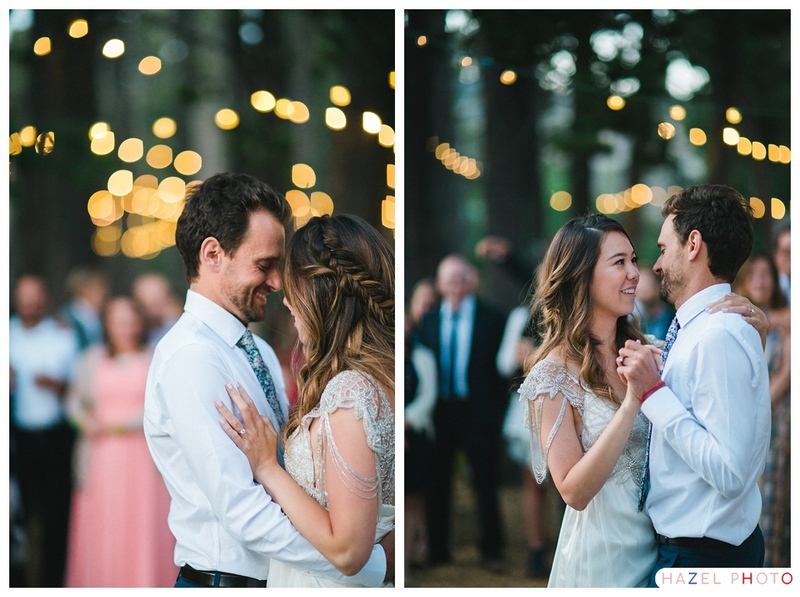 That warmth was on their faces all day long, and a week later when I saw them again, they were still glowing from deep within. 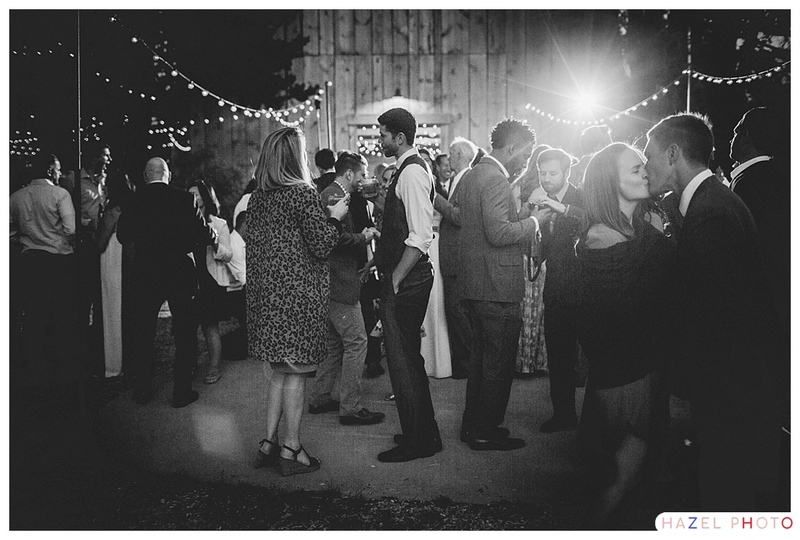 Late into the night, after Jess & Nick had, surfed, and showered, and donned spiffy spiffy togs, and processed through verdant hills, and spoke their vows, and kissed at a seaside altar (not once, but whenever the spirit moved them, like champs, like people who know exactly what they want) and after they read Shel Silverstein’s The Missing Piece to their guests, after they were showered again, this time with lavender confetti, and after they dined, and danced, and were showered again, but this time with the words of their eloquent friends and family, they had a bonfire, and listened to the sea, and it grew dark.